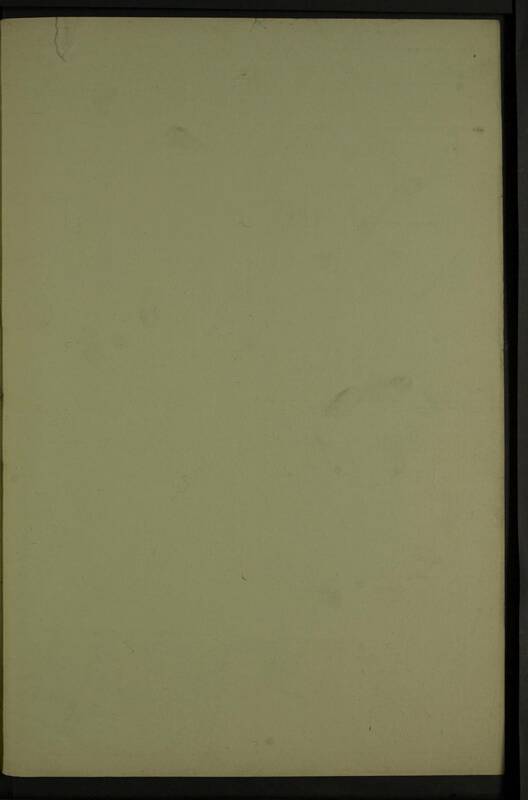 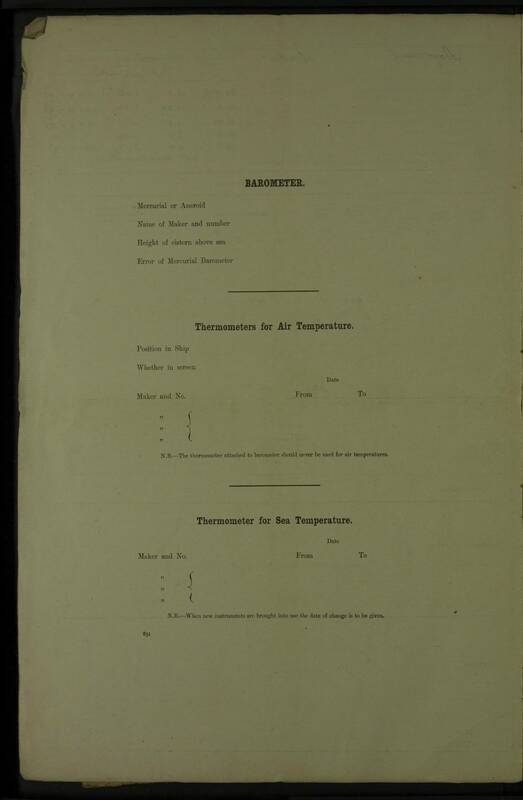 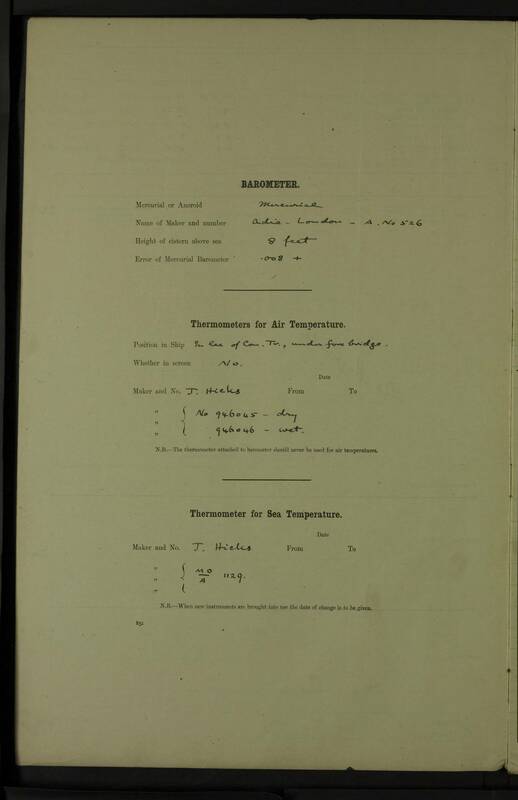 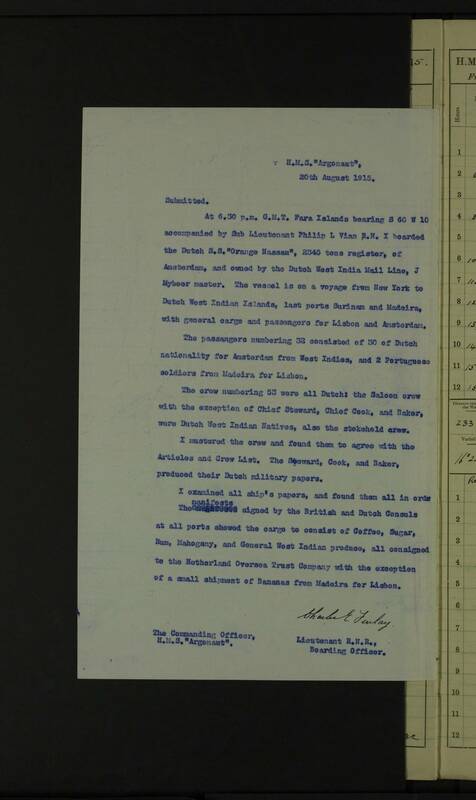 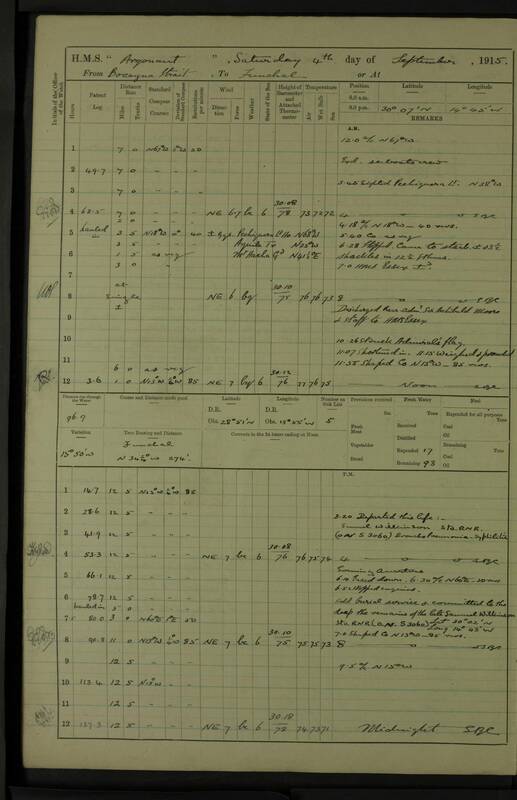 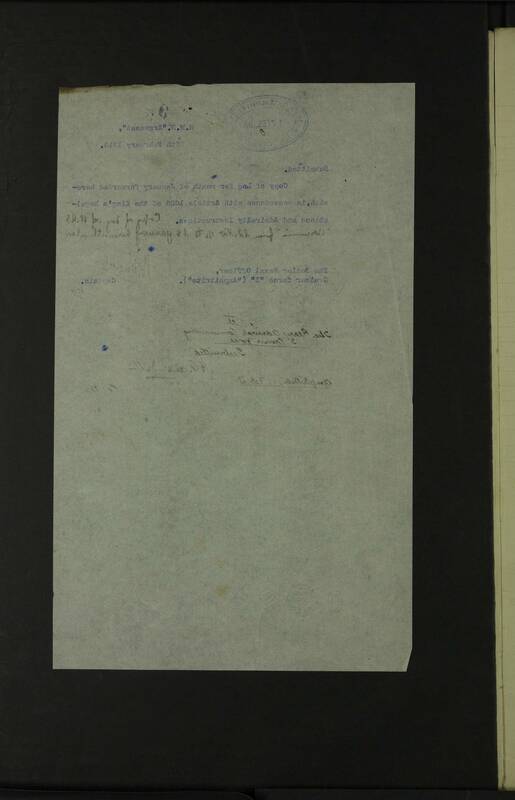 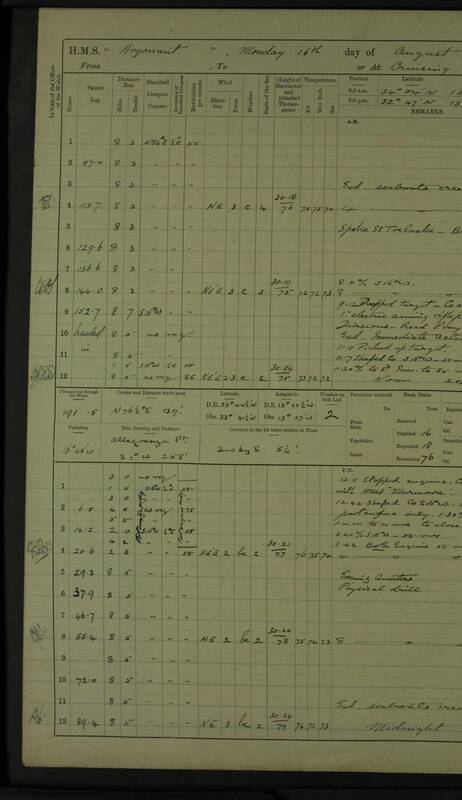 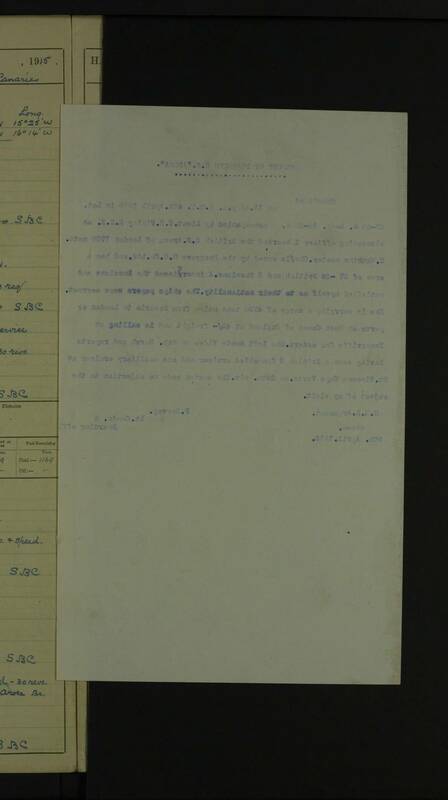 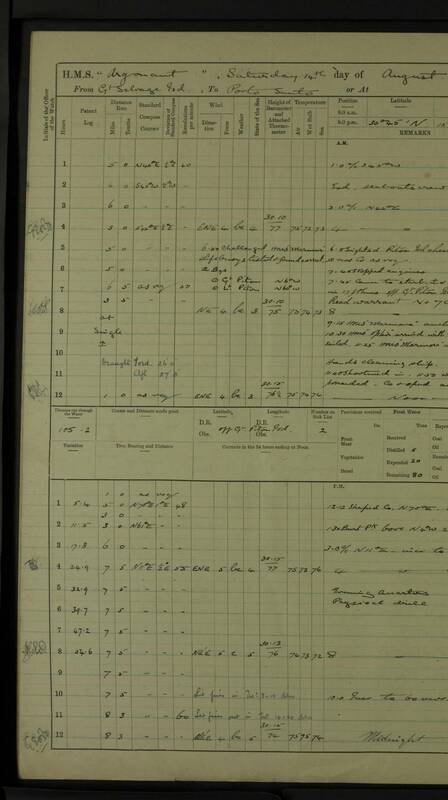 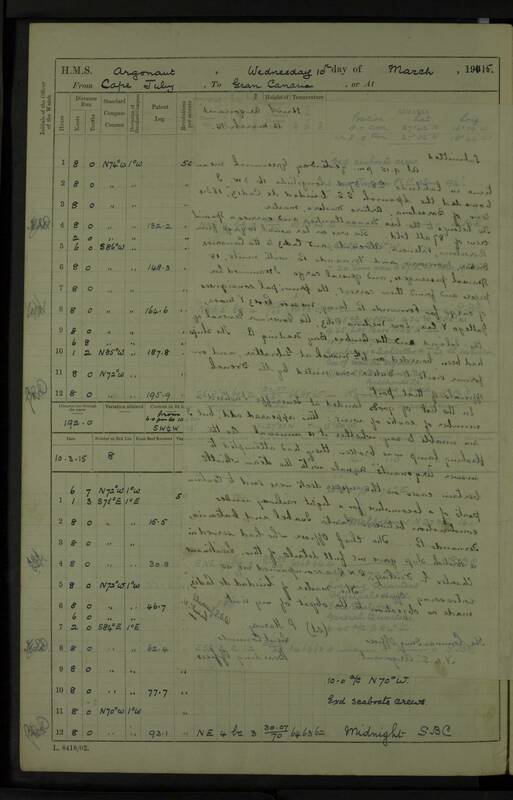 A number of additional pages are included in the logs as letters describing the boarding of various ships. 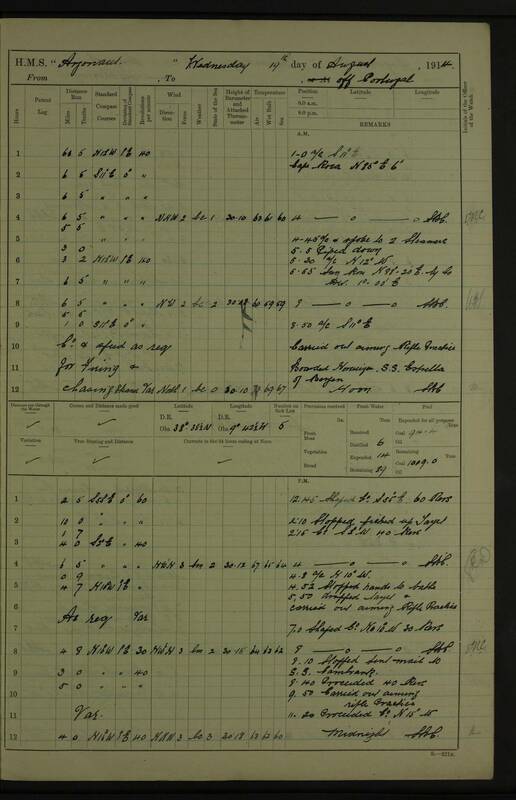 These have been transcribed. 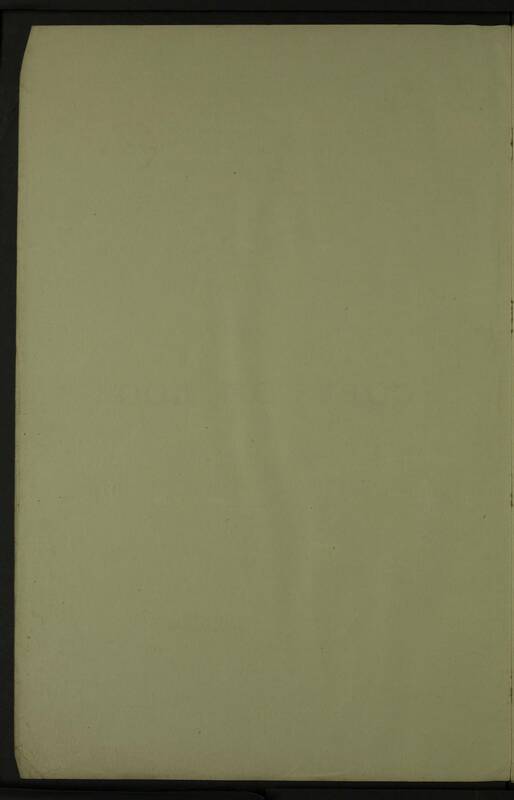 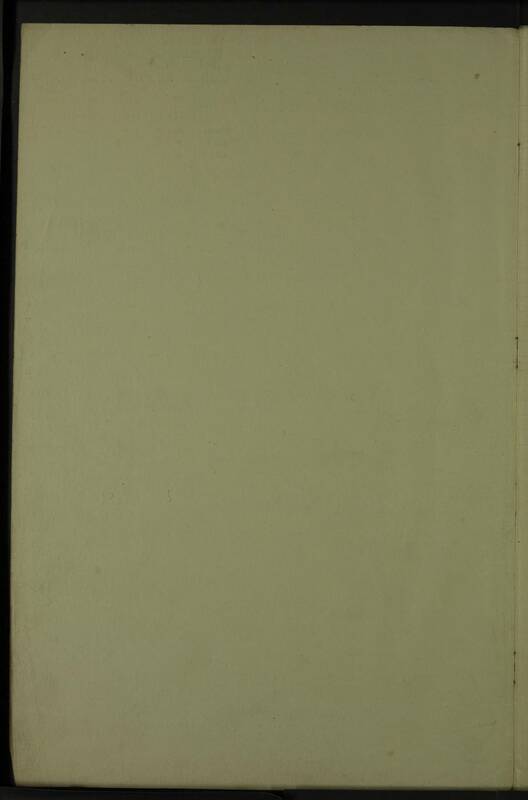 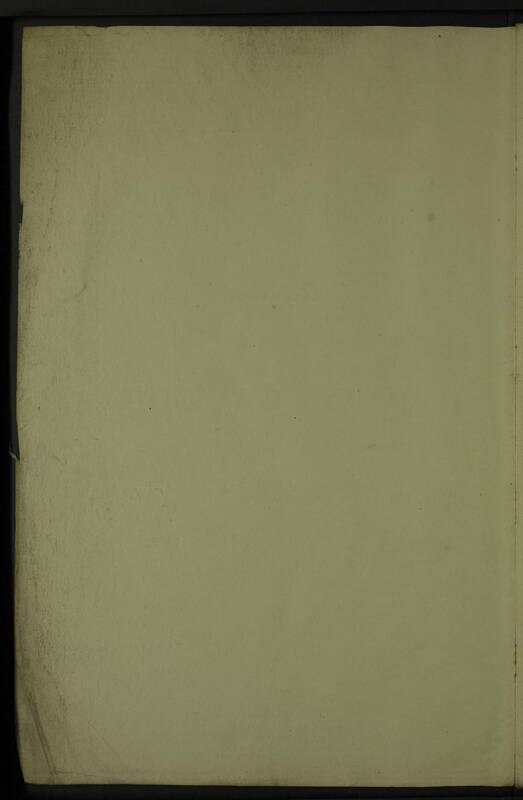 These and other pages also refer to the early career of a young Philip Vian of World War 2 fame. 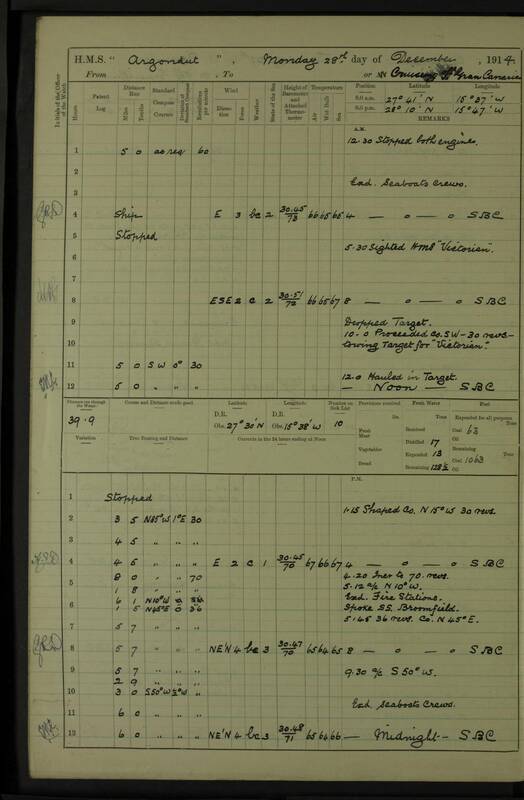 Sub Lieutenant Philip Vian went on to become 'one of the most daring British naval commanders of World War II'. 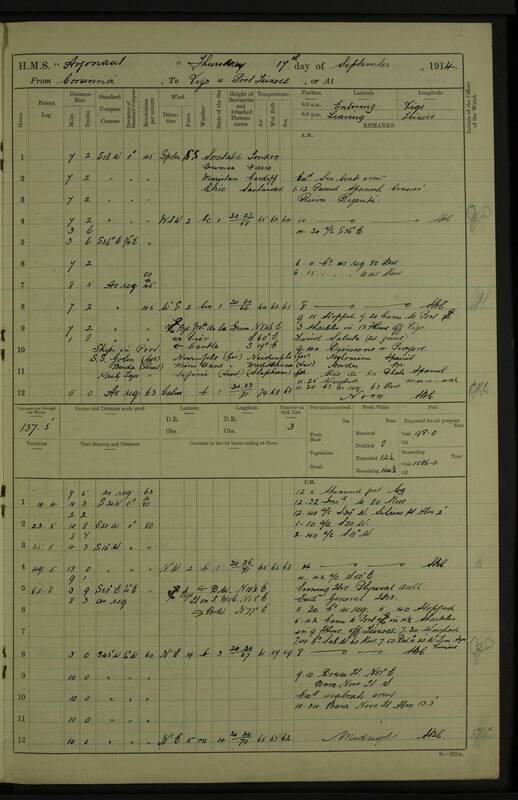 He was captain of the destroyer Cossack during the Altmark Incident and his destroyer flotilla took part in the hunt for the Bismarck. 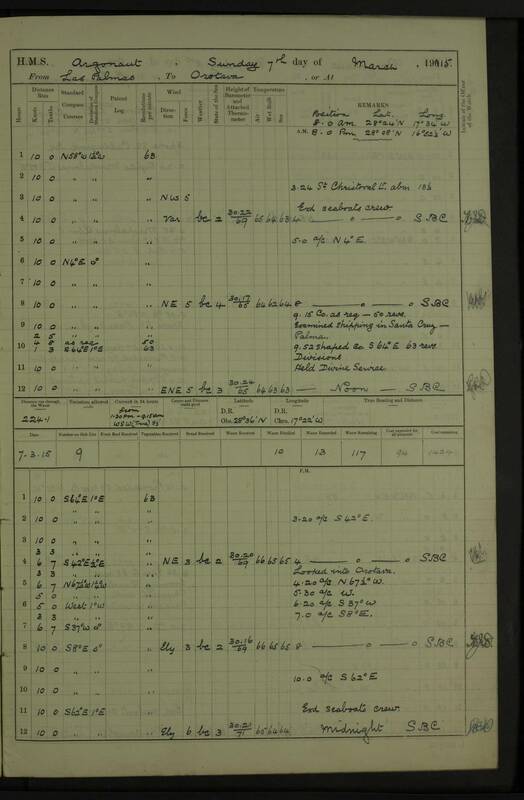 He was commander of the Eastern Task Force on D-Day. After a long and illustrious career, he retired from the Royal Navy in 1952 with the rank of Admiral of the Fleet. 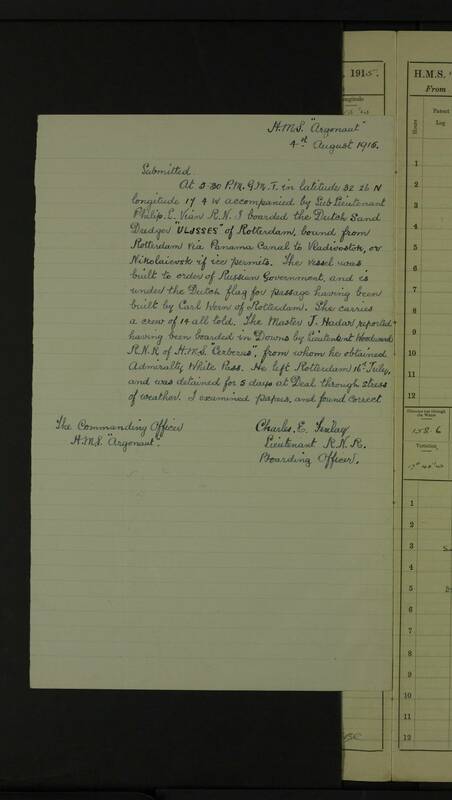 Copy of log for month of January forwarded herewith, in accordance with Article 1026 of the King's Regulations and Admiralty instructions. 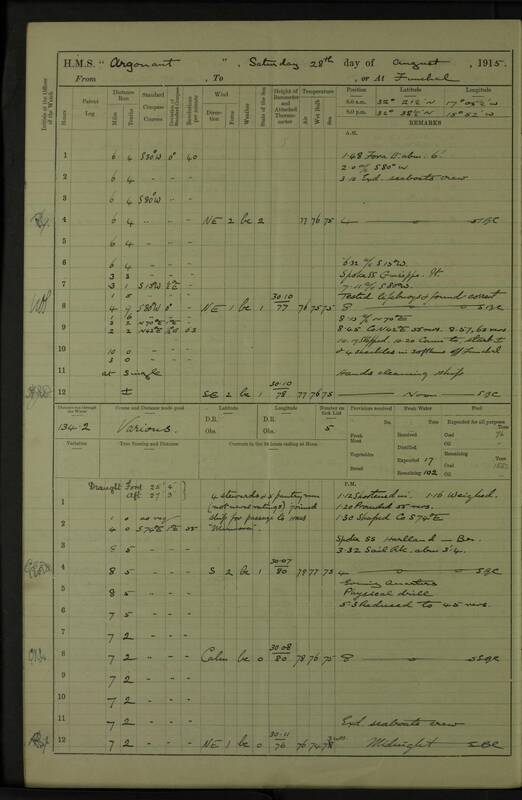 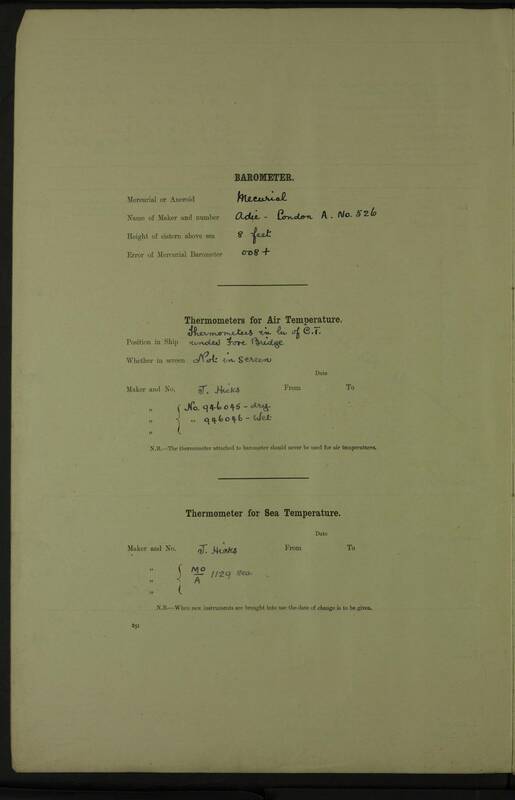 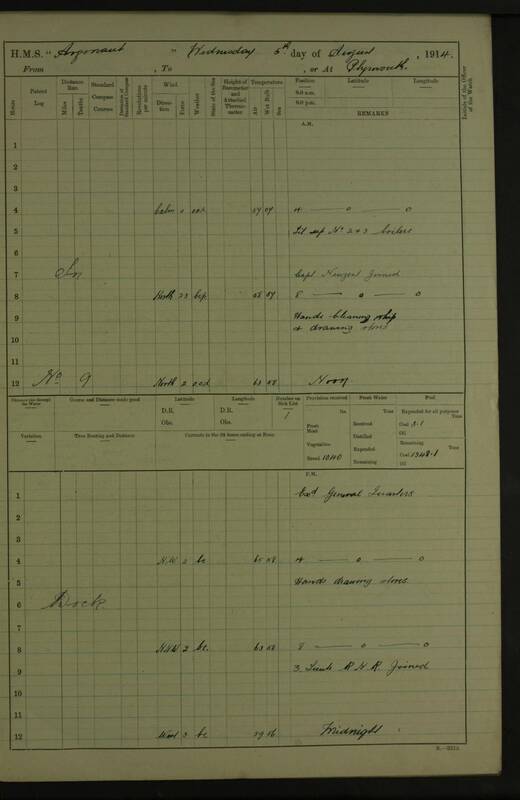 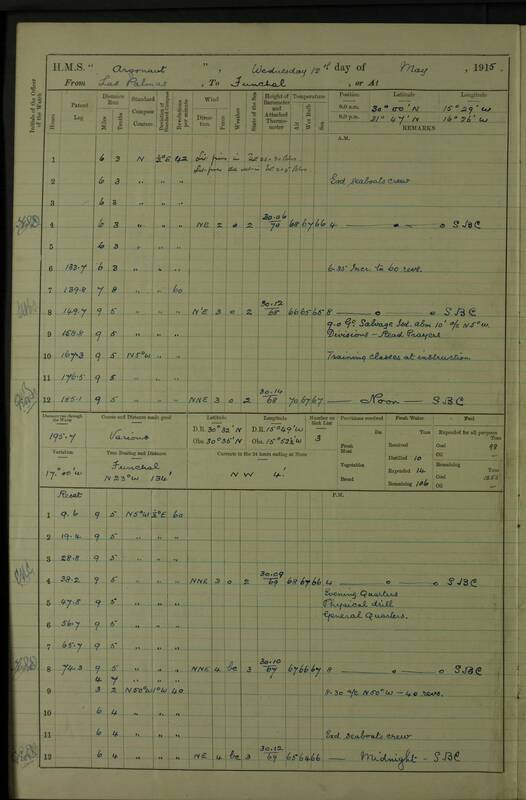 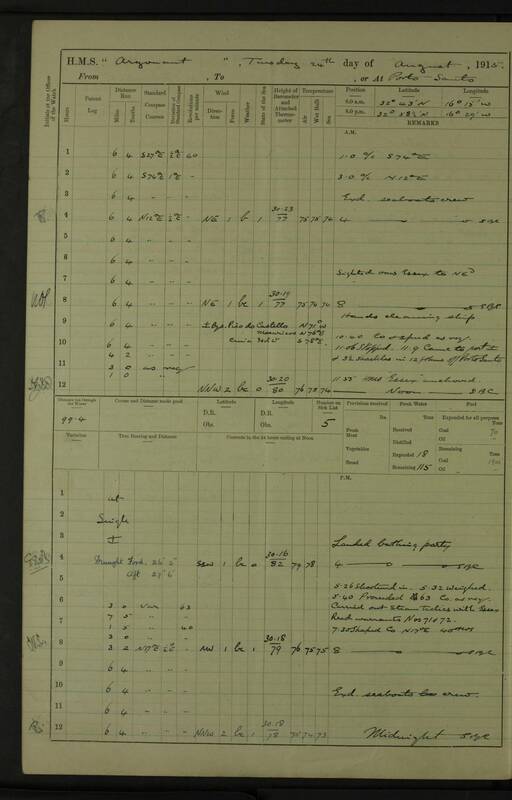 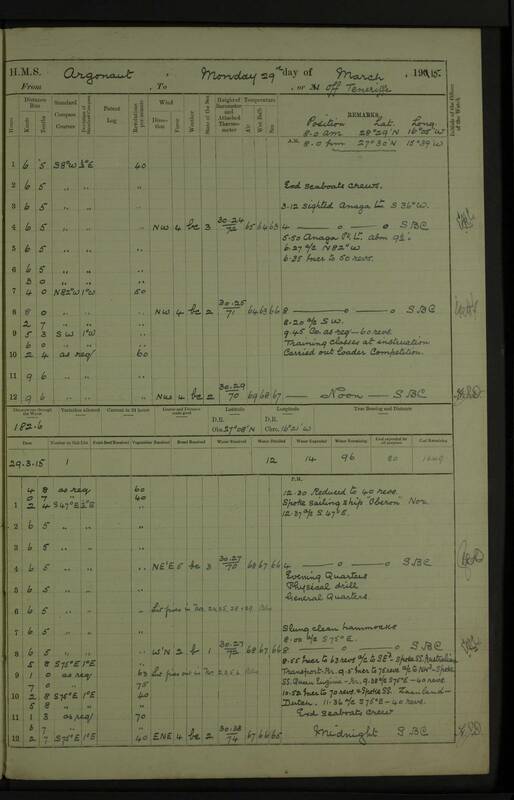 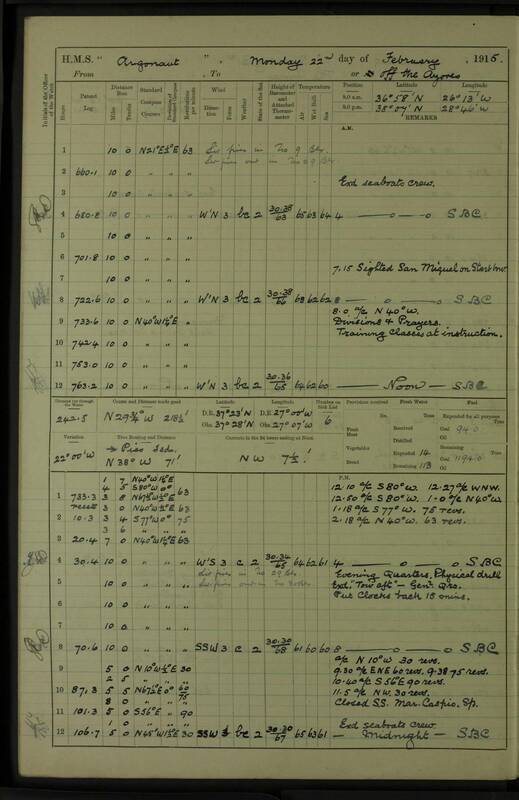 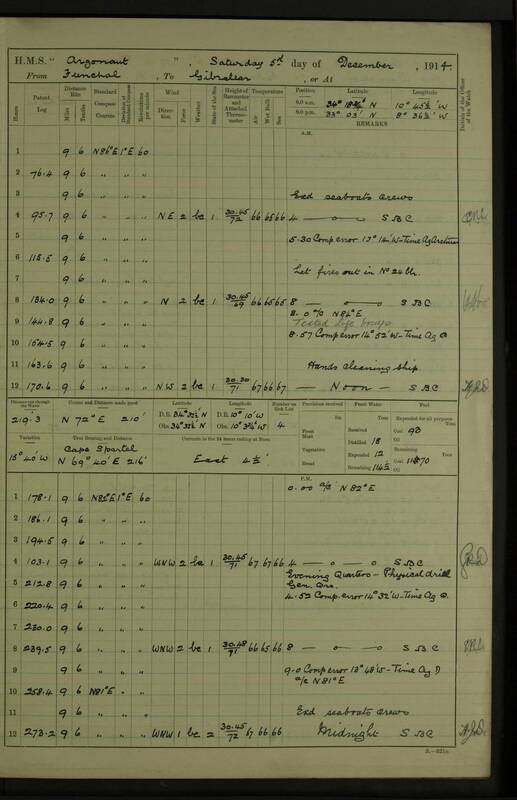 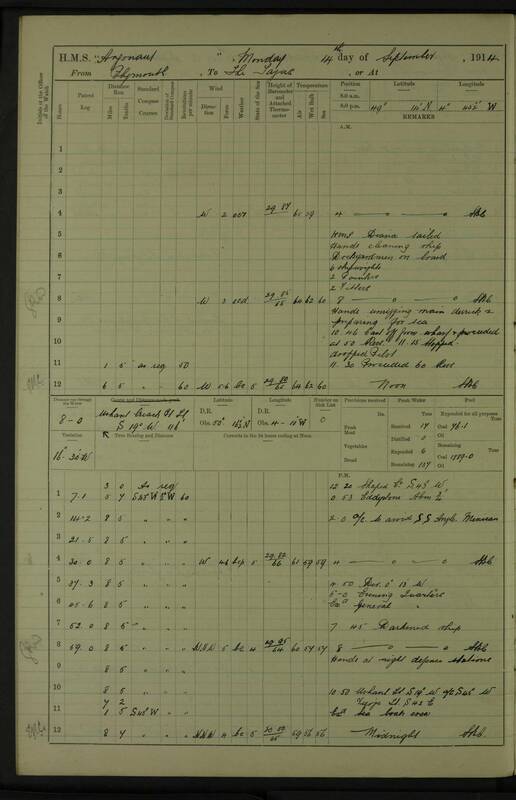 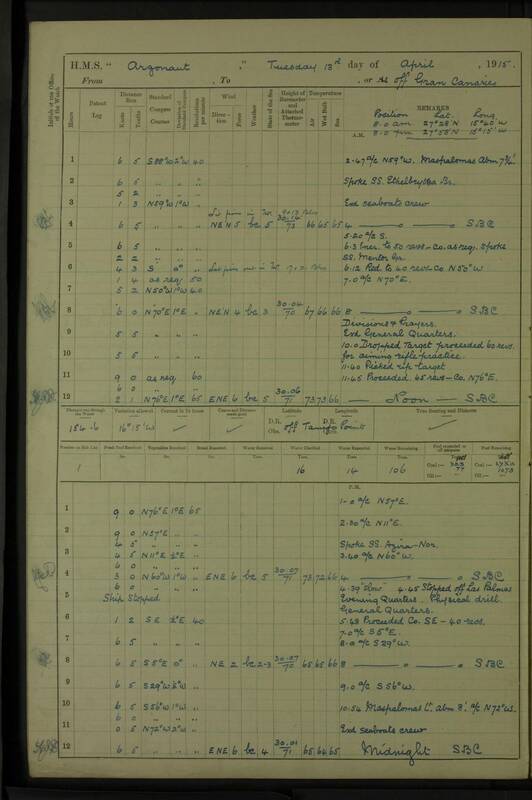 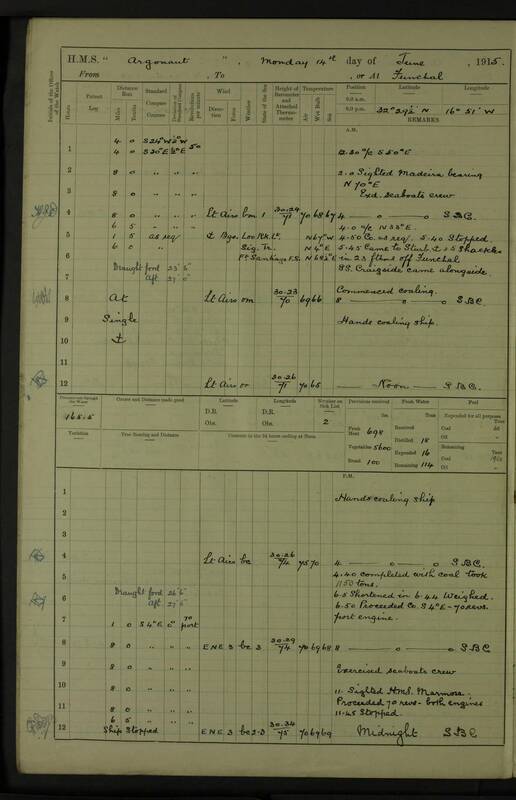 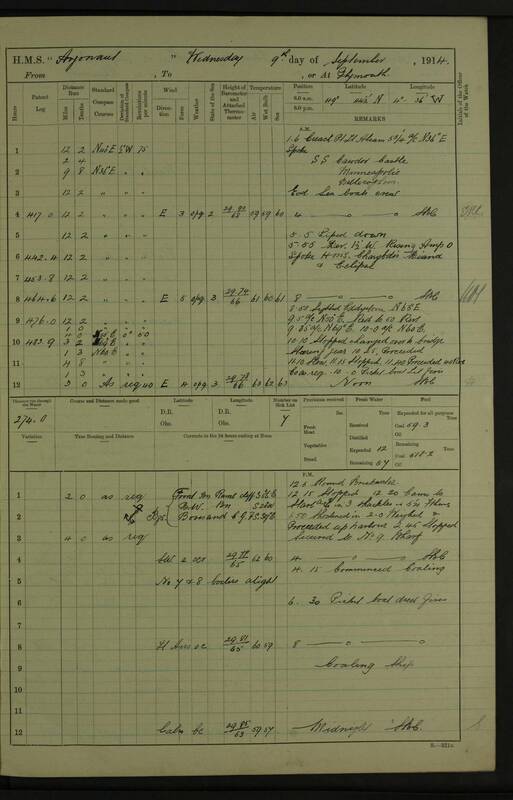 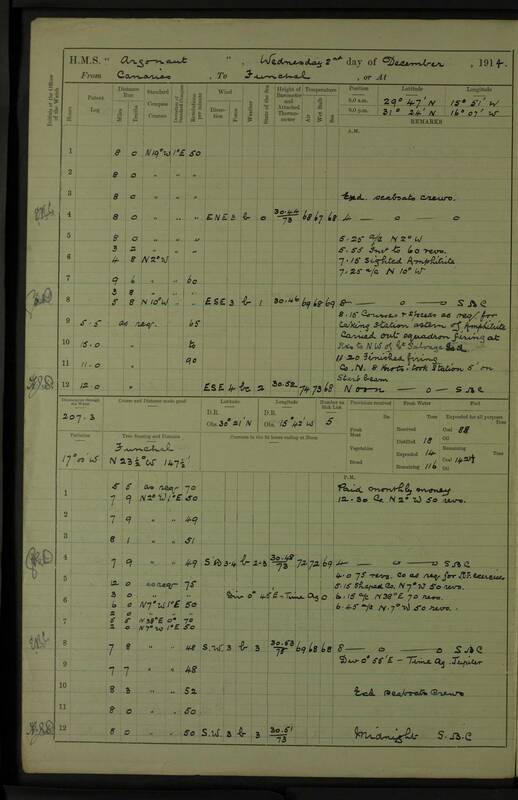 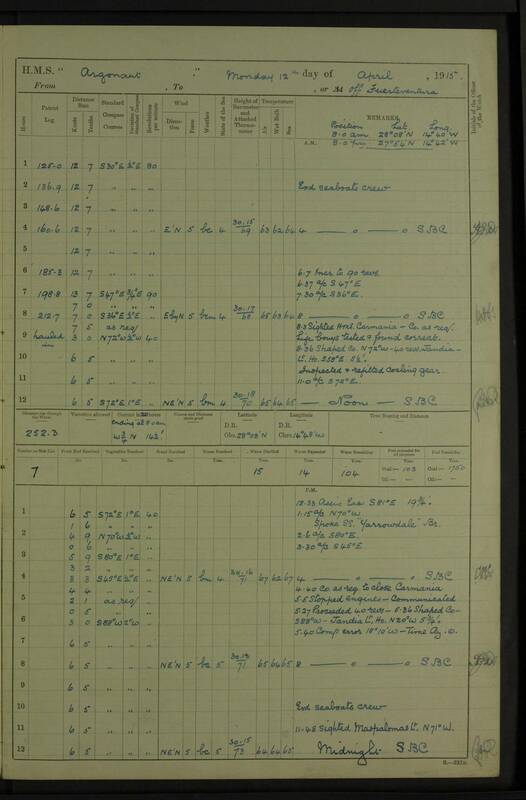 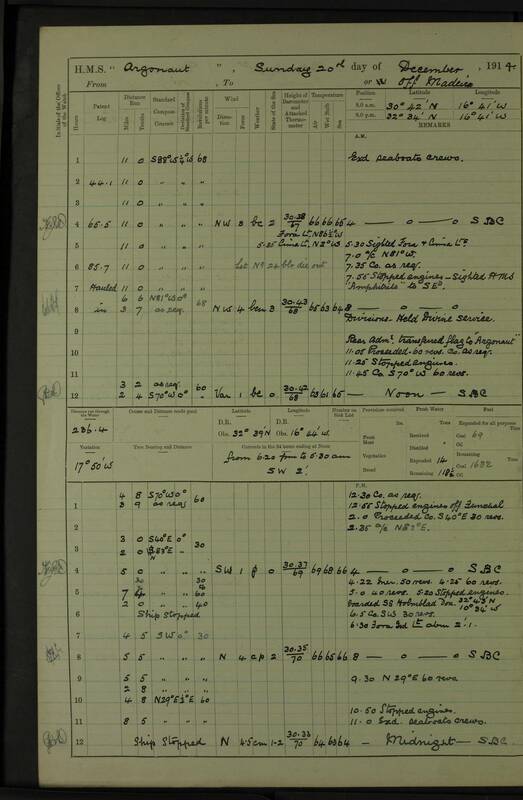 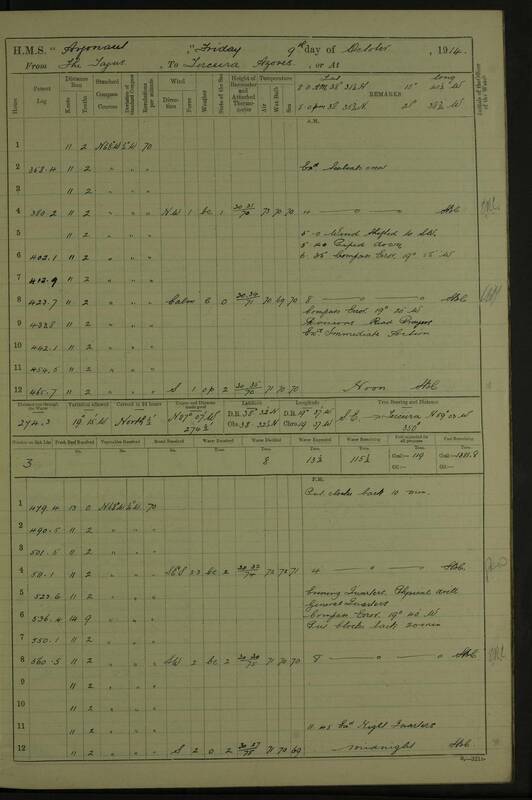 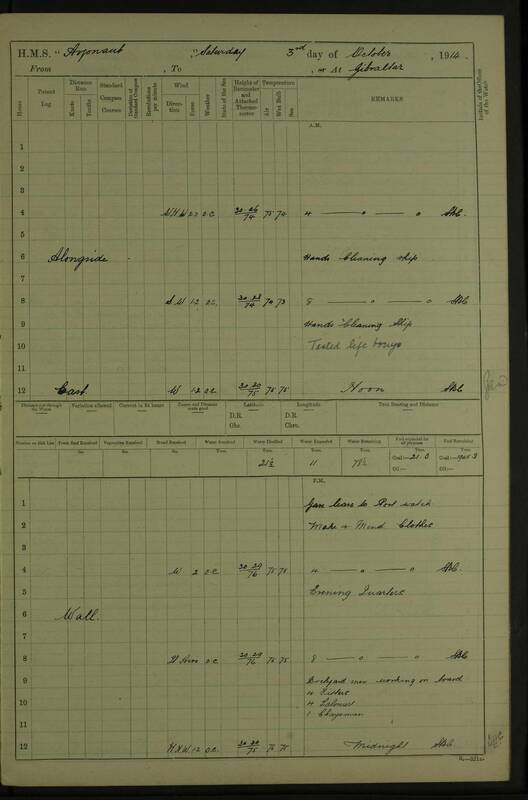 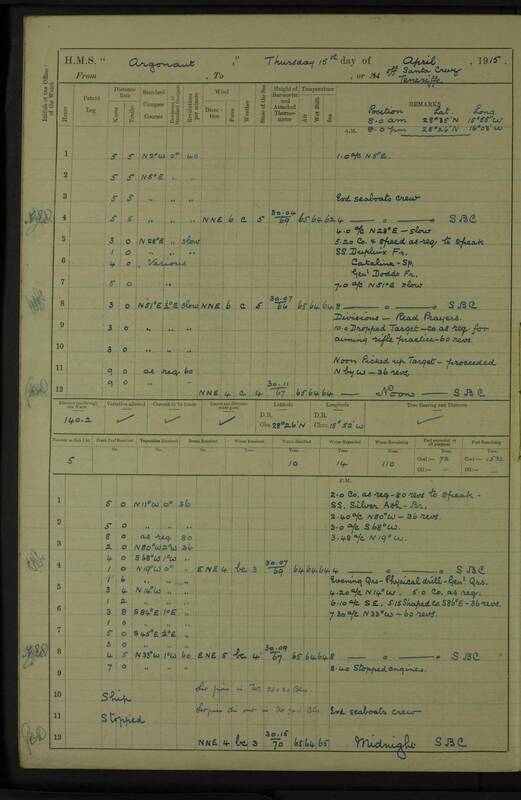 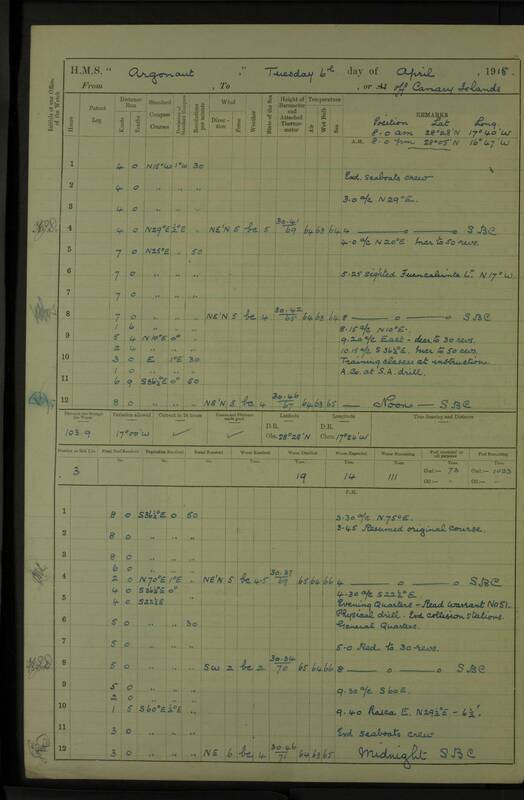 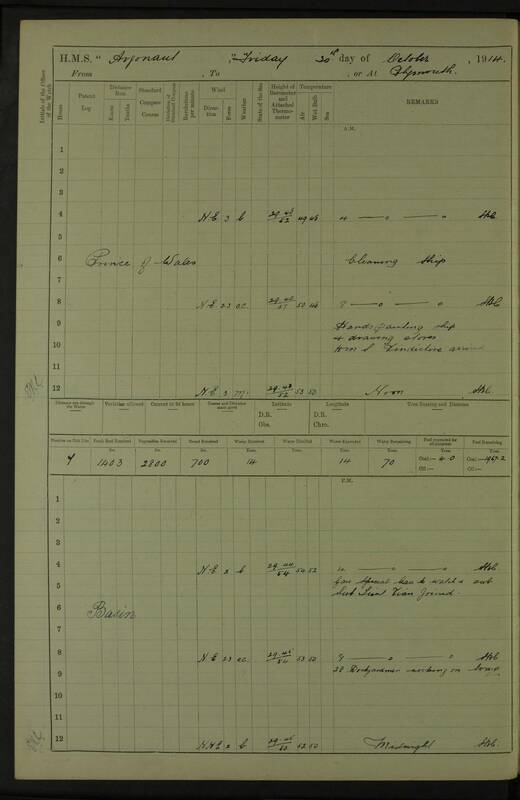 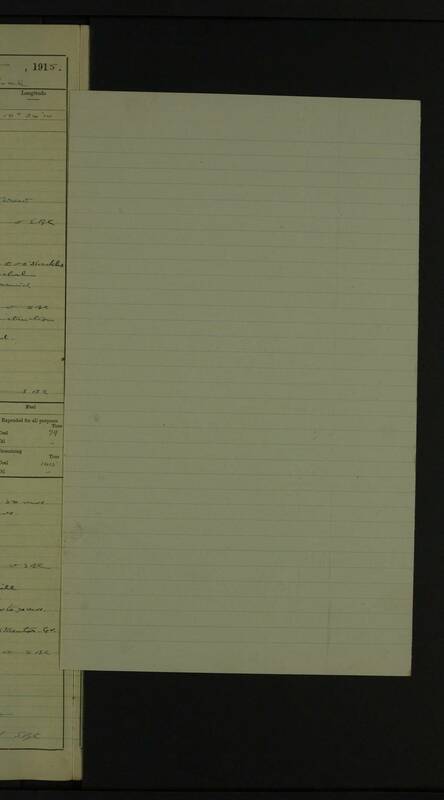 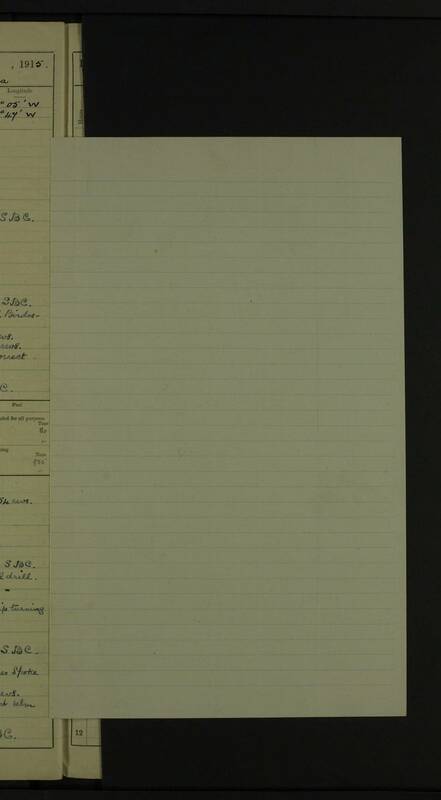 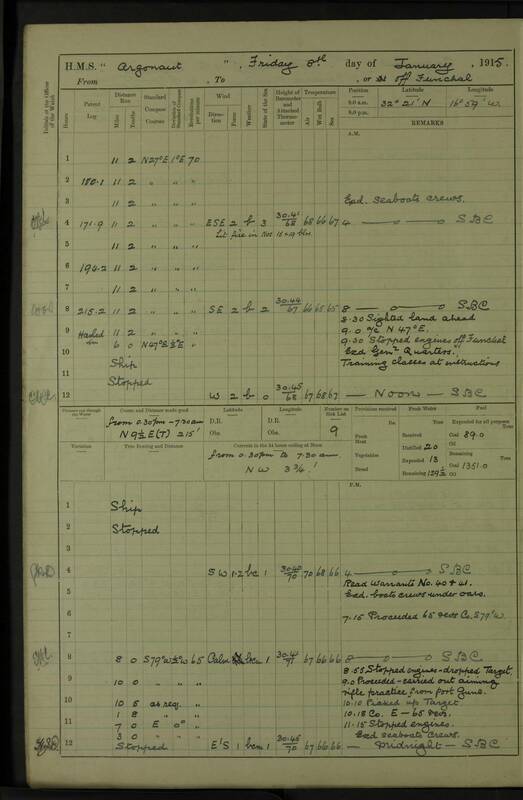 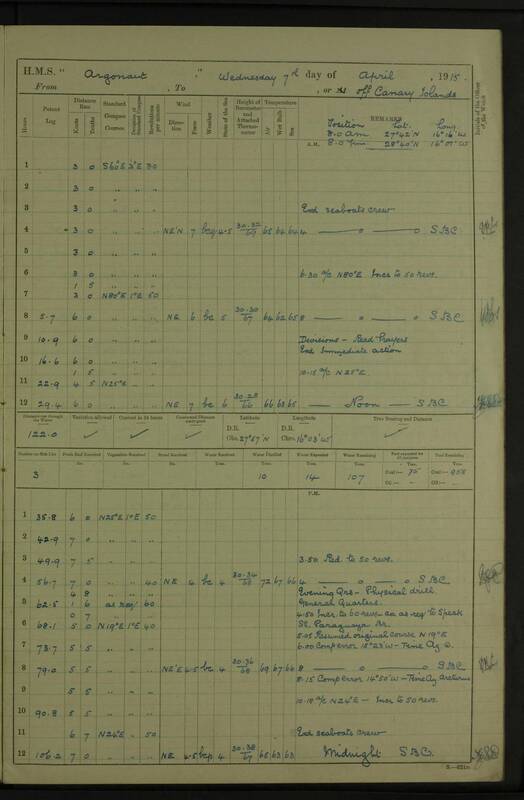 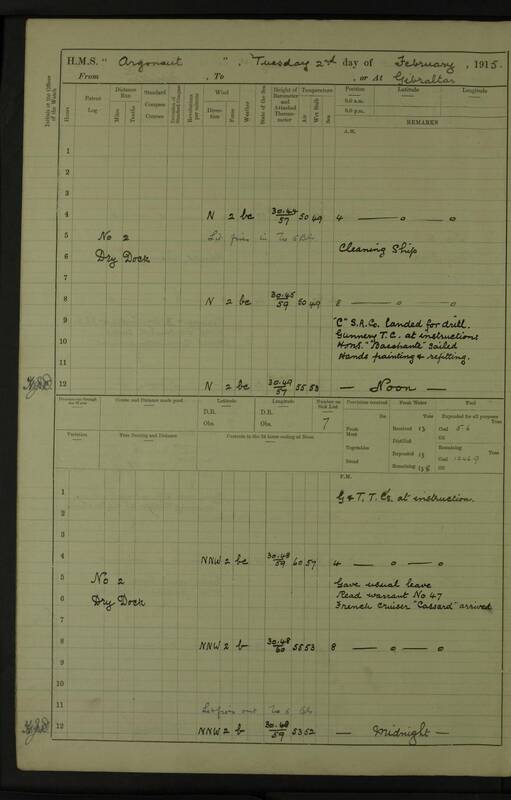 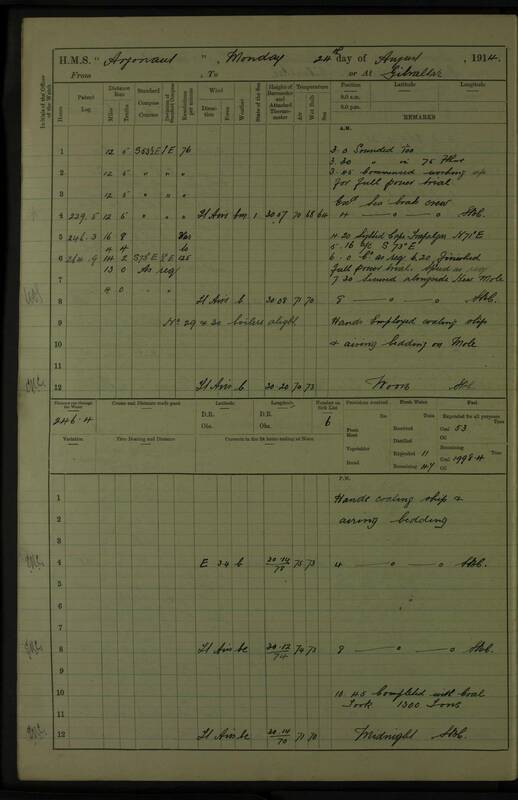 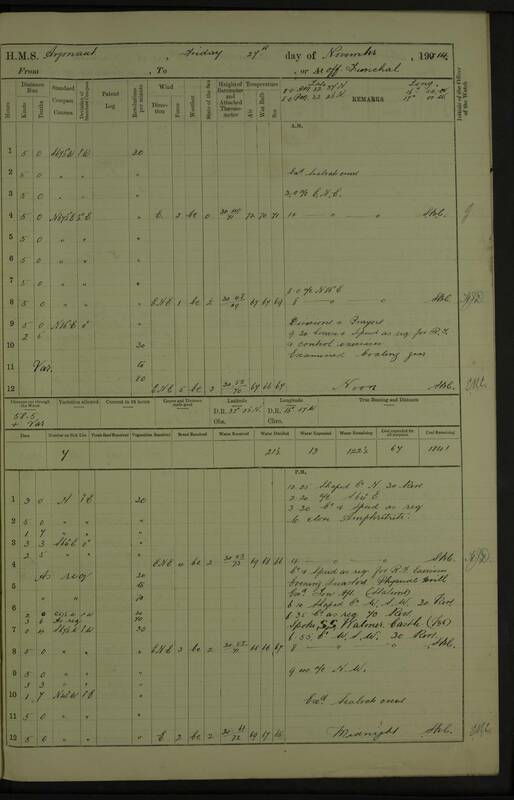 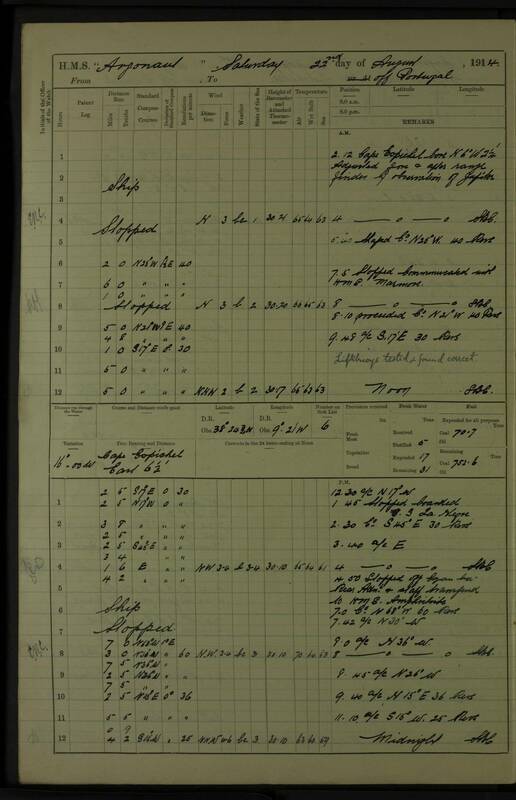 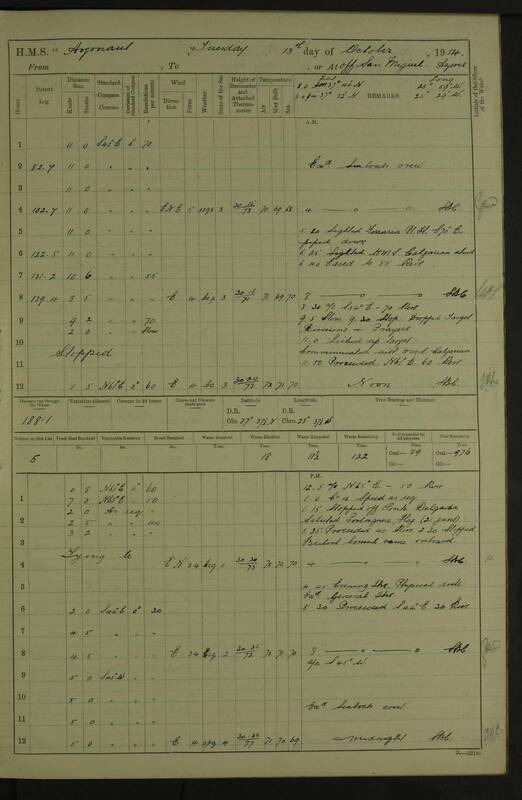 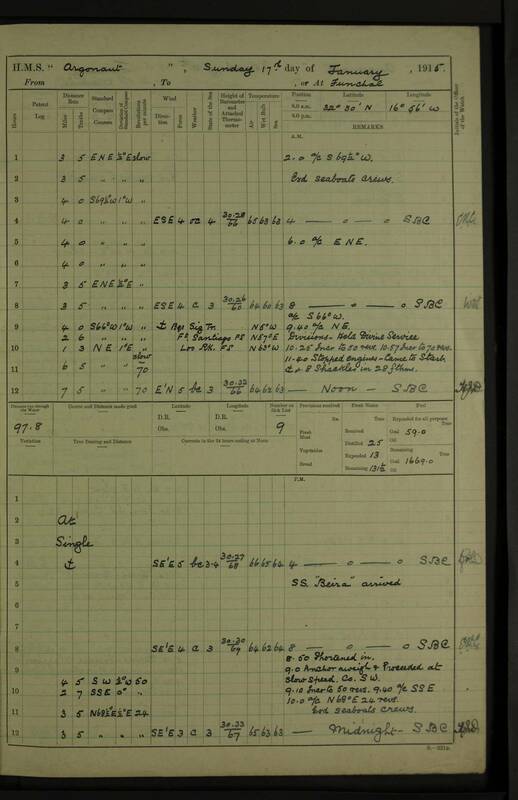 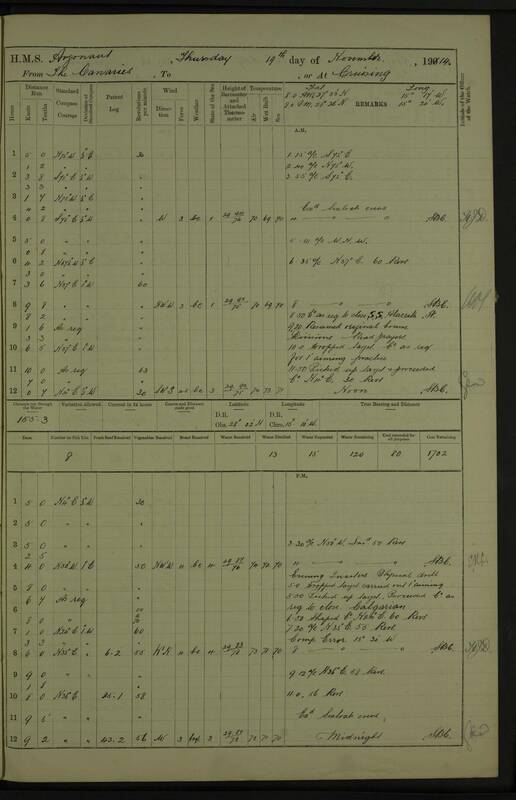 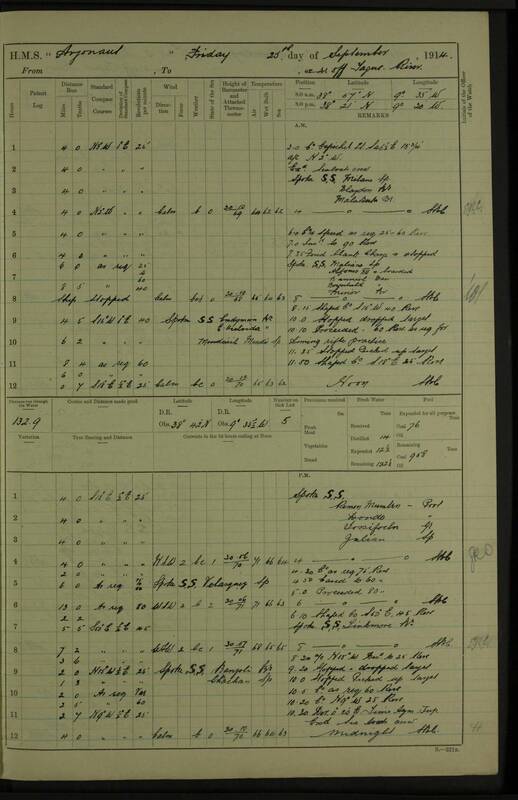 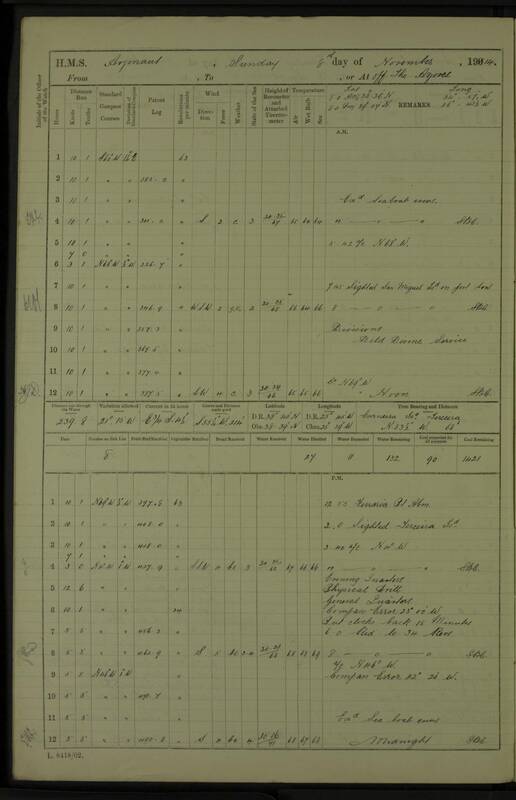 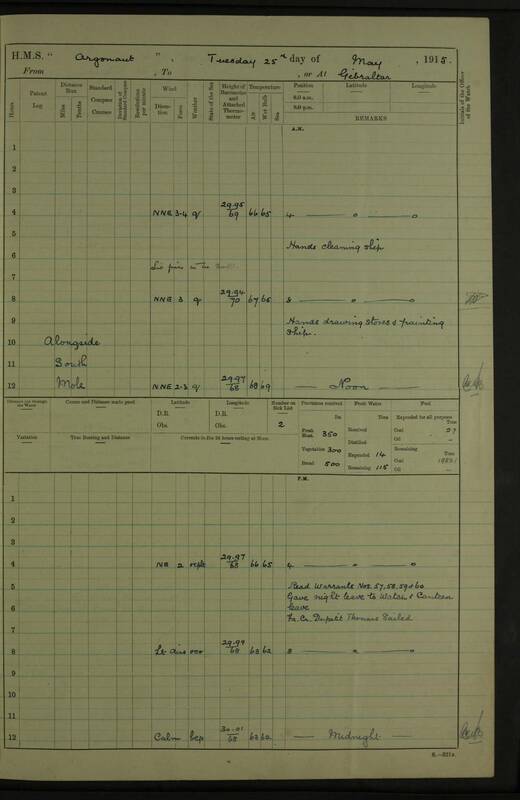 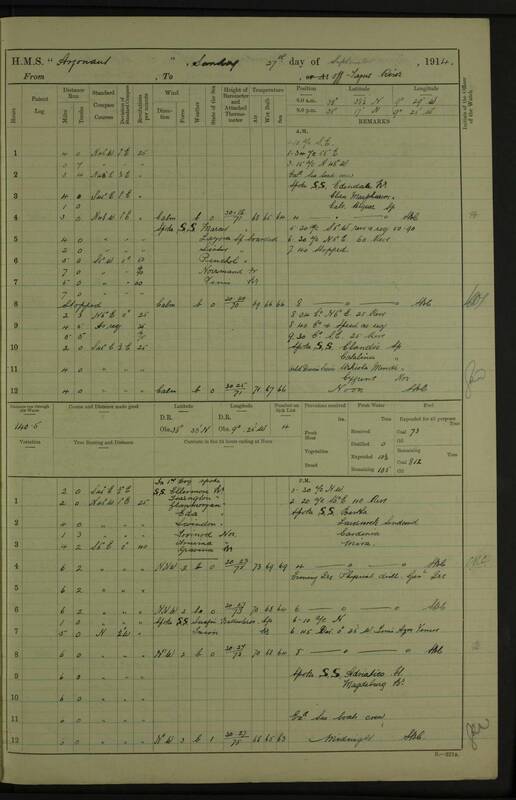 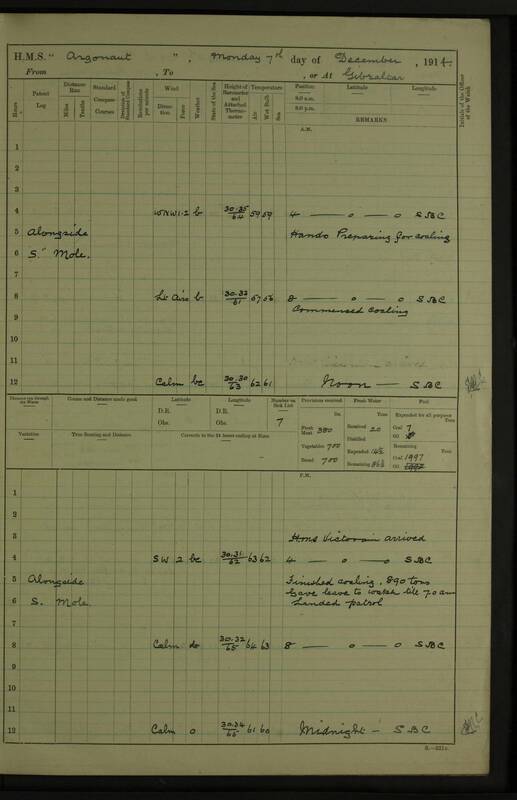 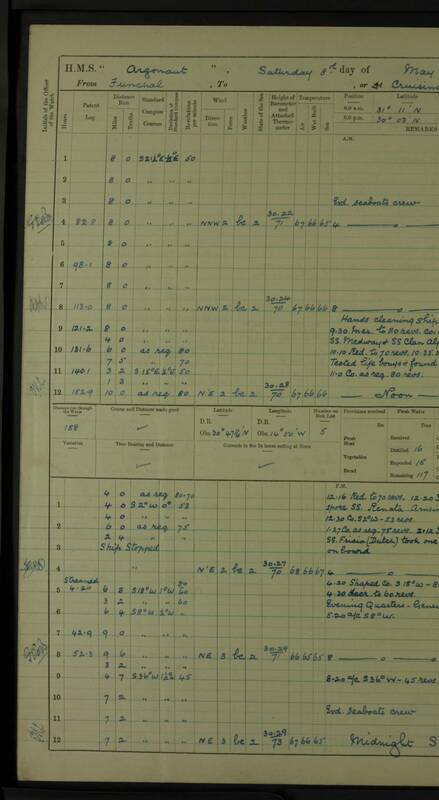 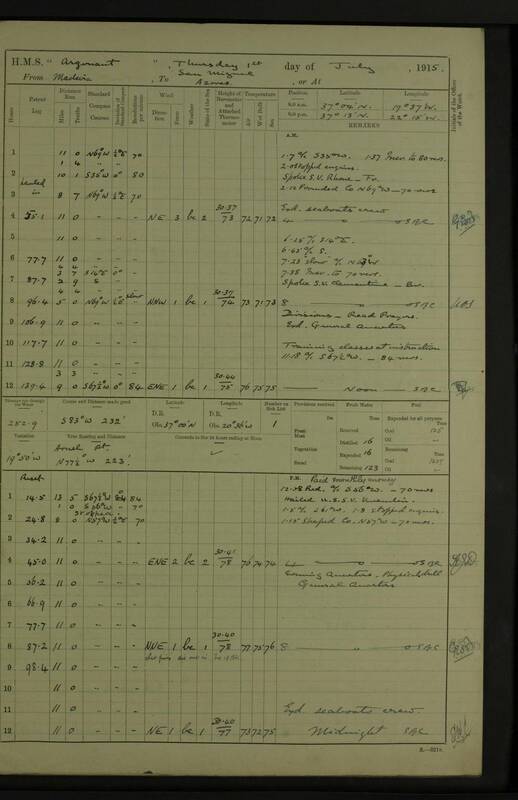 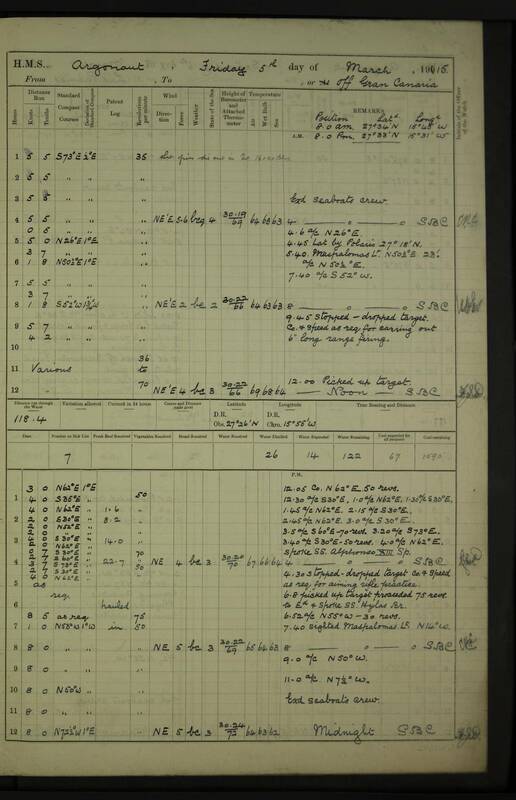 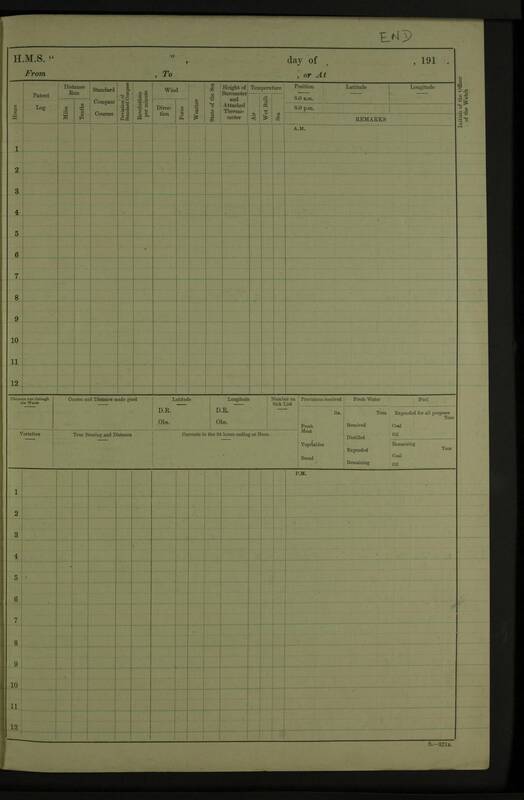 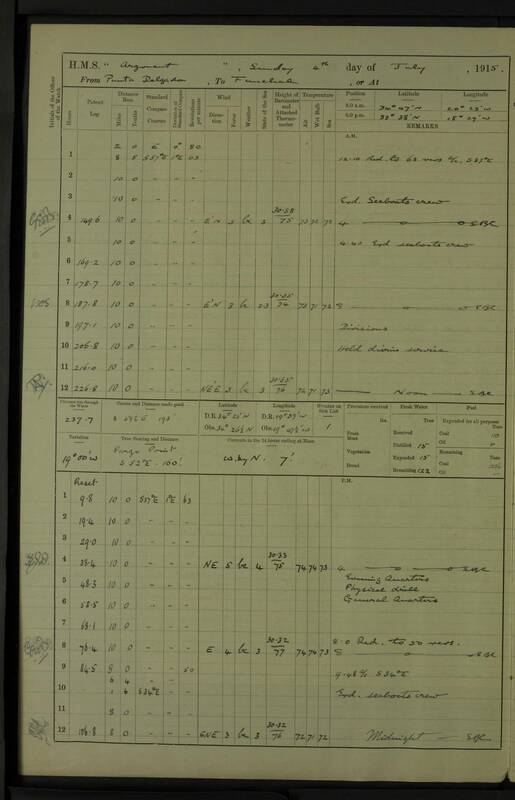 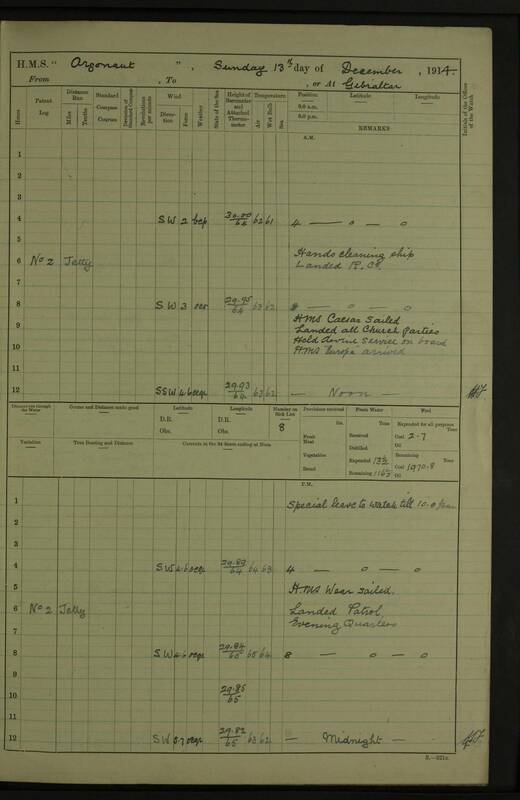 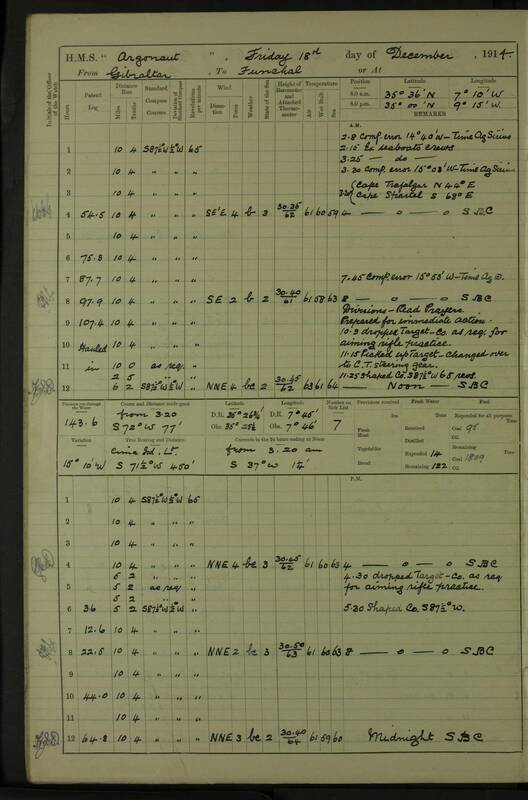 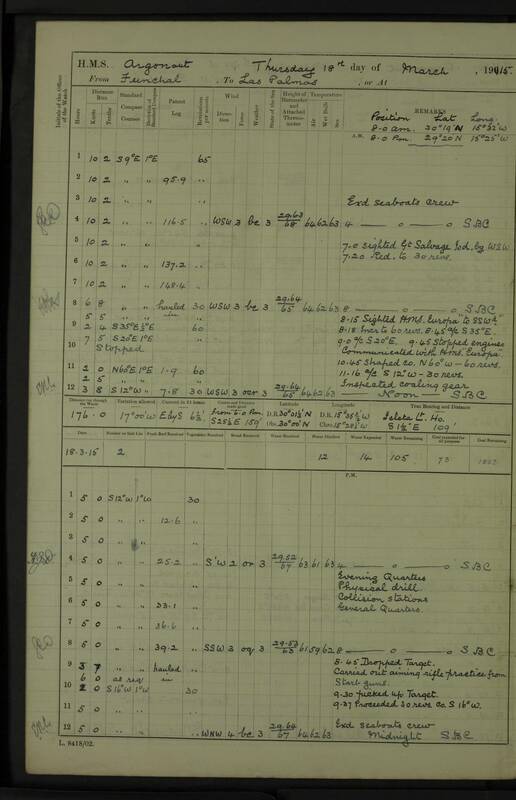 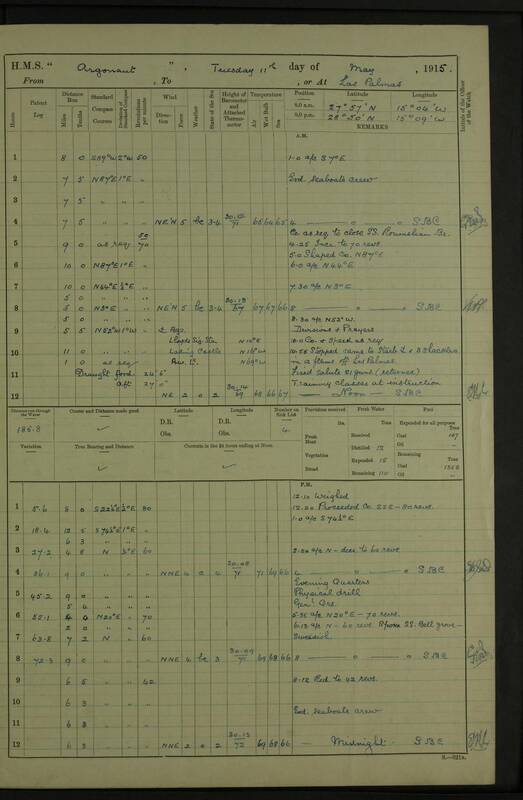 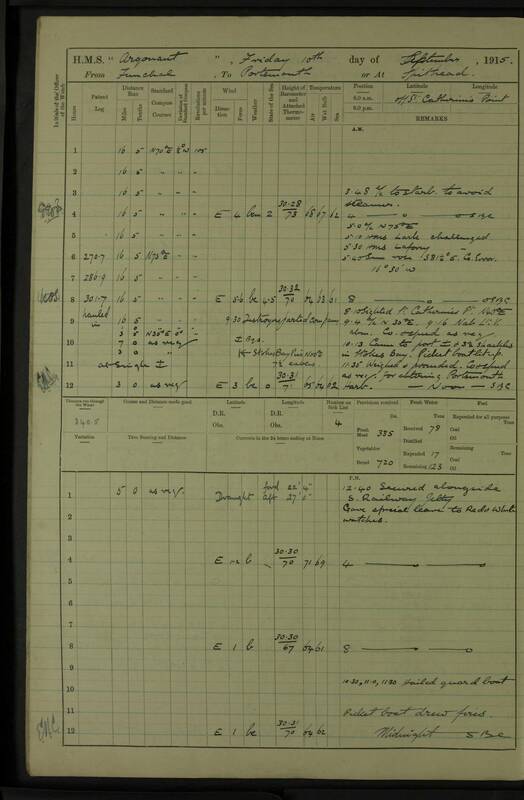 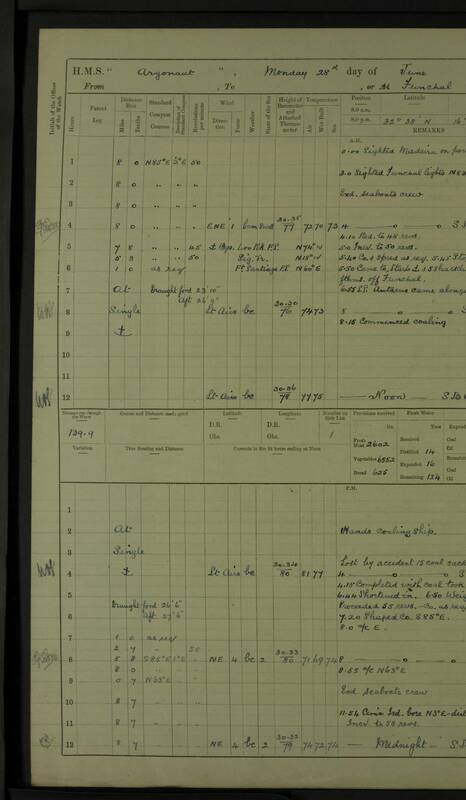 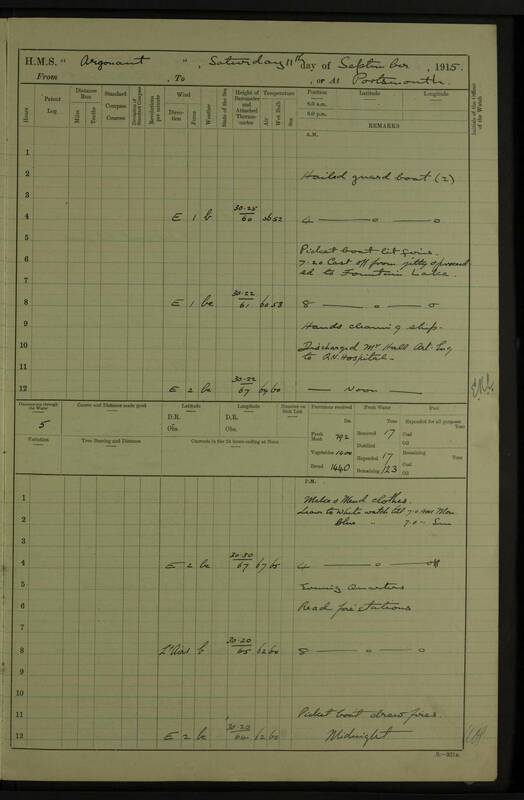 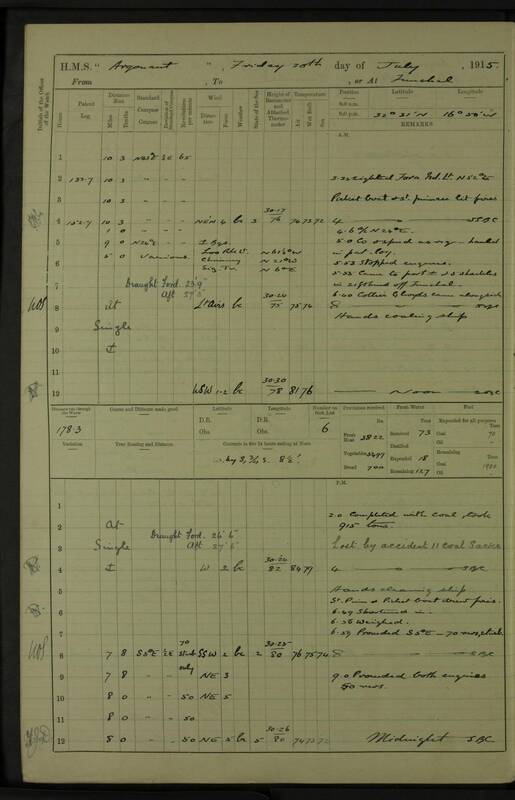 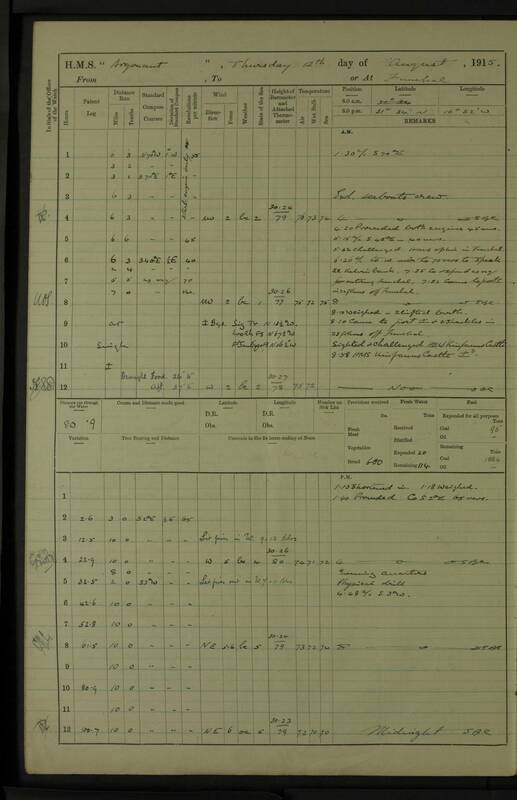 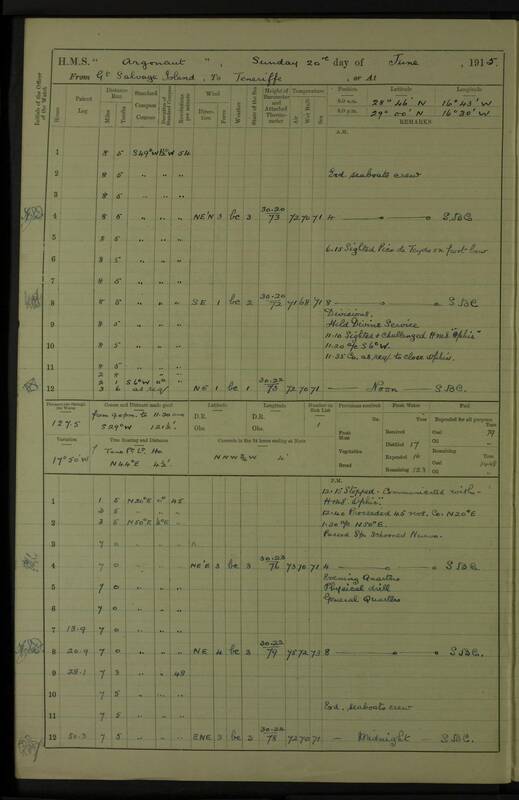 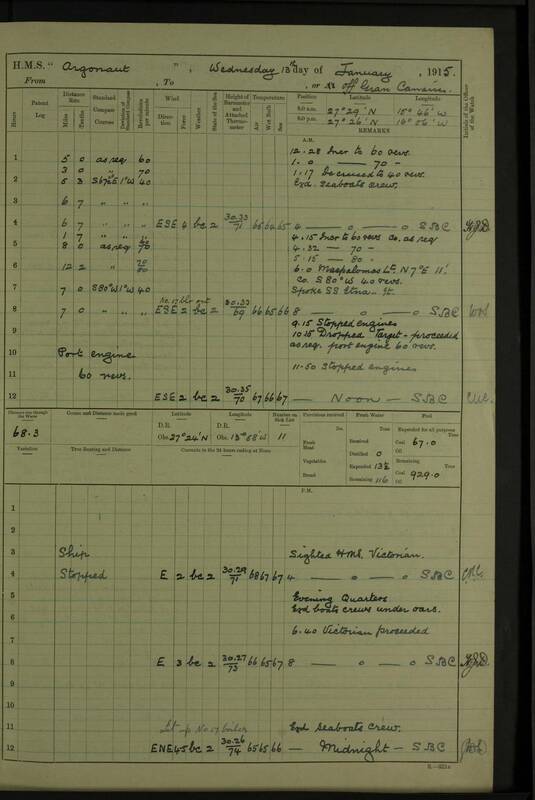 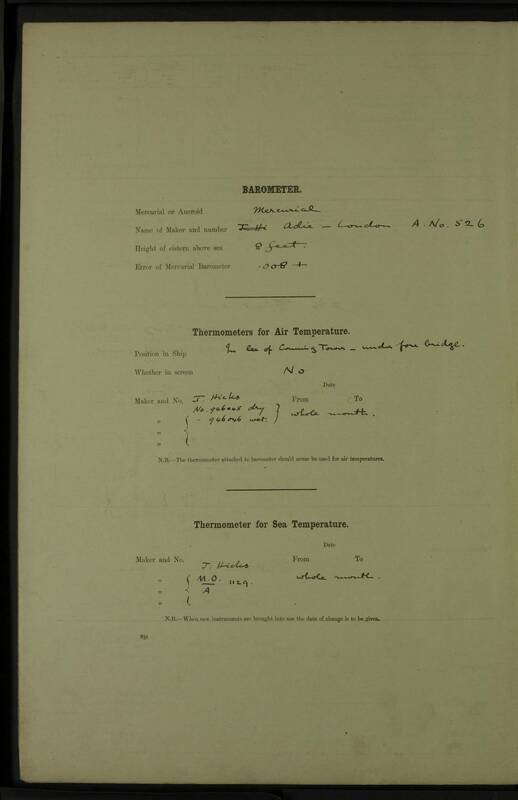 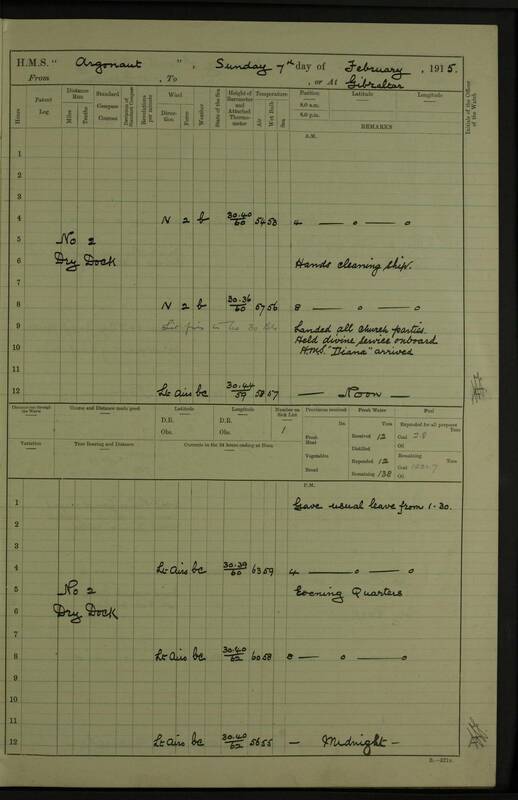 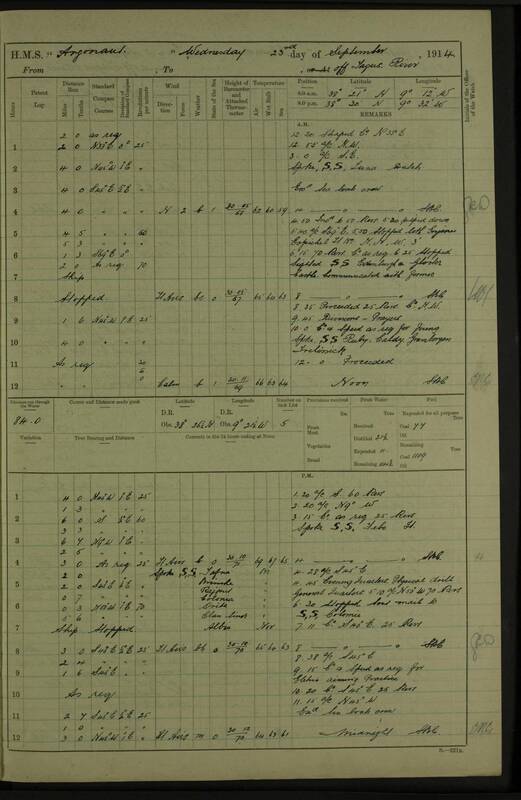 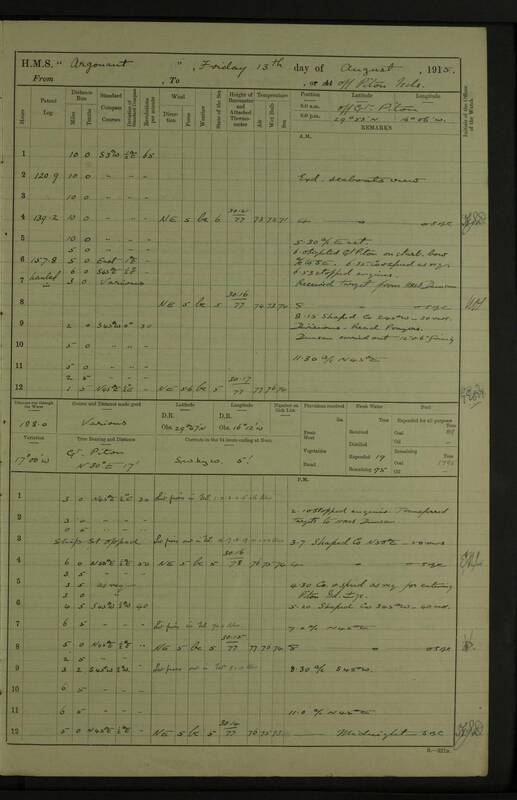 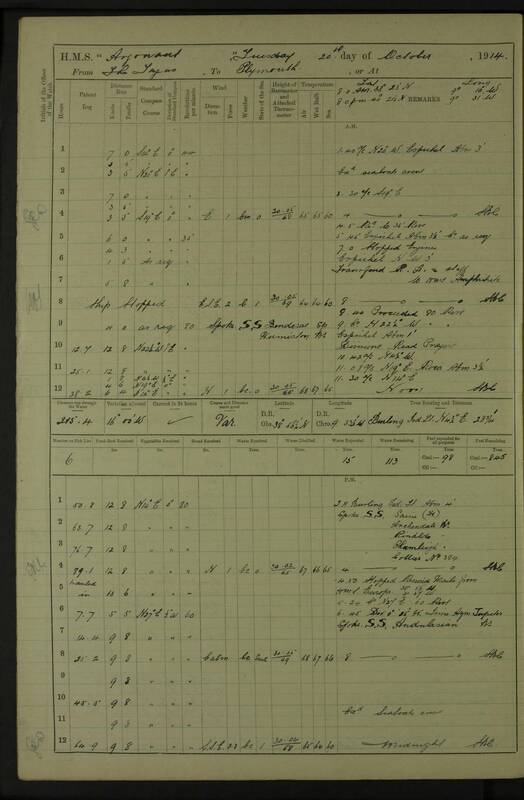 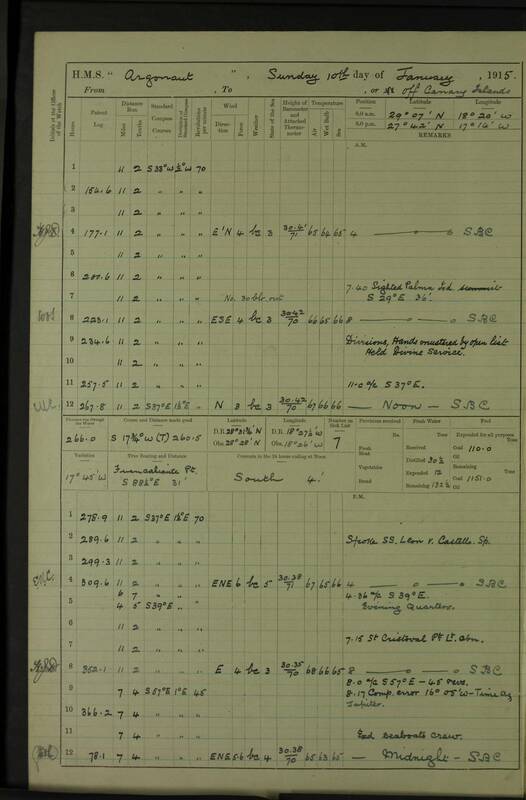 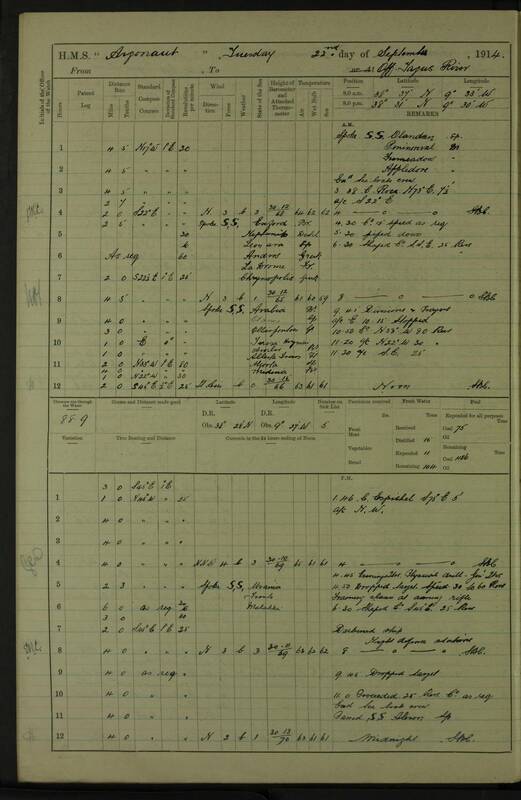 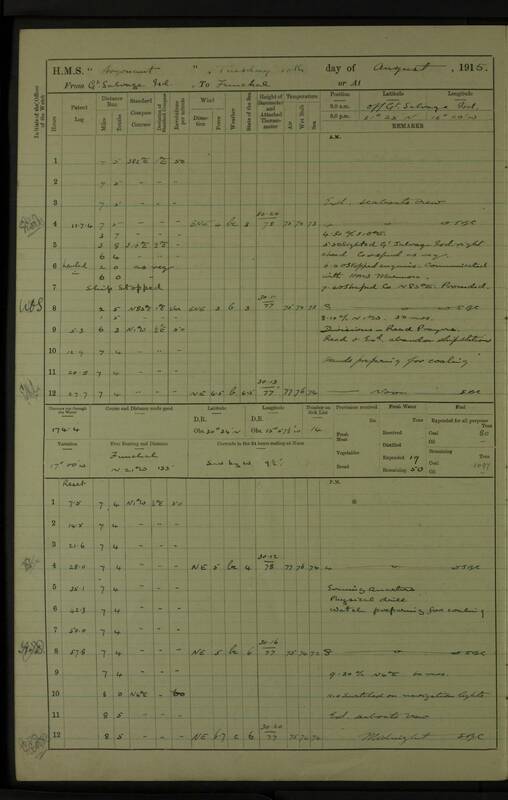 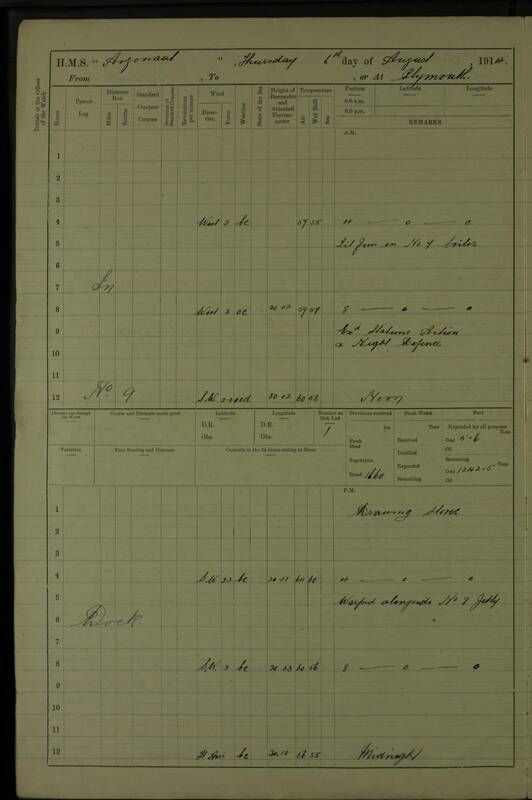 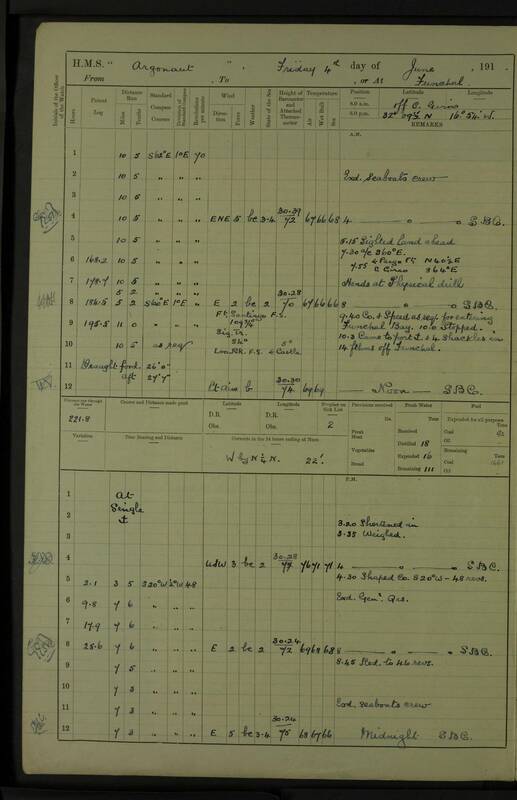 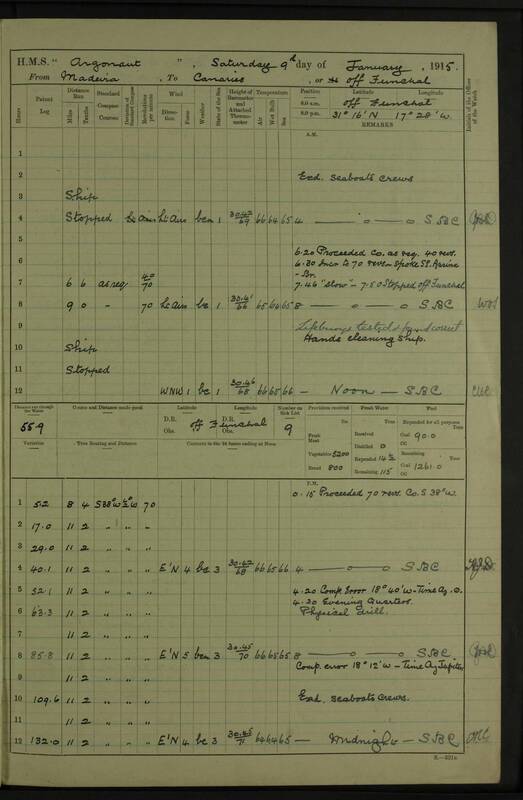 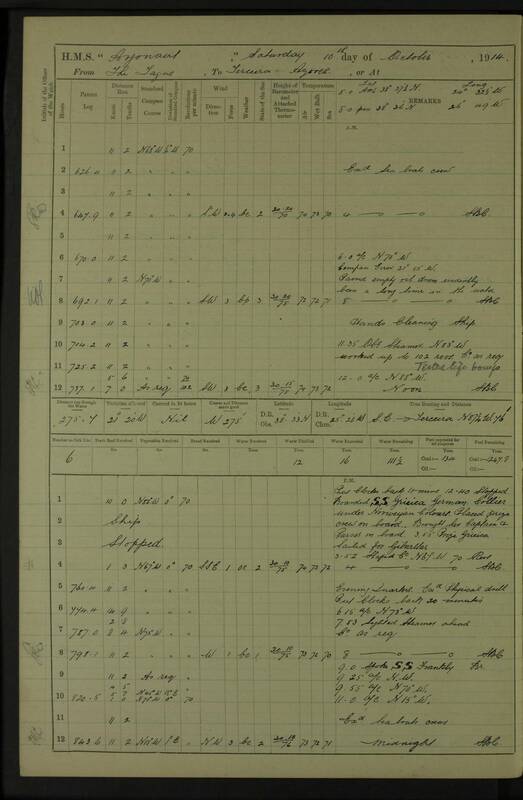 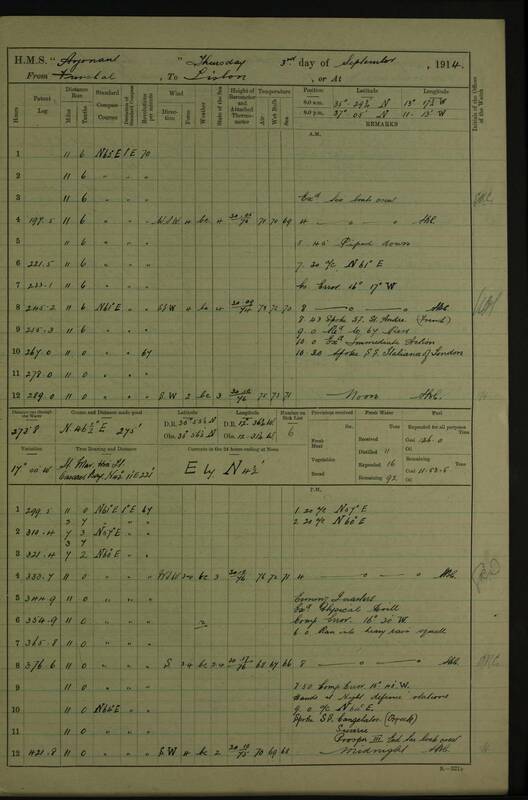 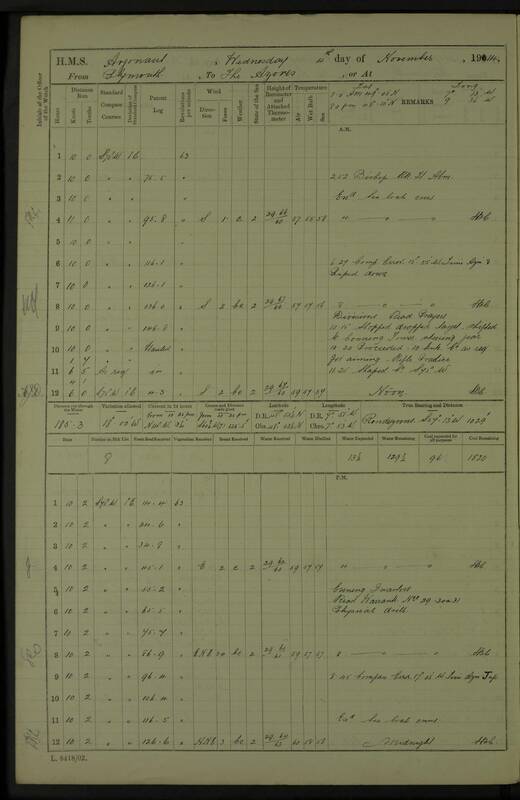 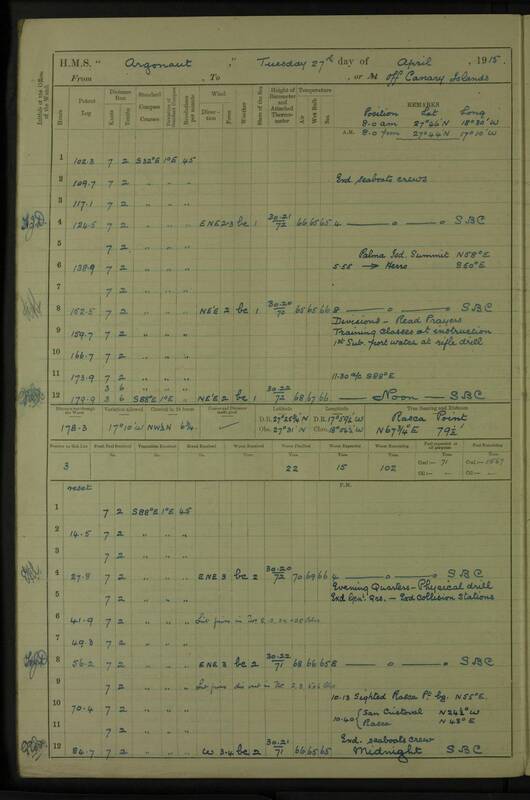 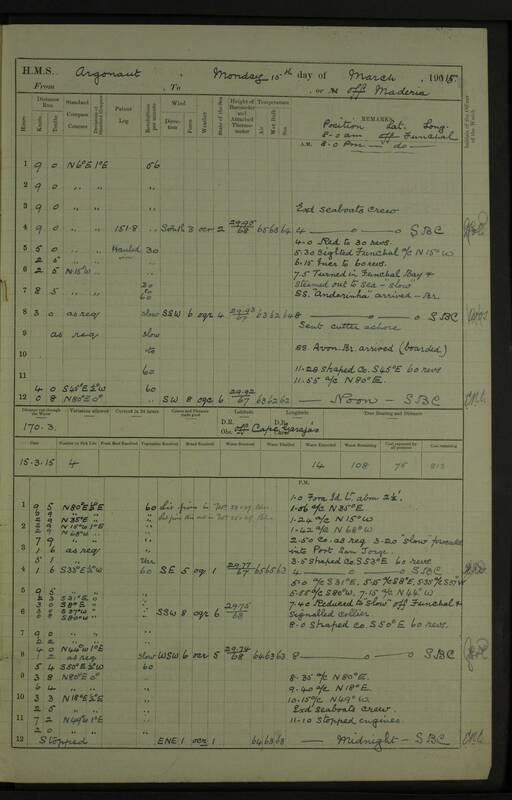 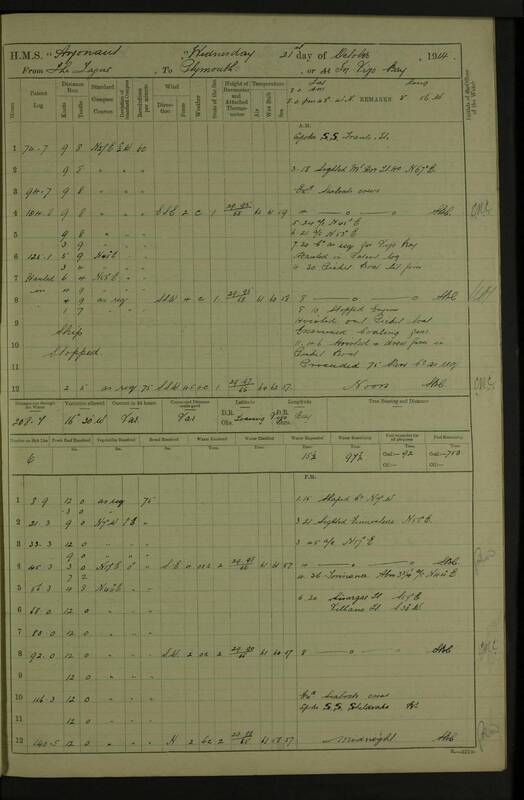 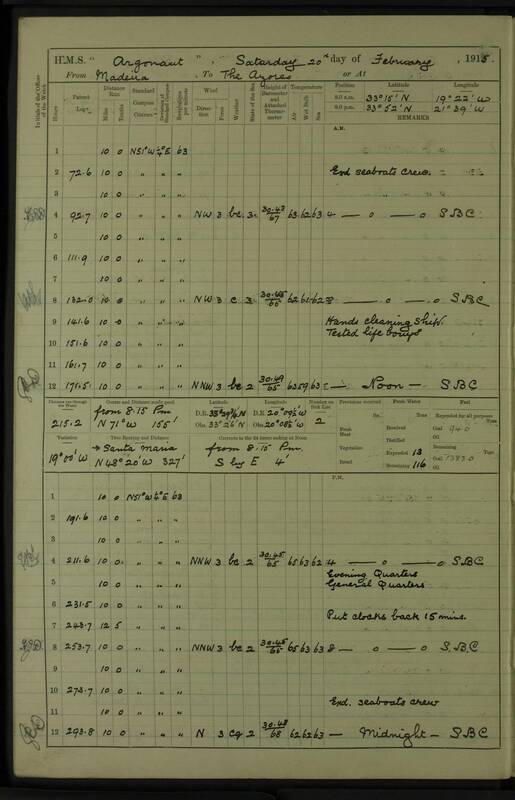 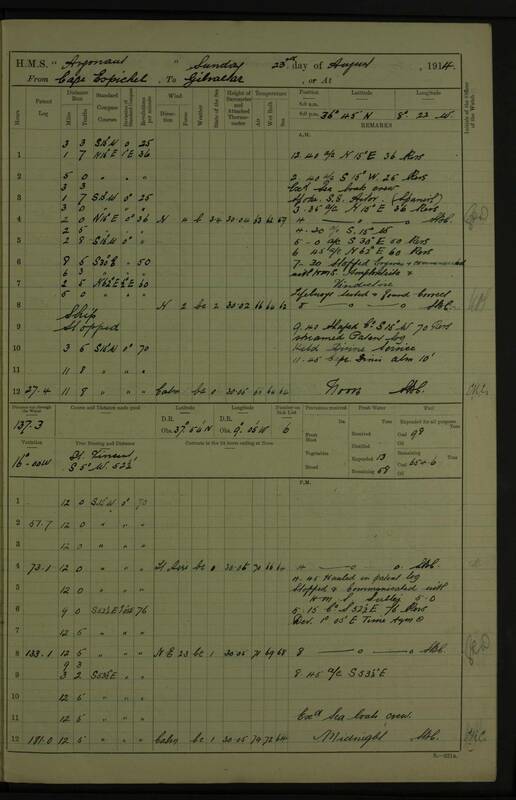 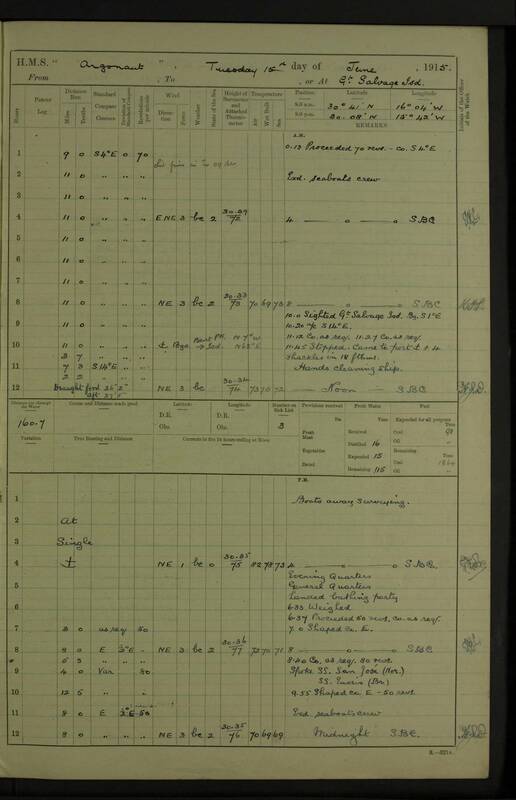 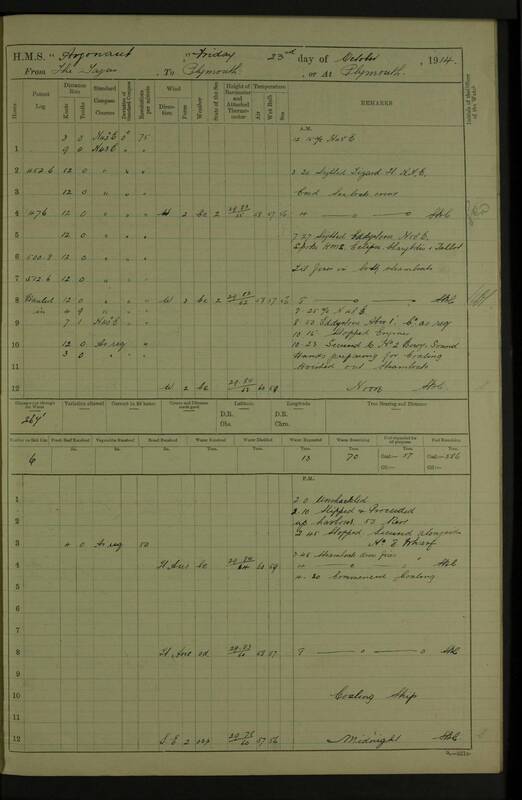 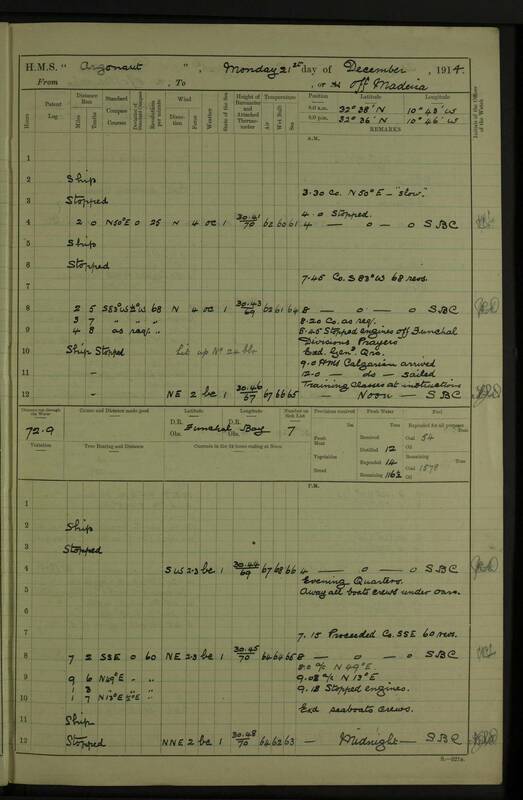 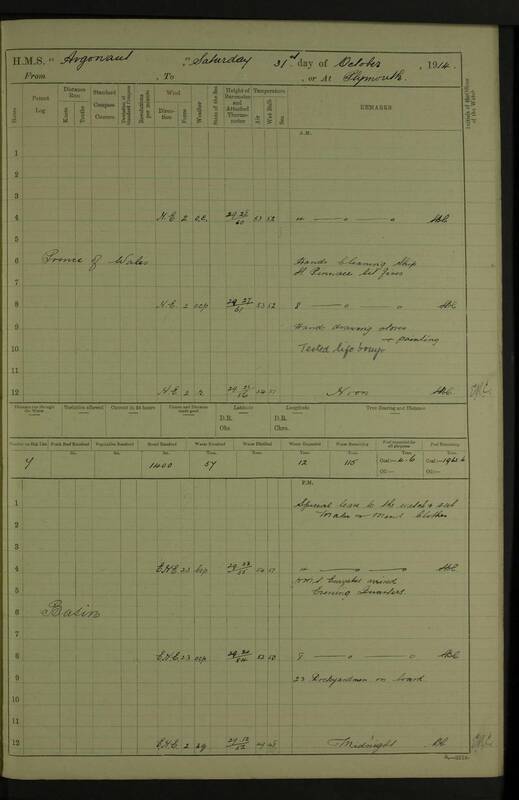 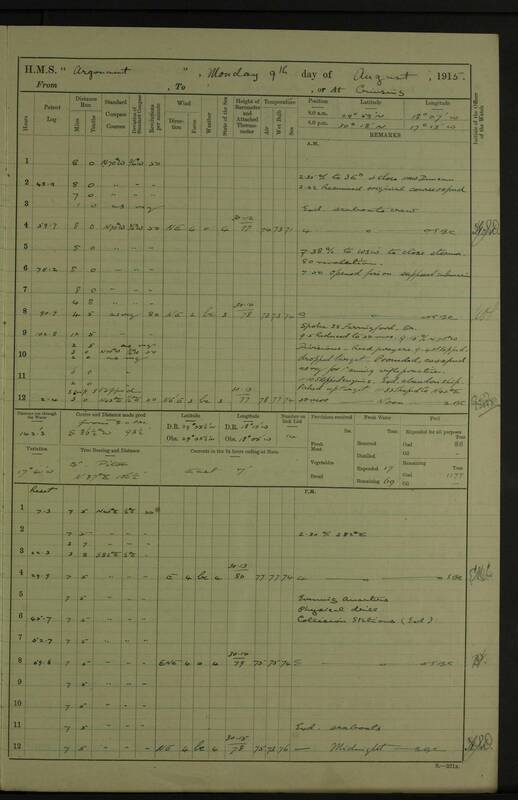 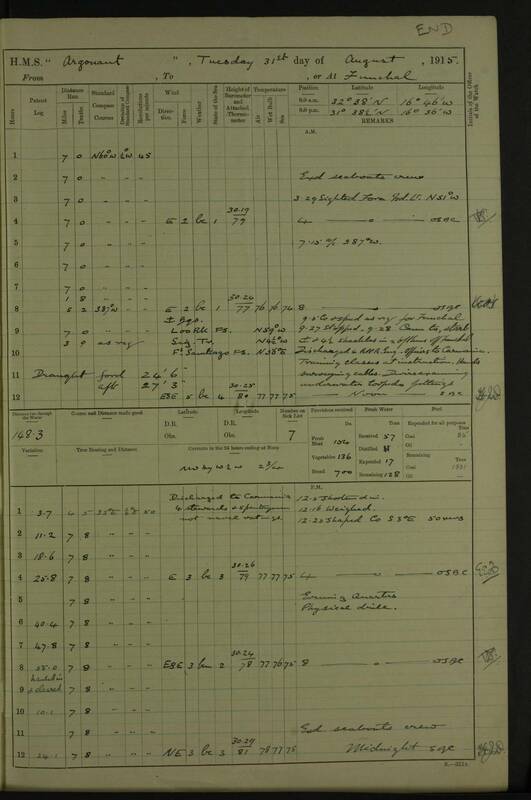 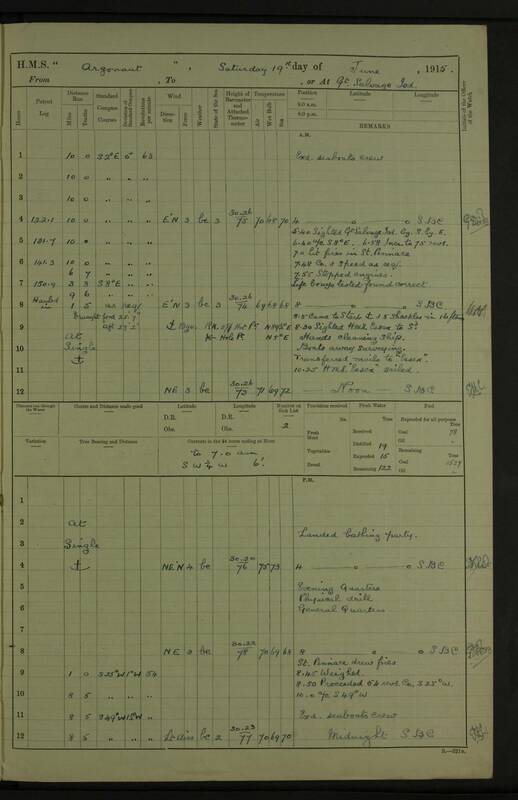 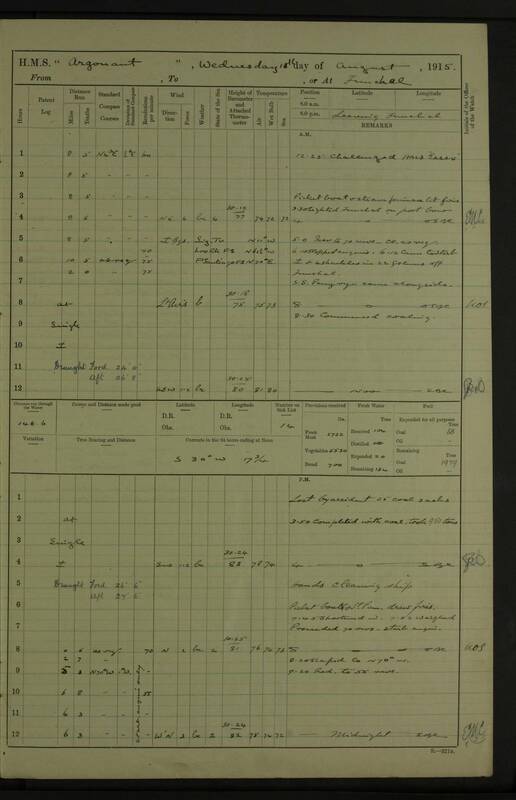 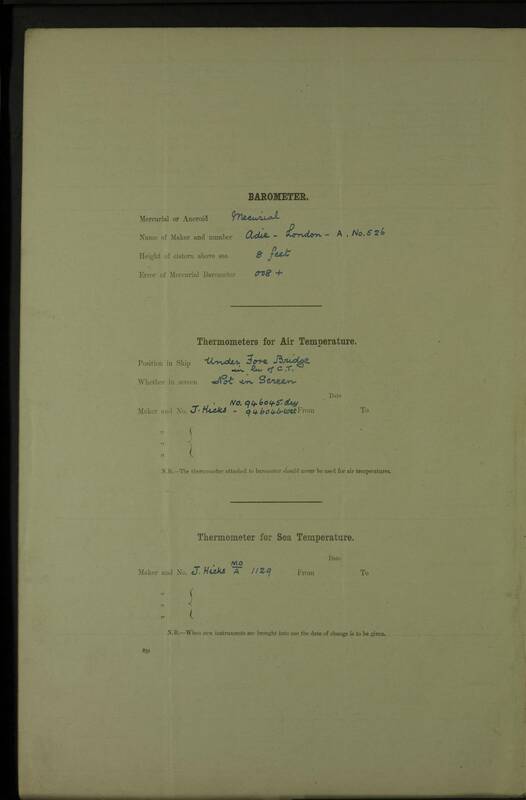 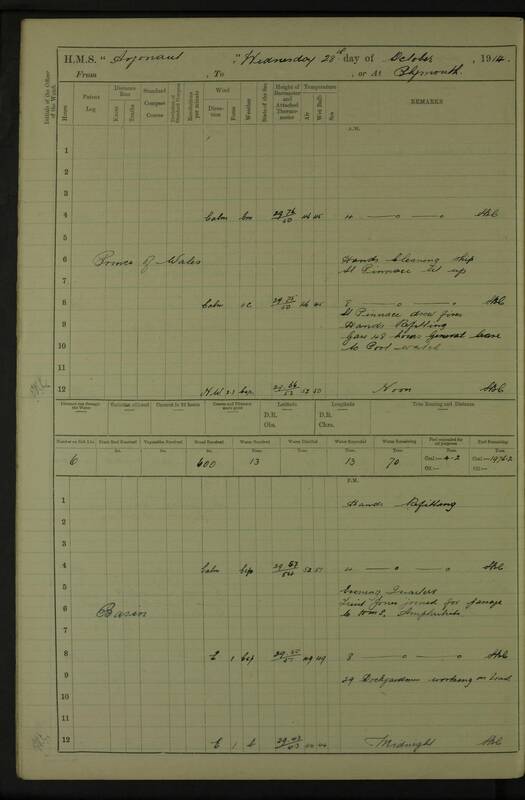 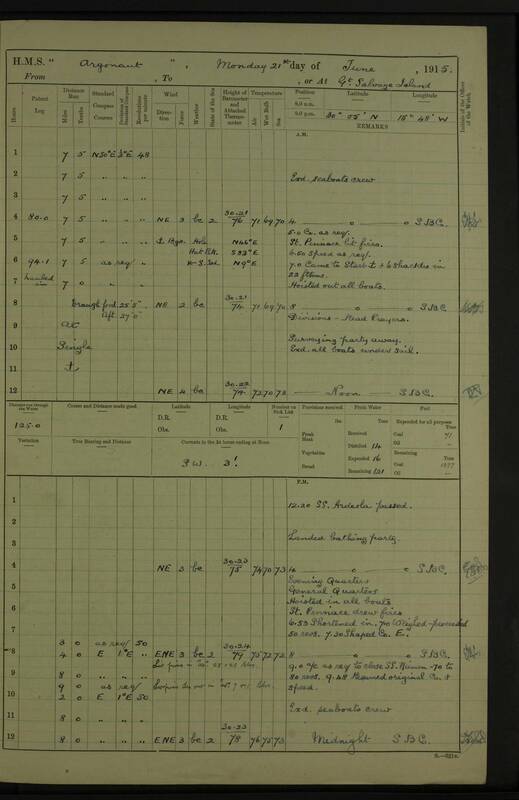 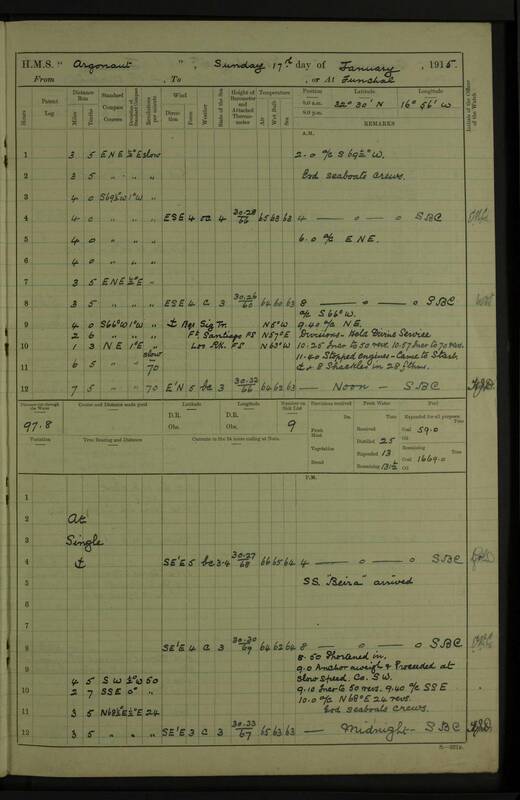 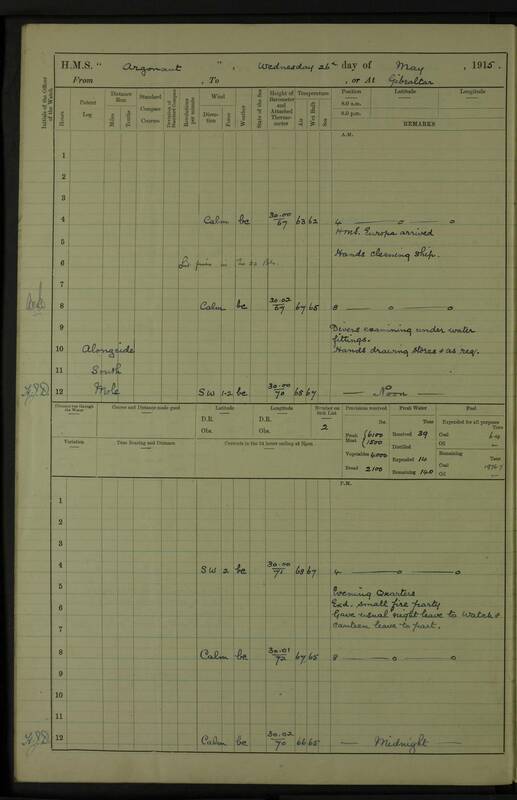 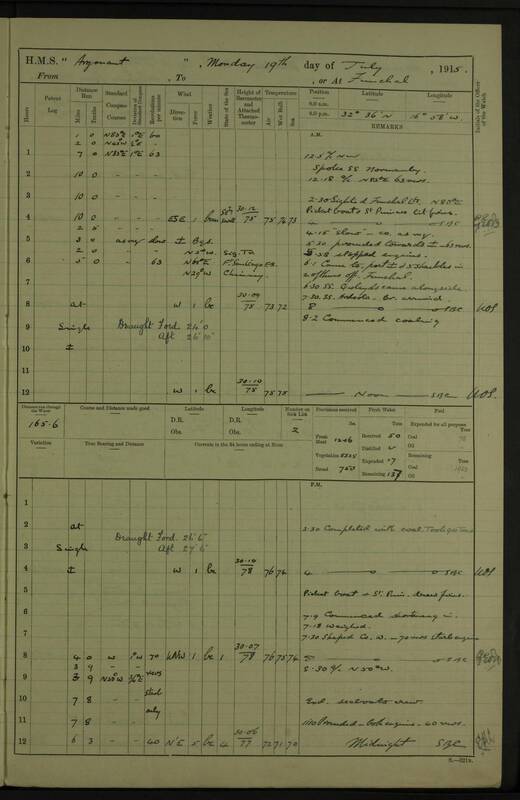 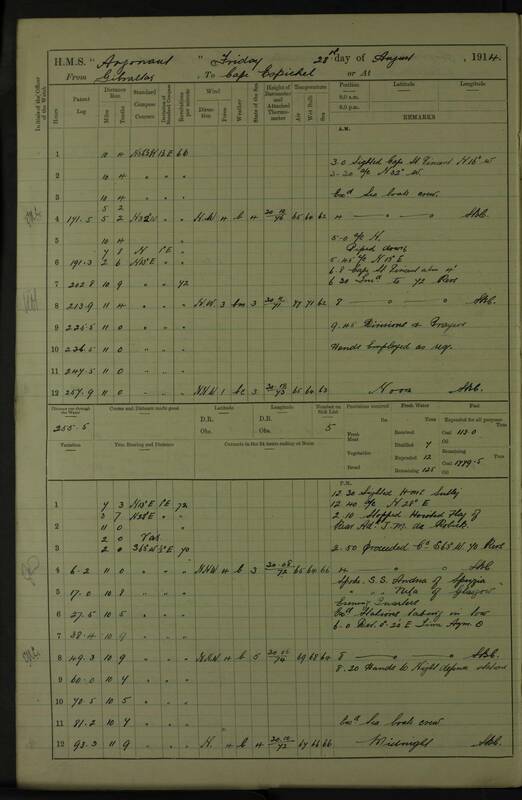 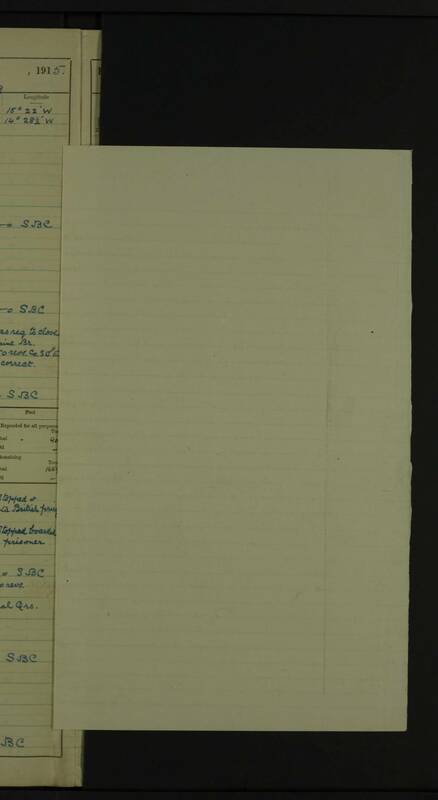 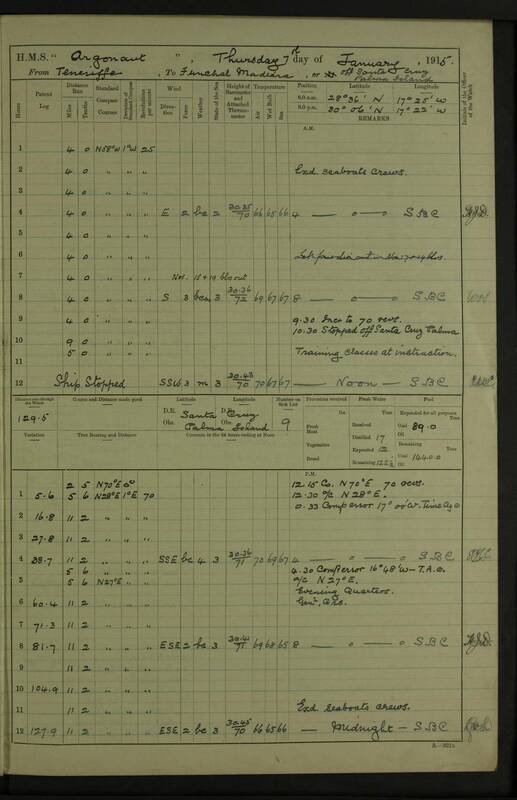 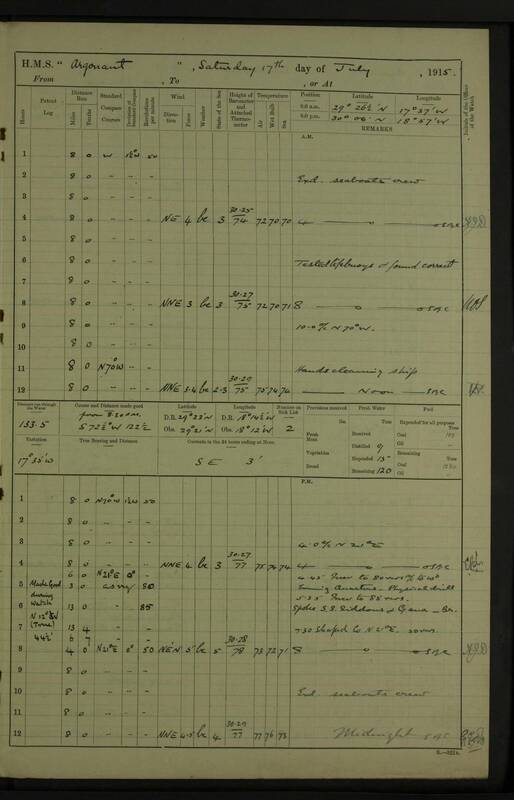 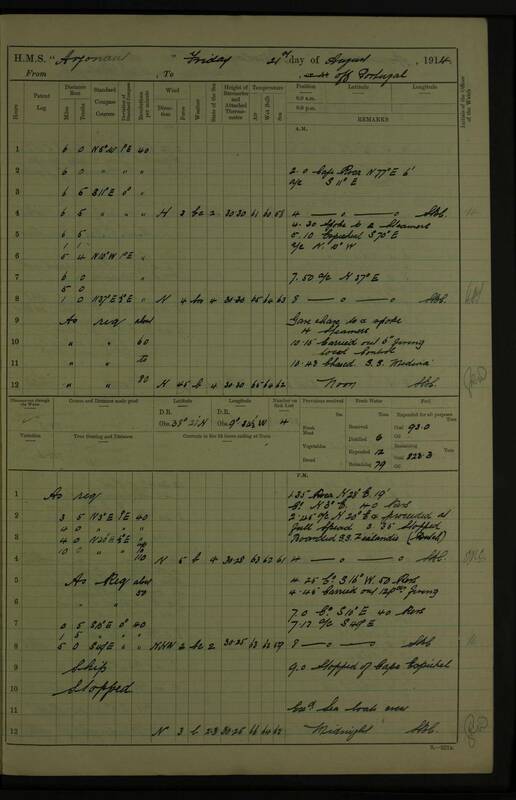 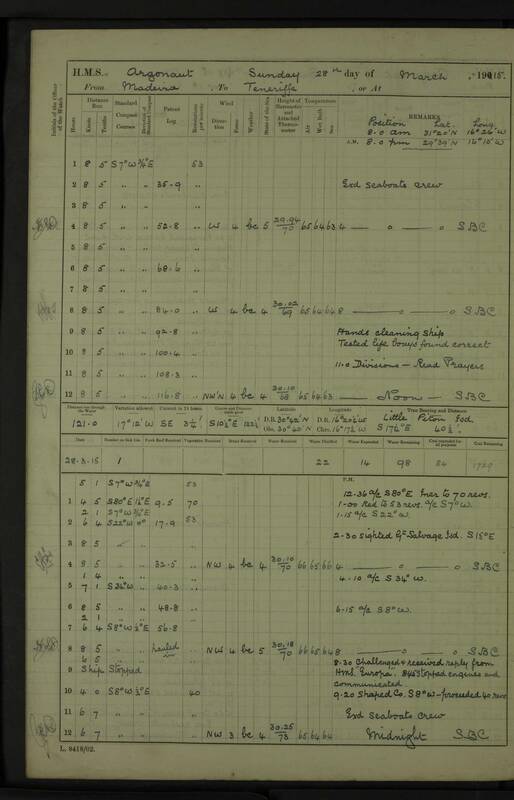 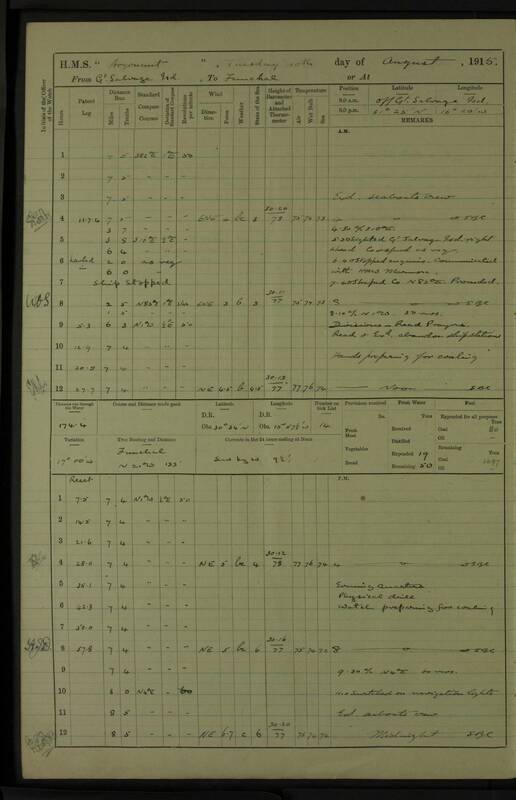 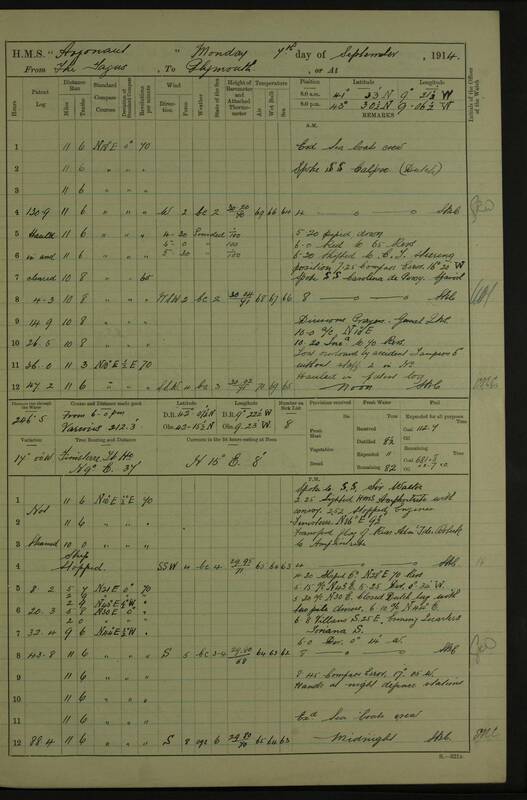 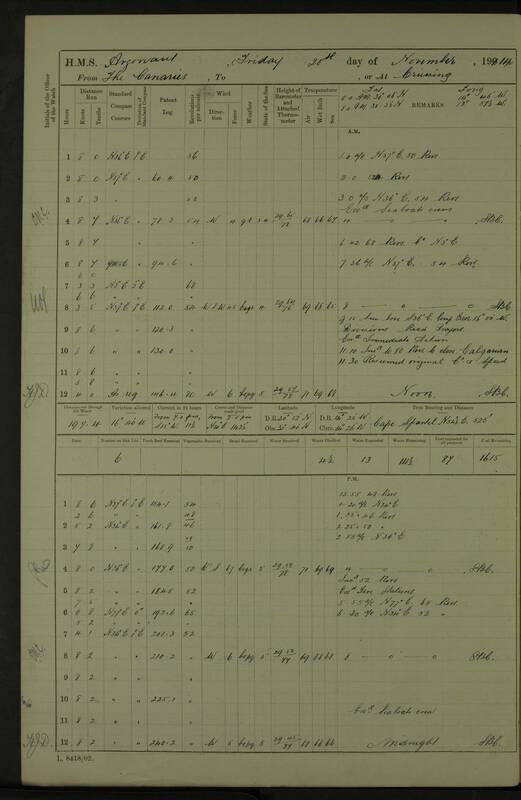 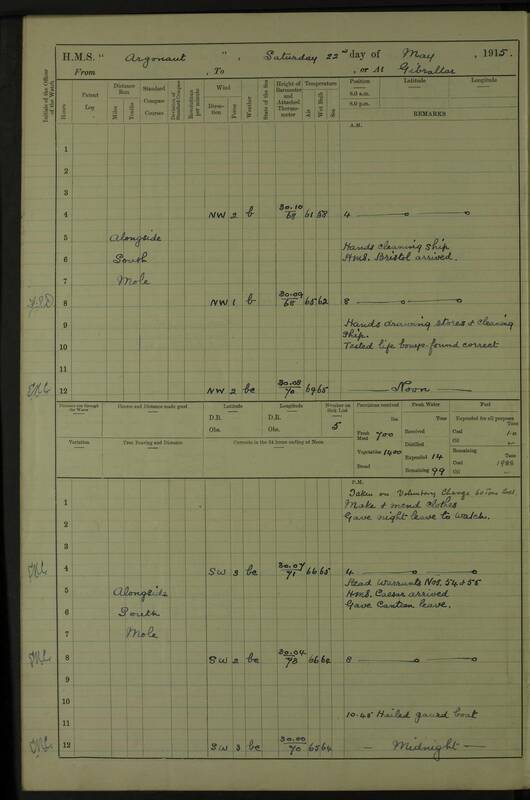 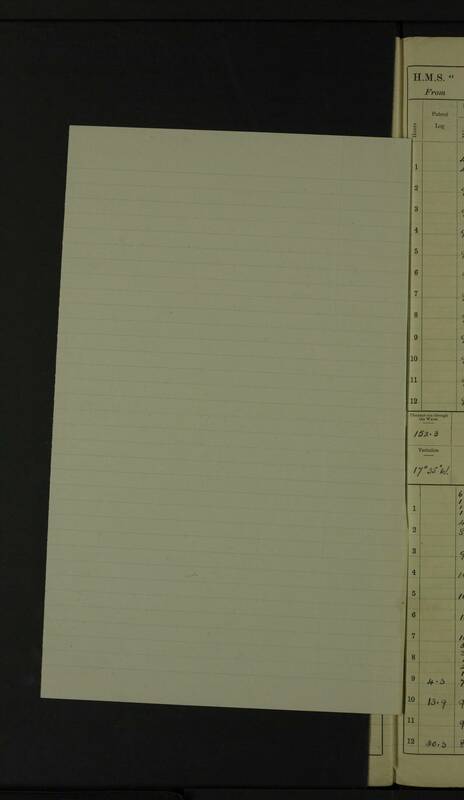 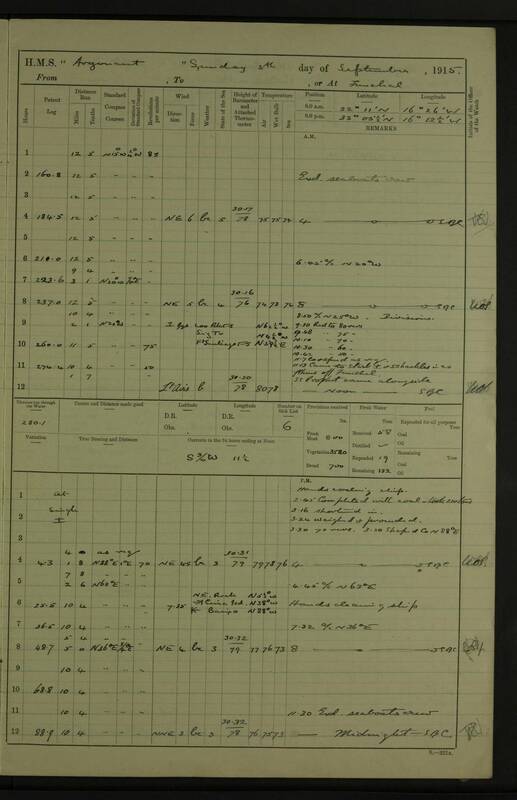 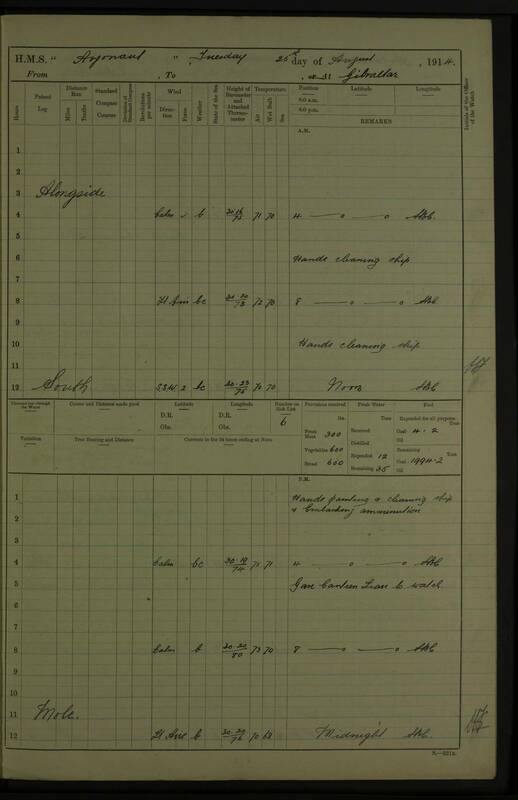 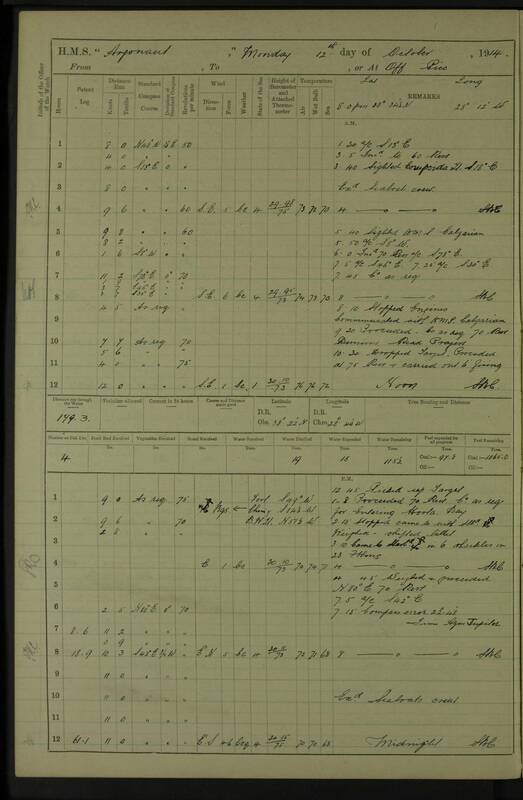 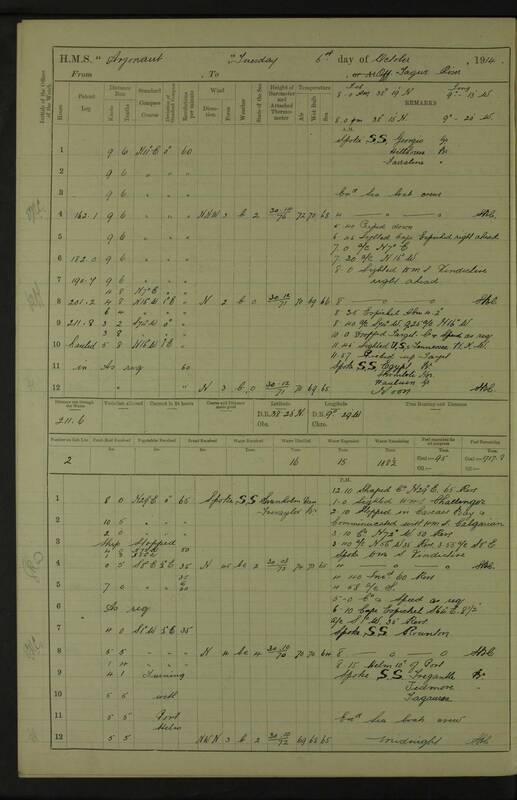 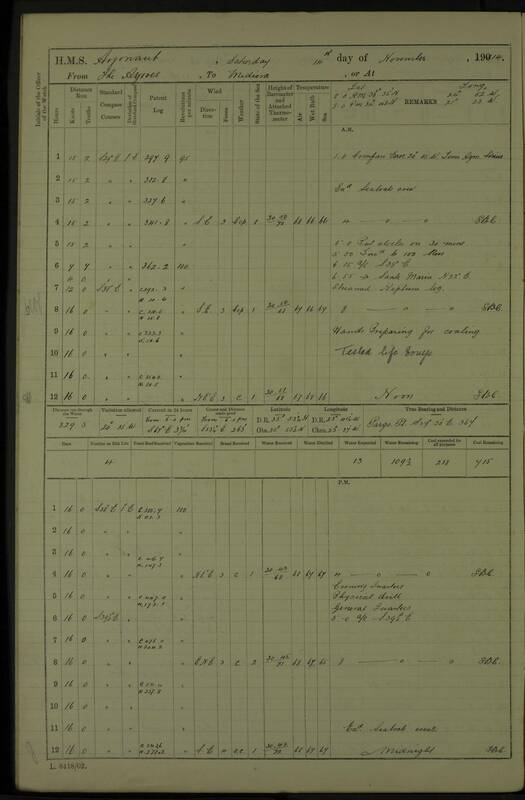 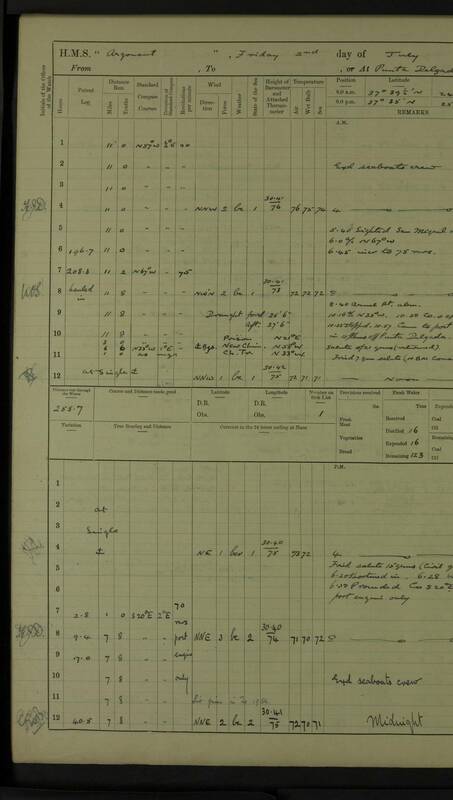 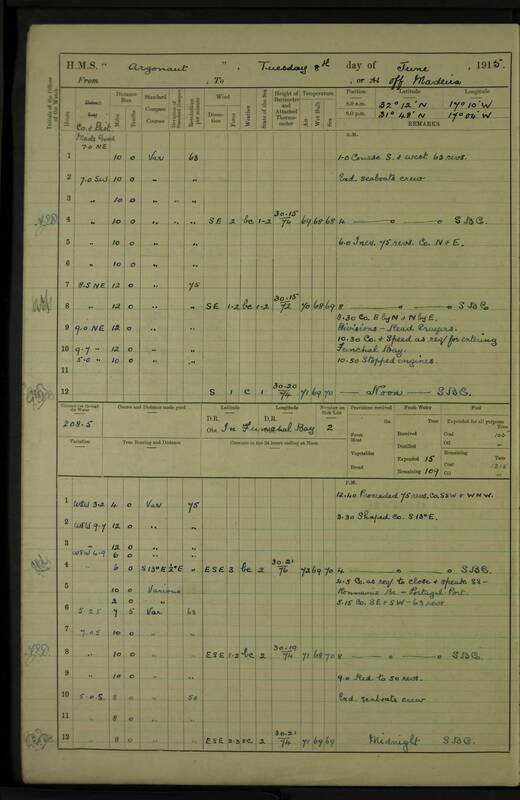 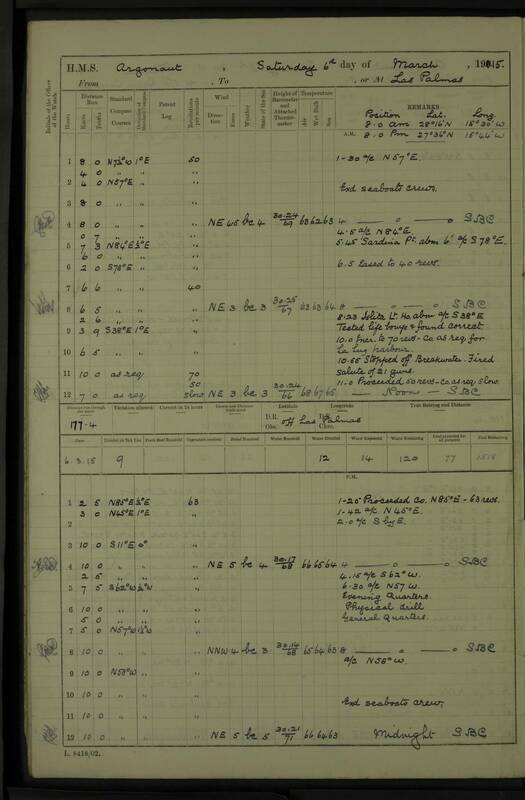 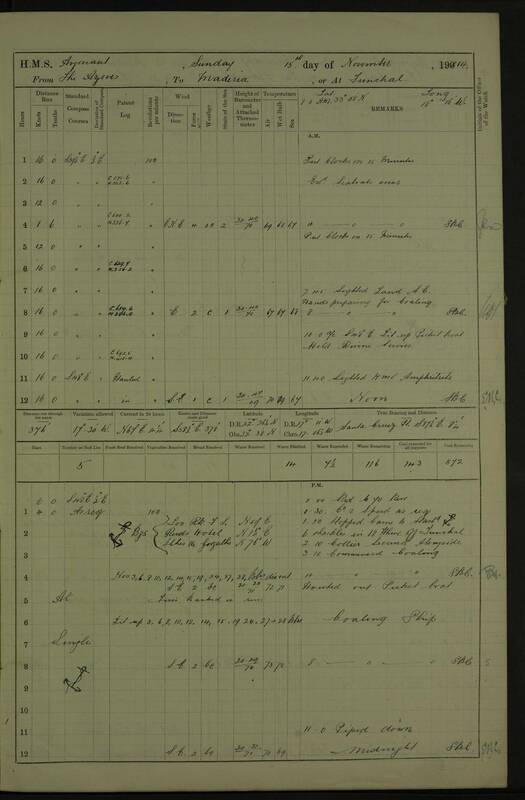 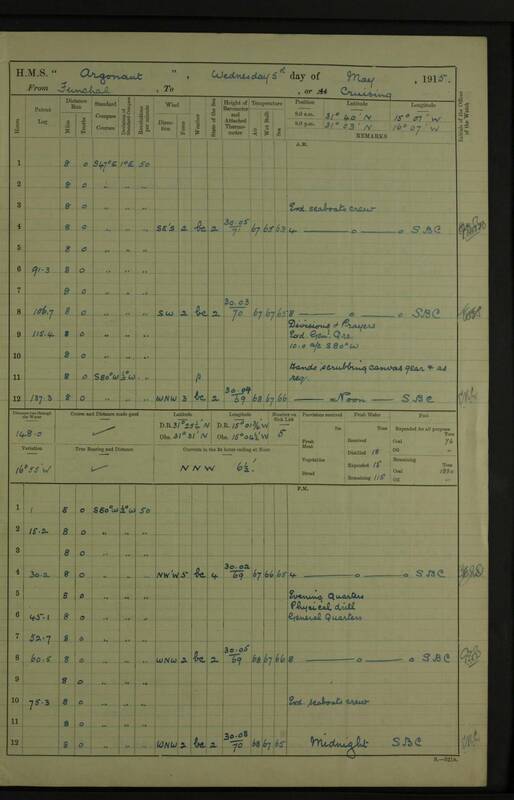 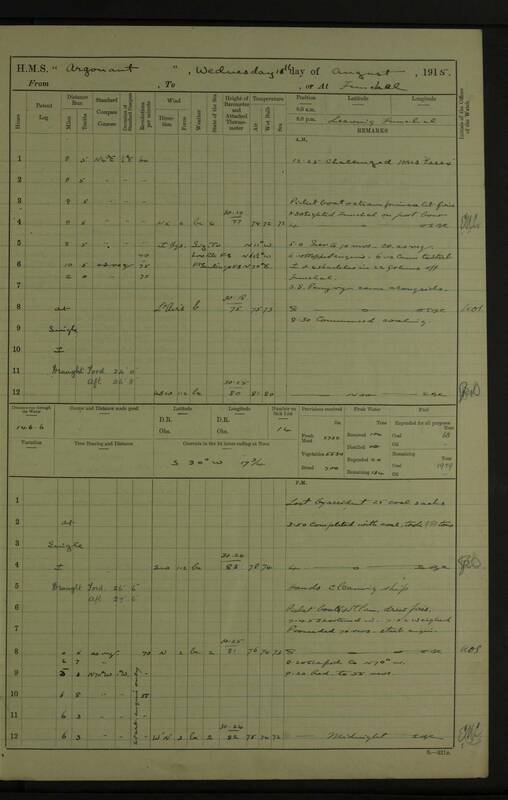 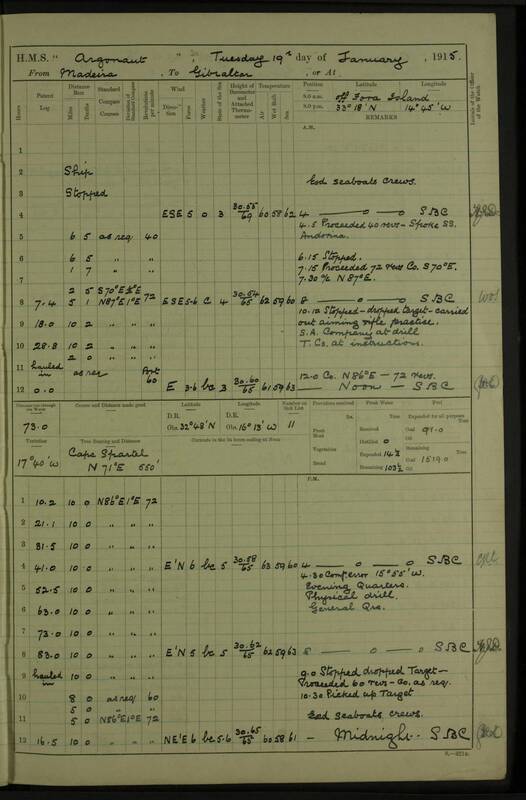 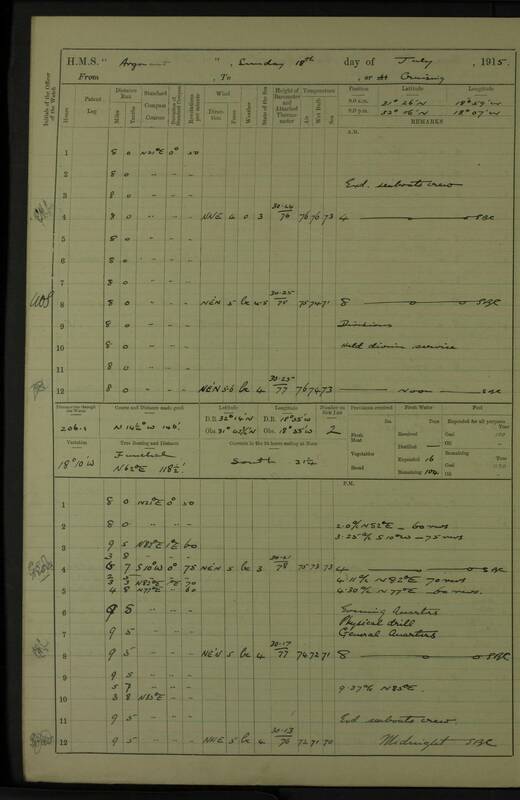 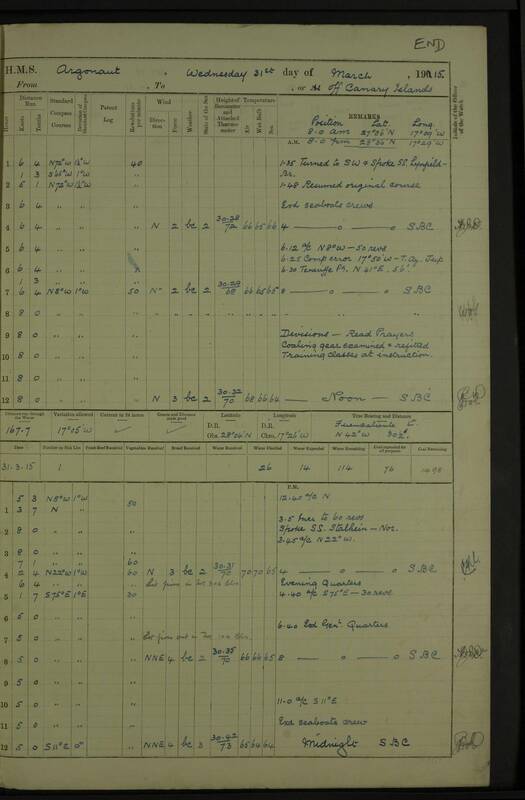 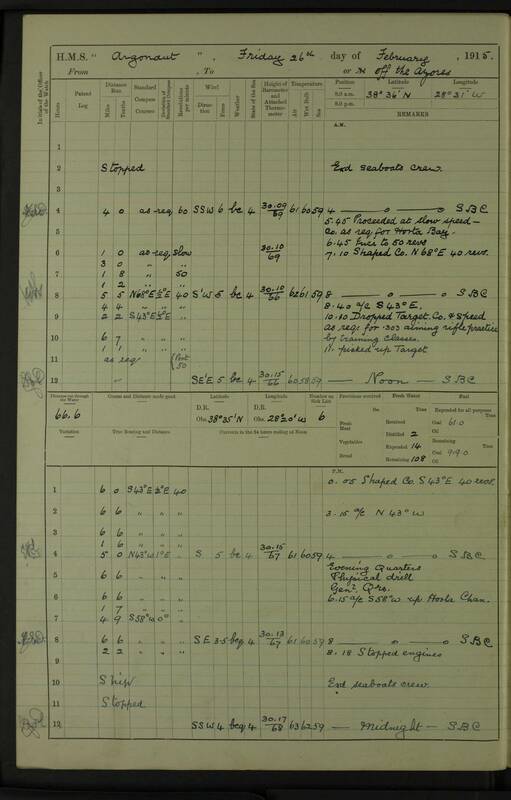 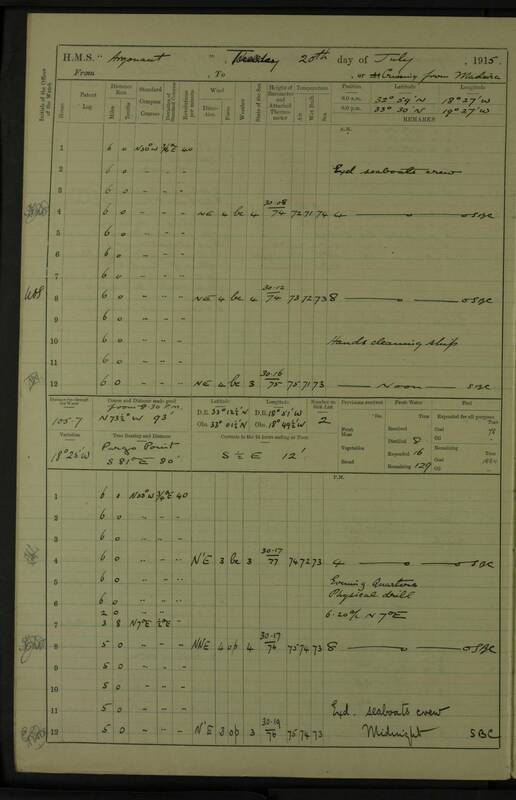 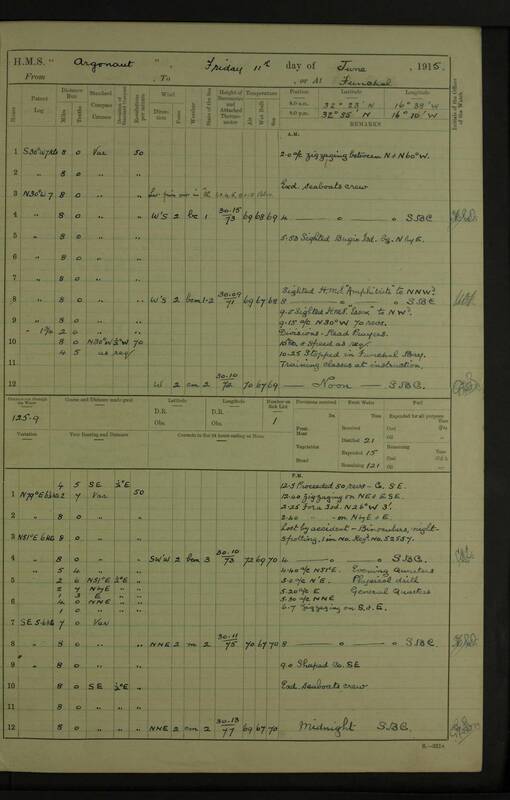 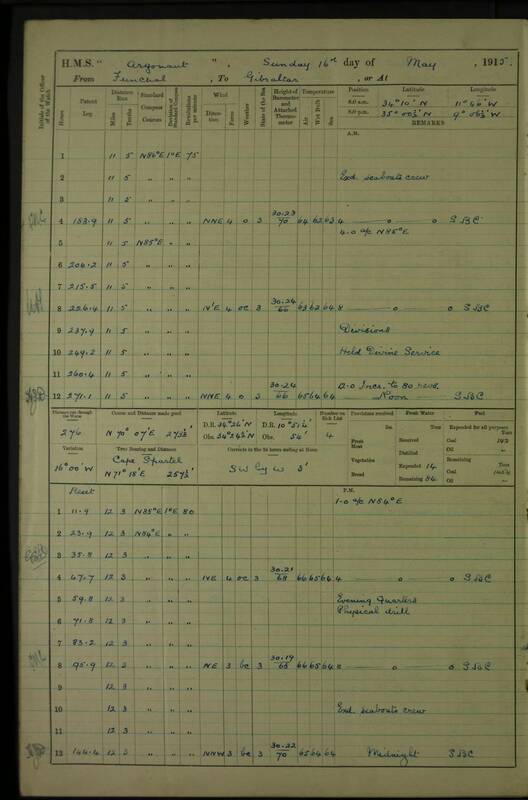 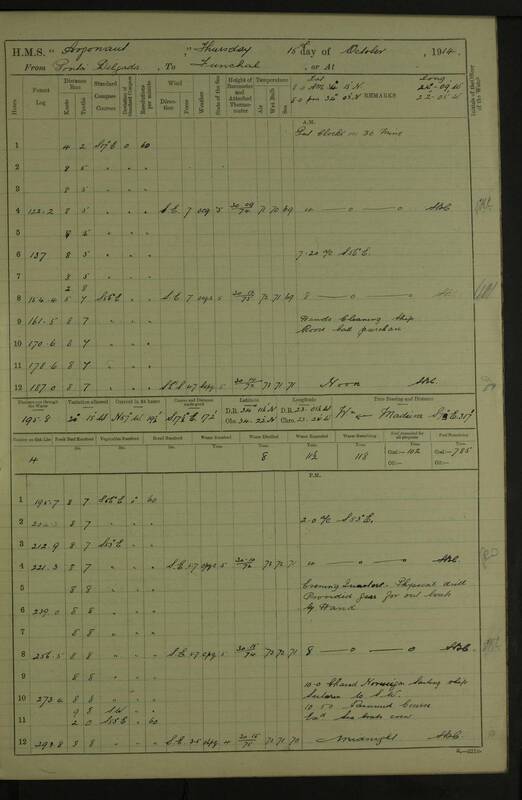 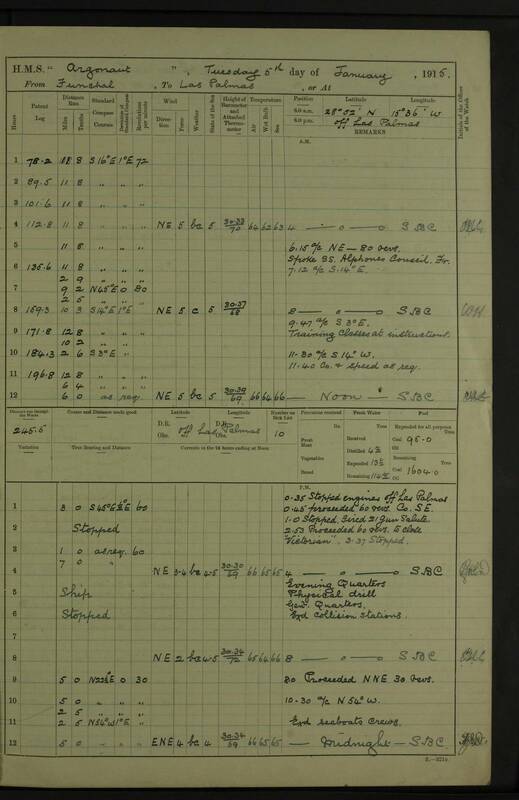 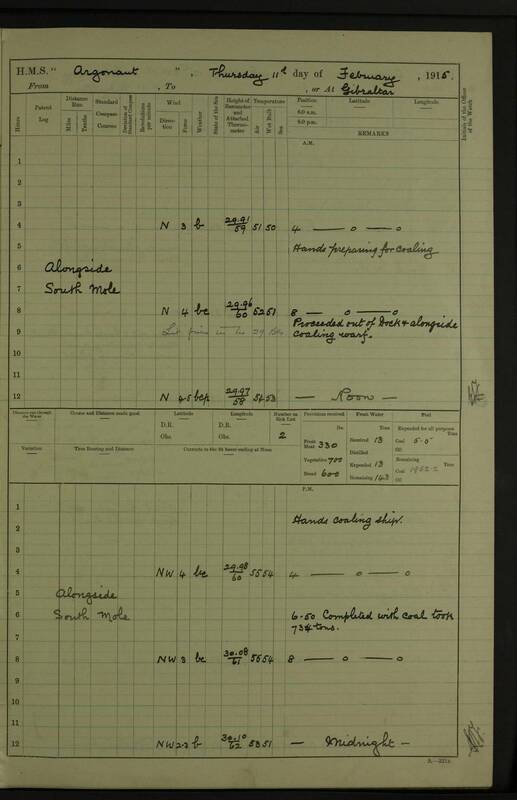 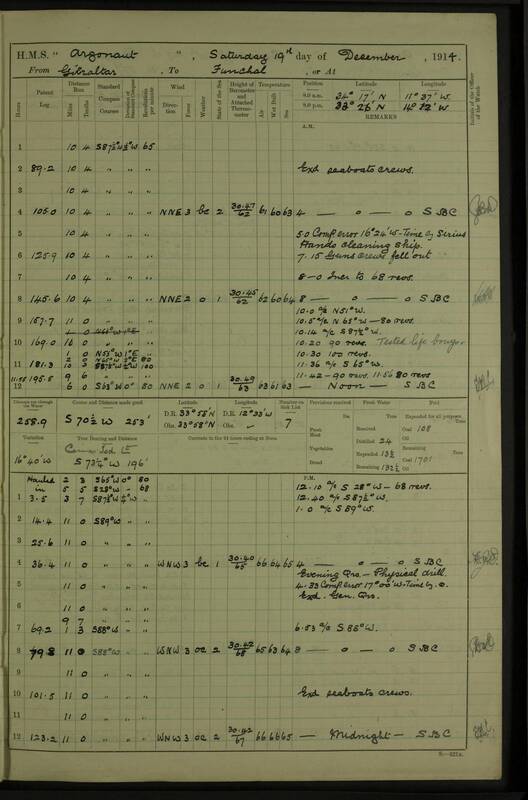 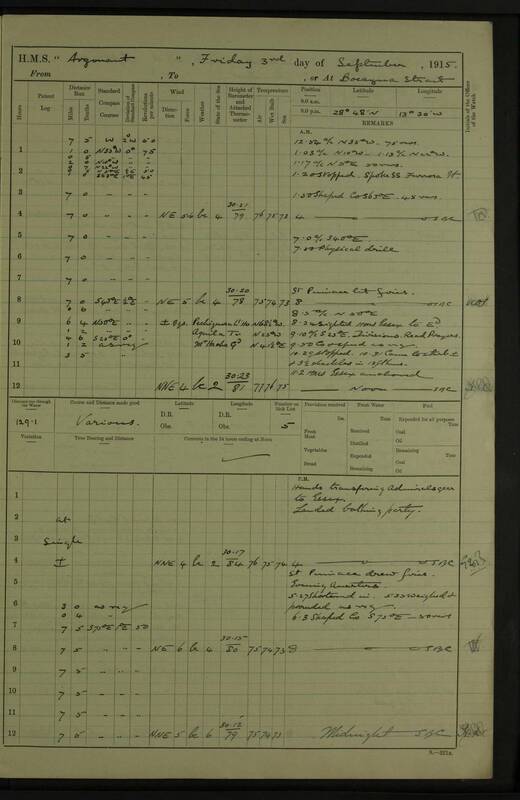 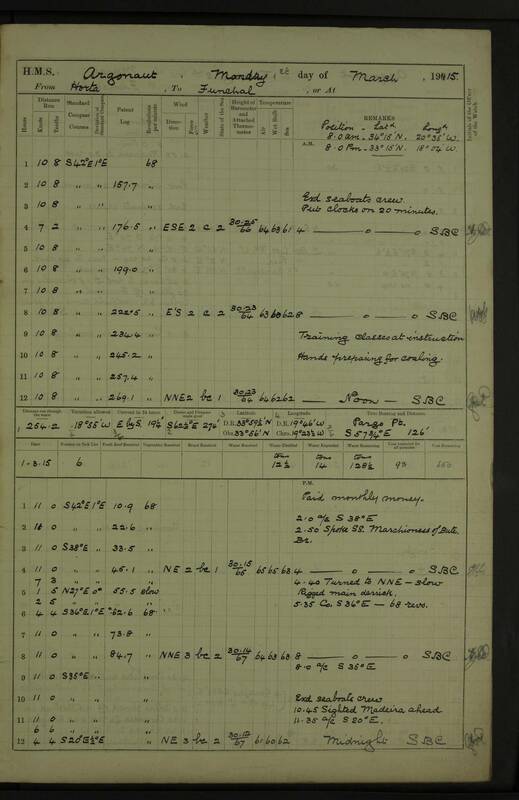 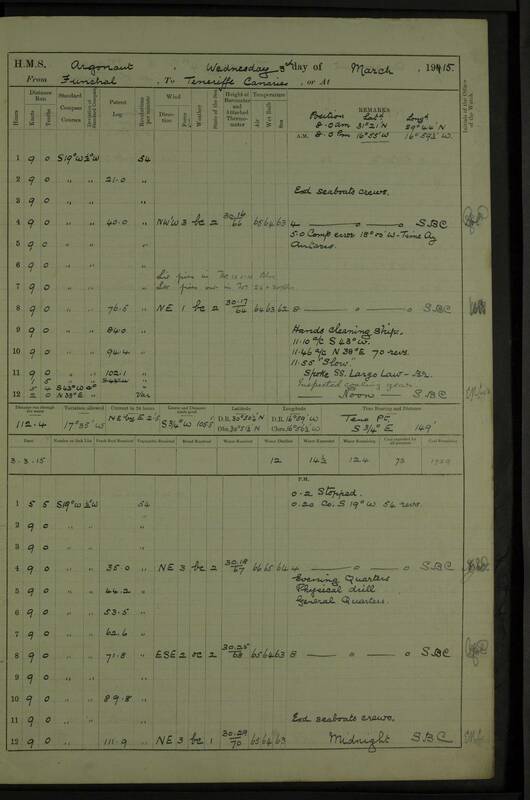 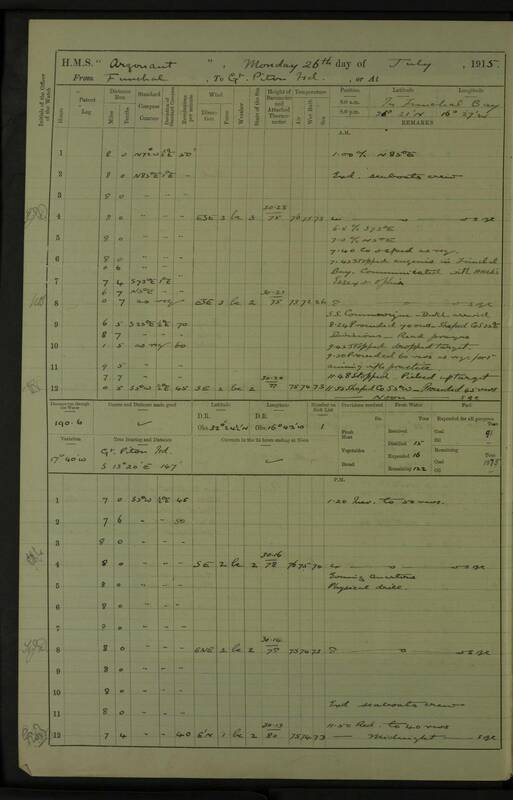 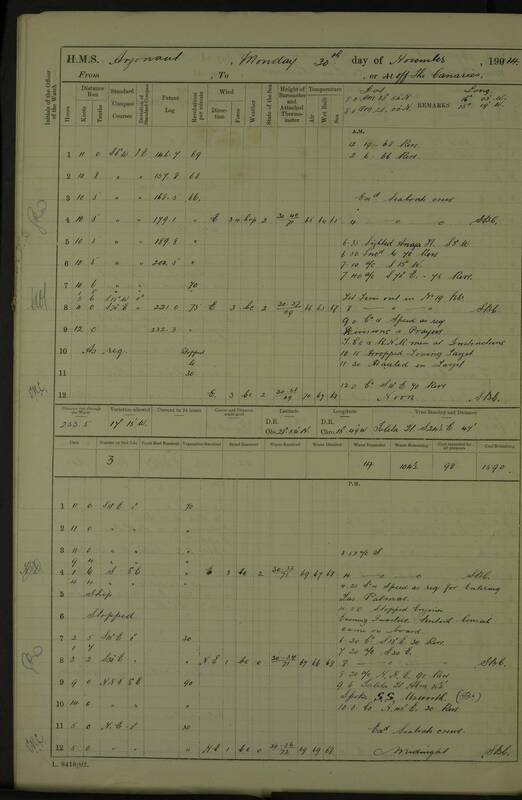 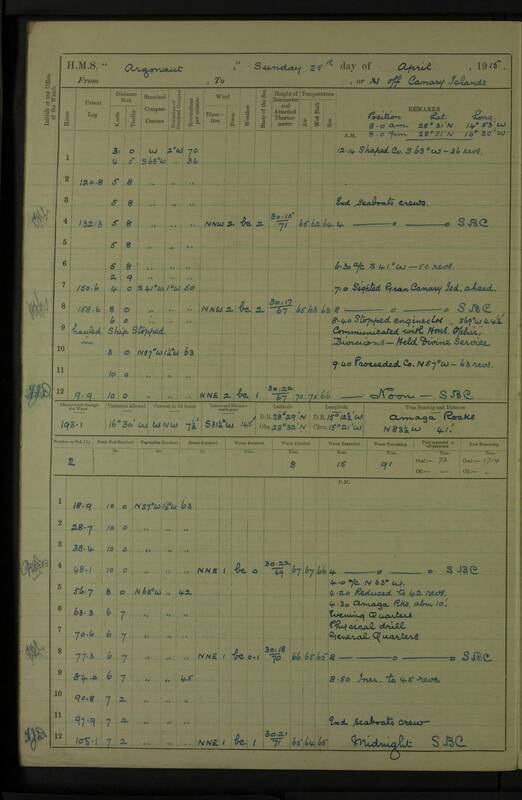 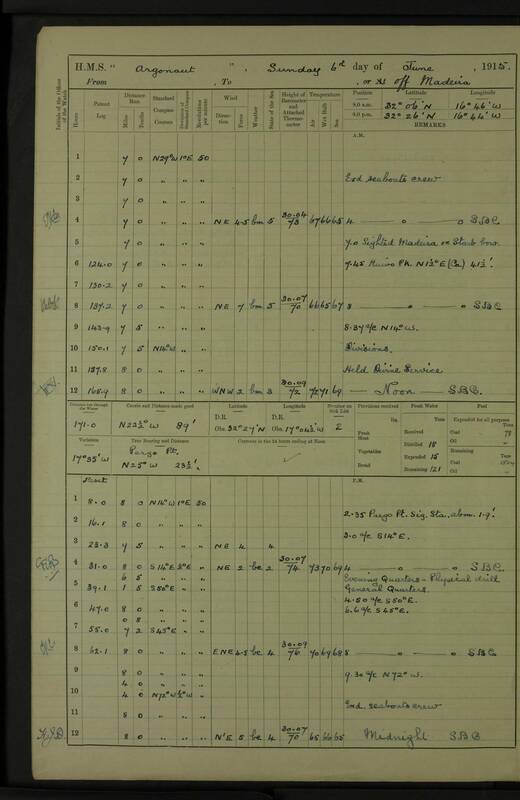 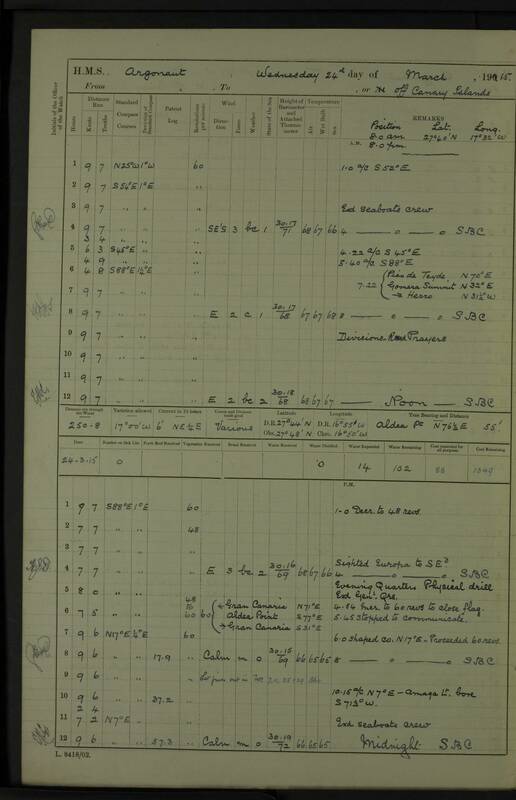 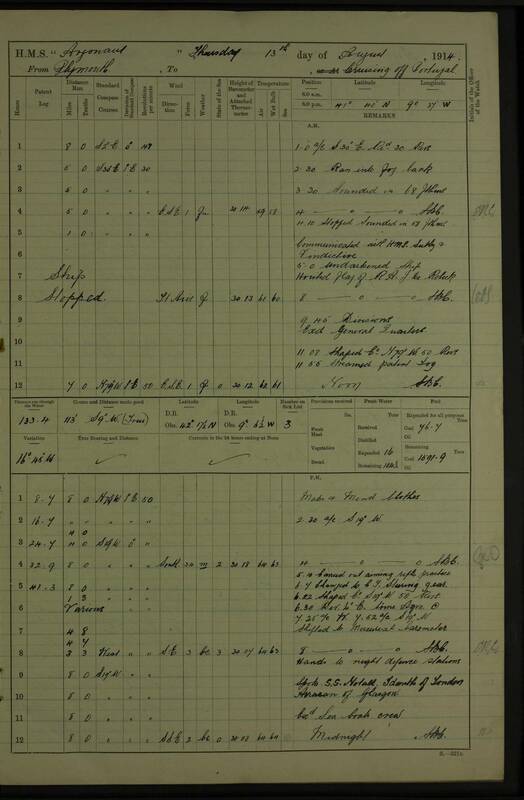 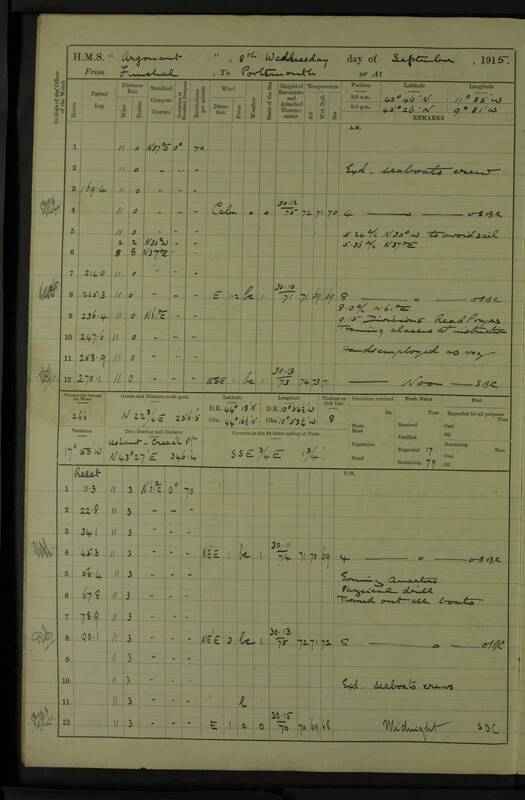 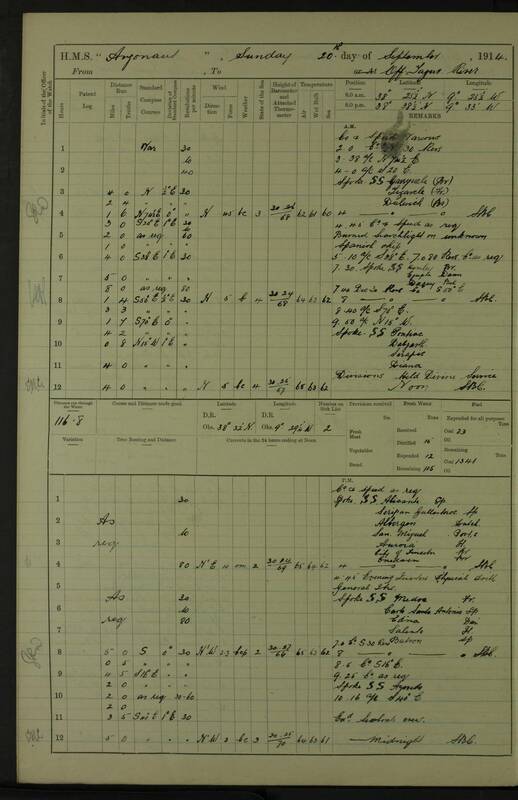 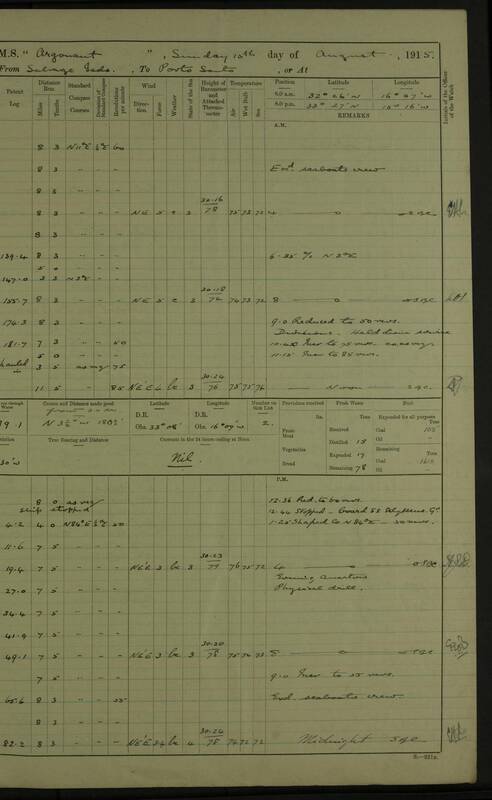 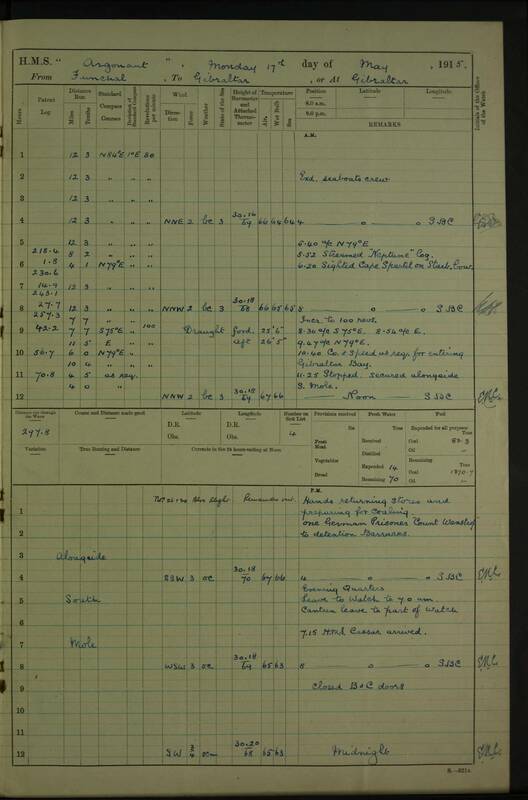 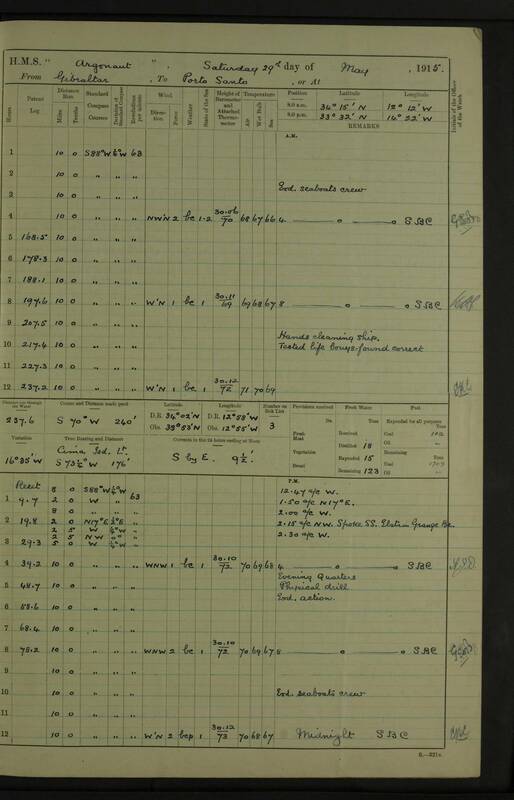 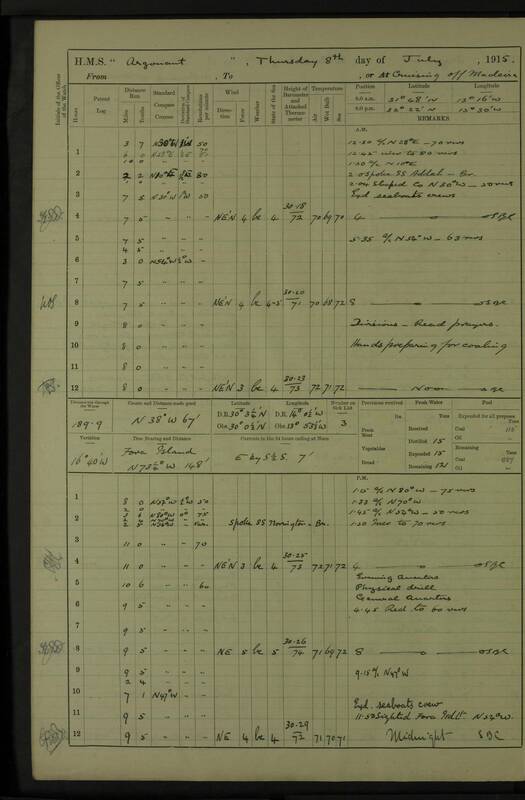 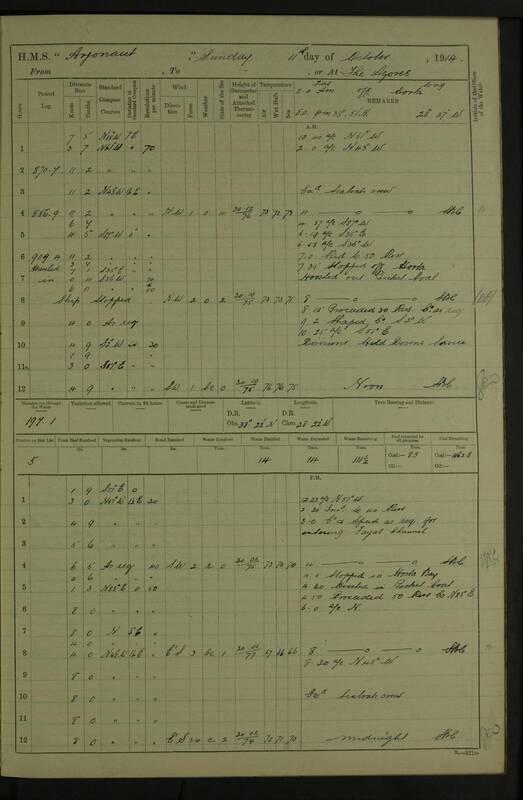 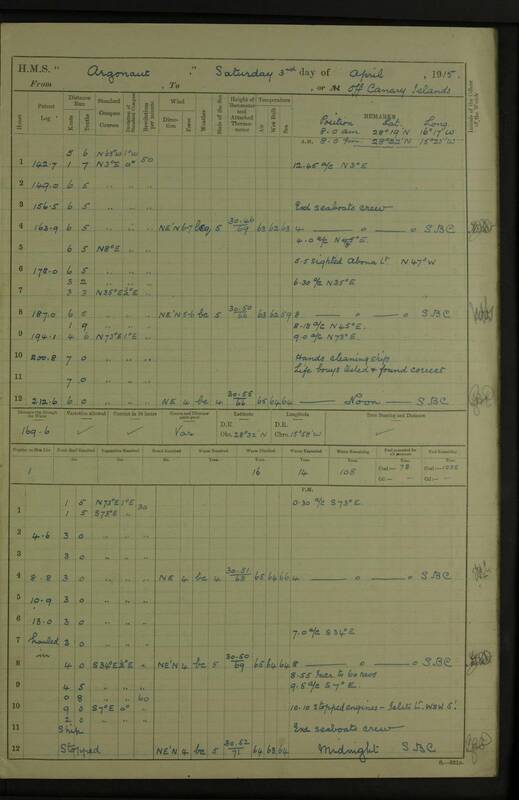 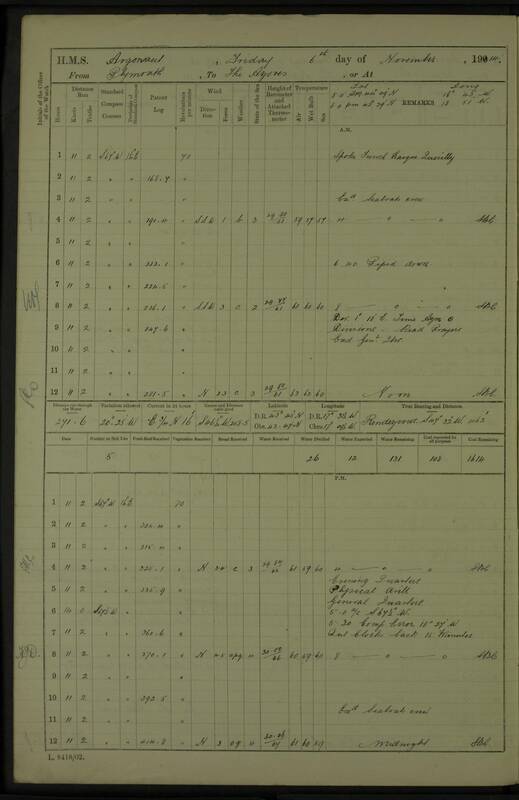 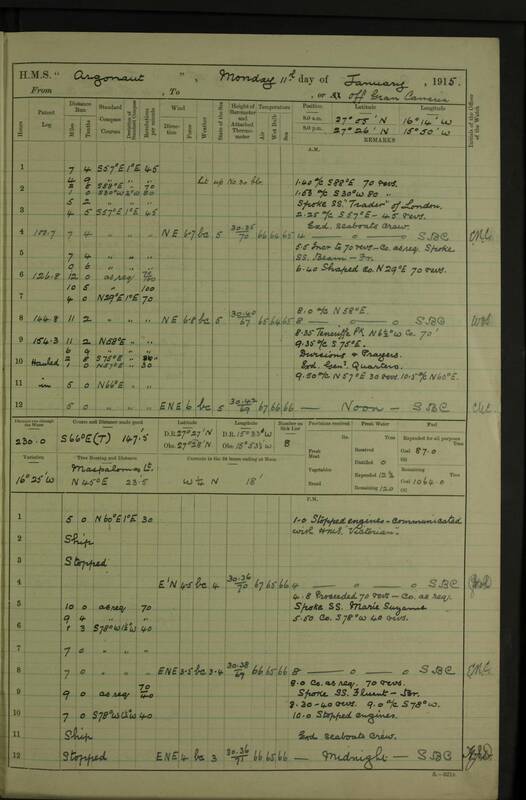 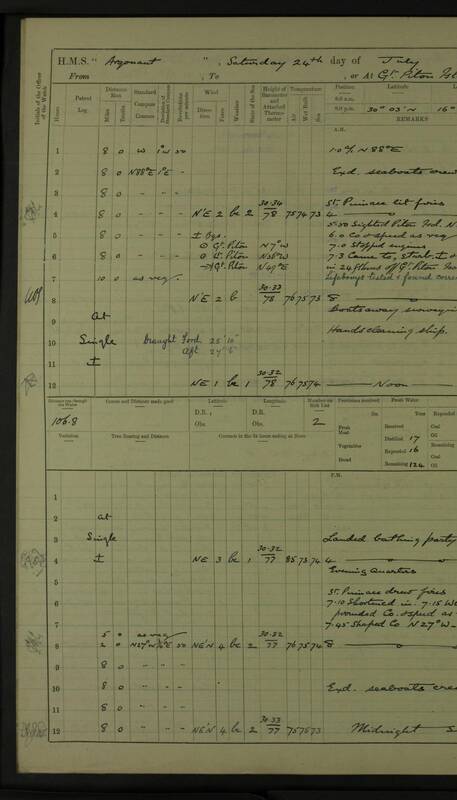 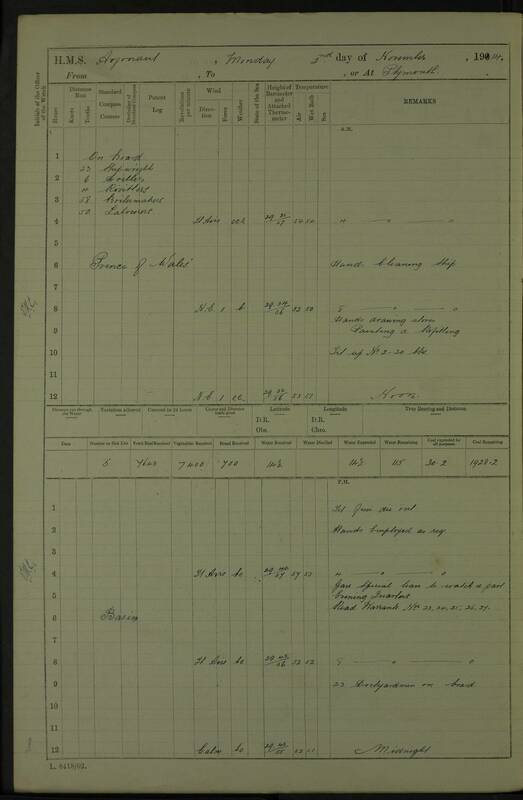 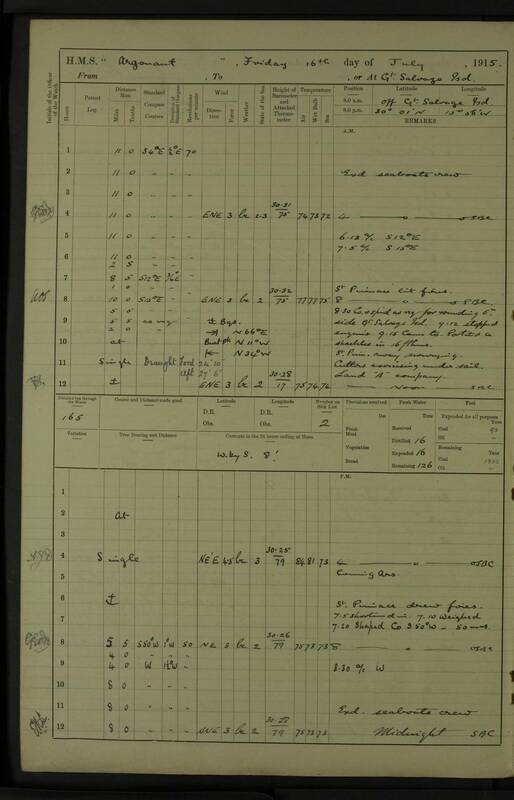 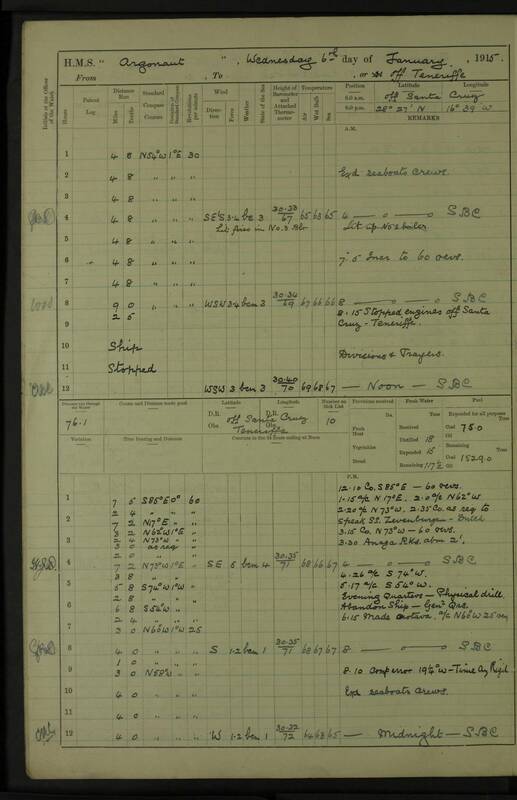 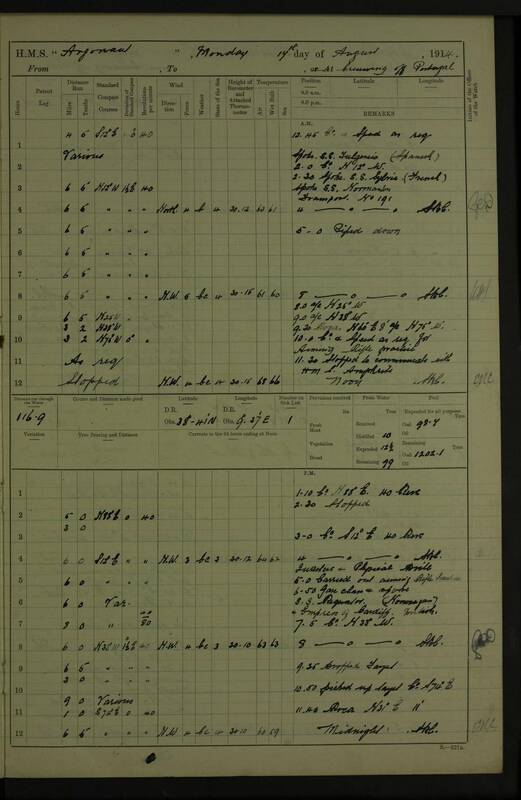 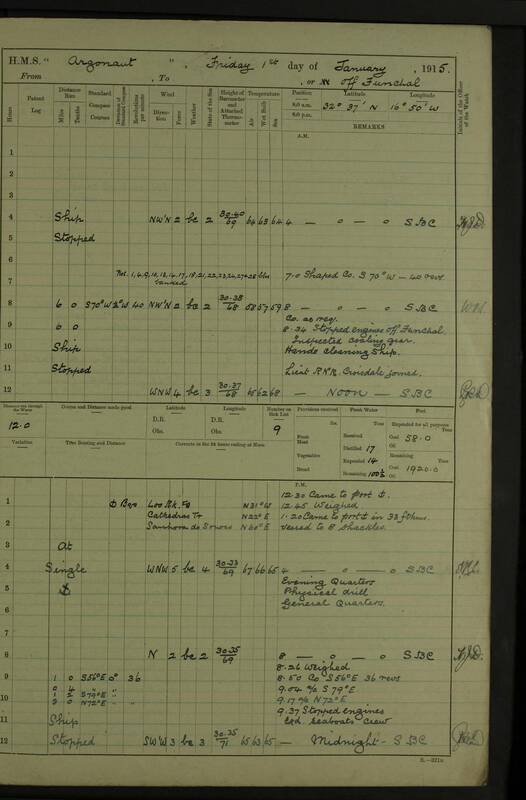 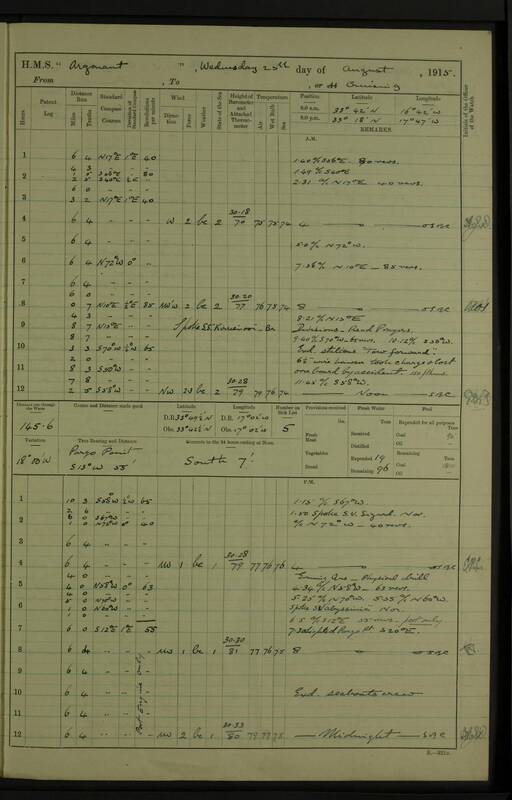 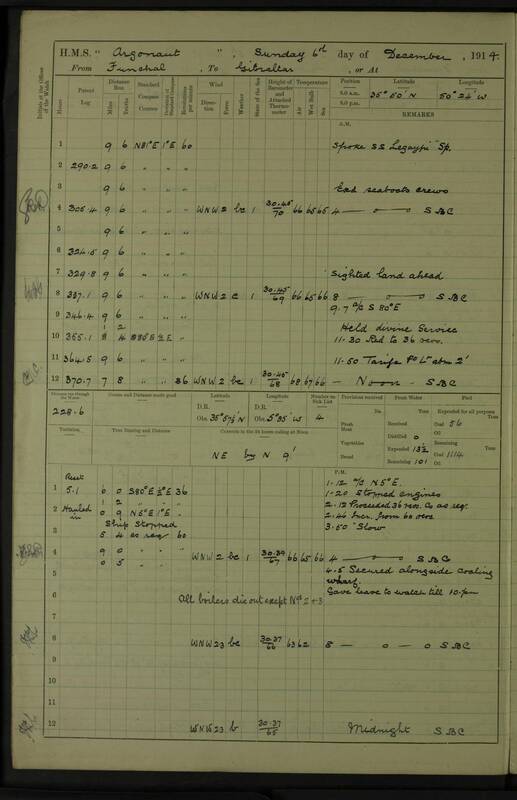 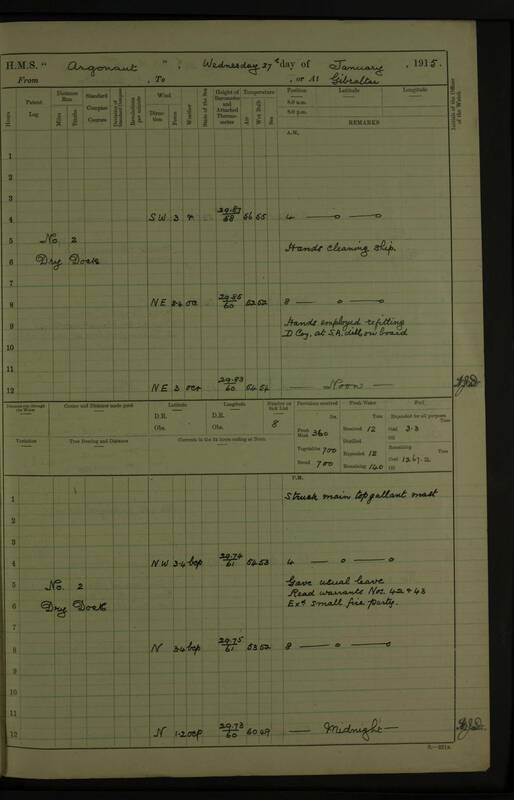 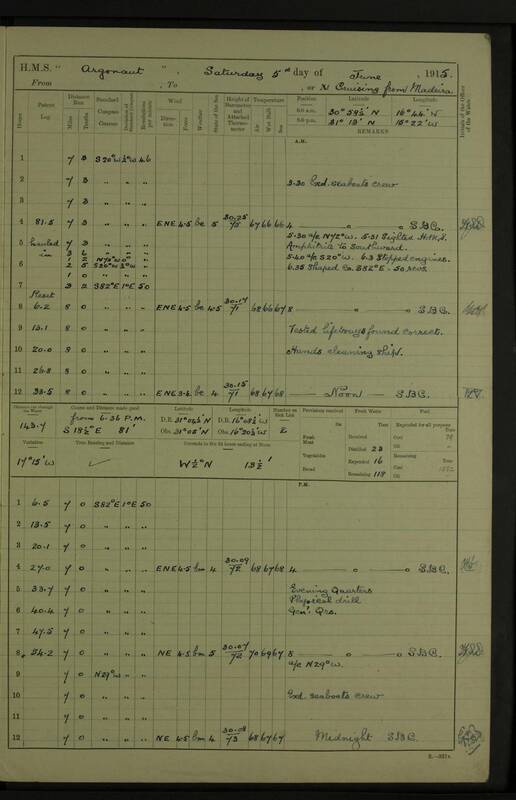 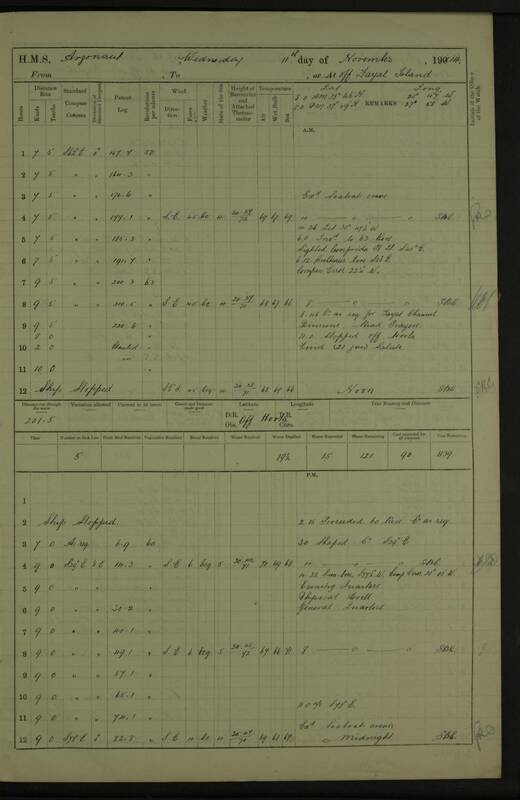 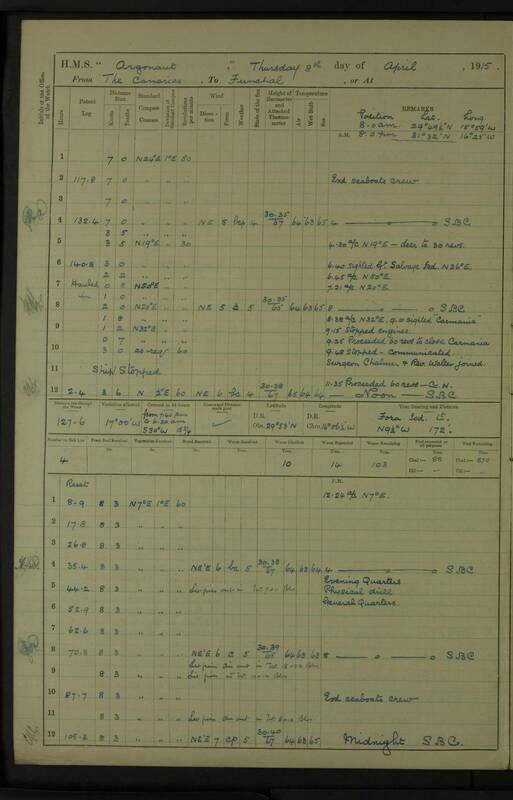 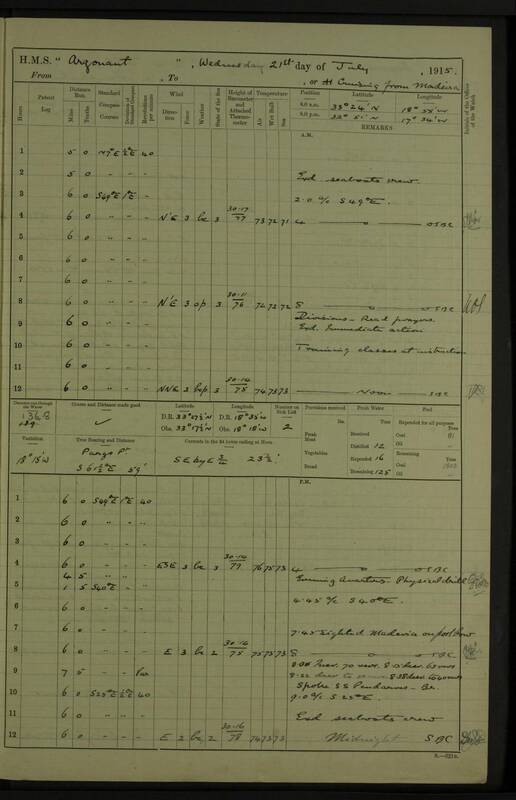 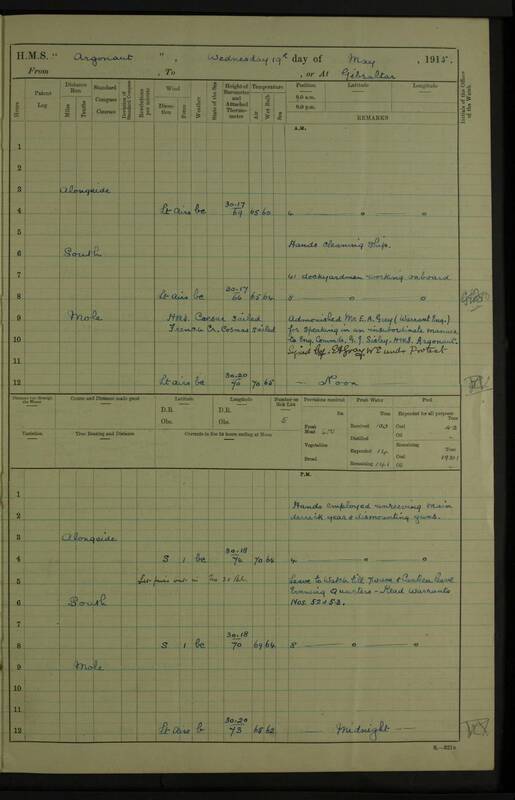 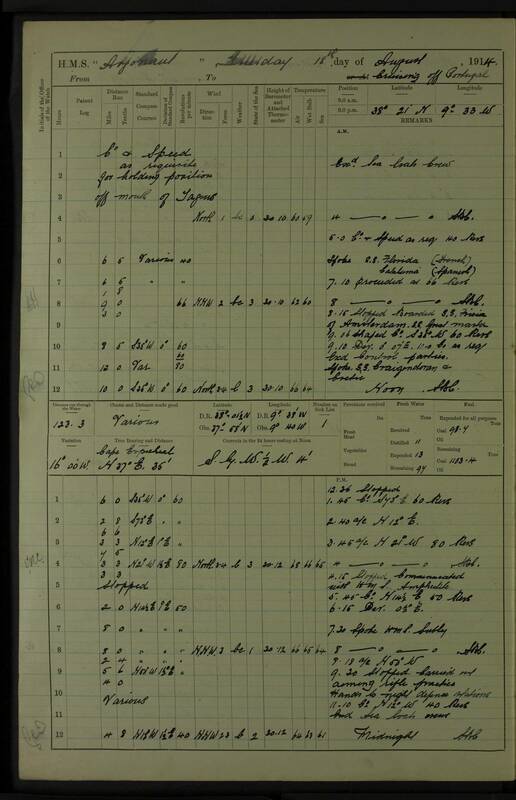 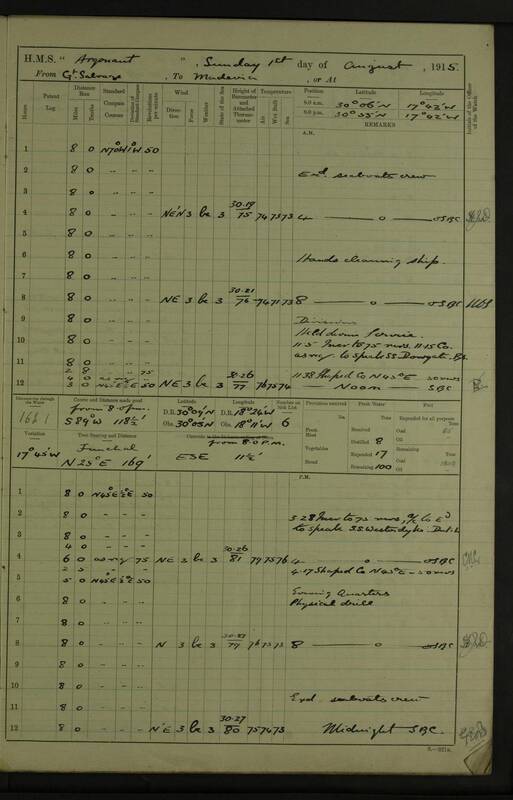 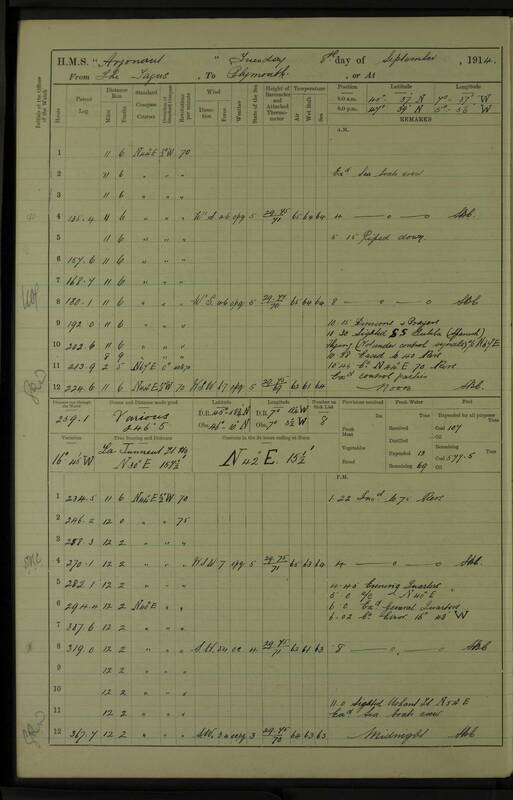 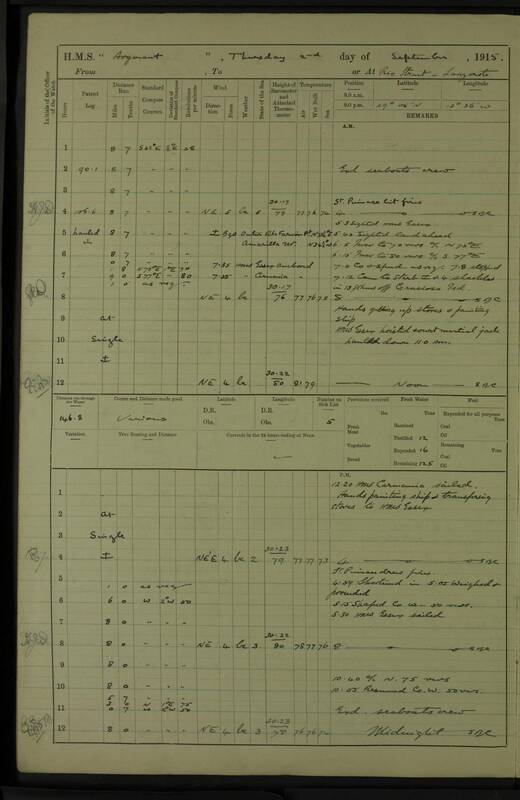 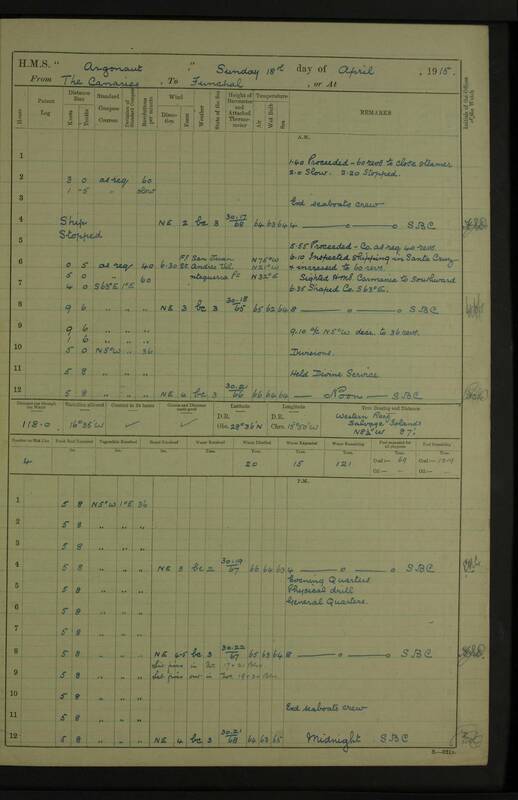 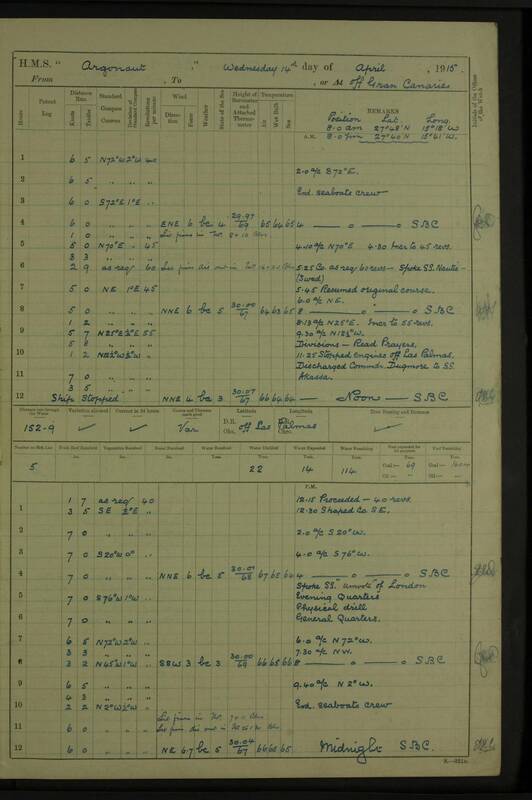 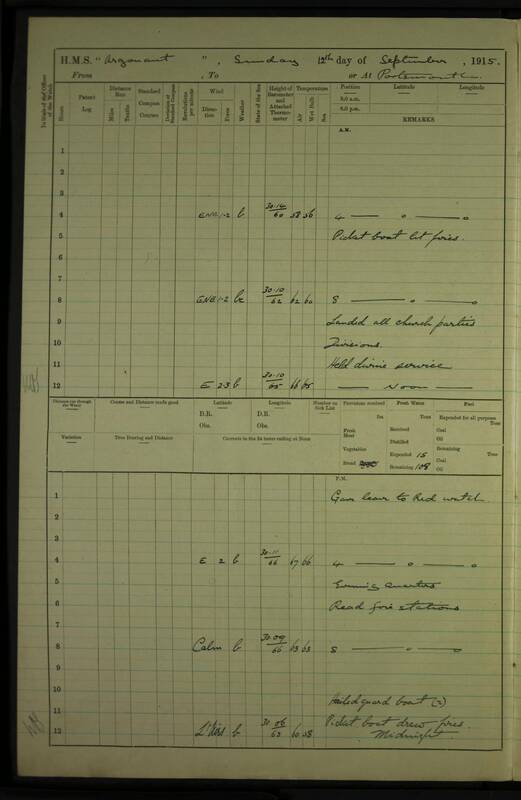 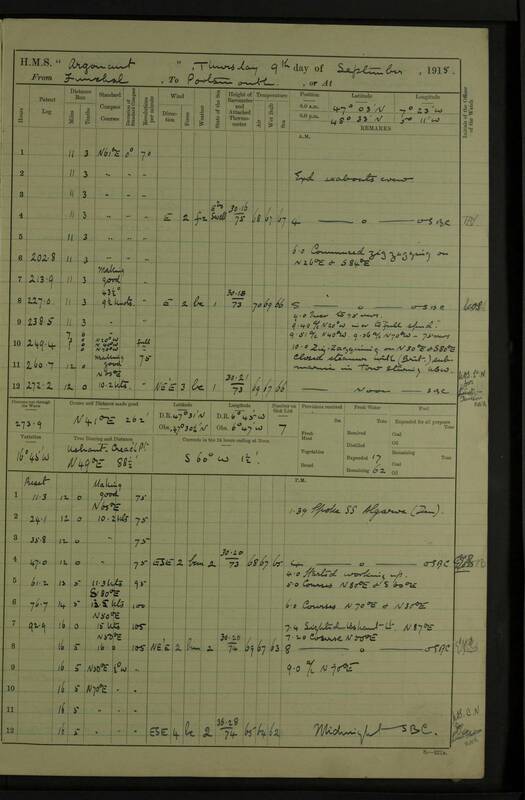 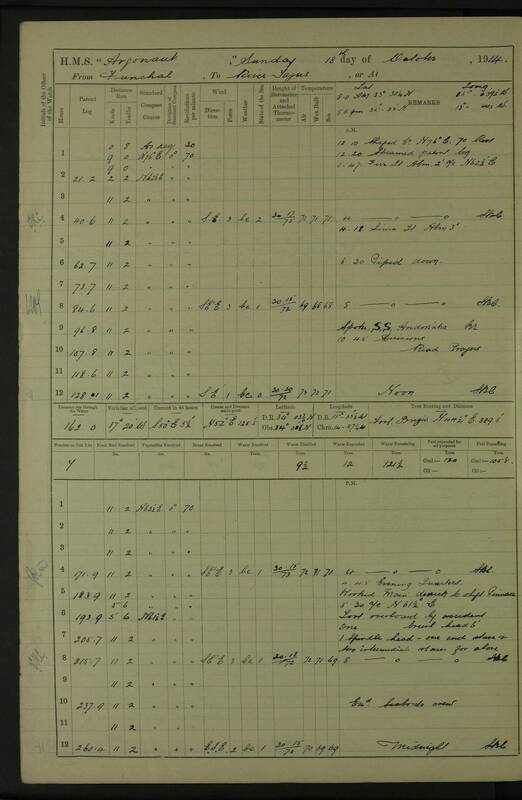 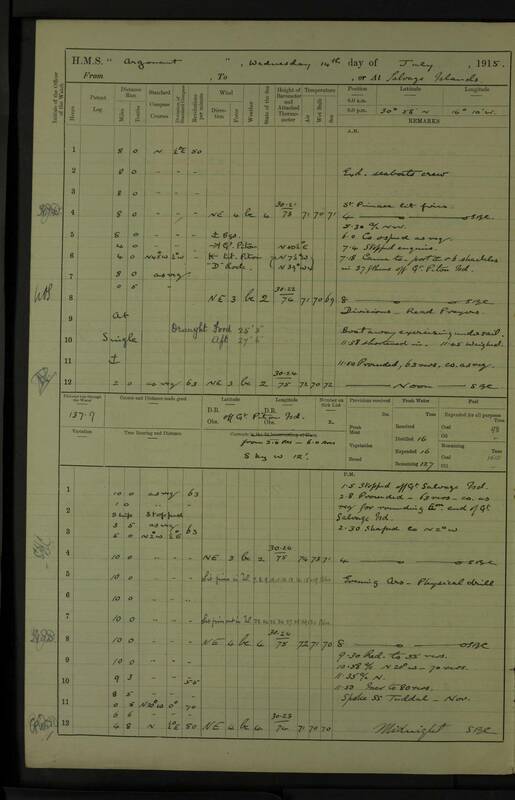 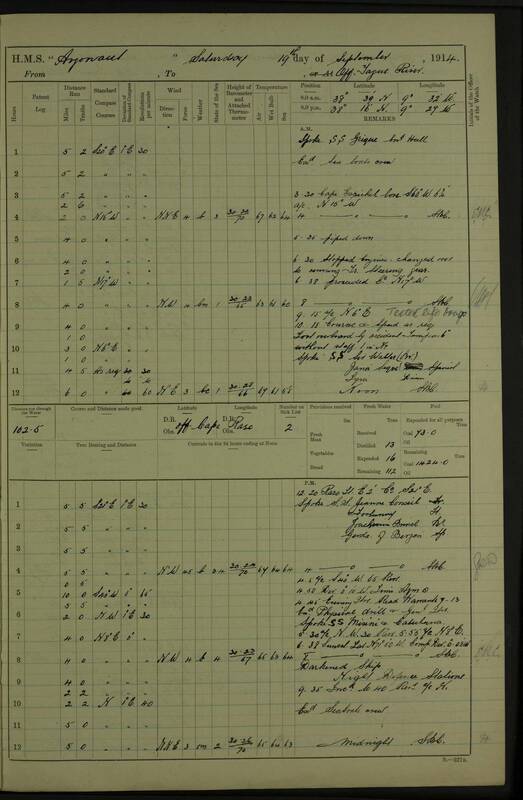 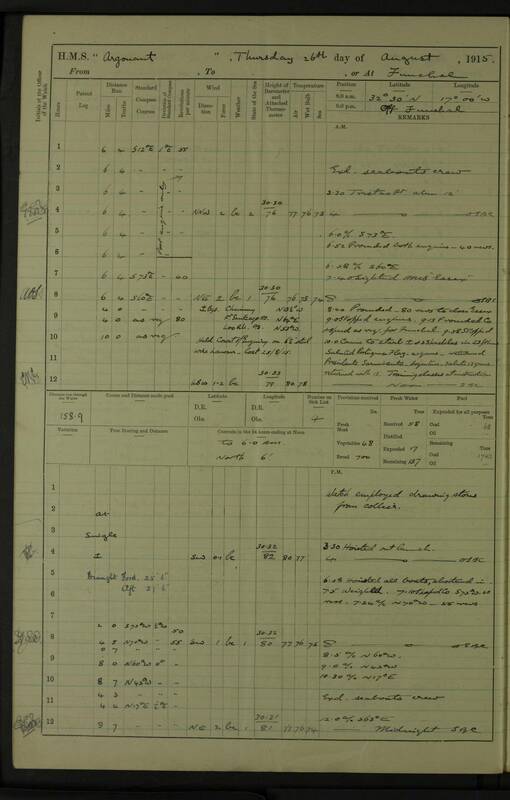 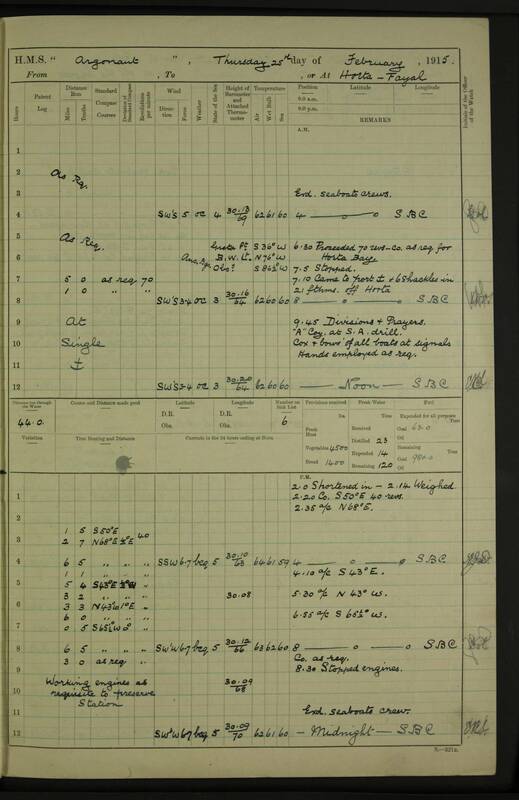 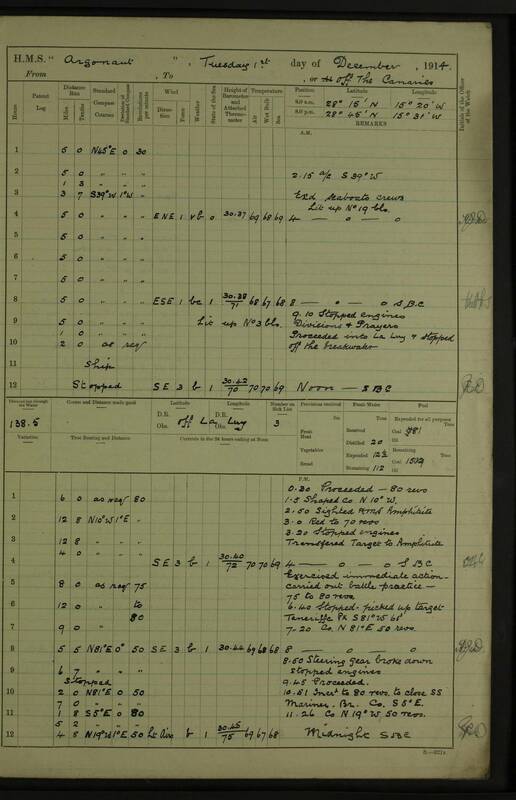 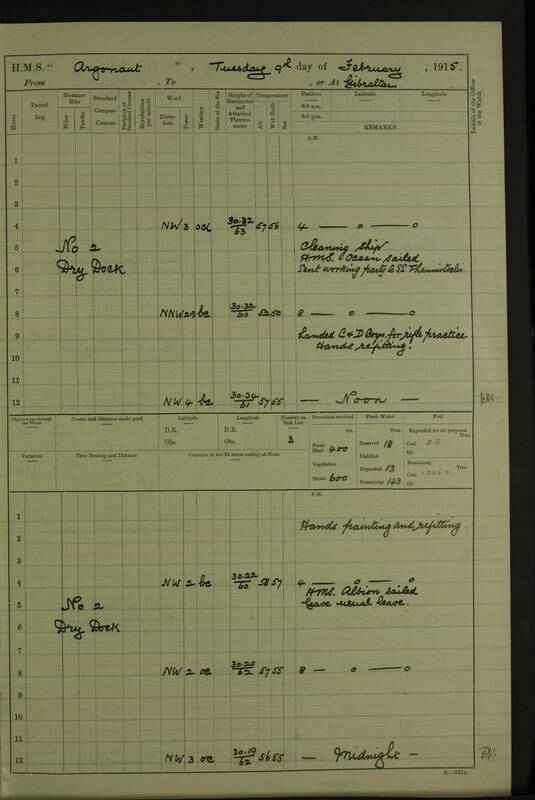 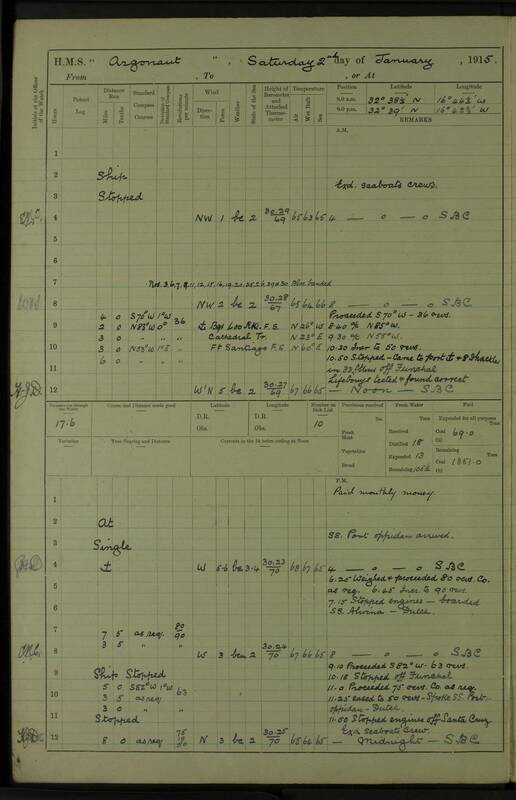 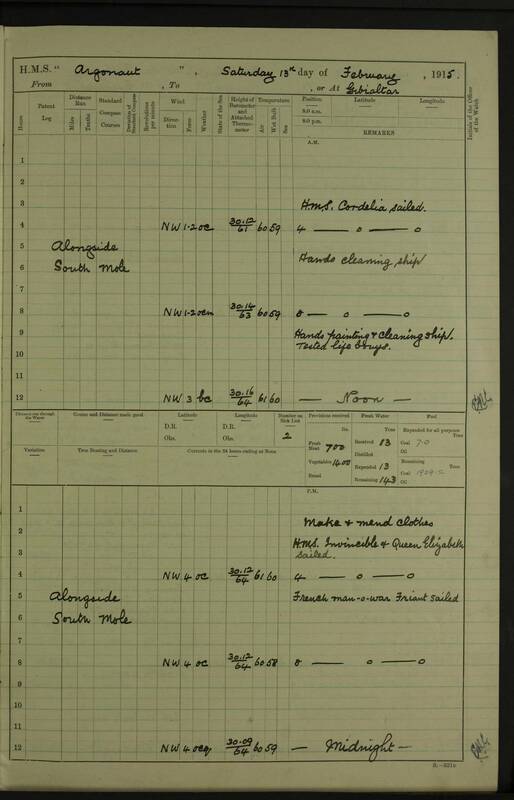 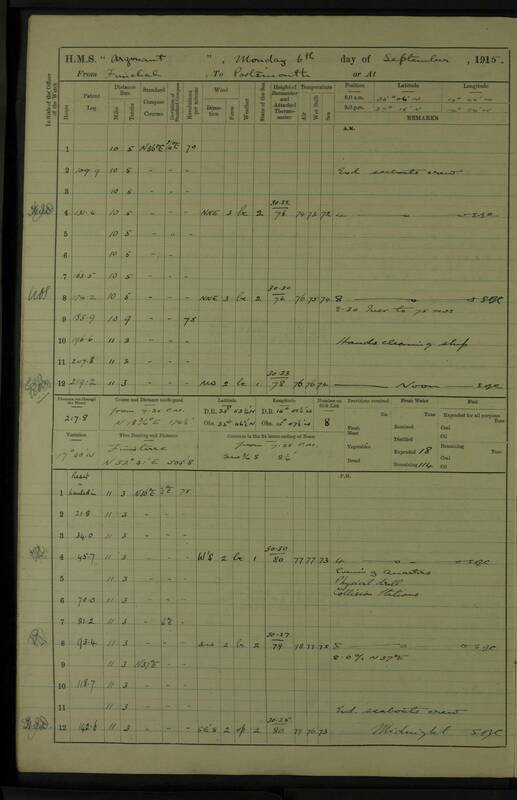 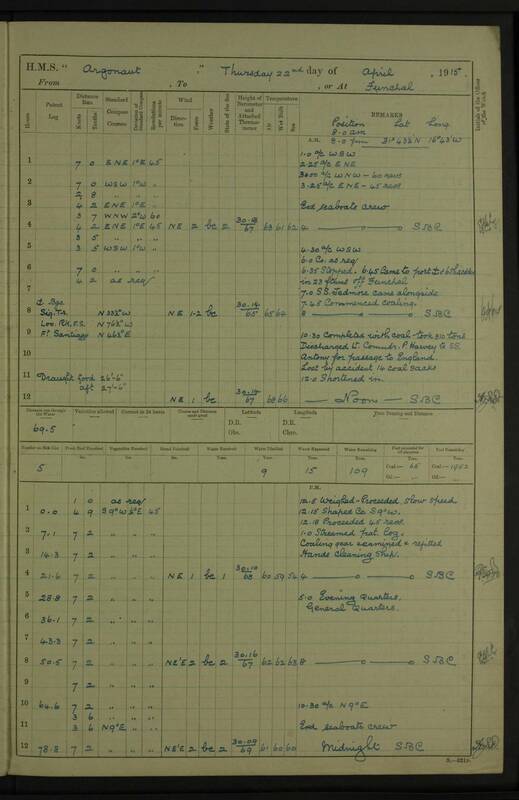 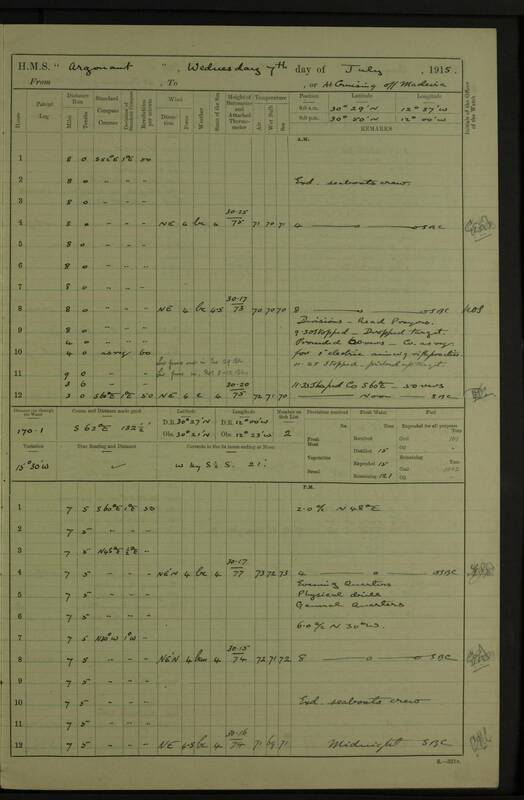 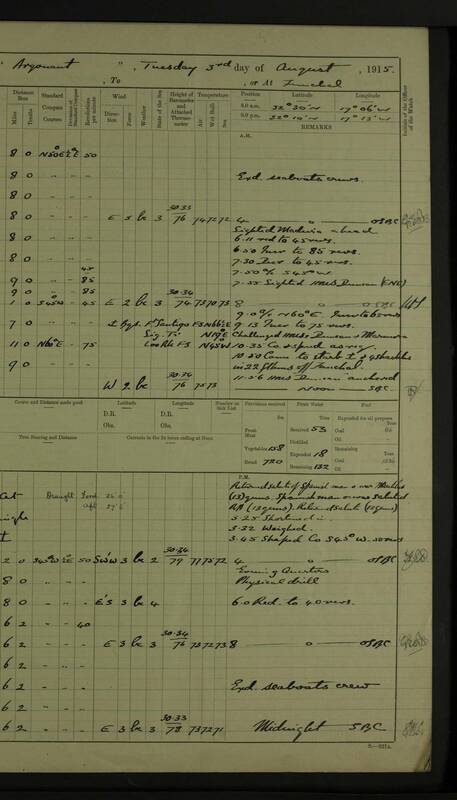 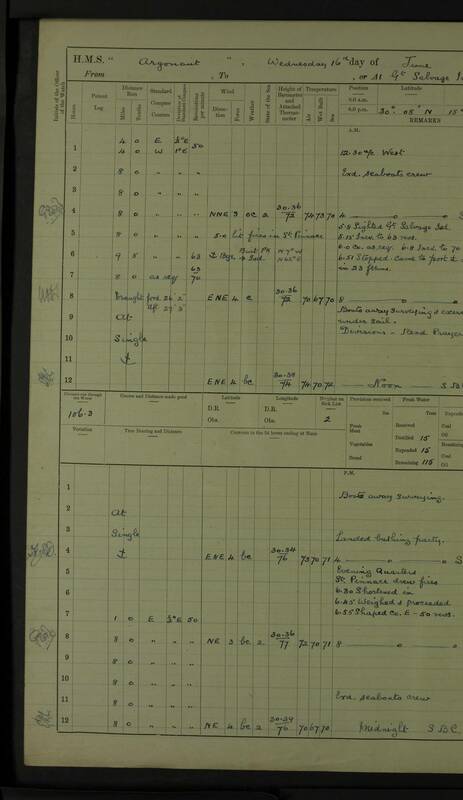 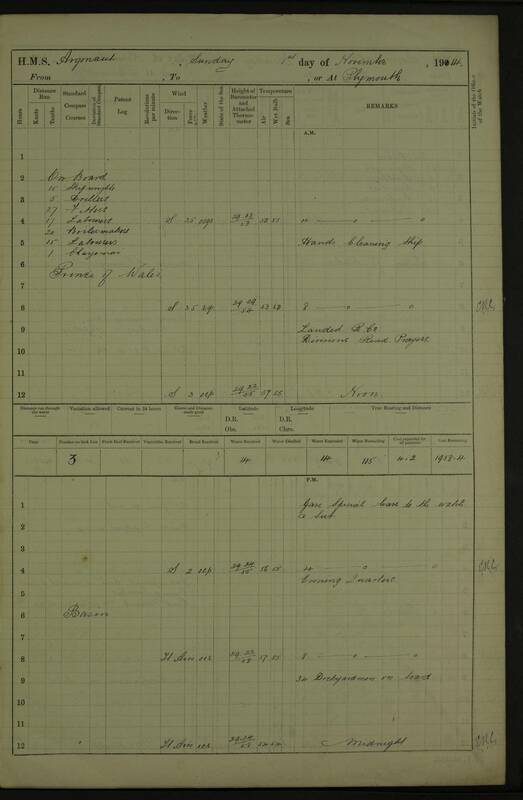 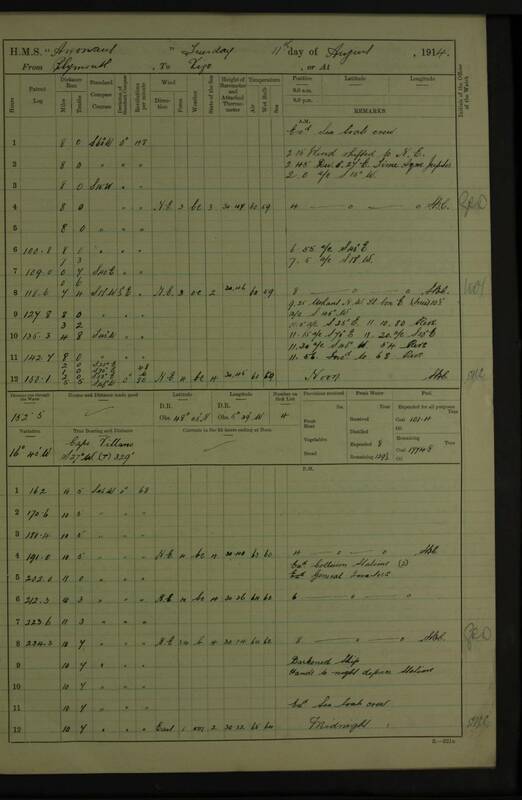 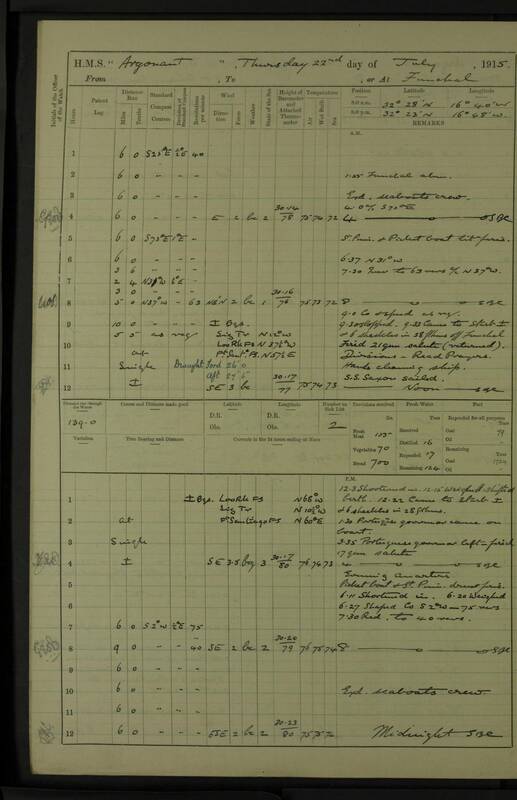 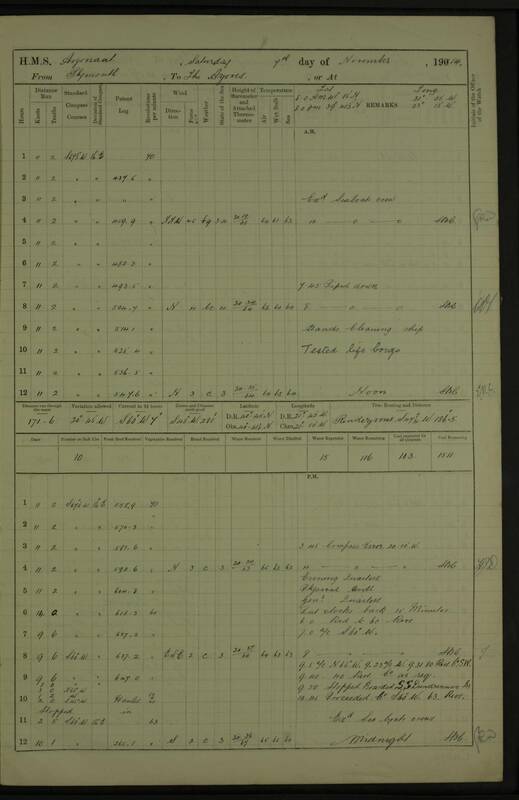 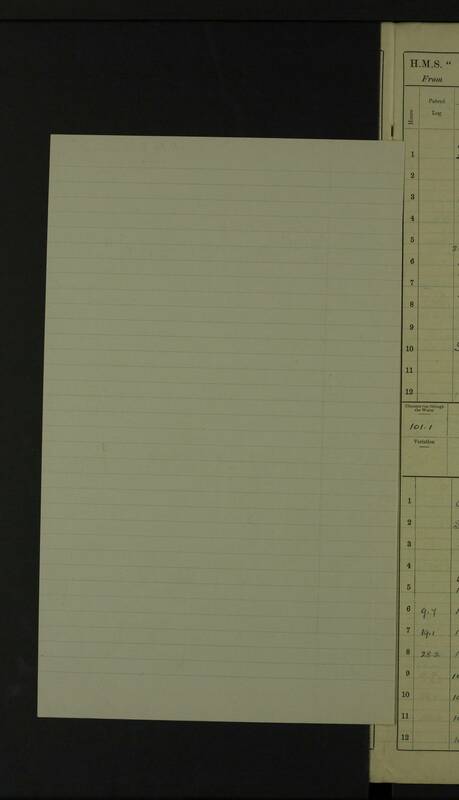 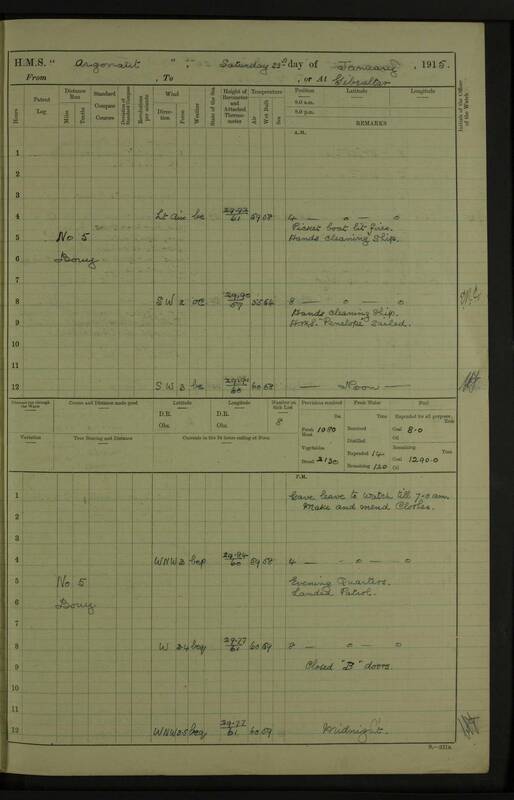 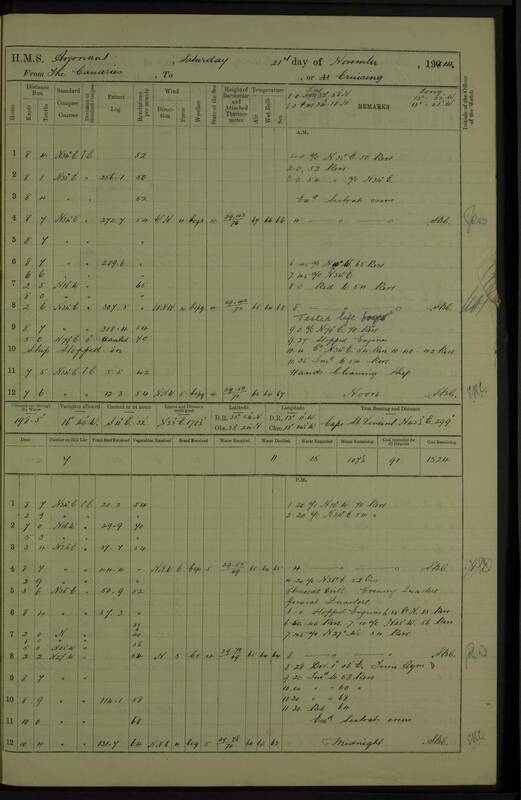 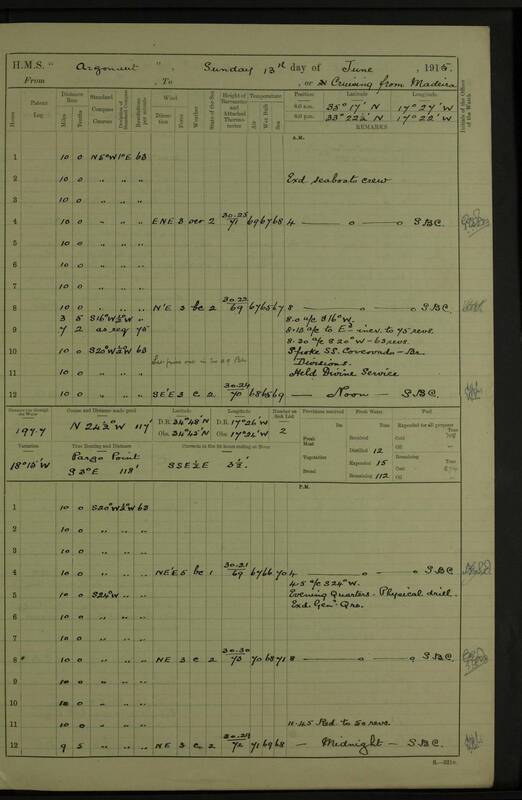 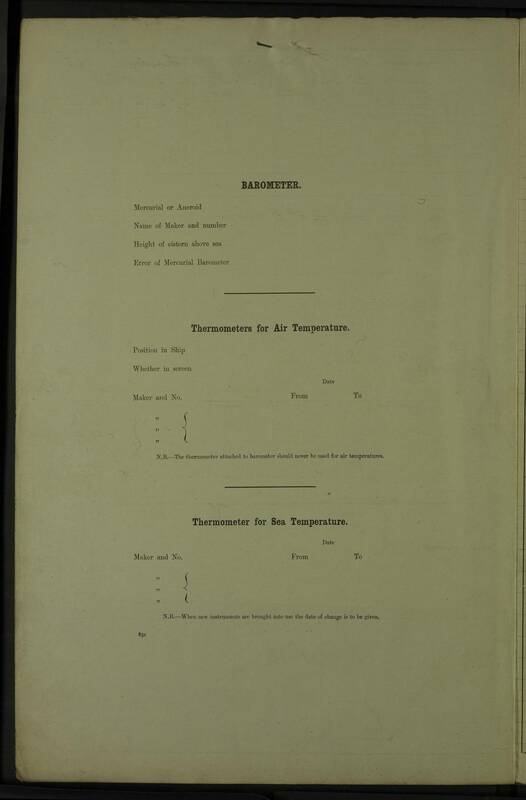 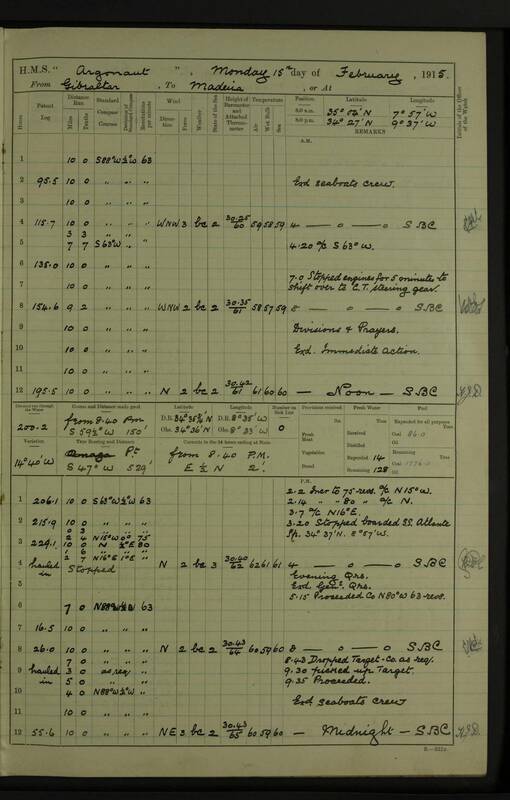 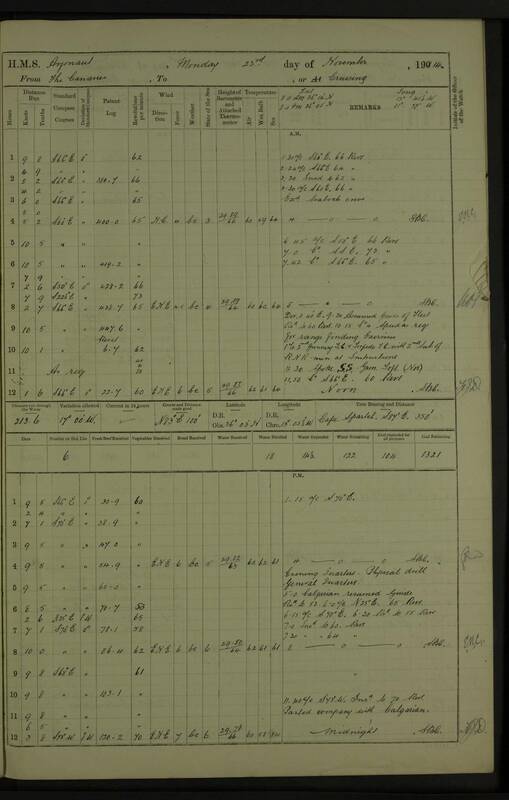 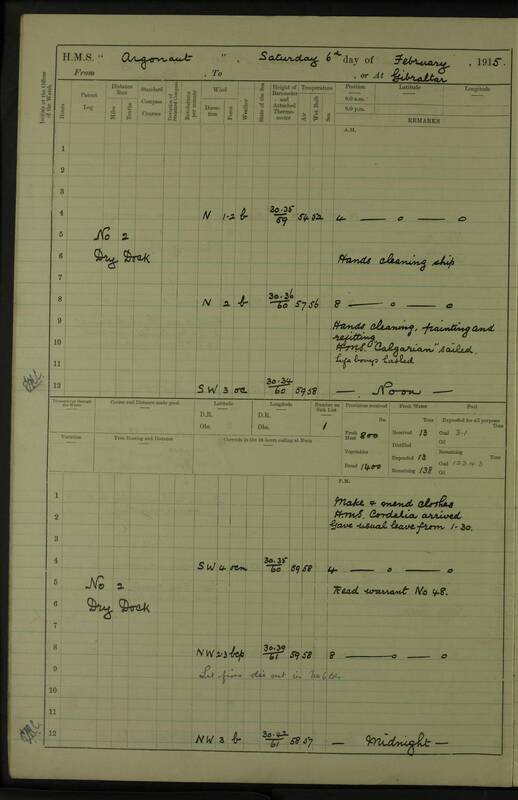 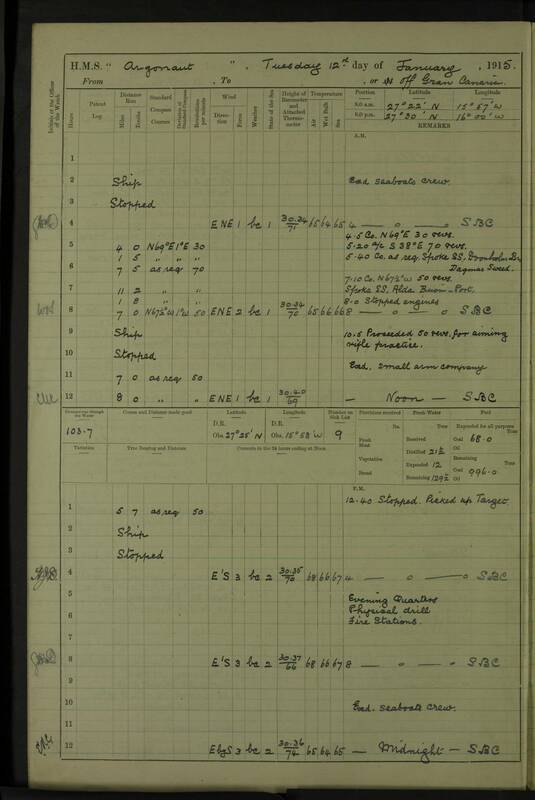 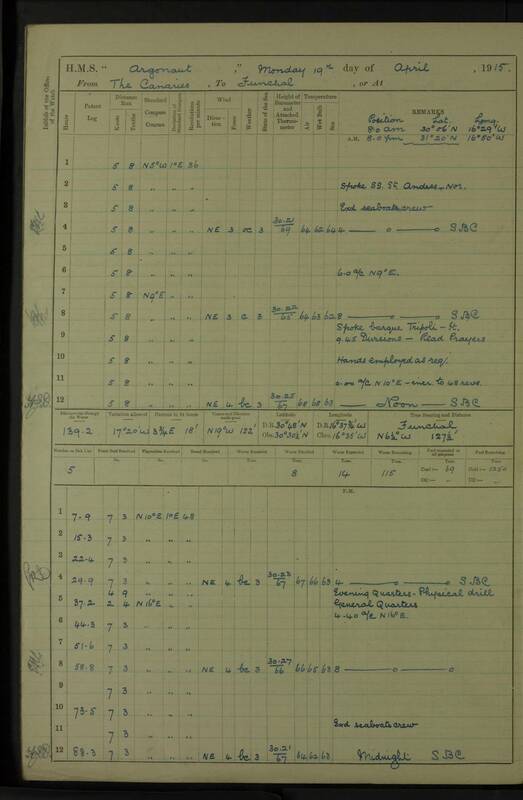 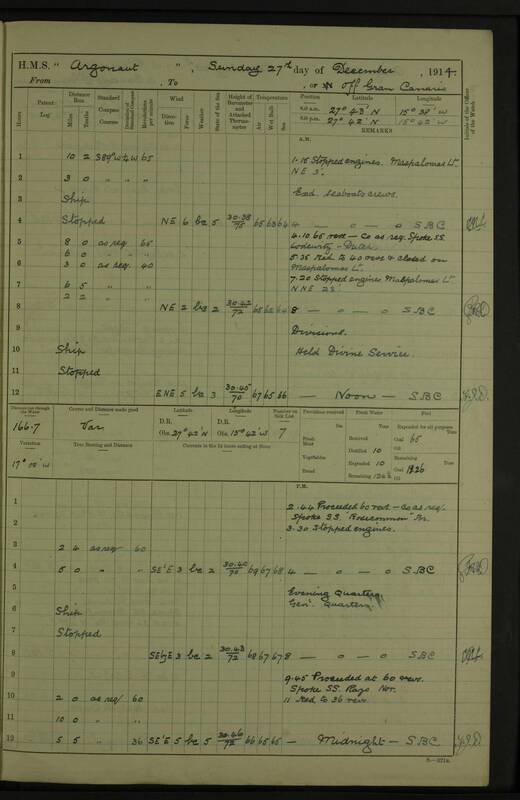 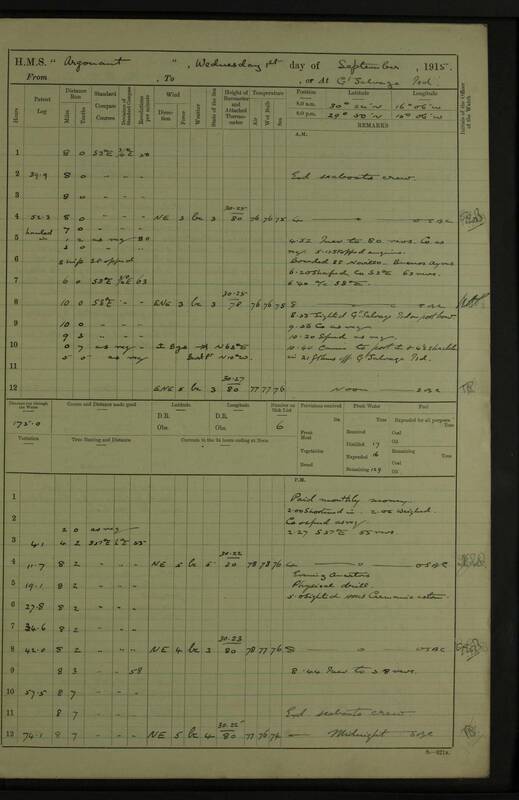 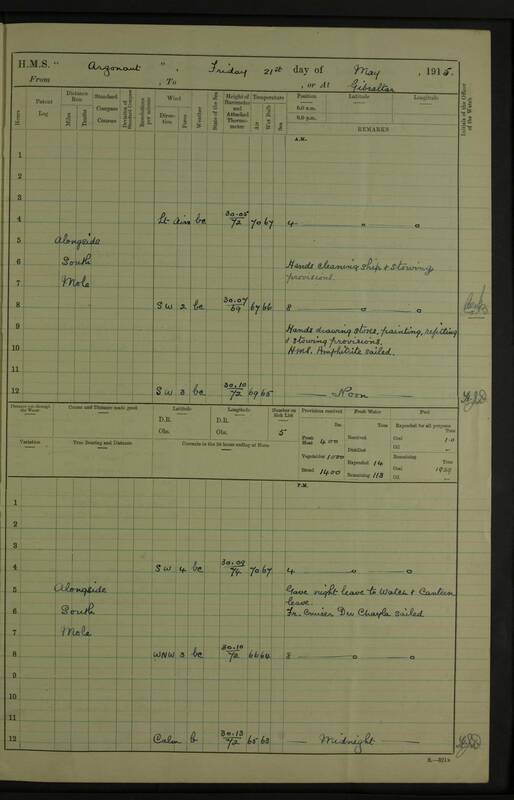 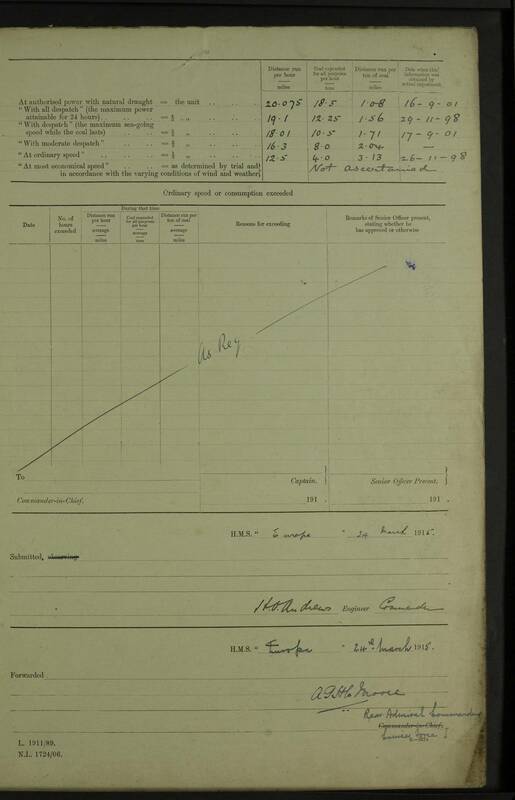 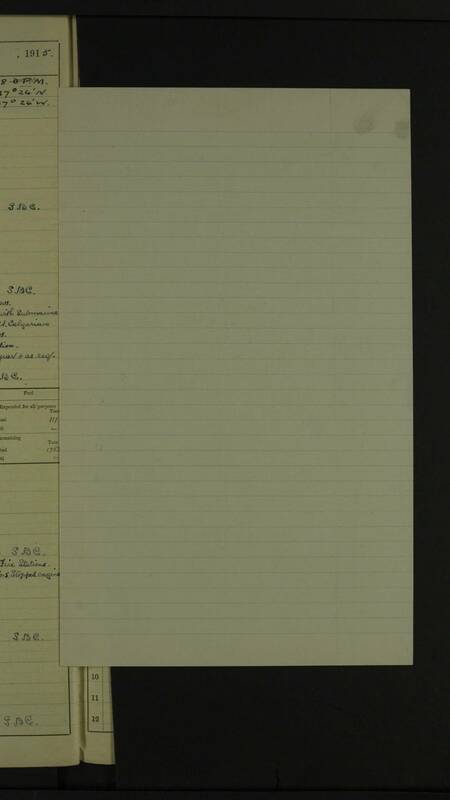 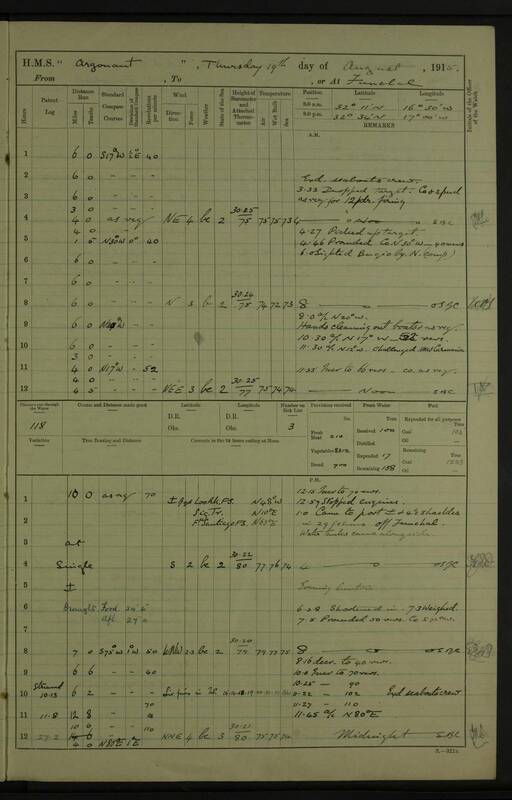 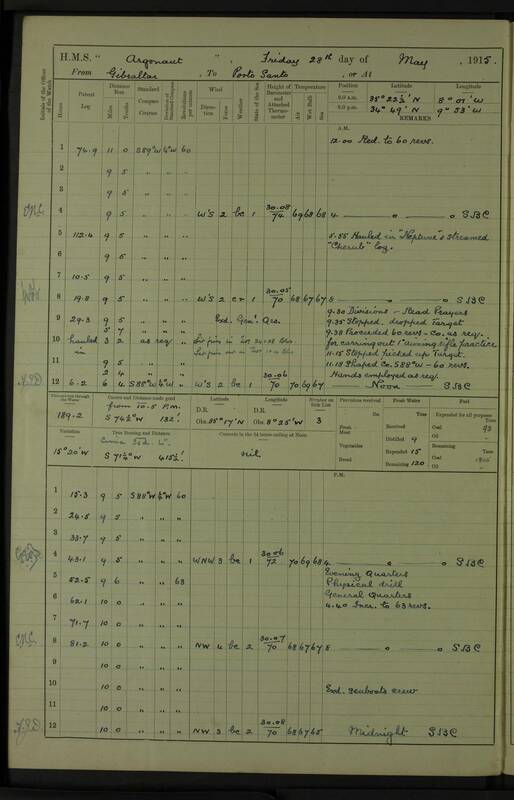 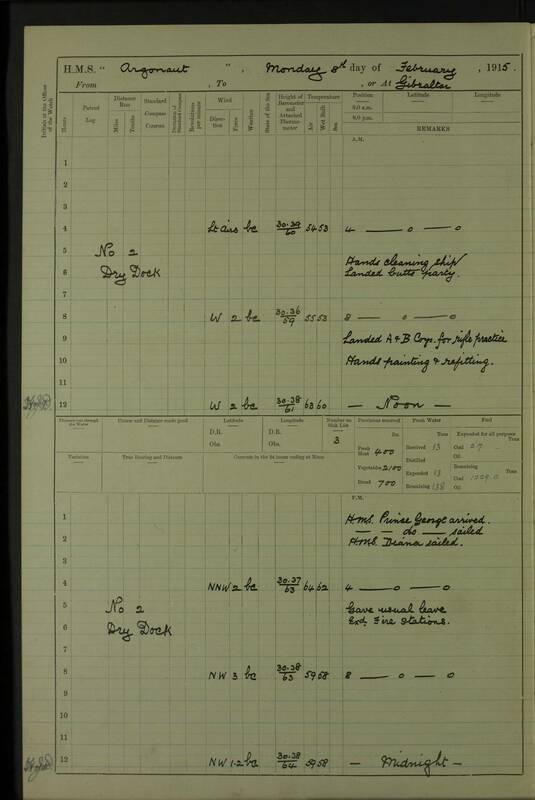 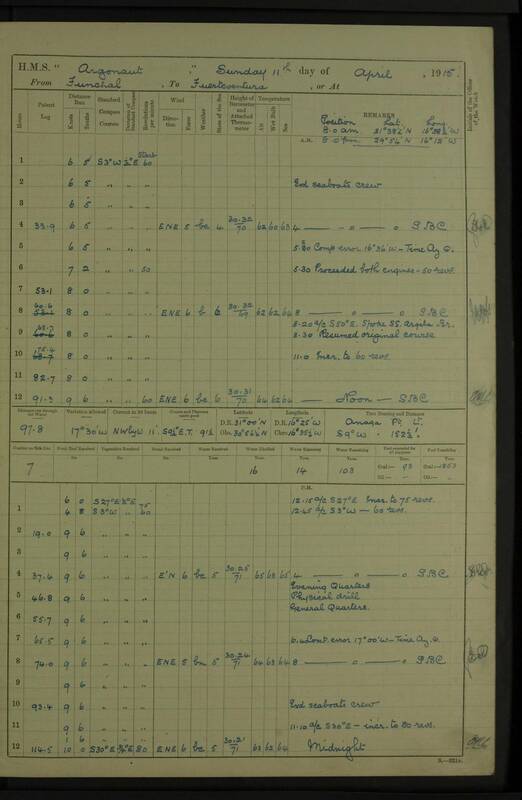 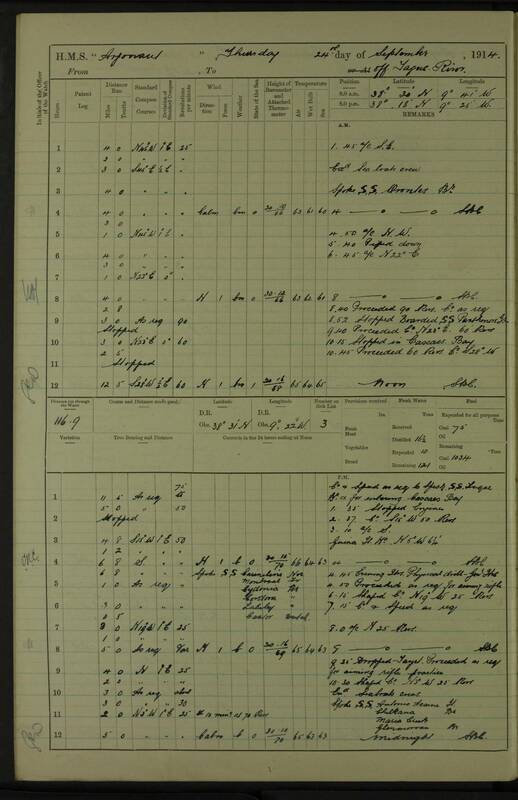 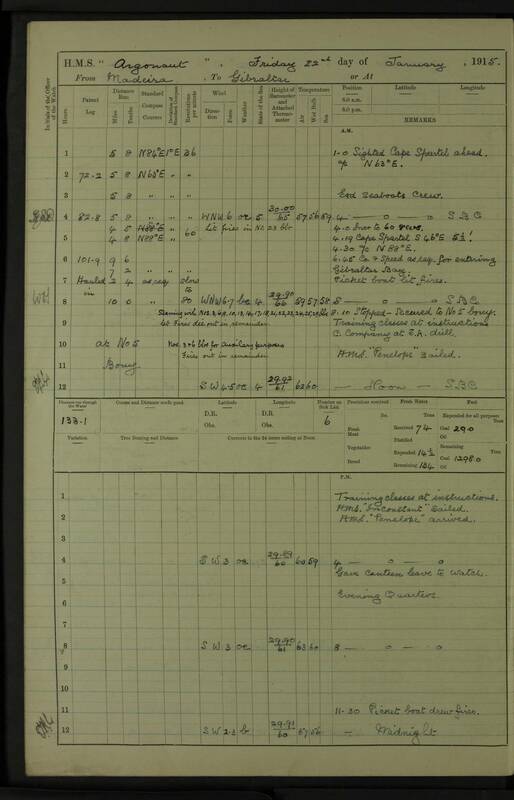 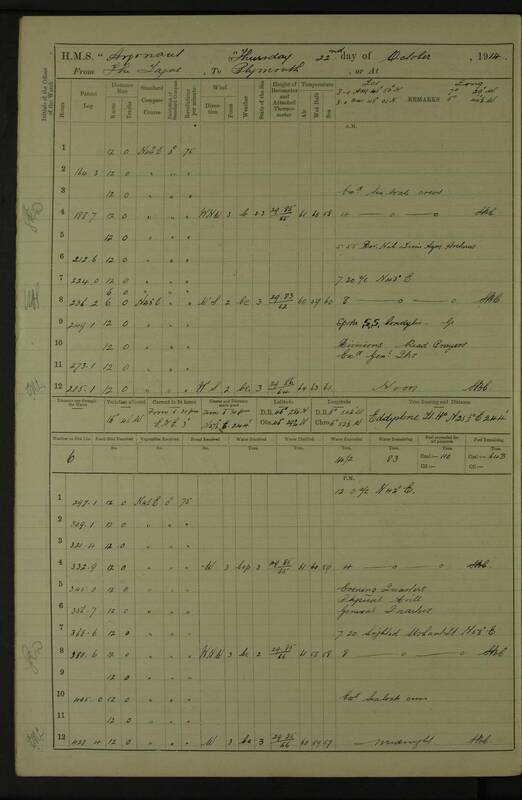 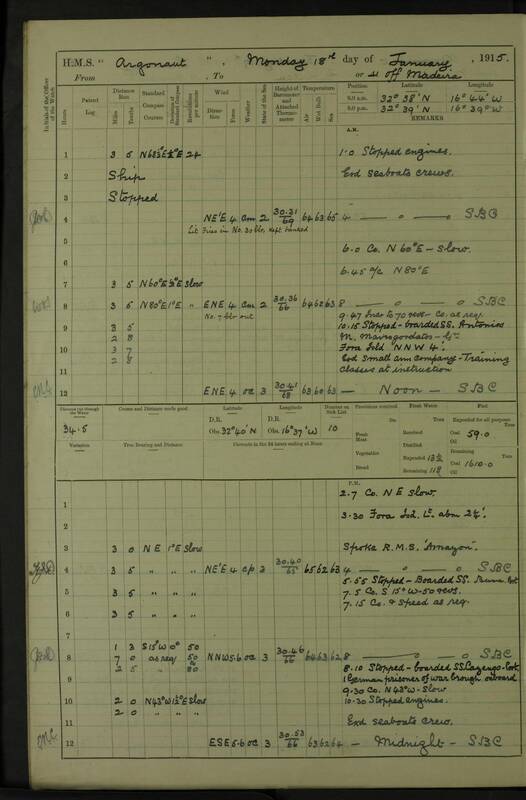 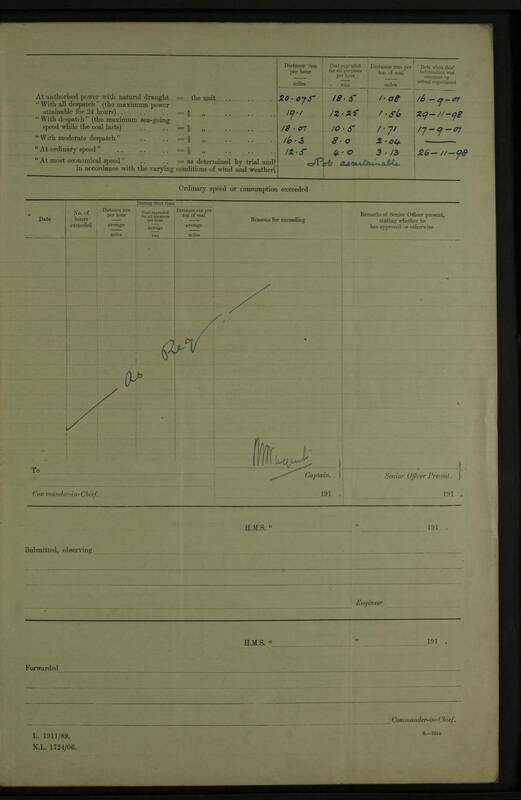 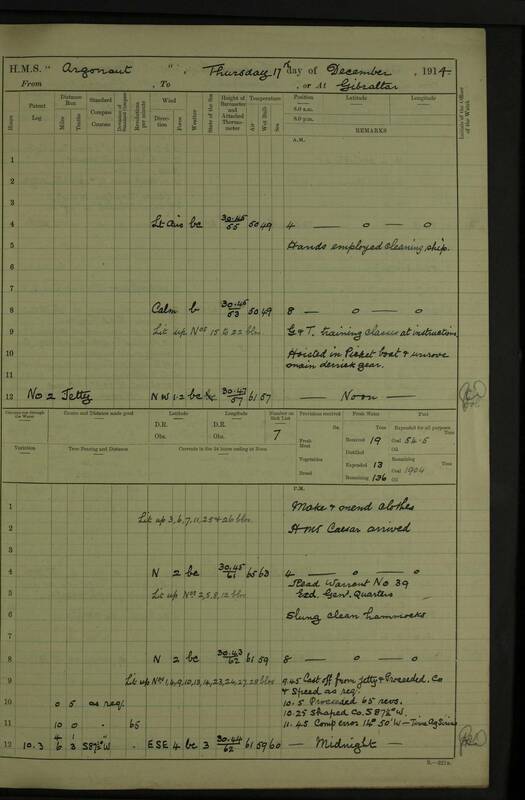 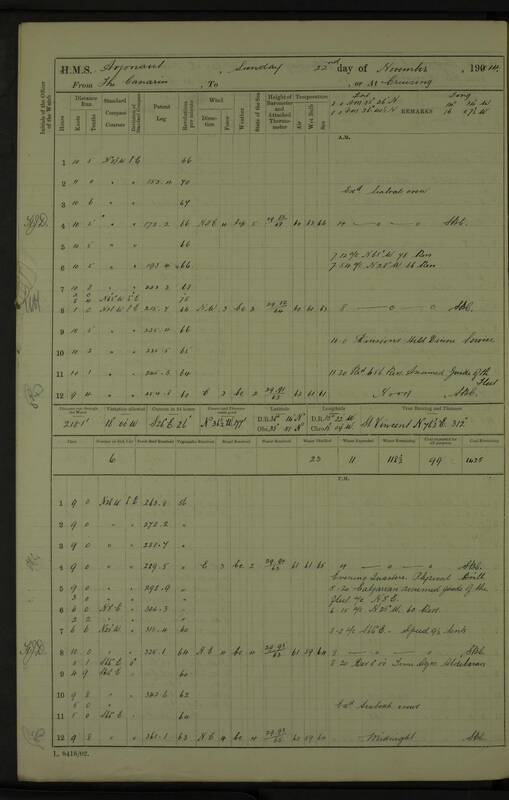 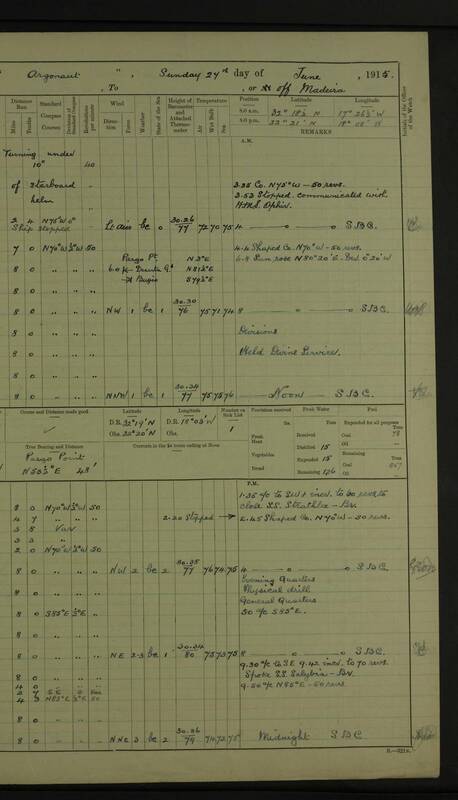 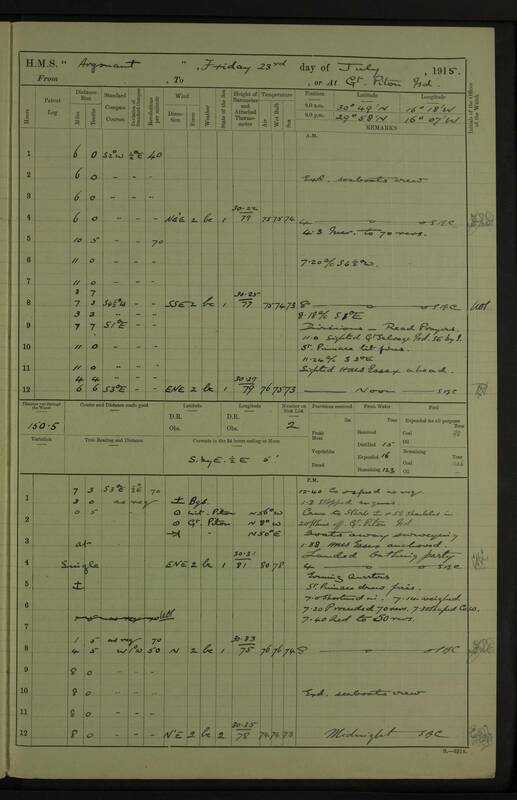 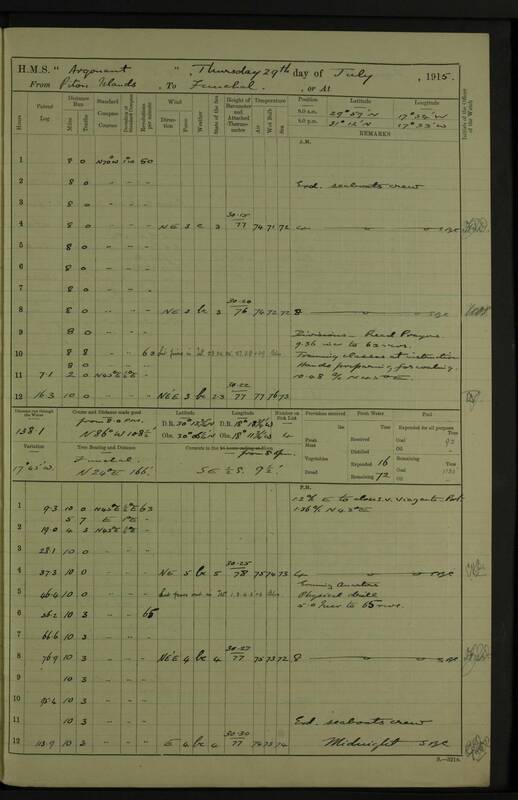 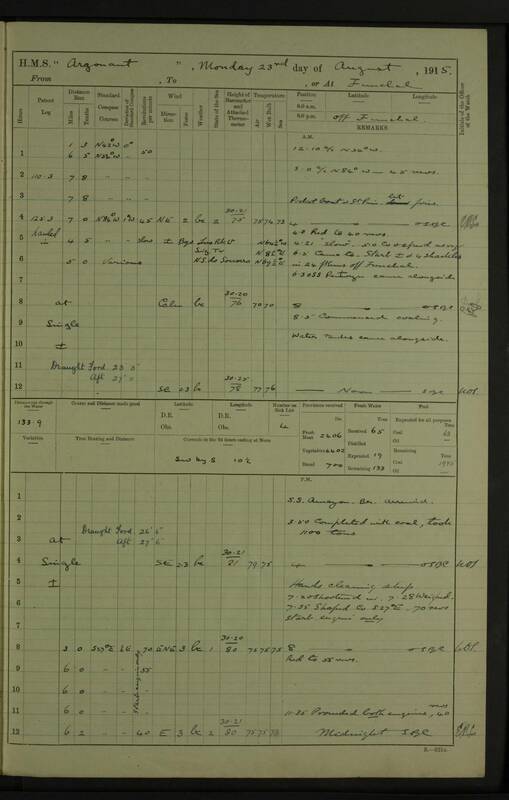 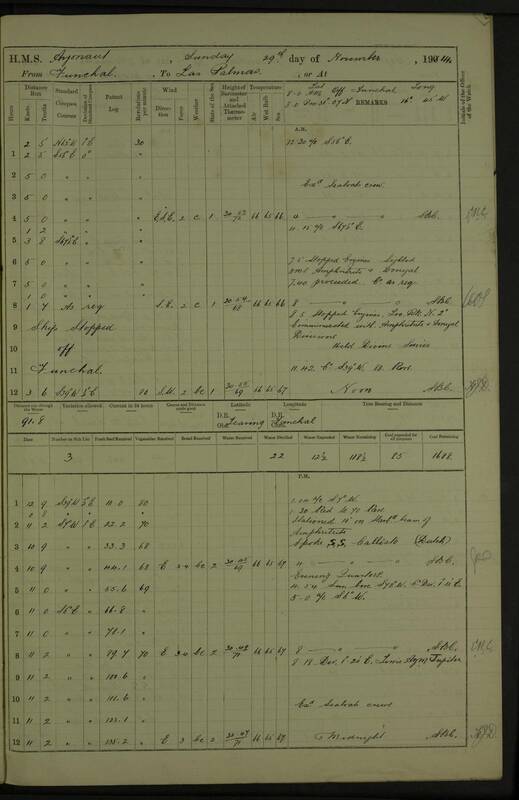 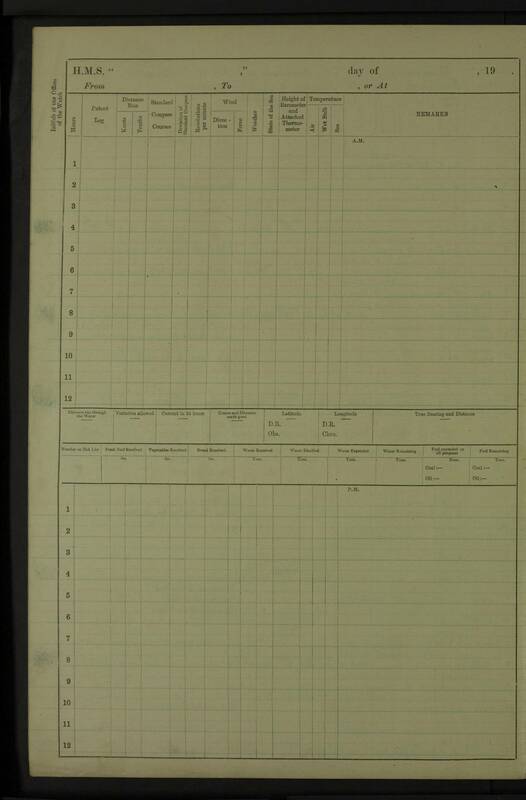 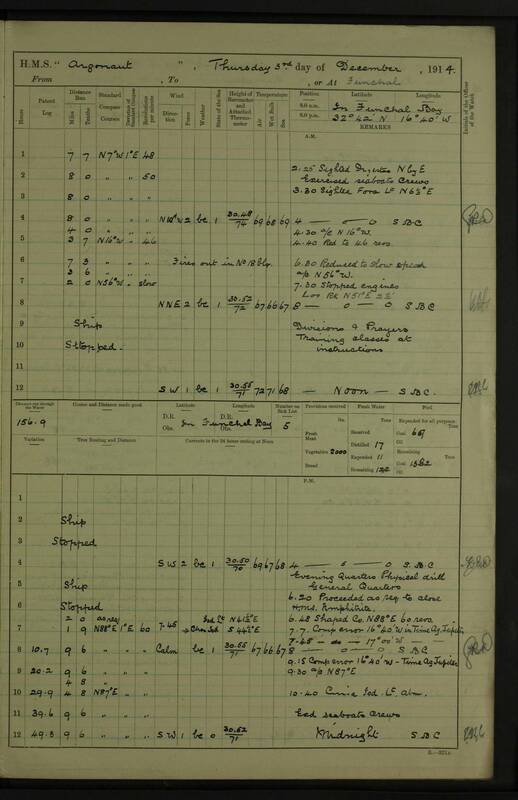 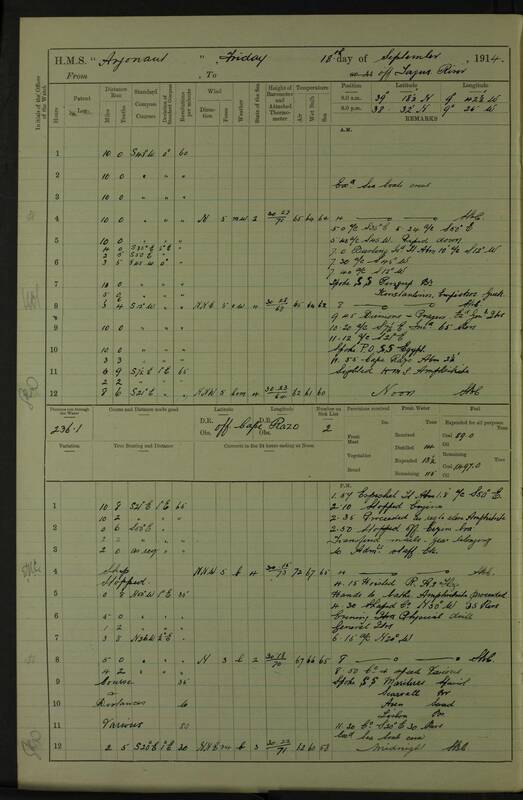 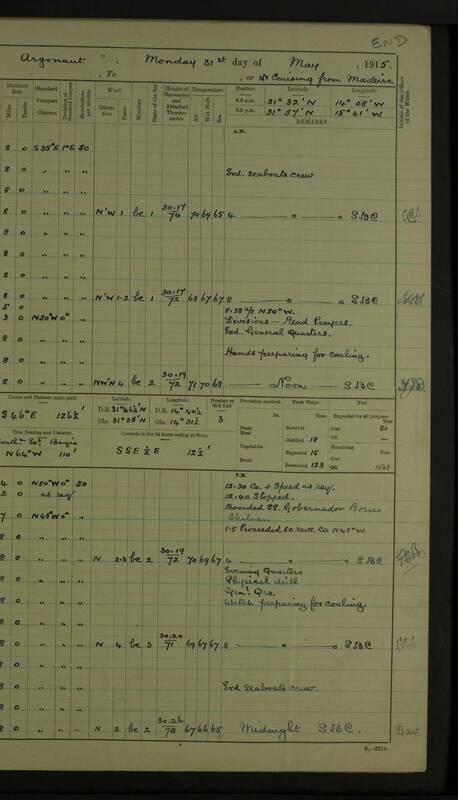 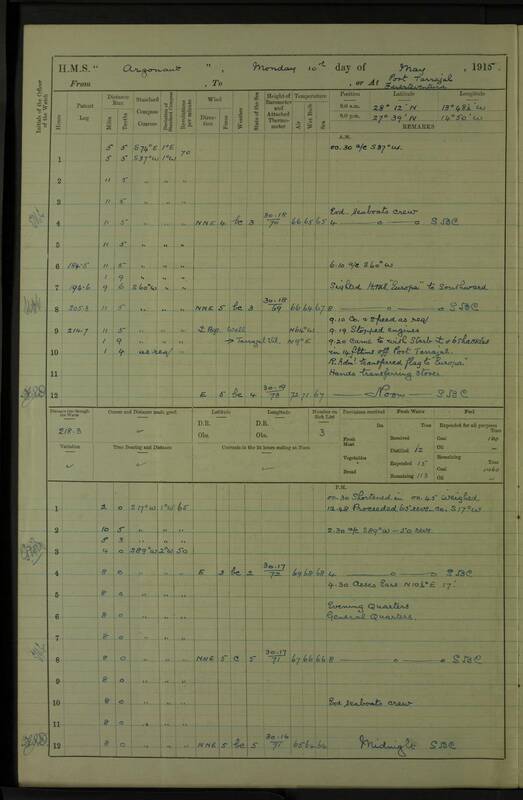 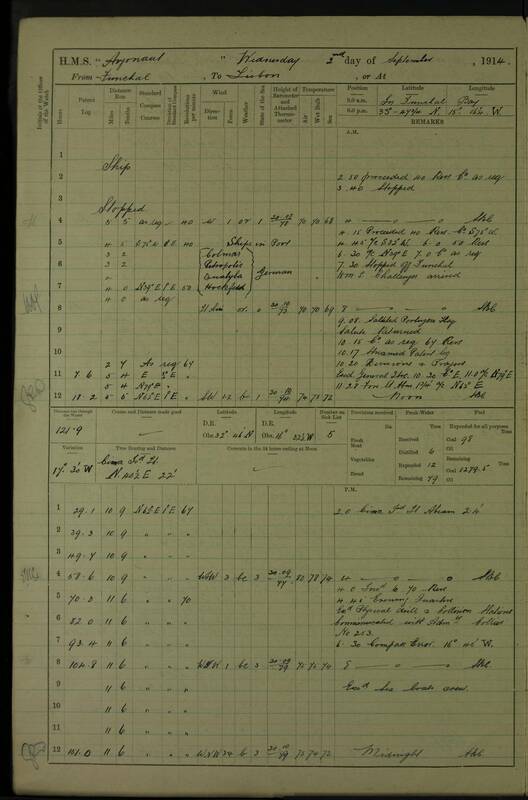 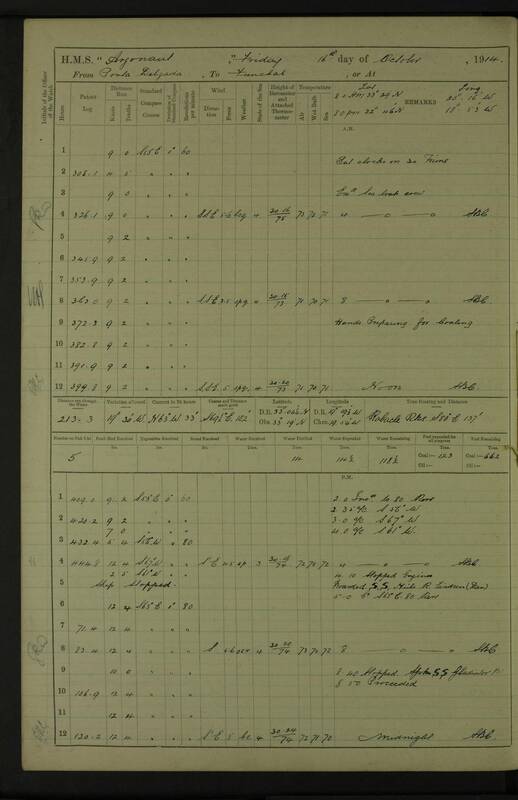 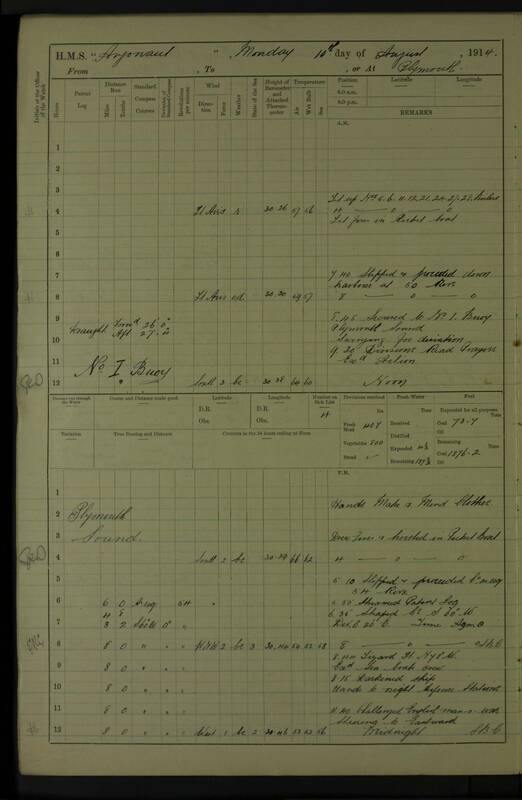 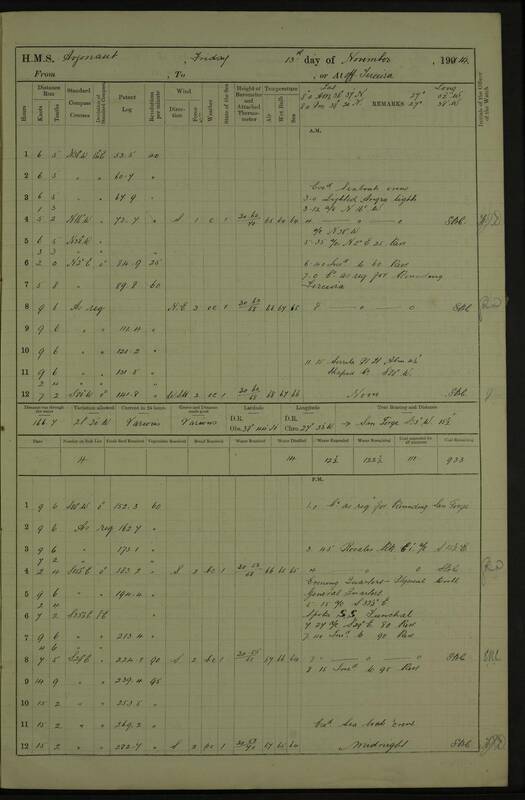 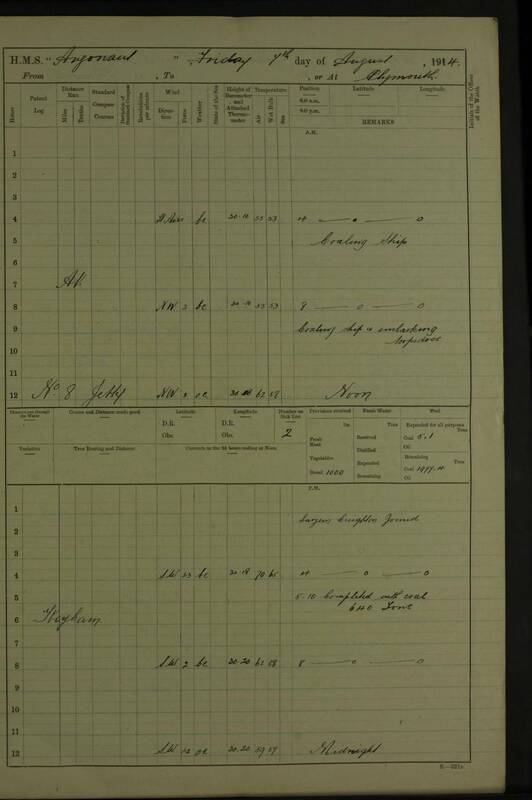 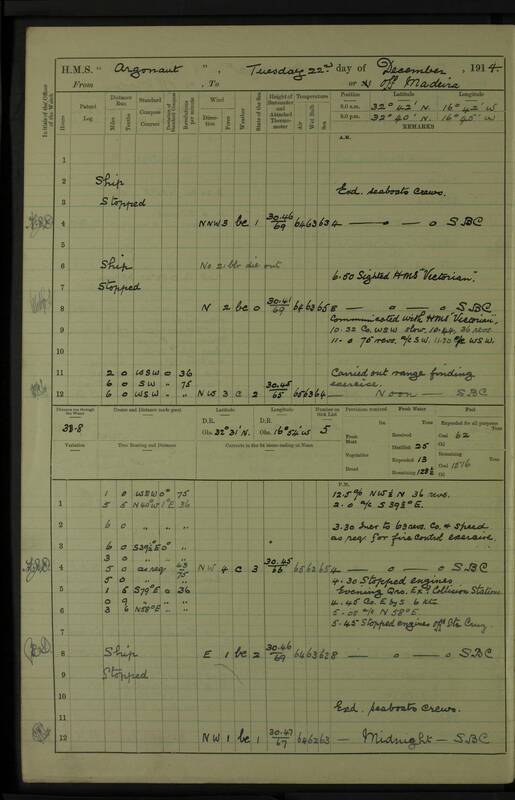 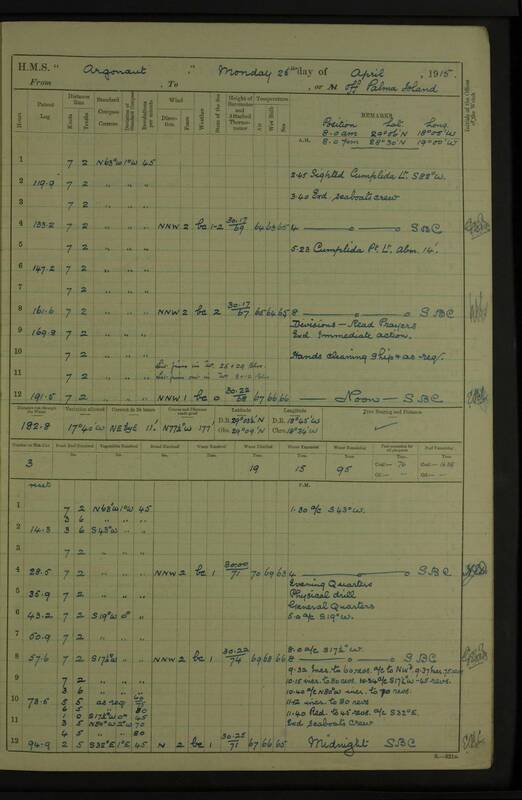 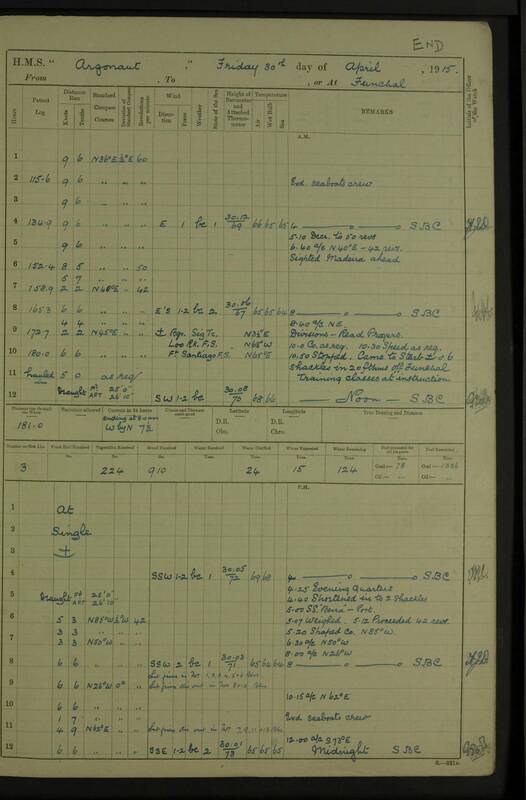 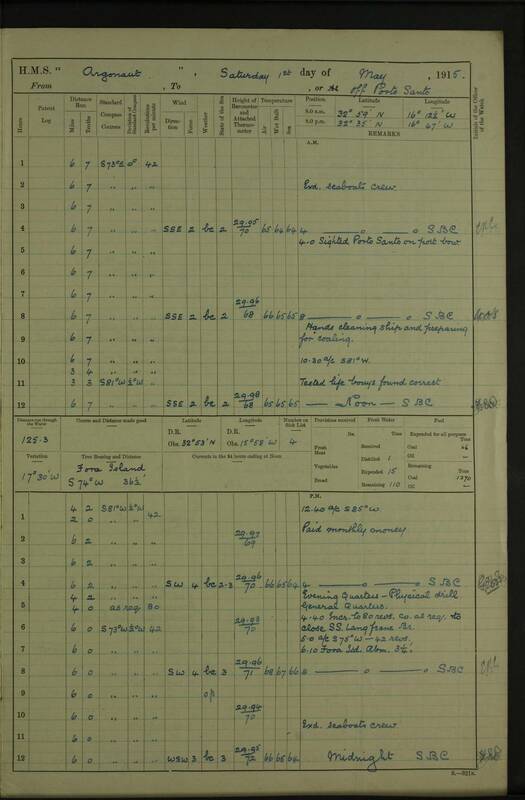 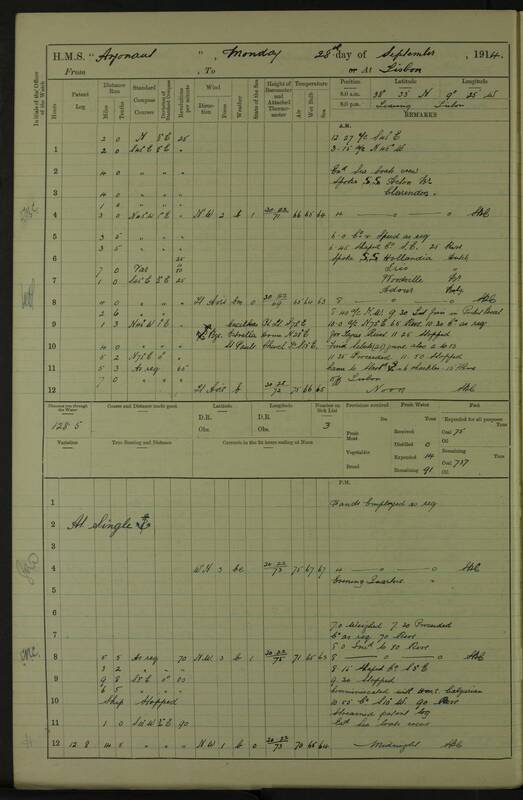 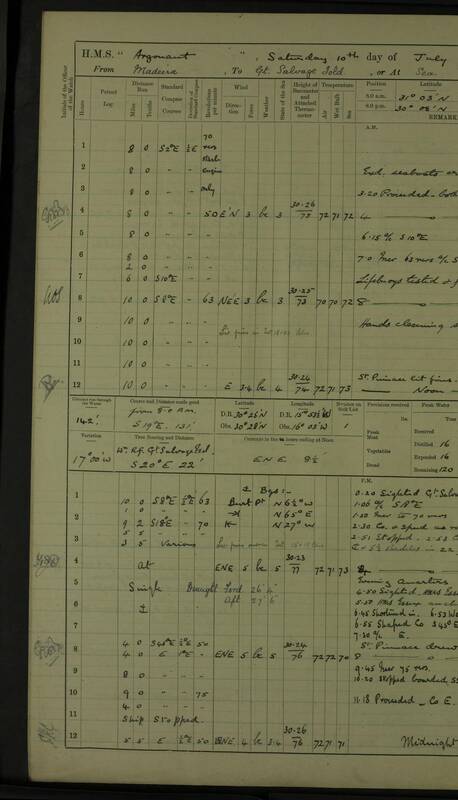 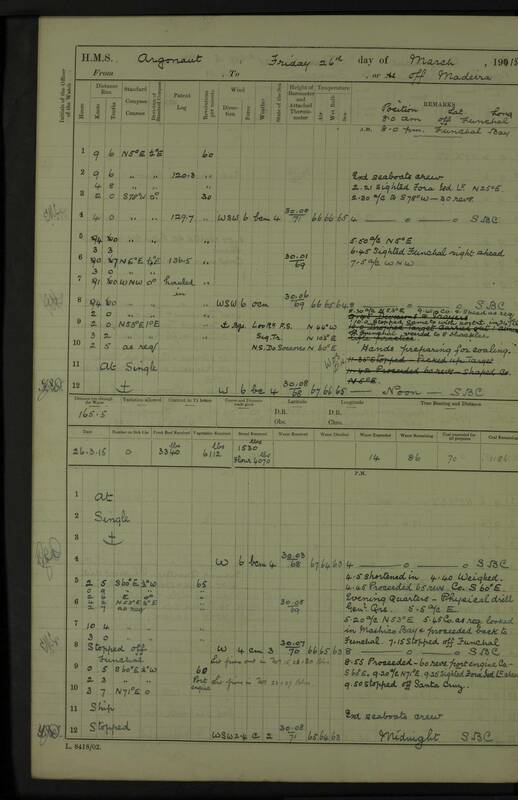 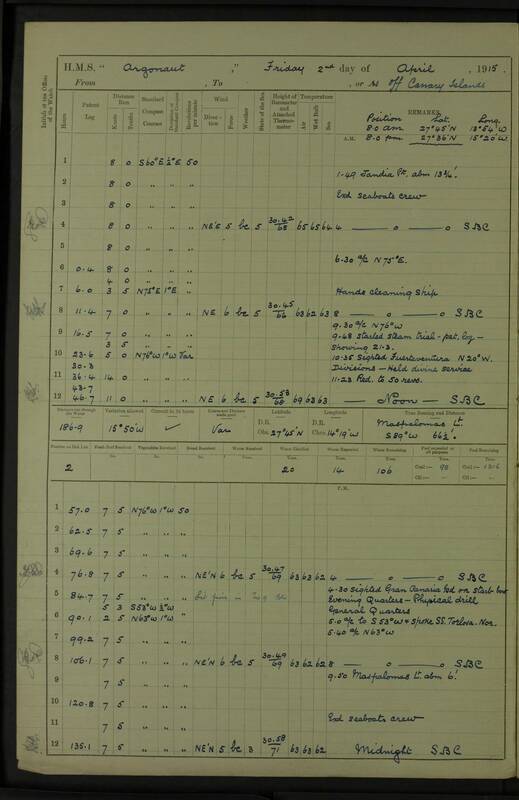 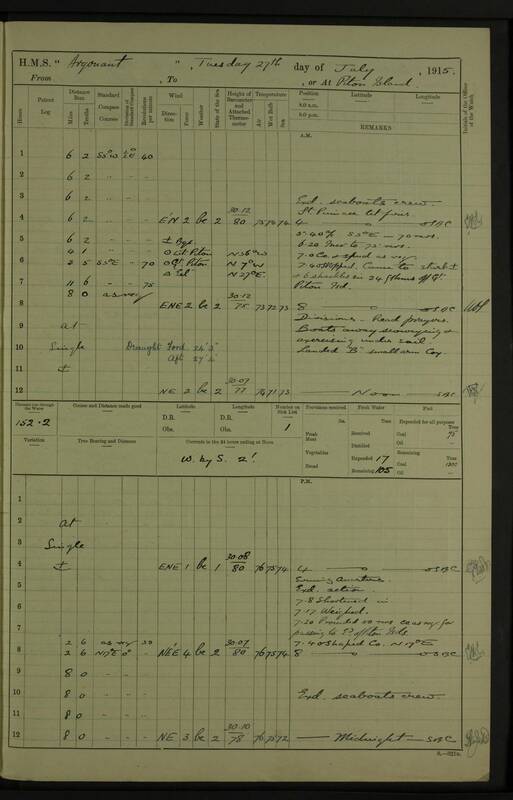 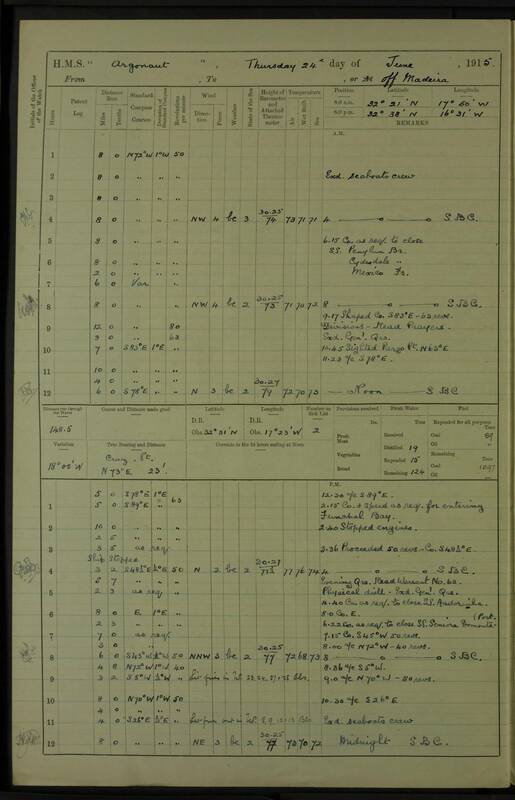 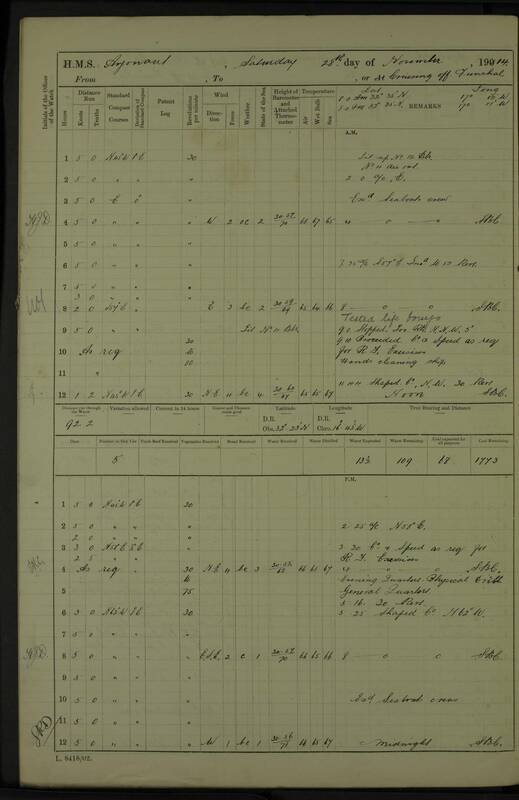 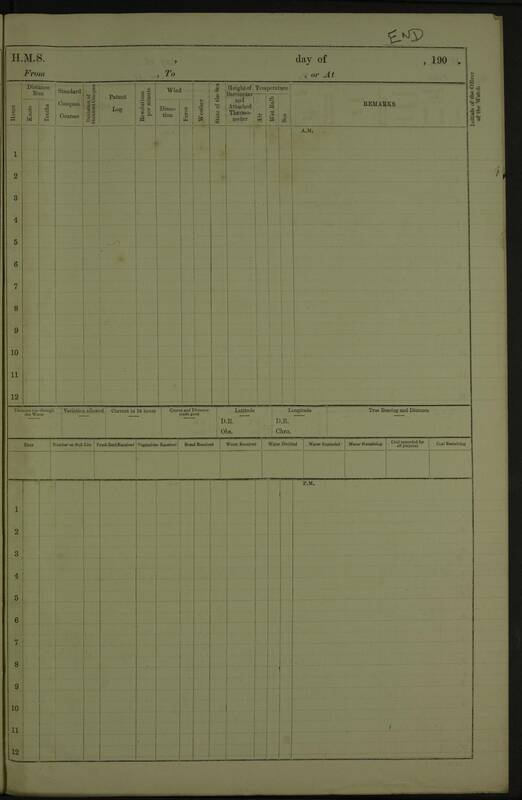 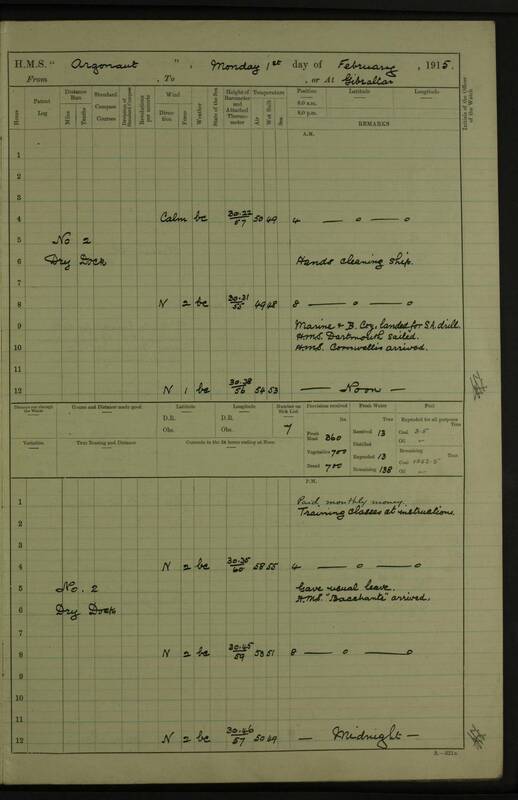 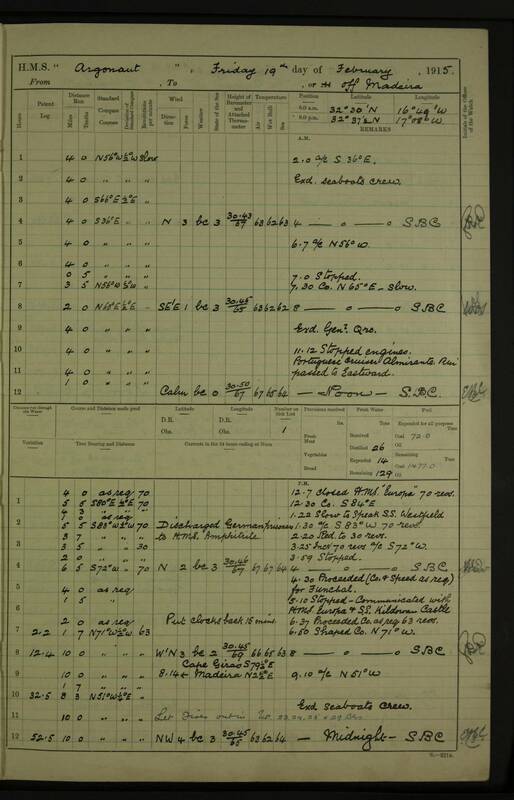 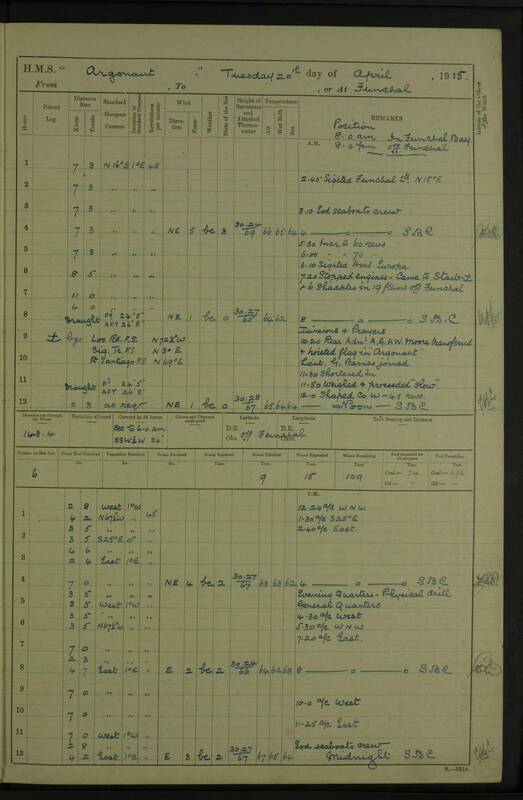 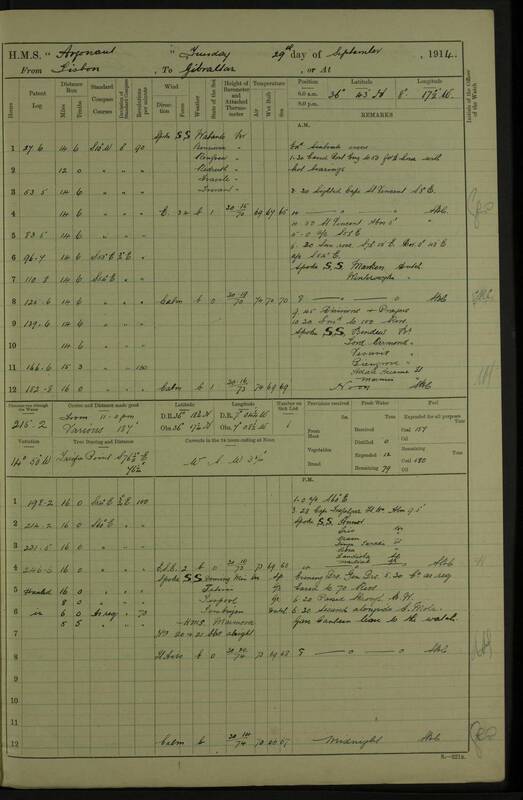 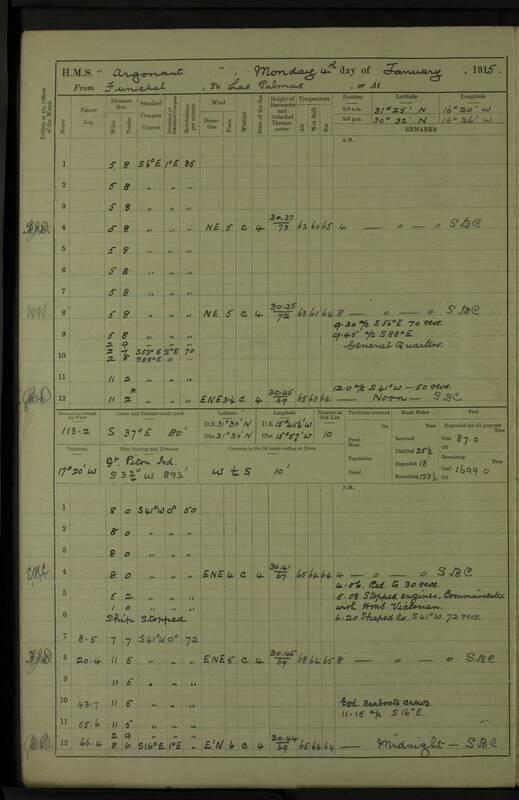 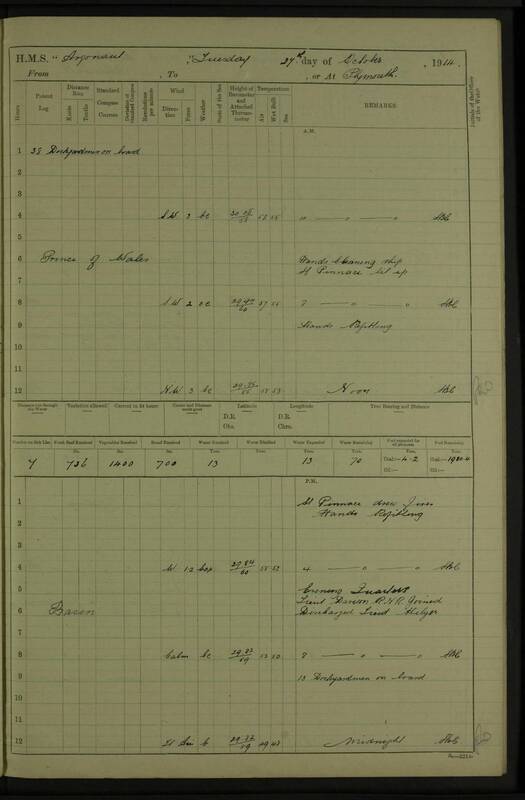 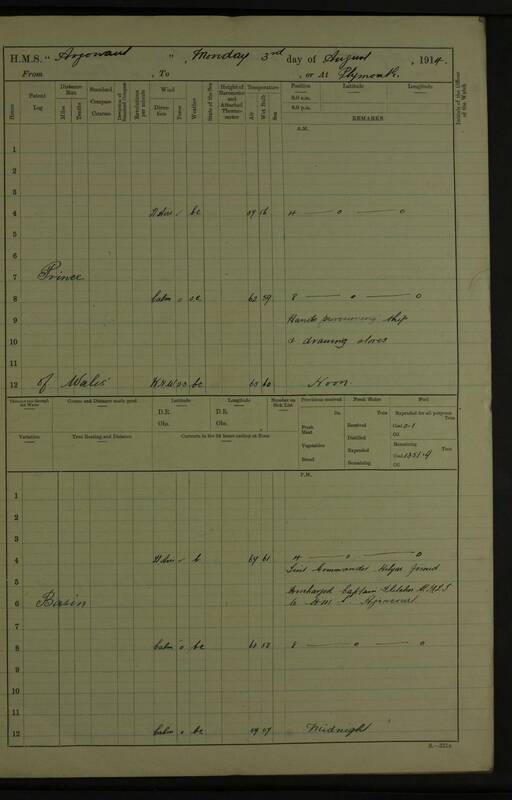 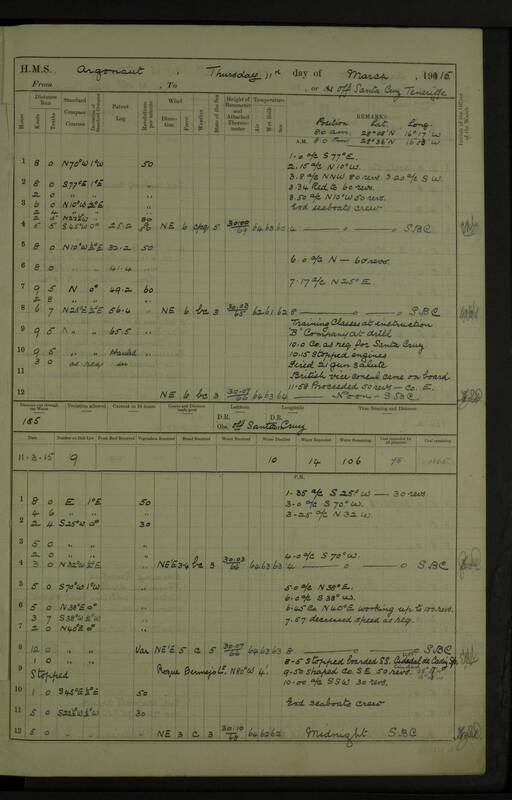 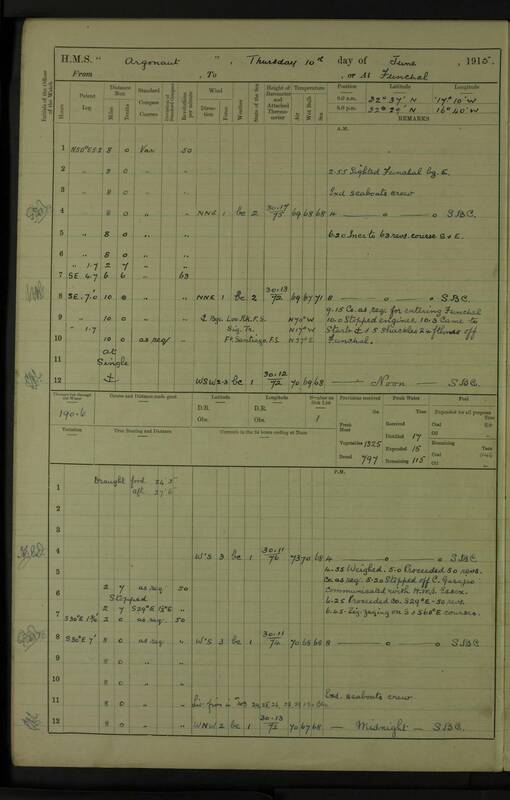 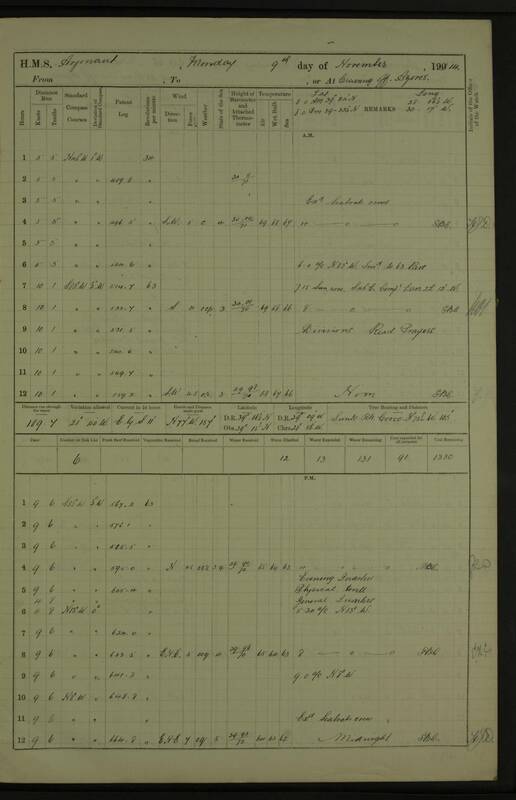 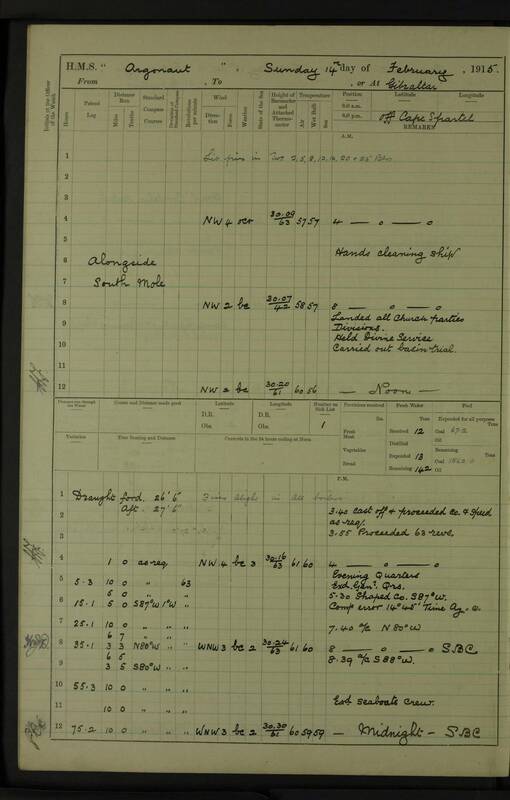 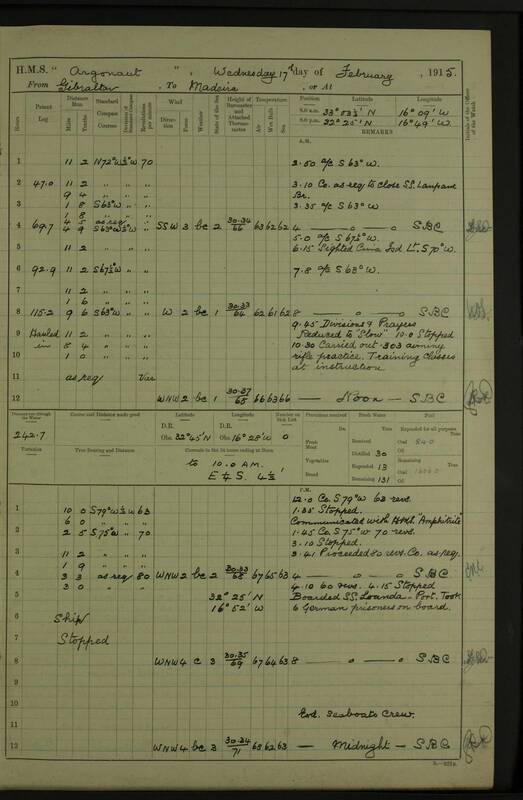 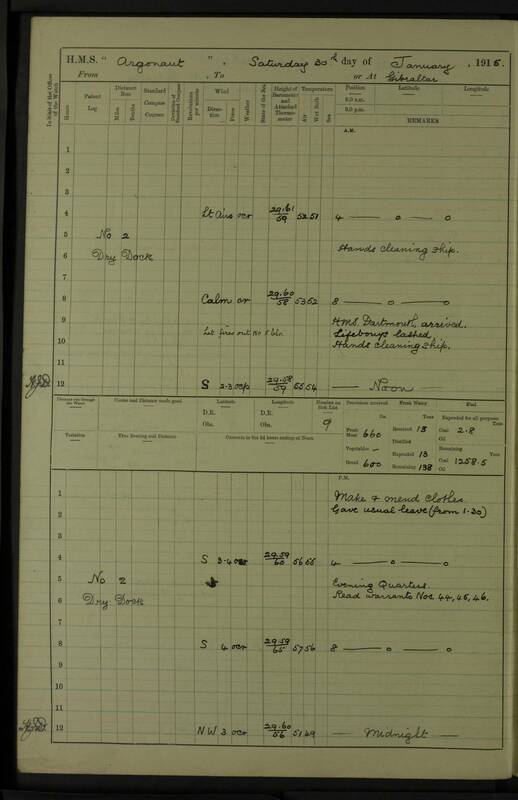 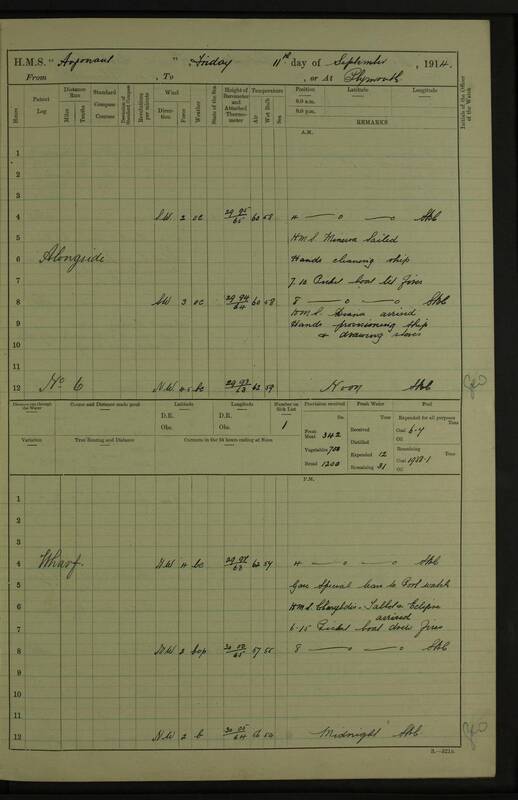 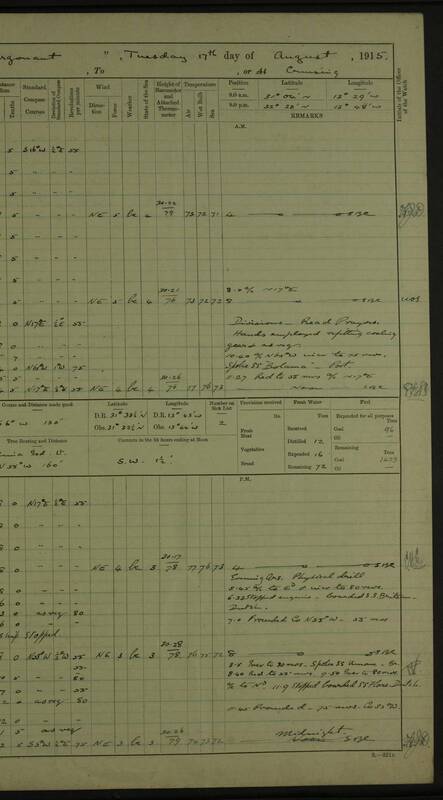 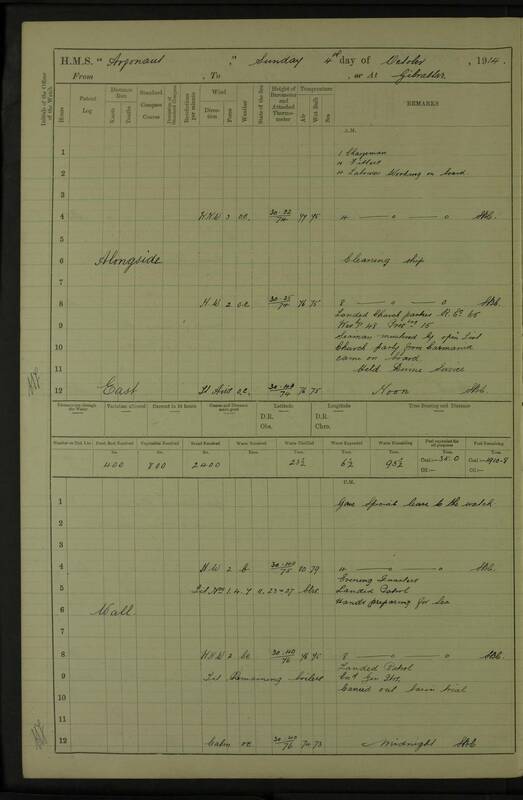 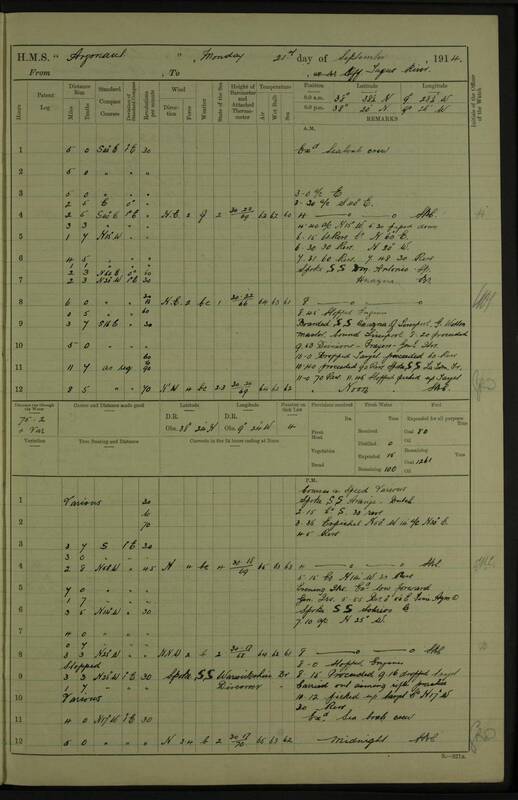 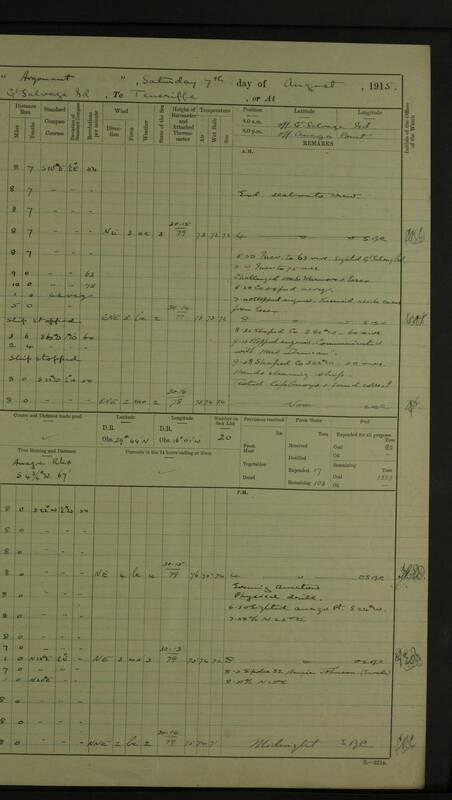 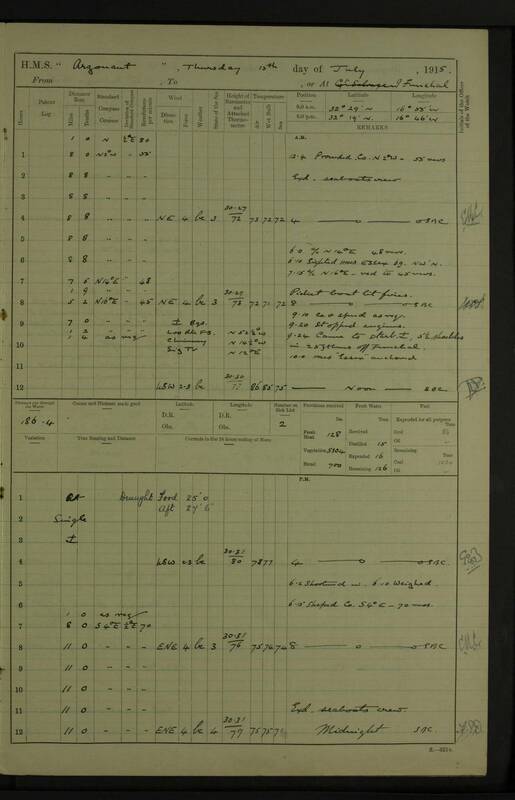 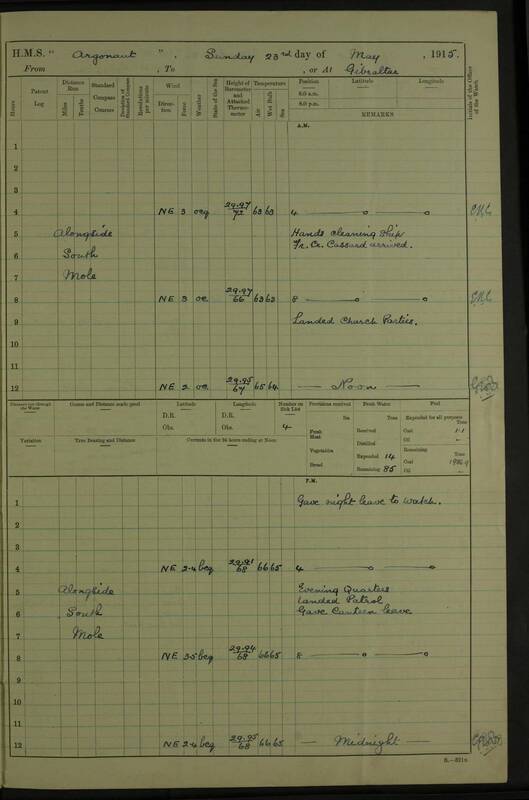 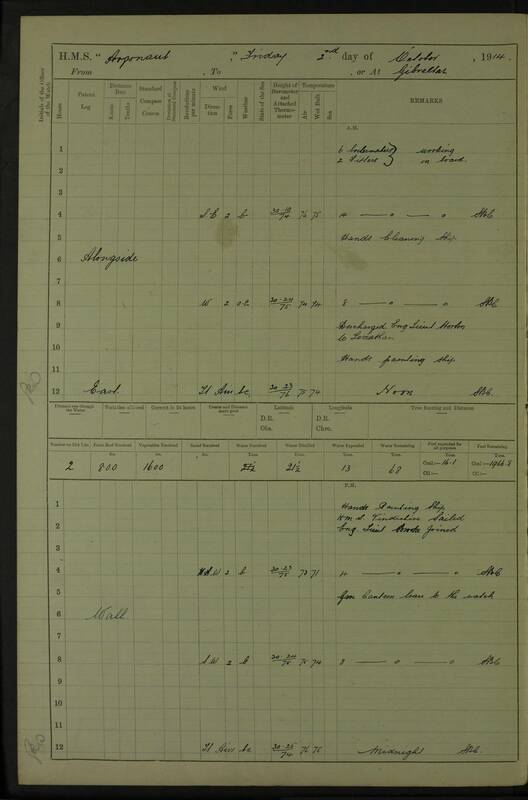 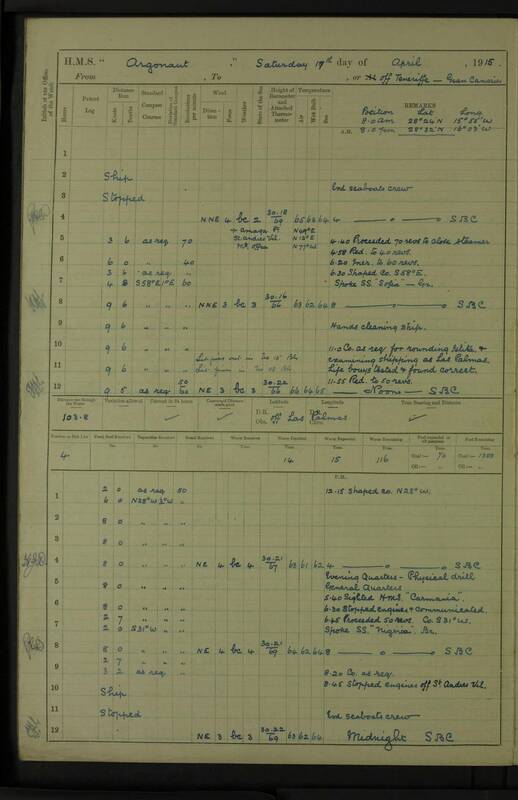 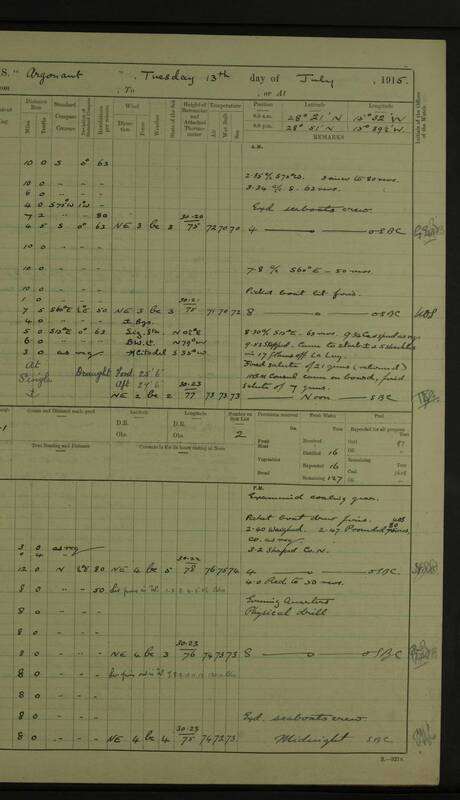 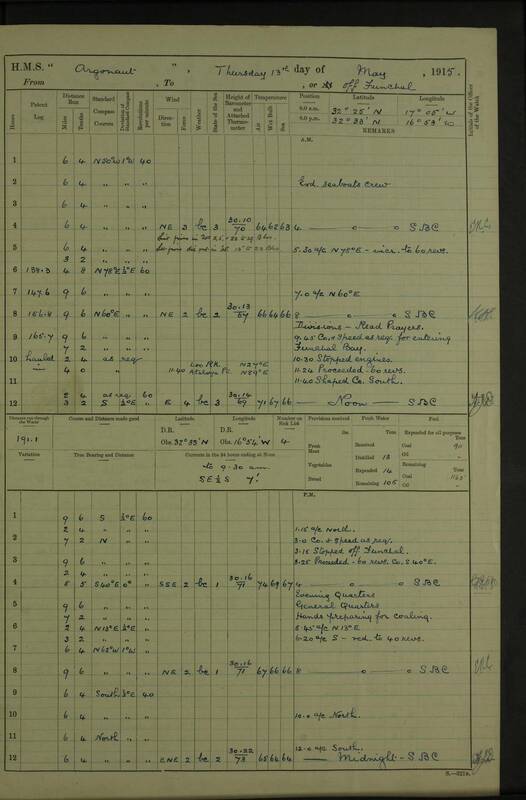 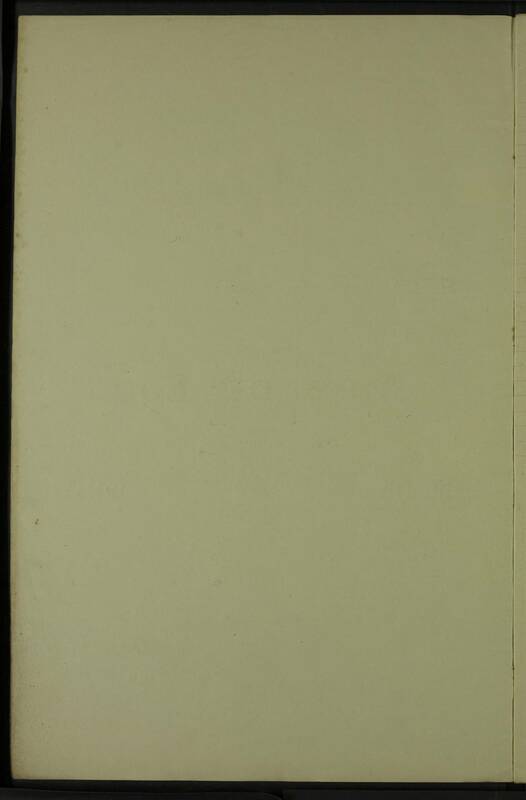 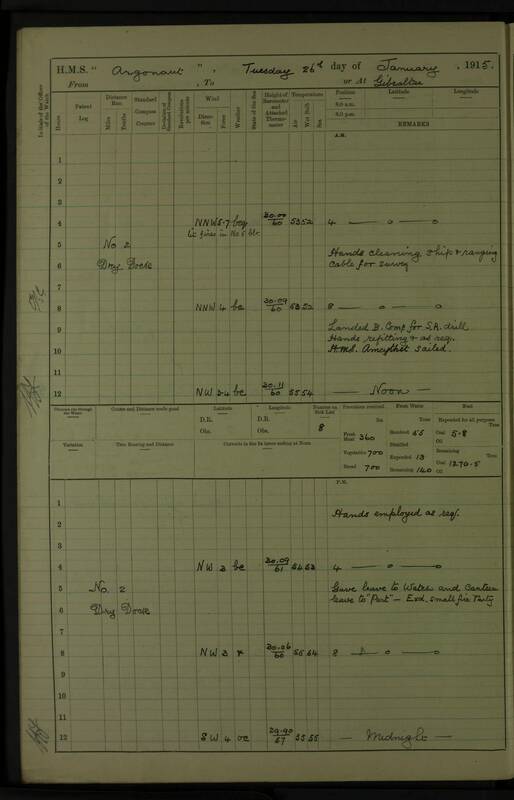 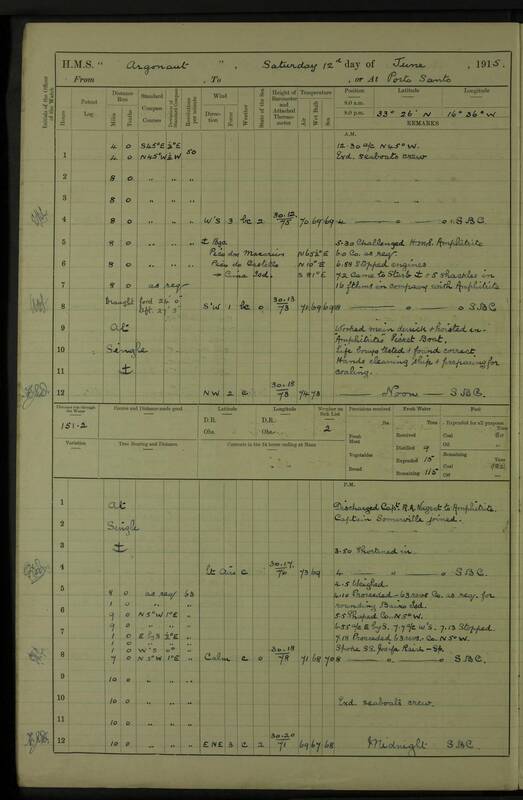 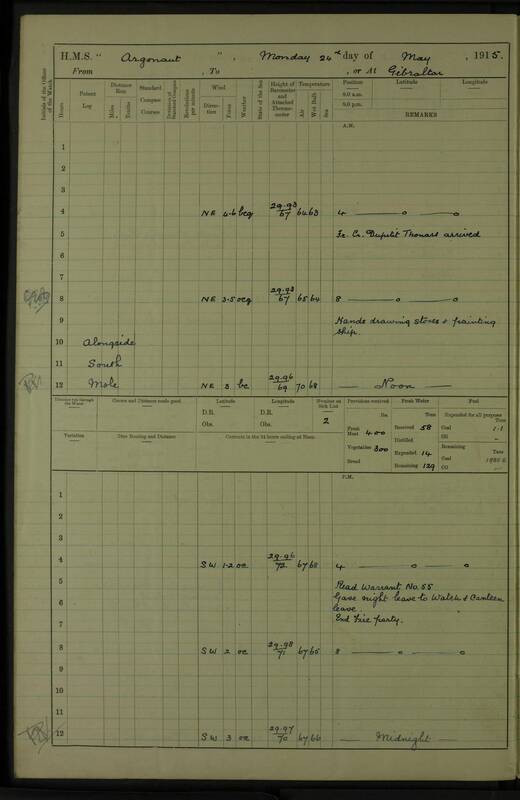 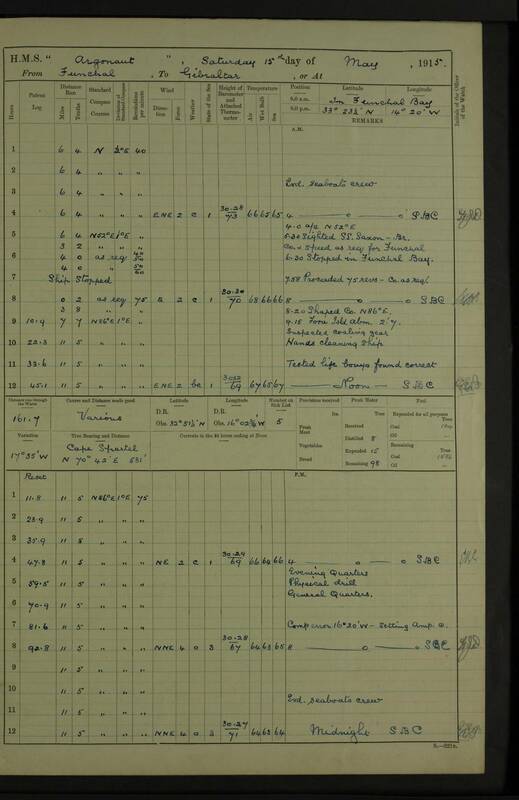 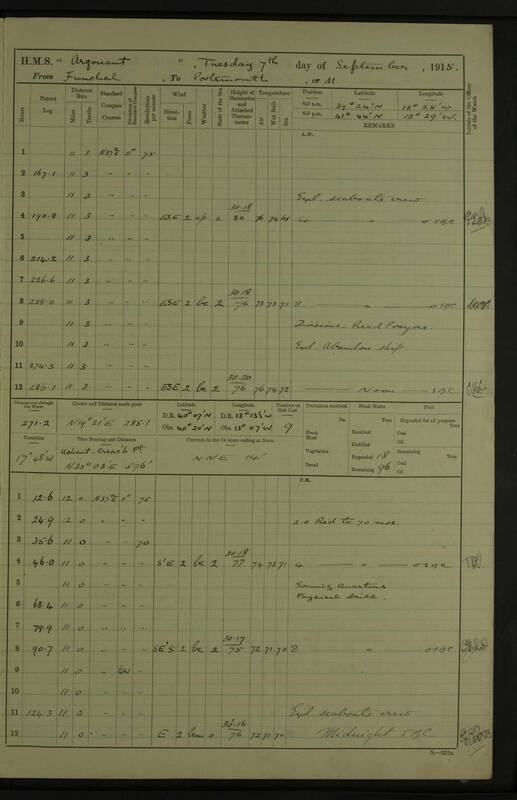 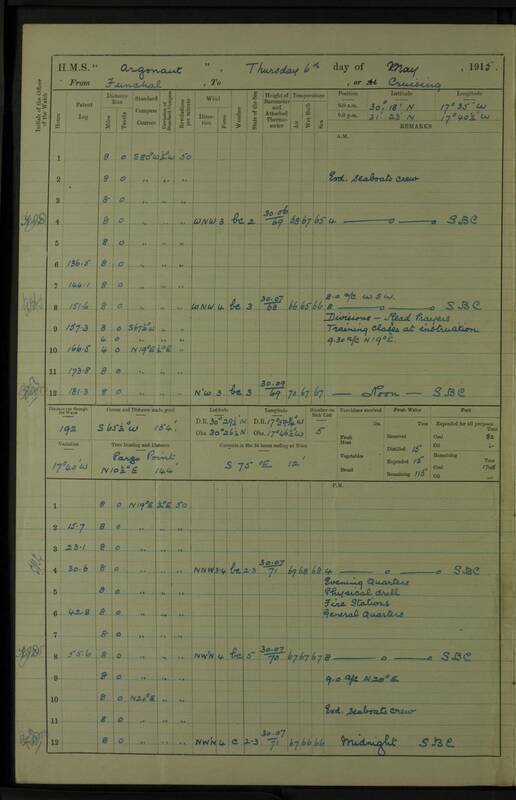 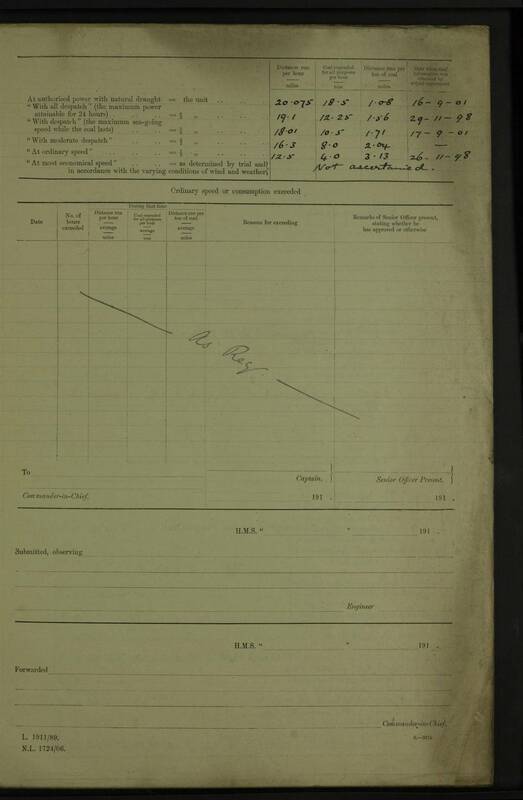 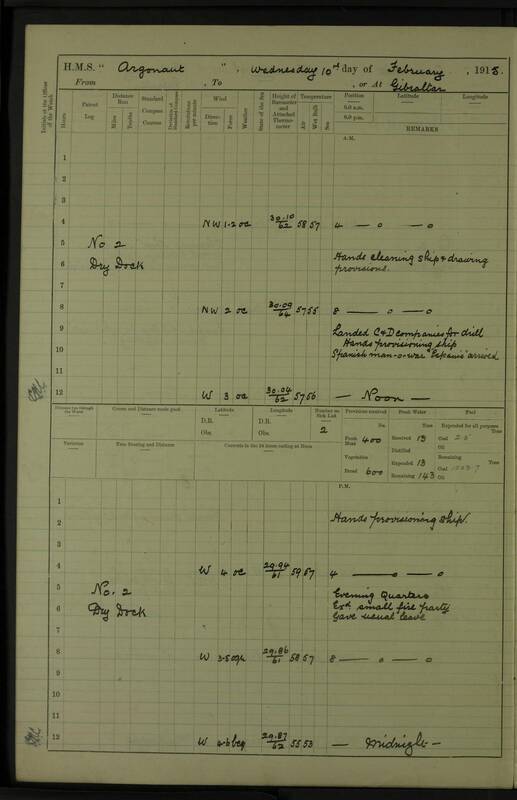 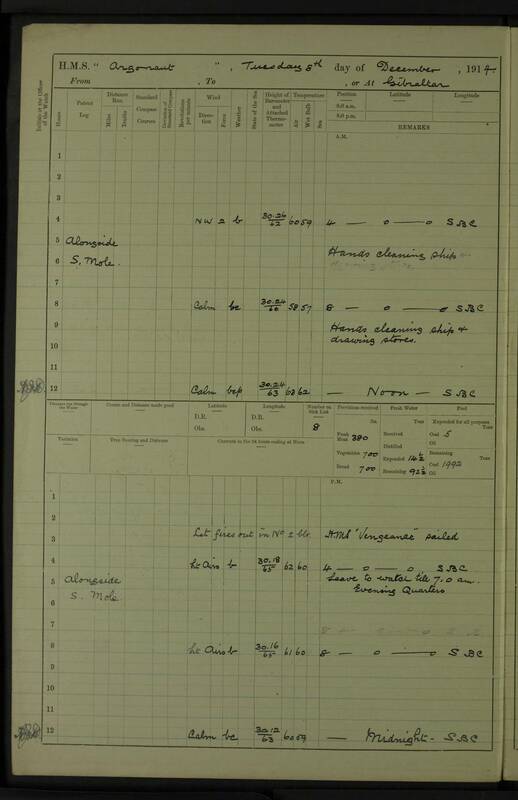 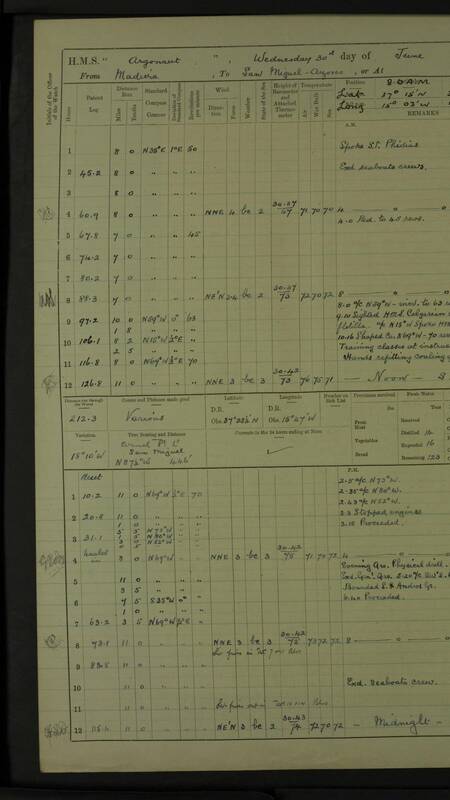 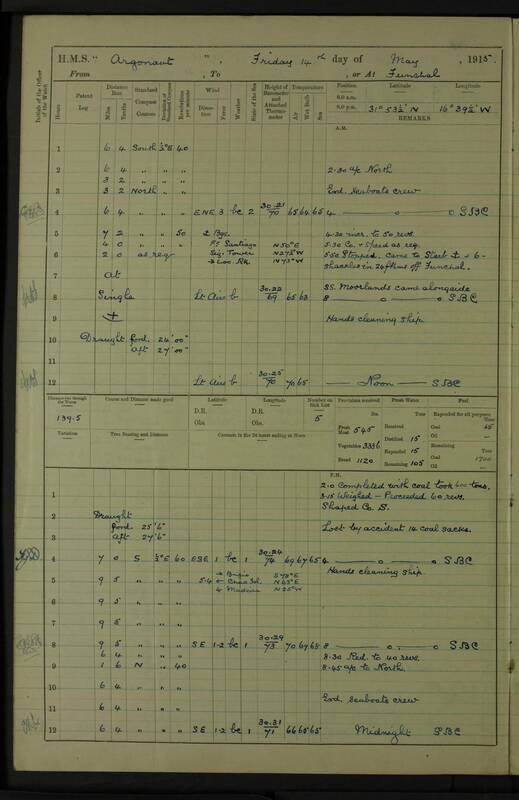 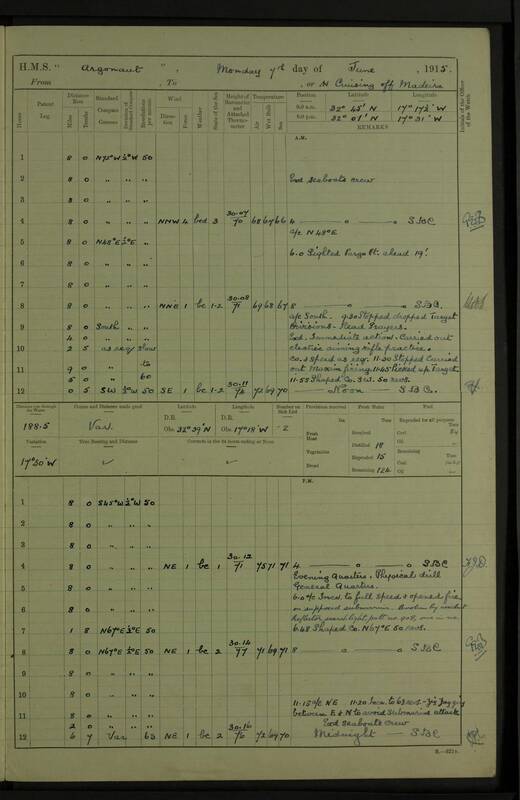 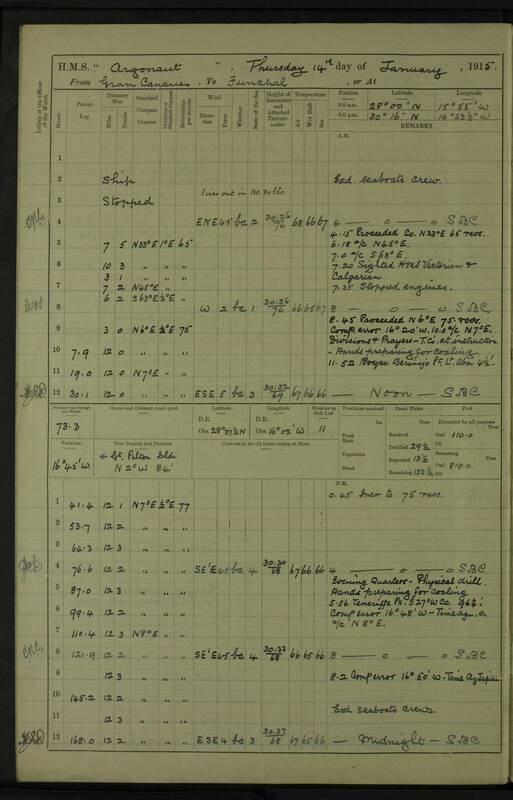 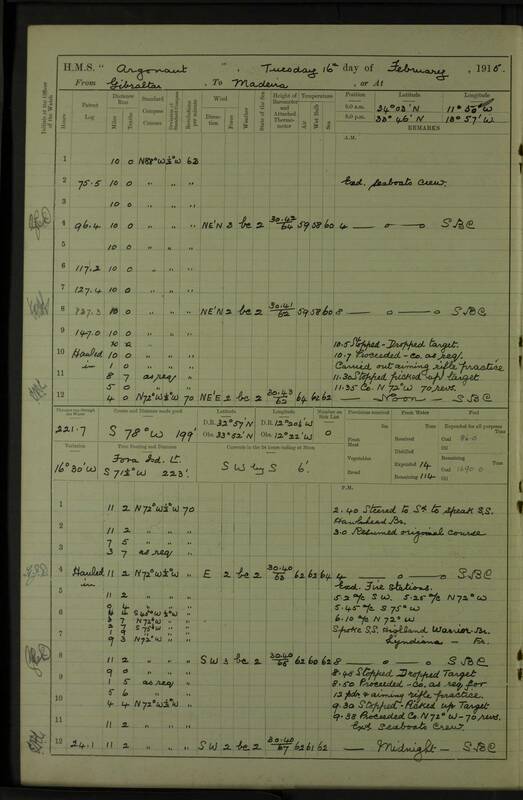 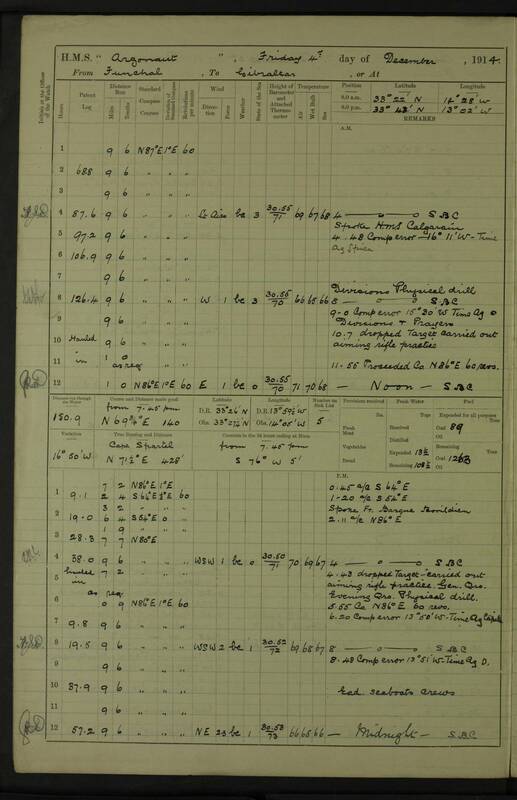 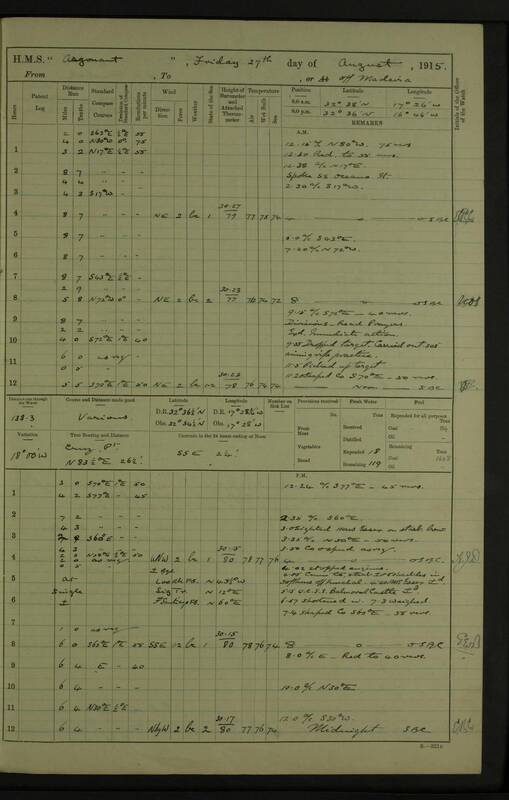 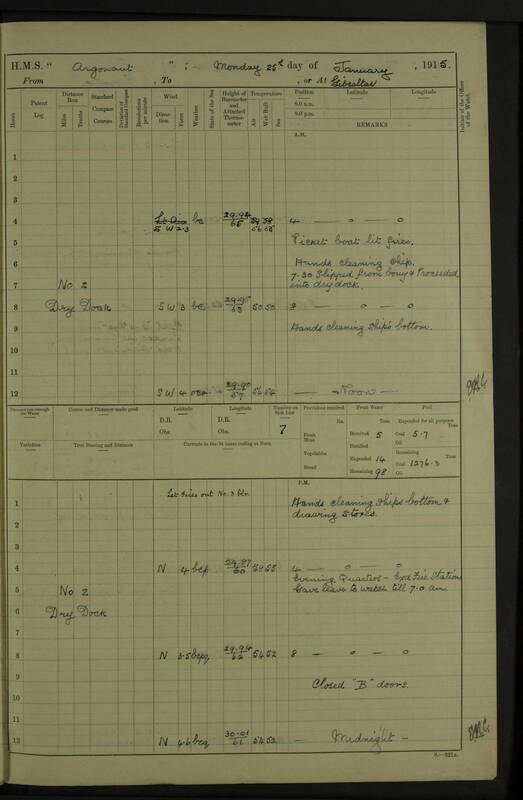 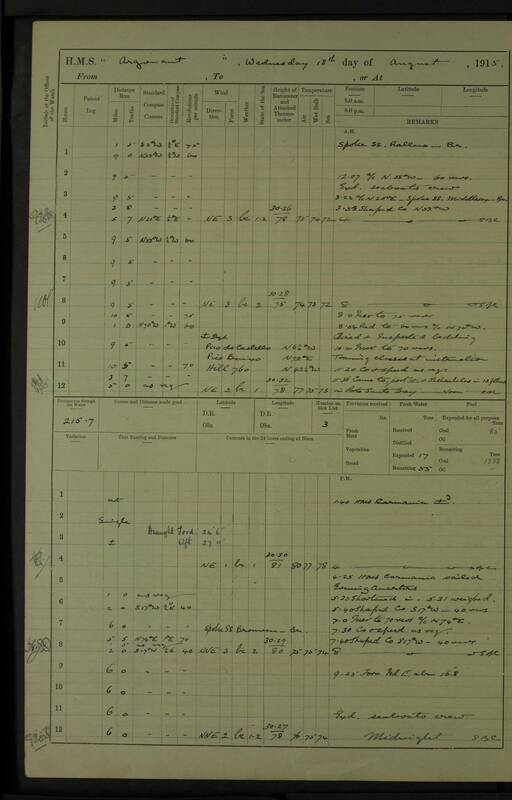 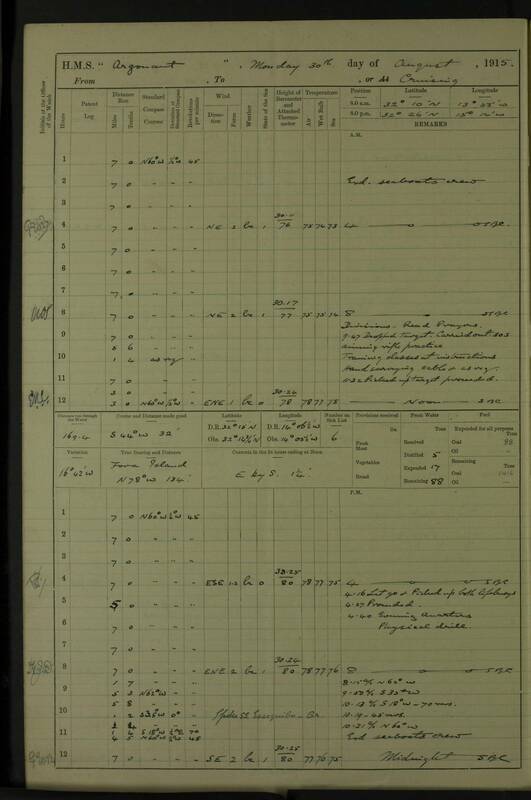 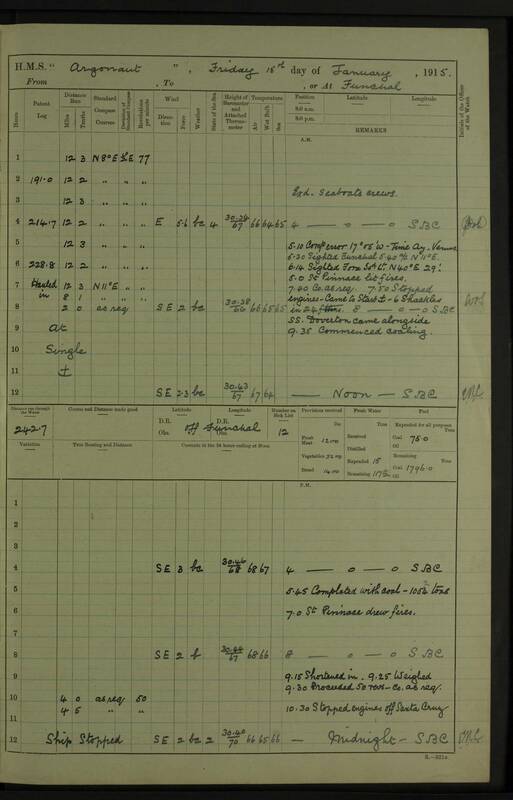 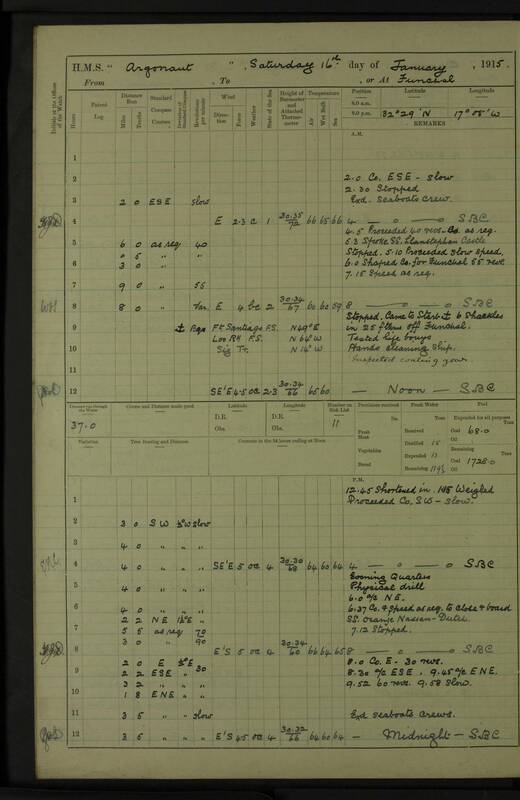 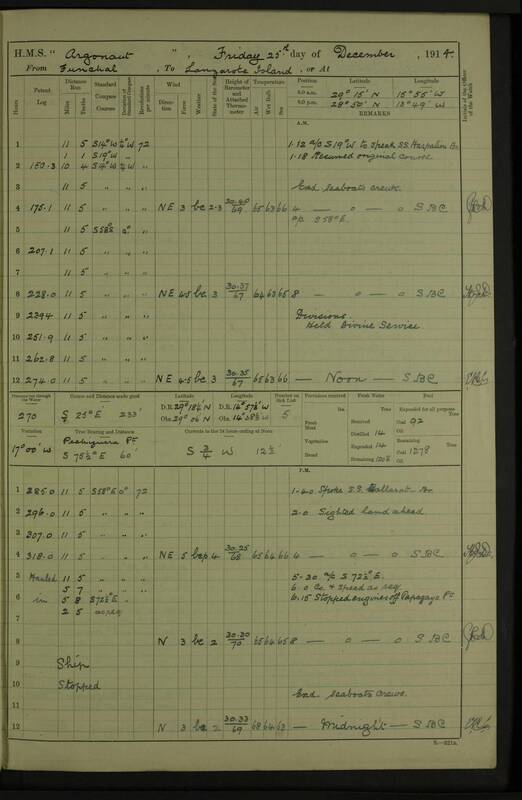 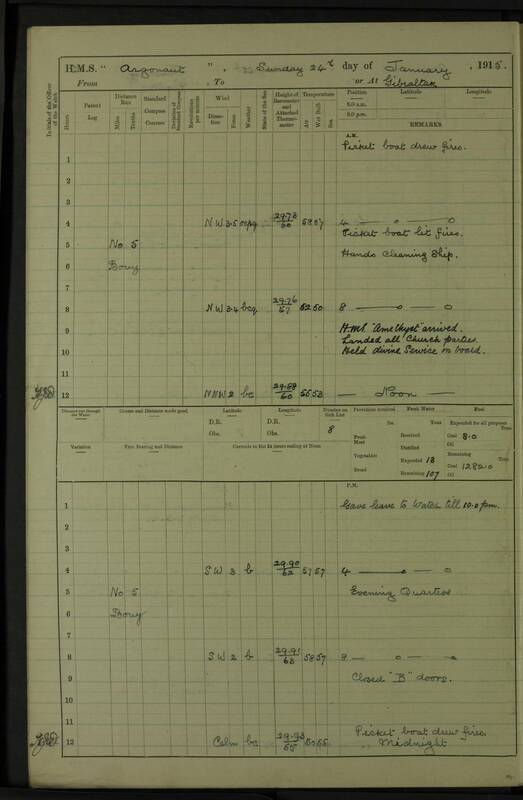 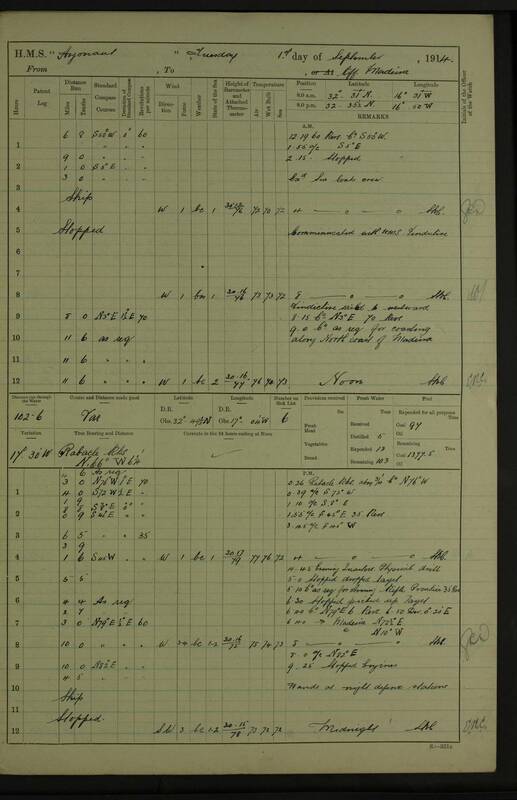 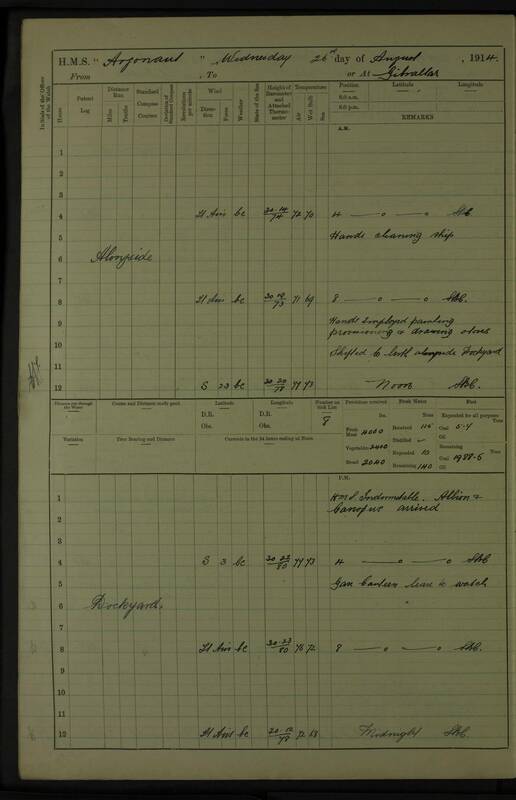 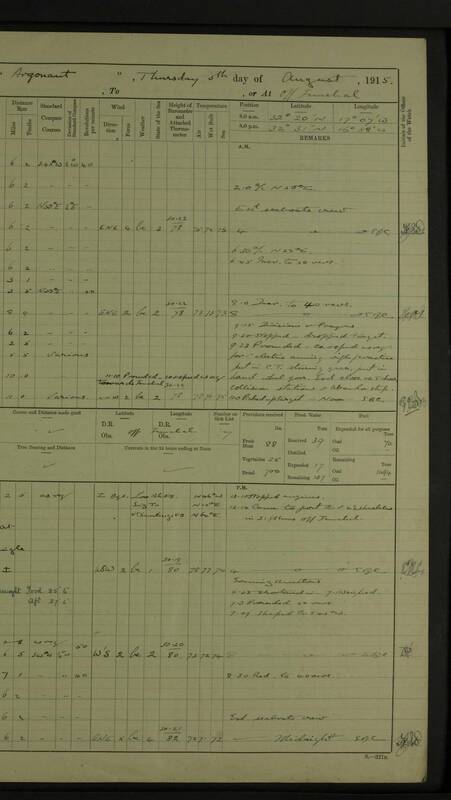 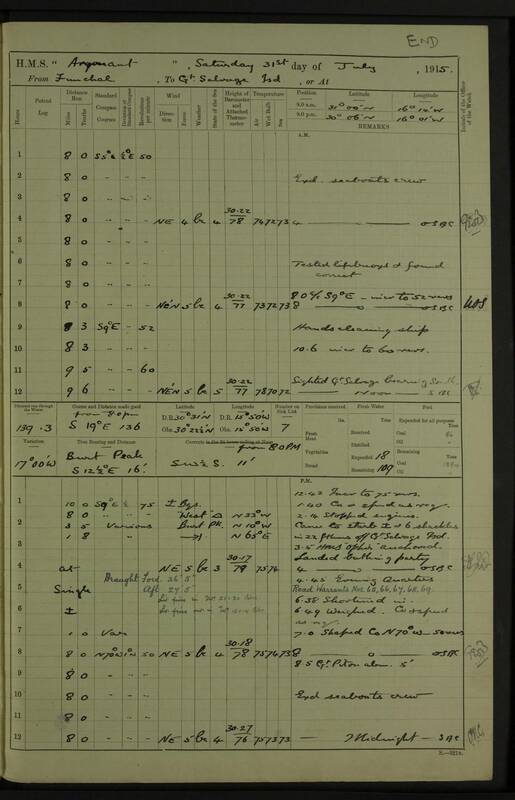 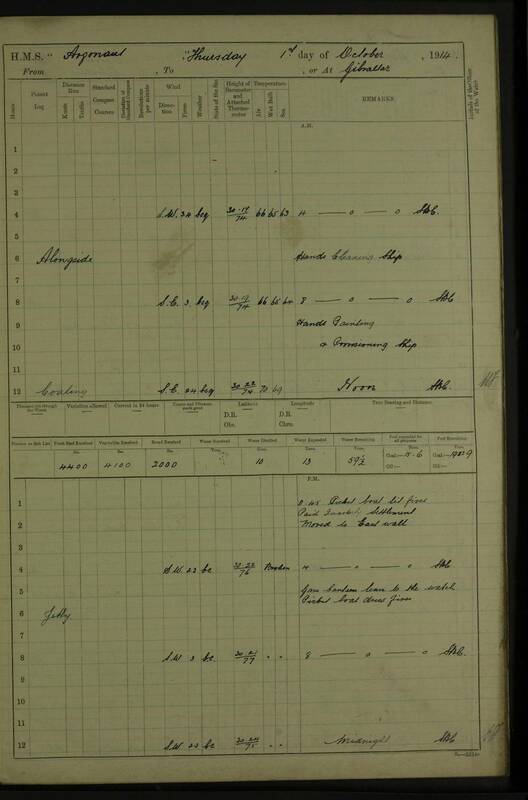 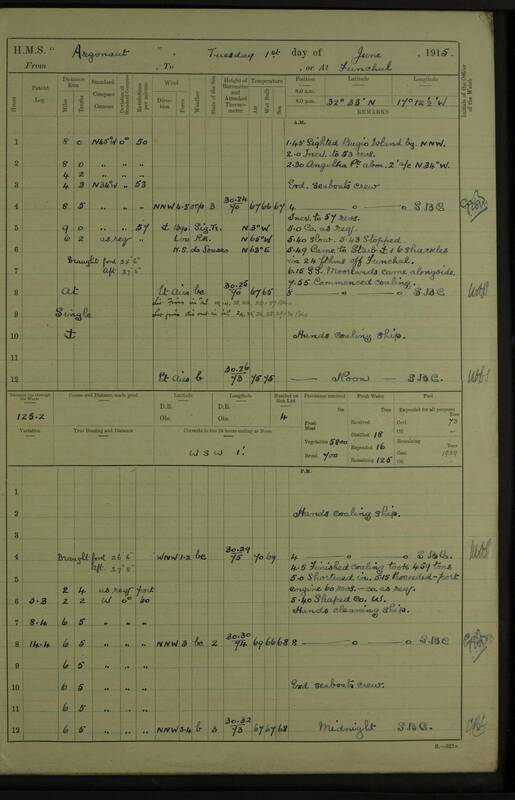 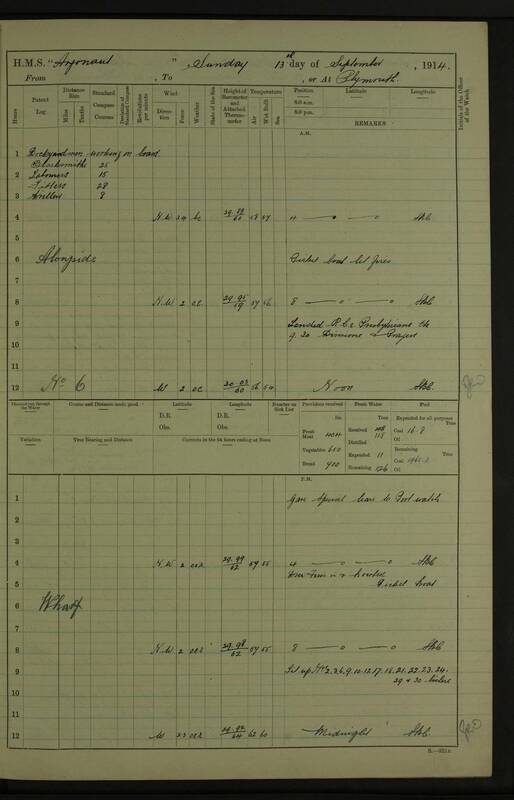 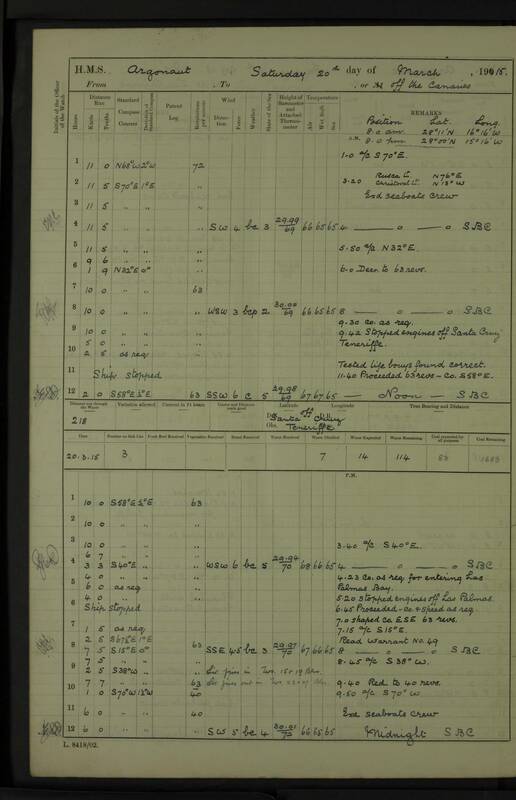 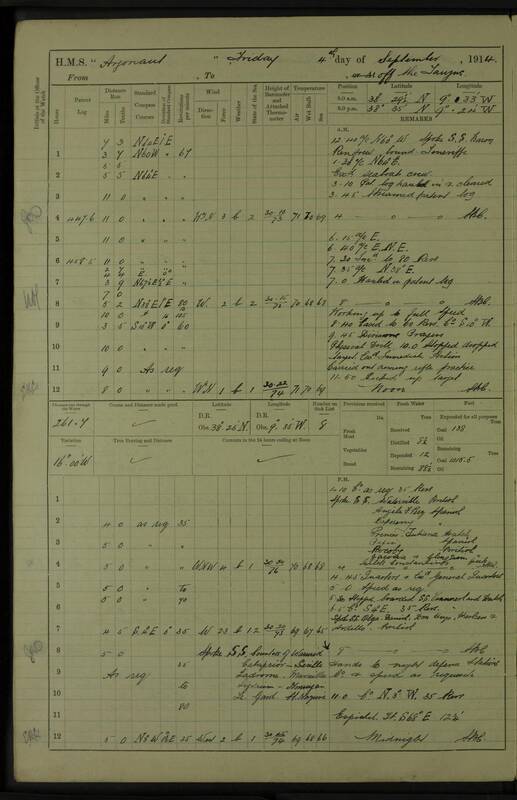 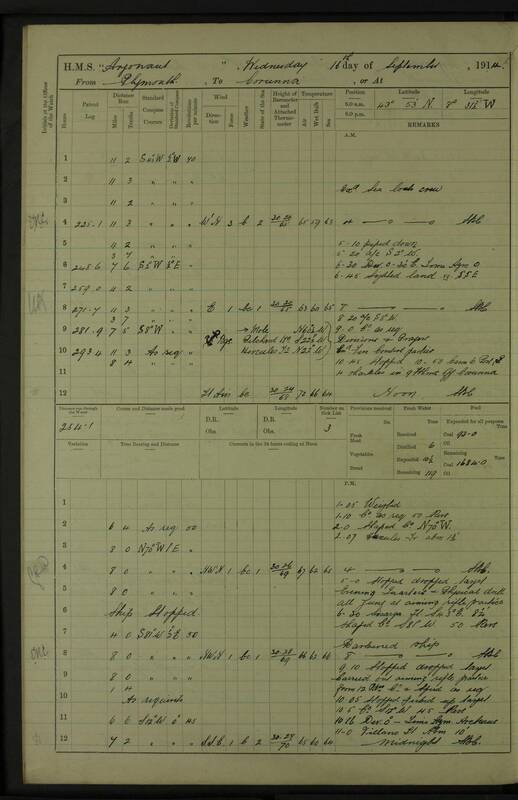 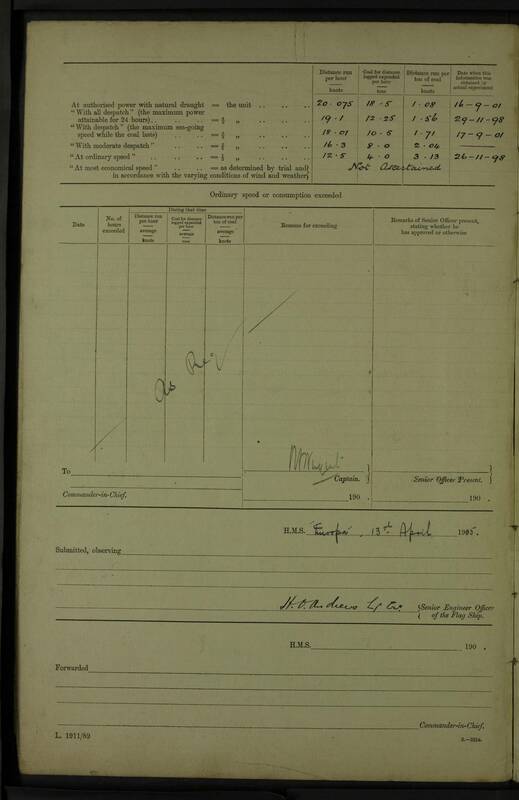 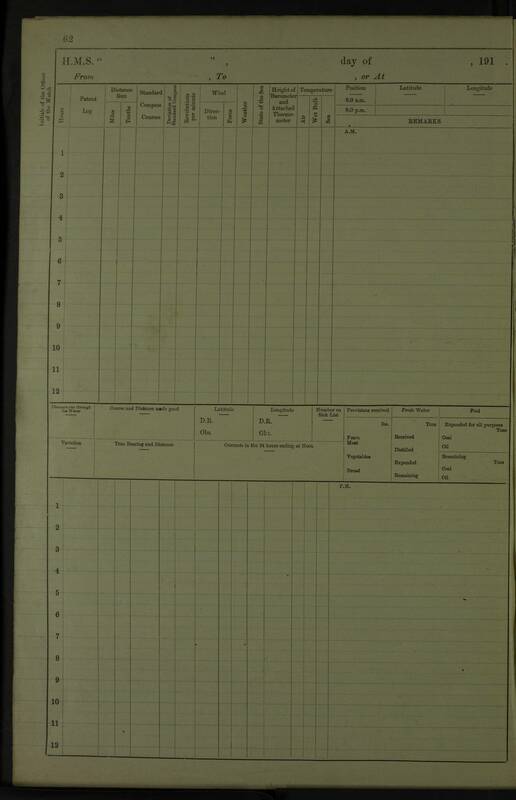 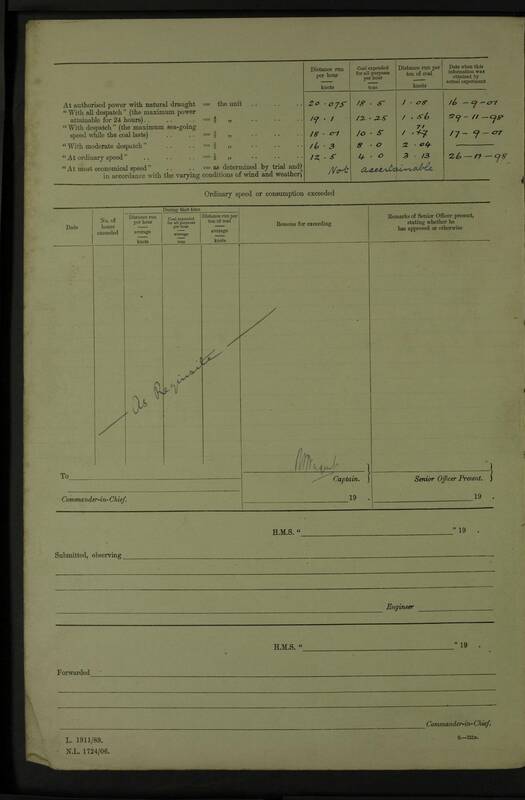 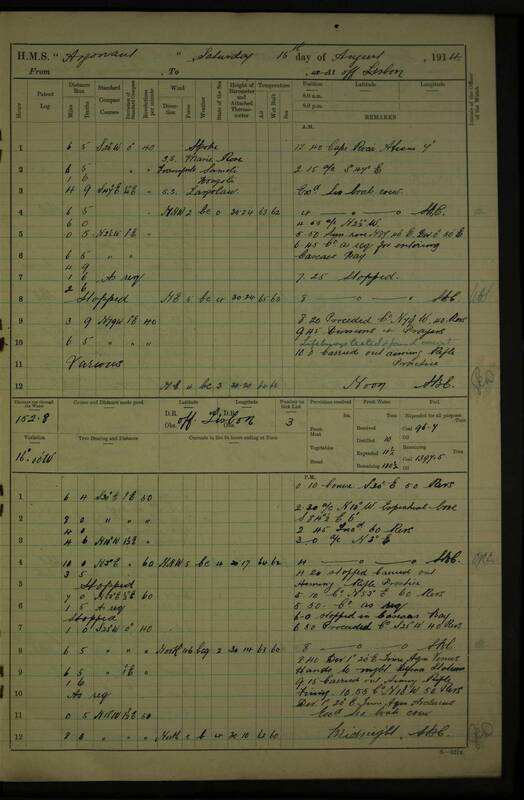 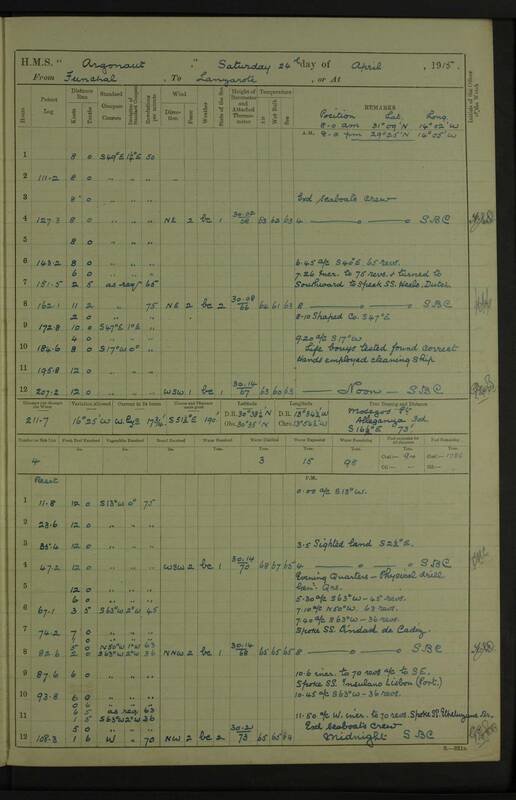 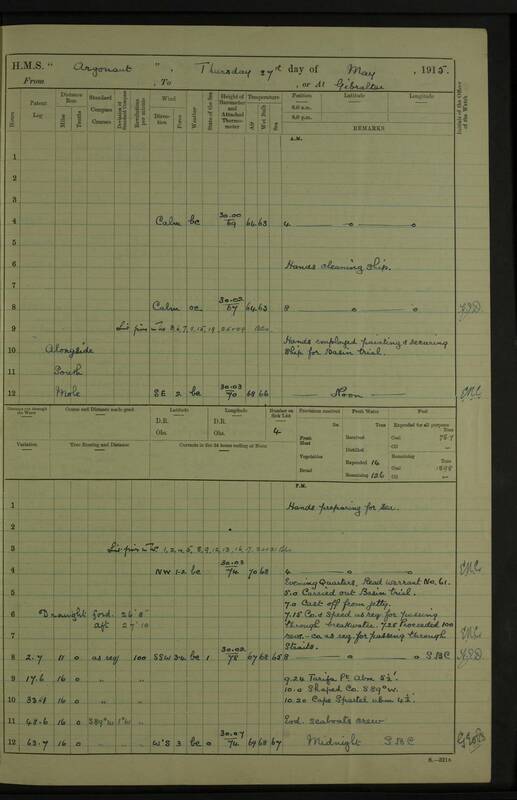 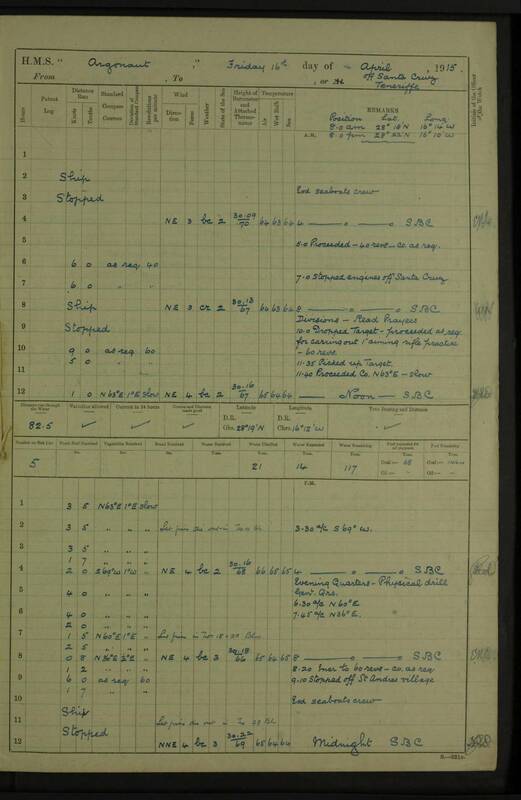 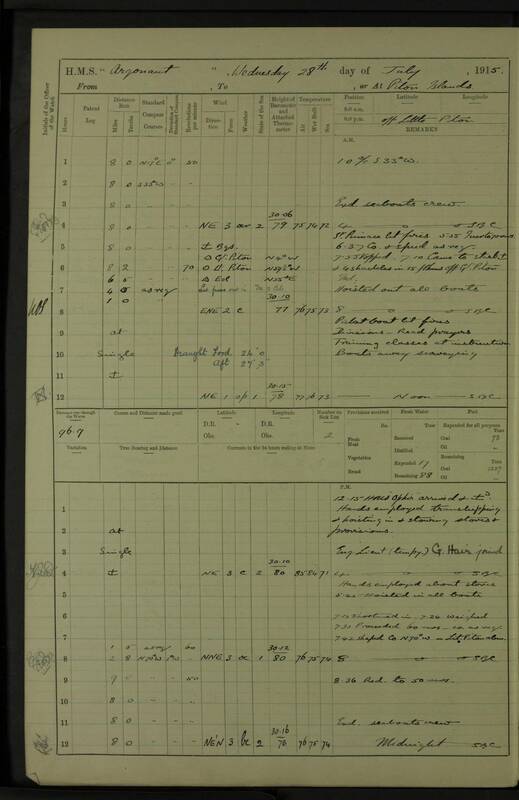 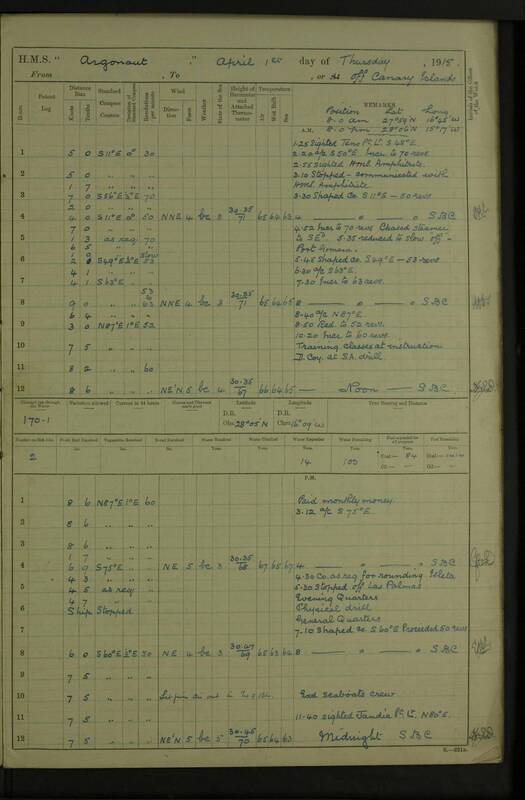 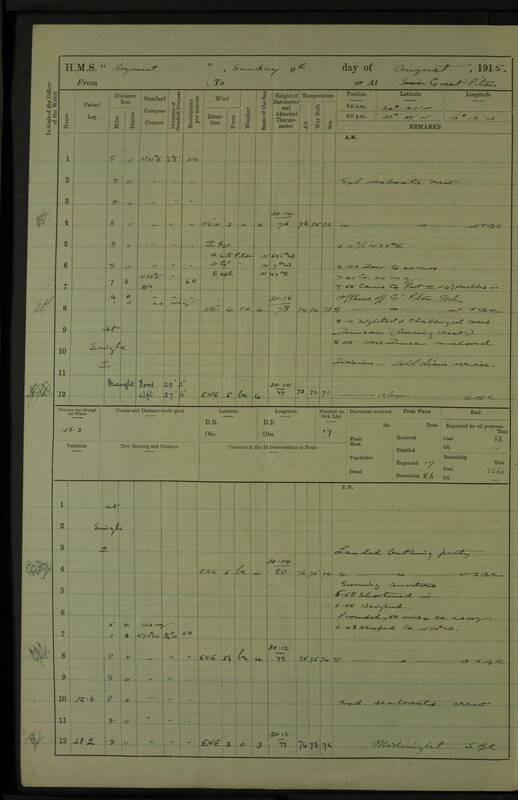 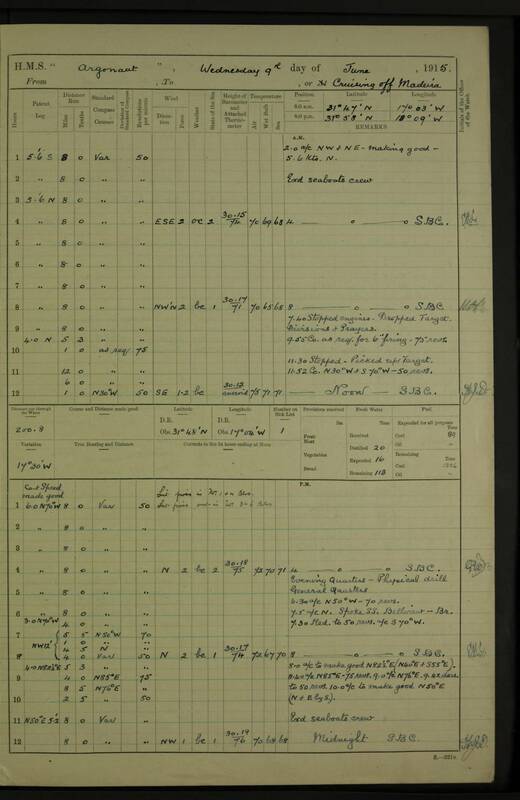 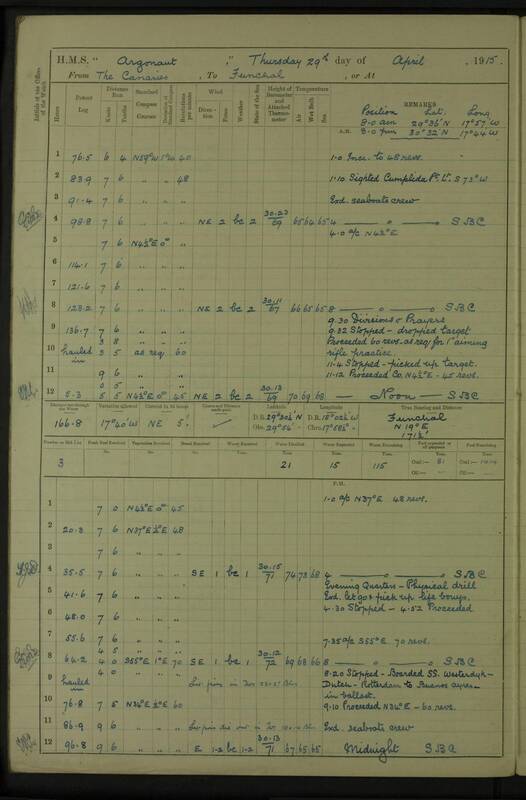 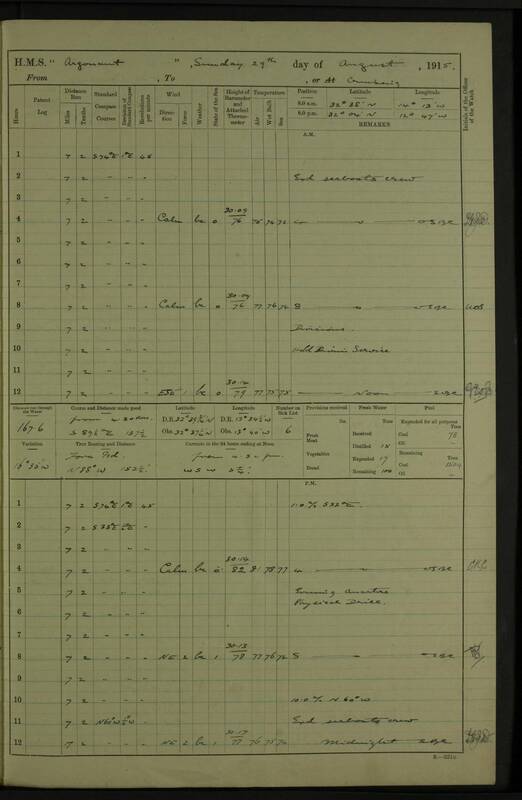 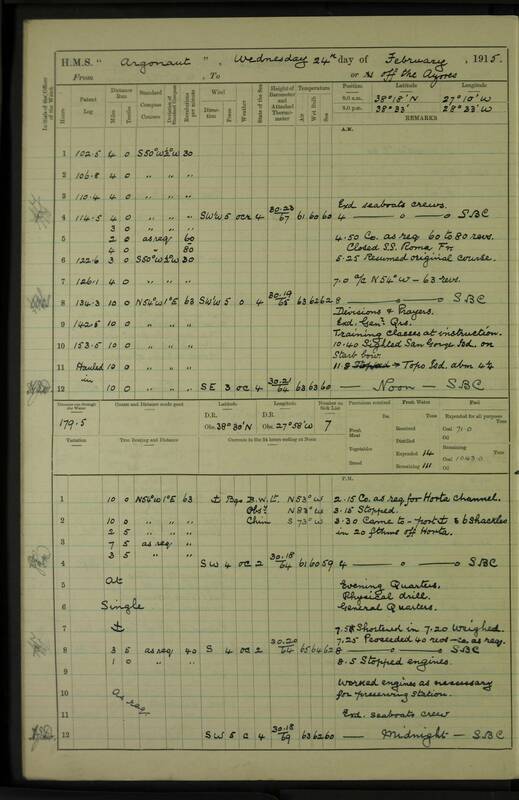 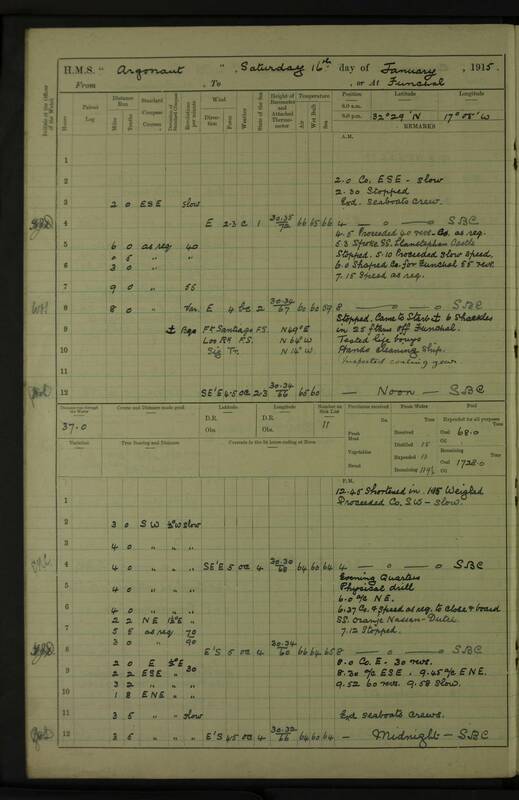 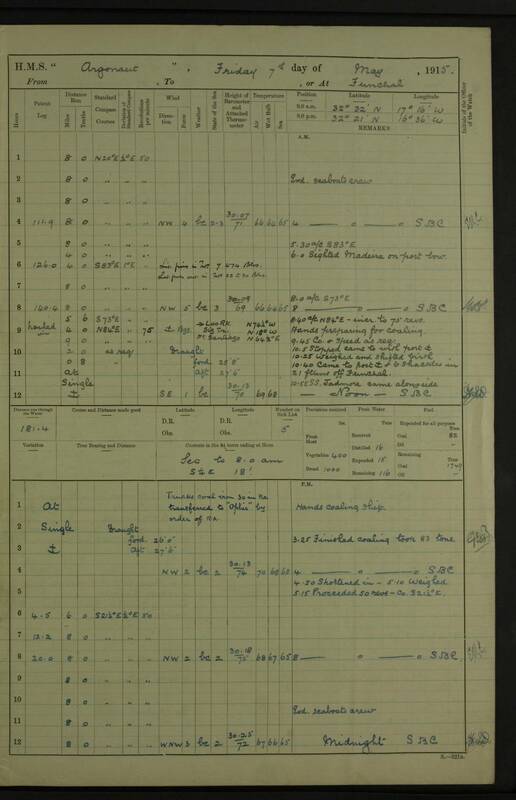 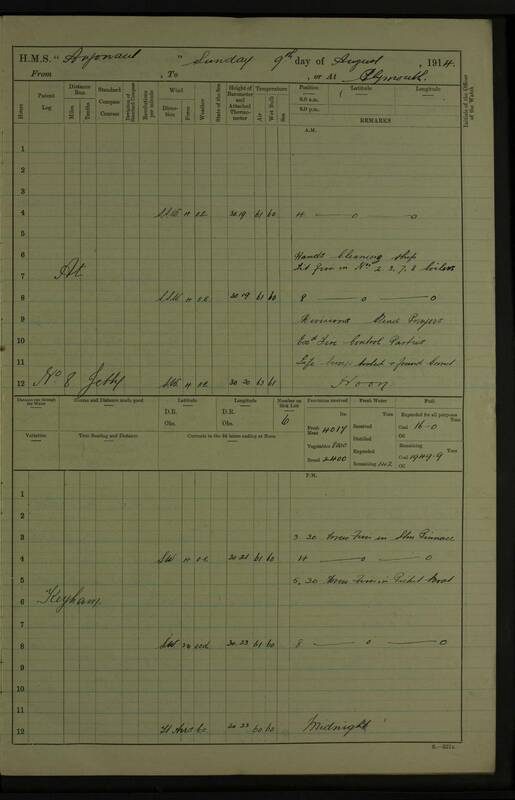 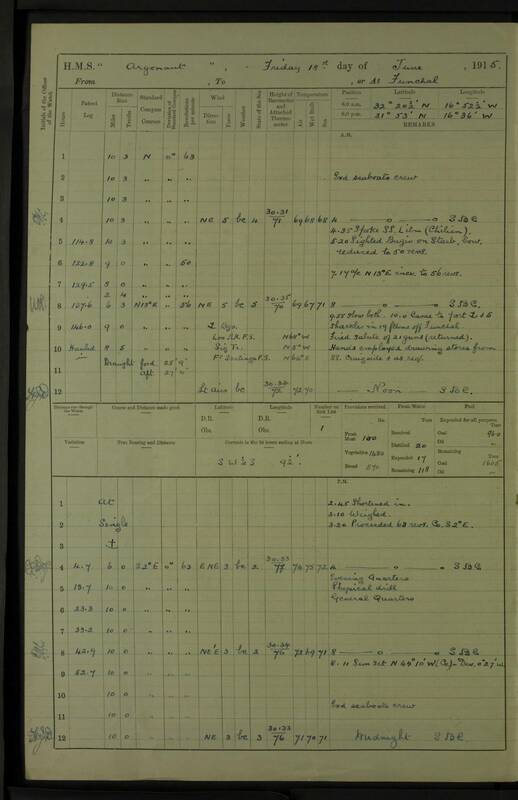 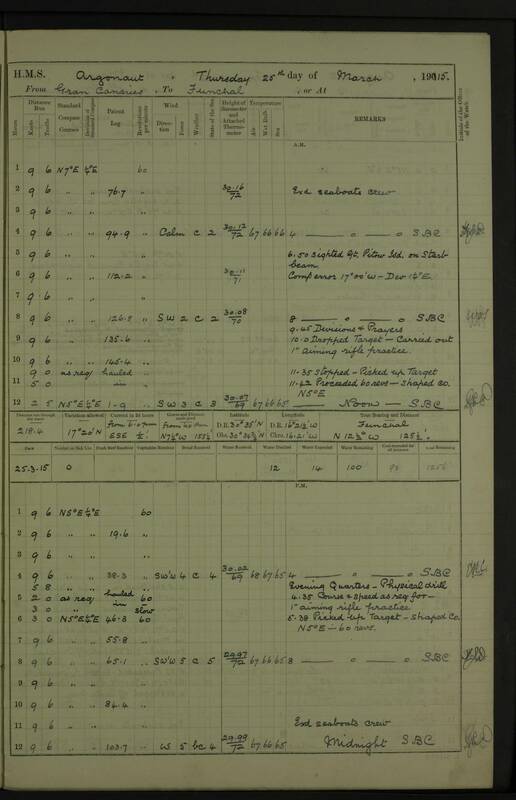 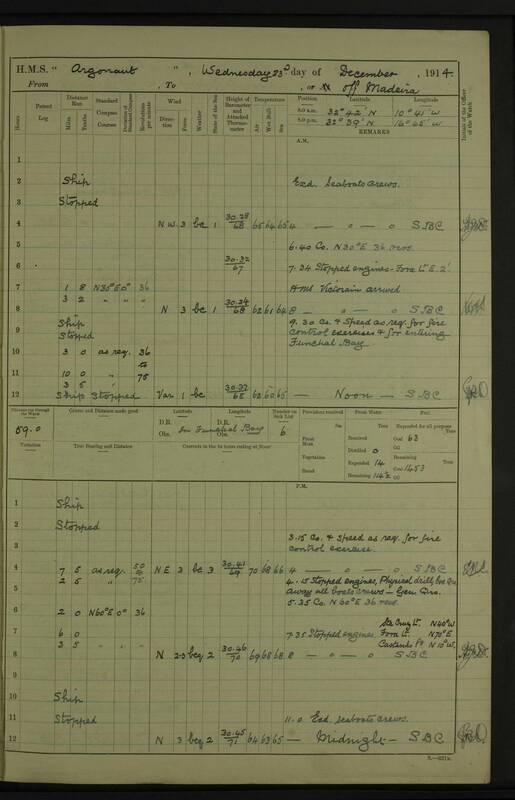 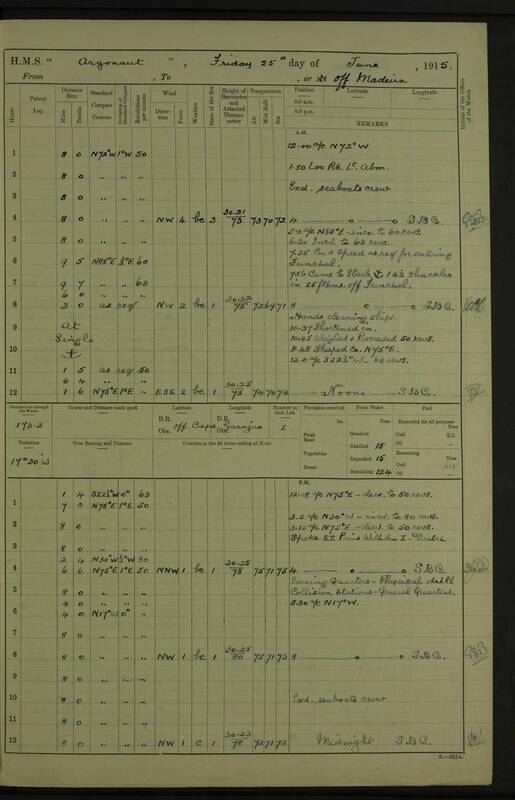 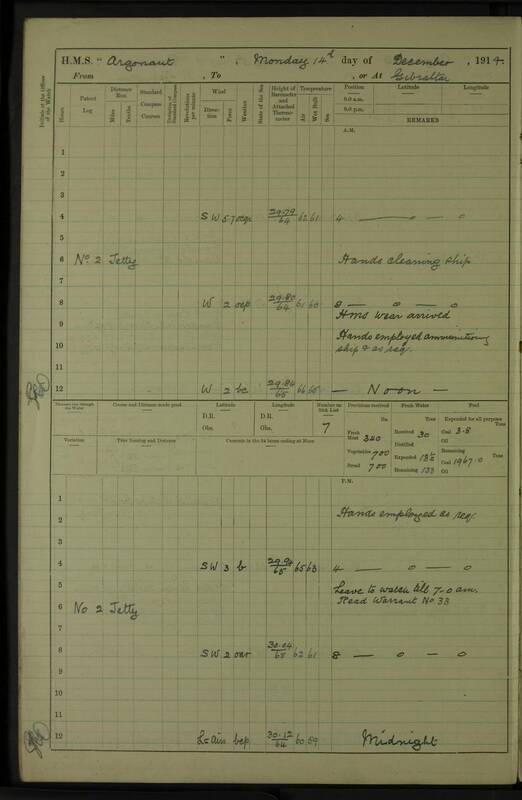 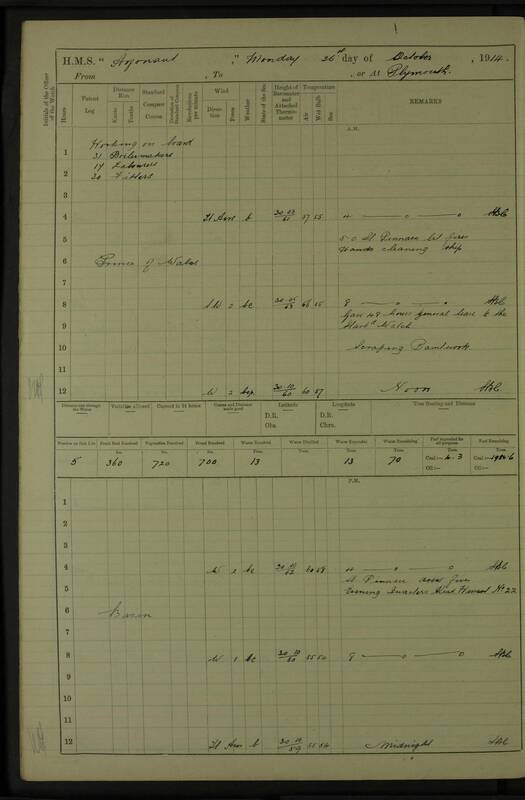 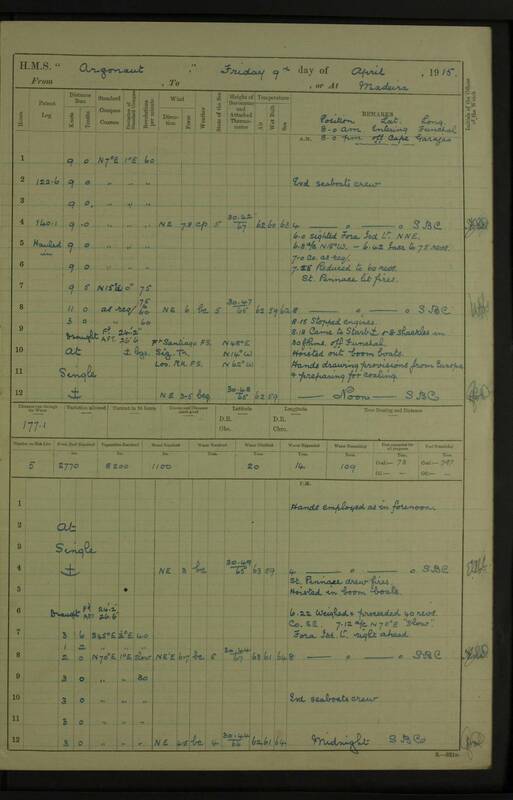 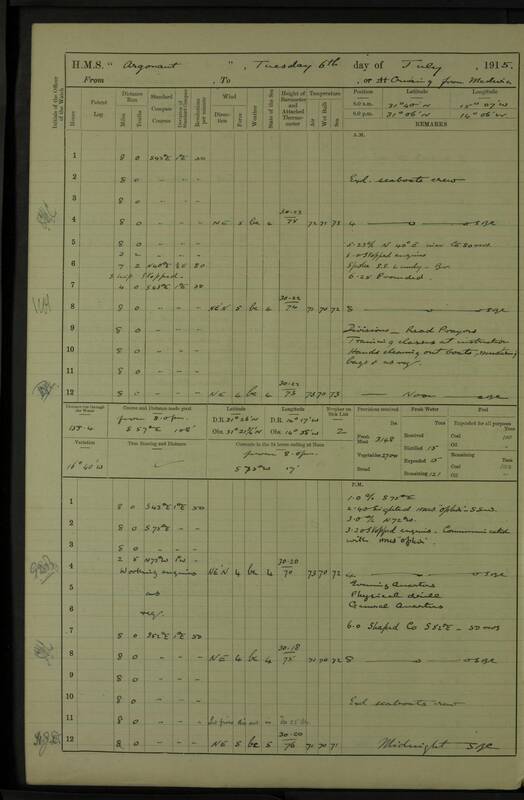 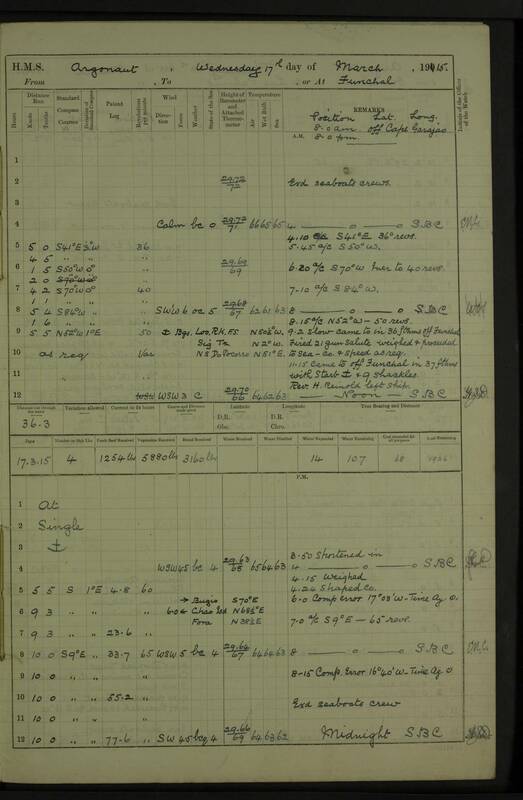 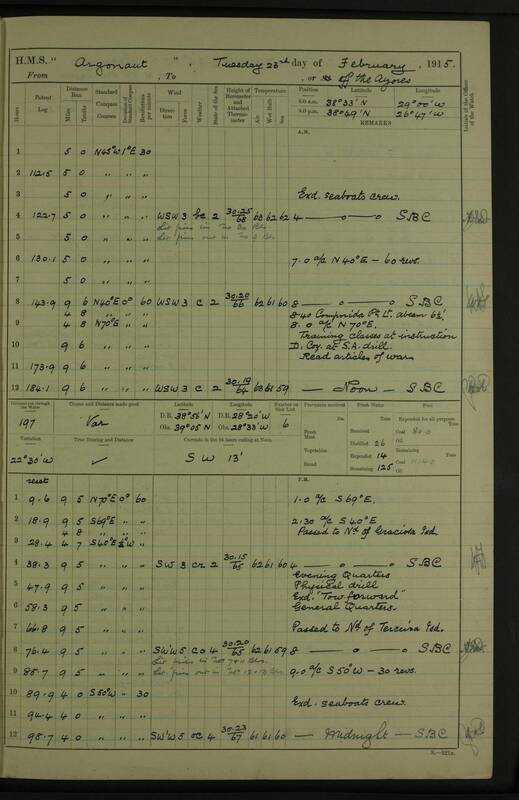 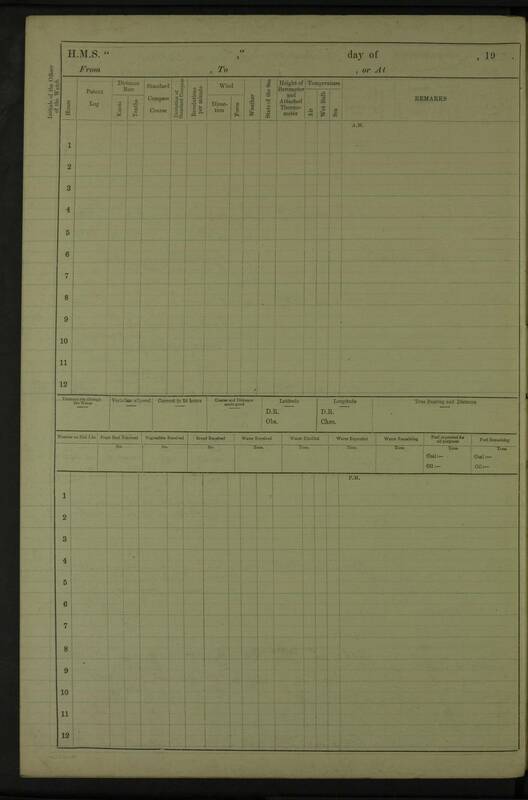 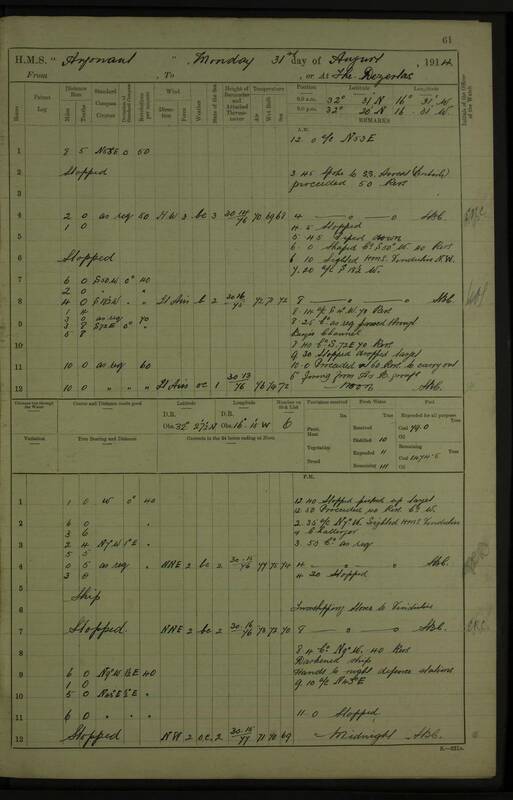 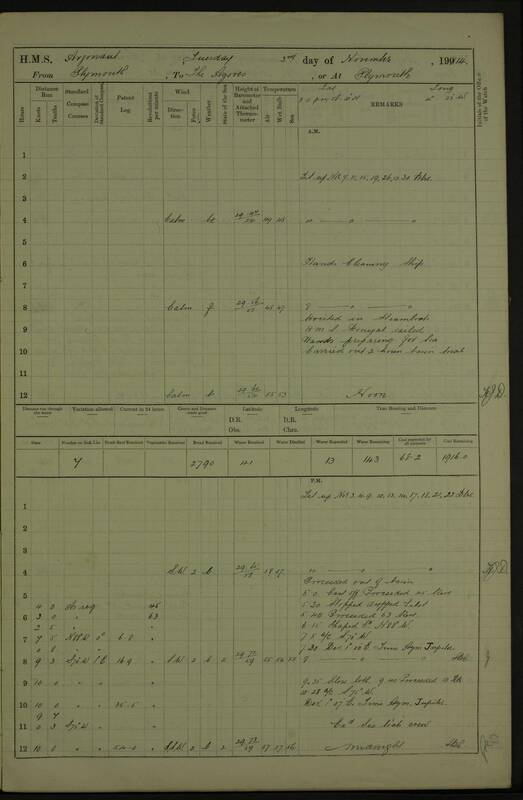 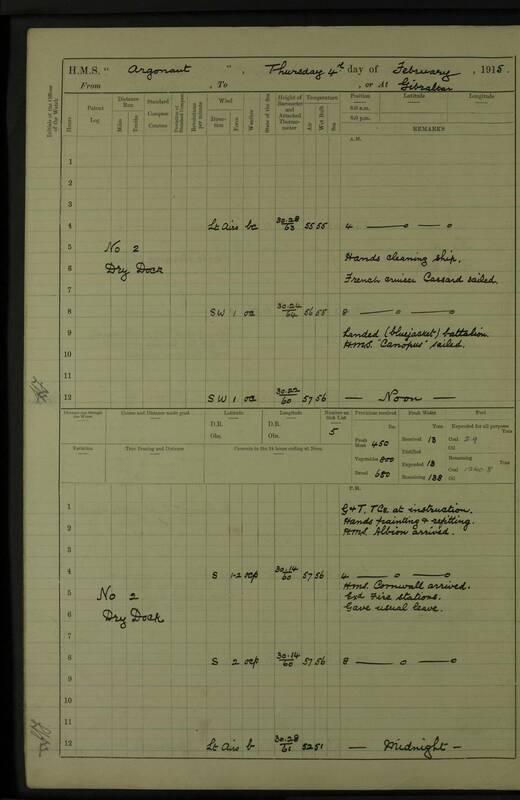 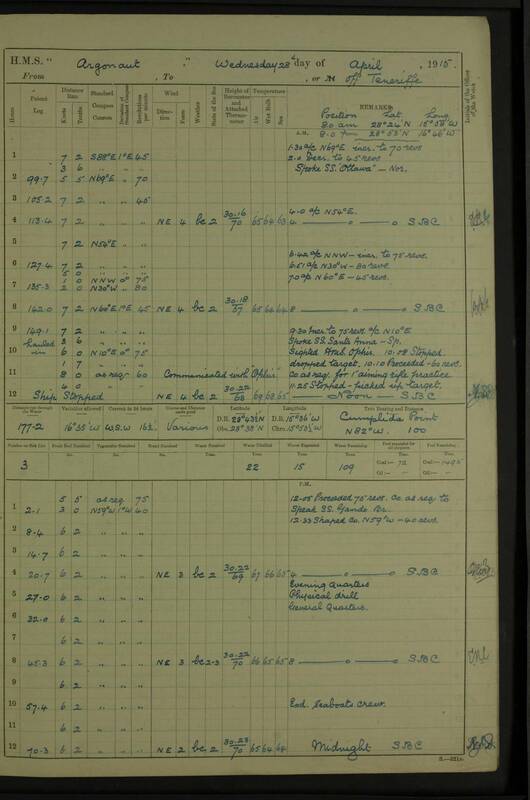 Copy of log of HMS Carmania from 22 Nov 14 to 28 January herewith also. 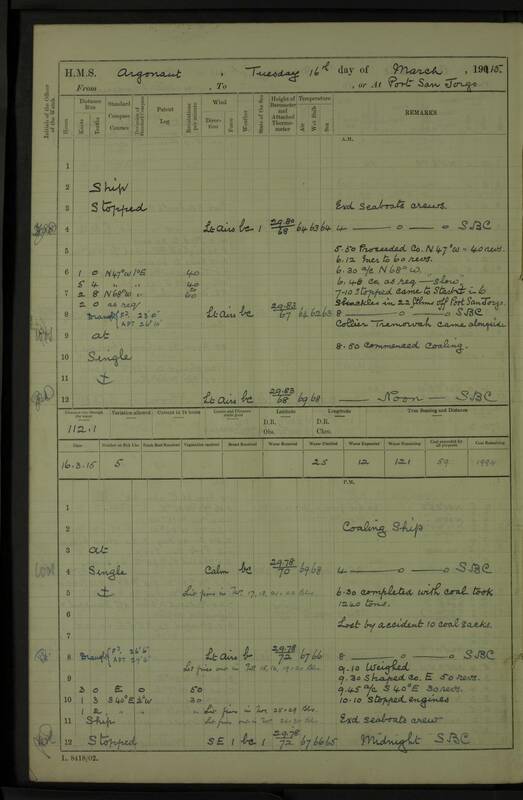 Accompanied by Lieut CE Finlay RNR as witnessing officer I boarded the British SS Arosa of London 1759 [tons] net, T. Watkins master. 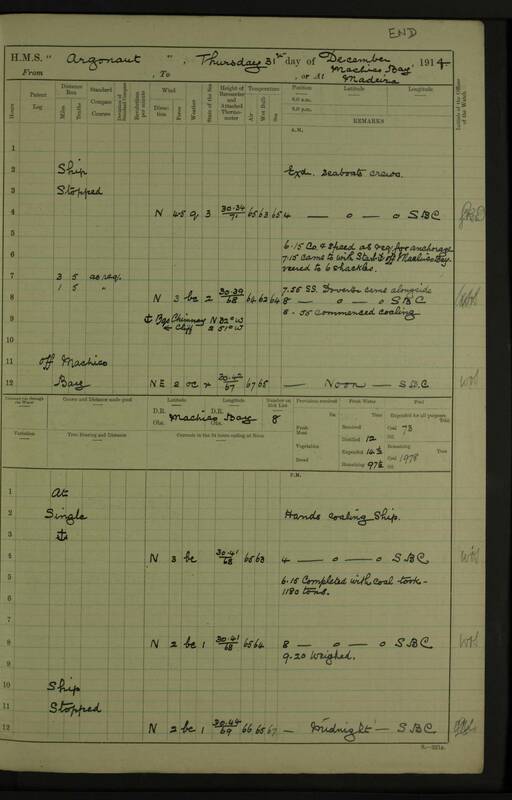 She is owned by the Fargrove SN Co Ltd and has a crew of 27 - 24 British and 3 Russians. 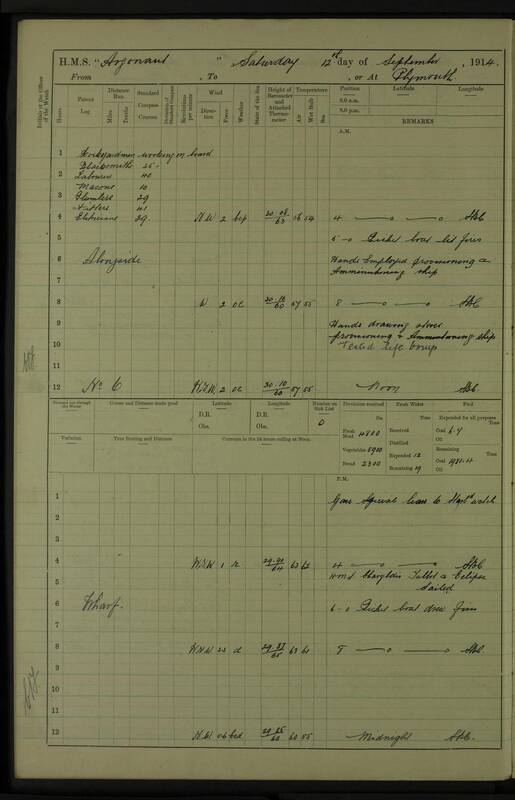 I interviewed the Russians and satisfied myself as to their nationality. 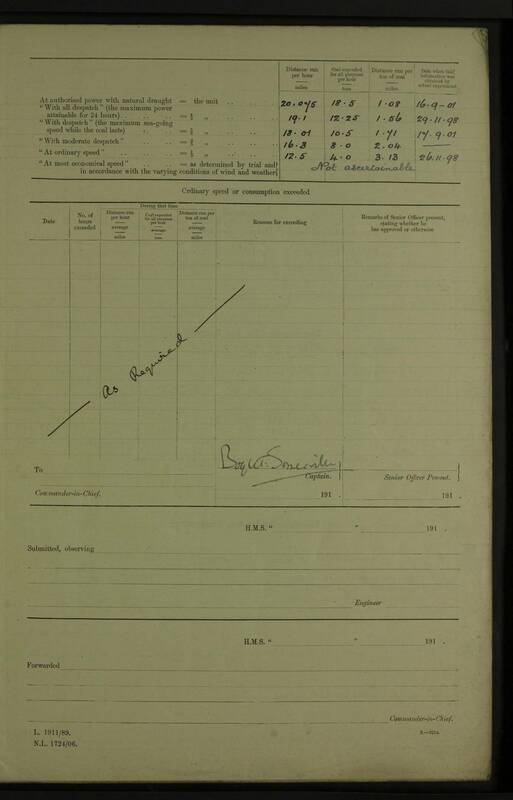 The ship's papers were correct. 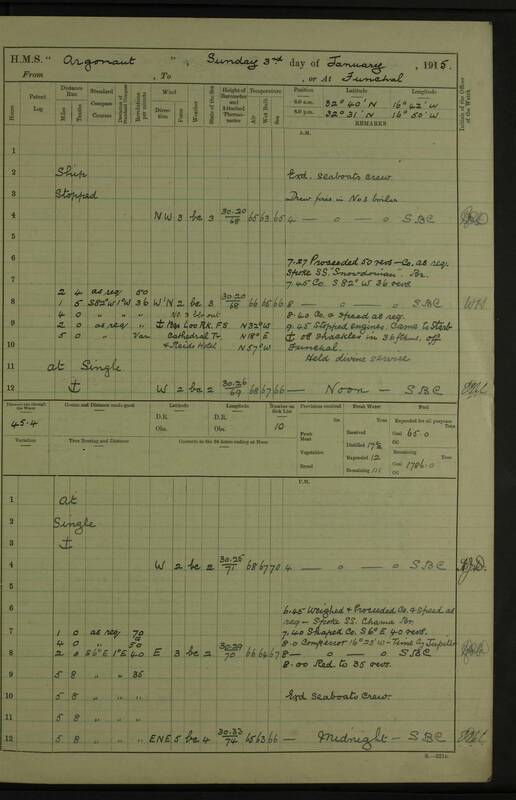 She is carrying a cargo of 4,750 tons maize from Rosario to London or ports on the West Coast of England at 45/- freight and is calling at Teneriffe for orders. 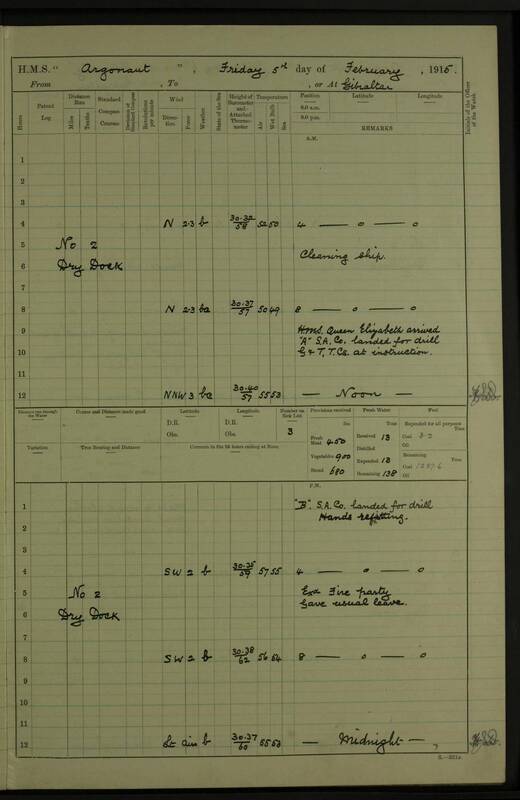 She left Monte Video on 8th March and reports having seen a British 3 funnelled cruiser and one auxiliary cruiser at St Vincent Cape Verde on 29th ult. 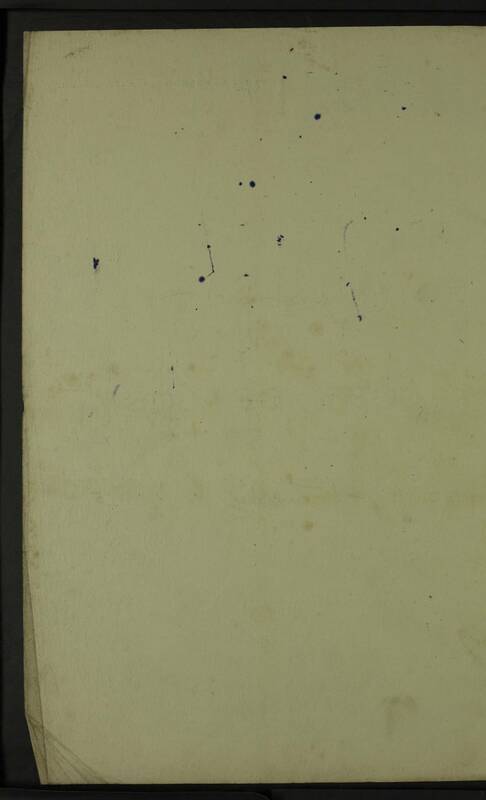 The master made no objection to the object of my visit. 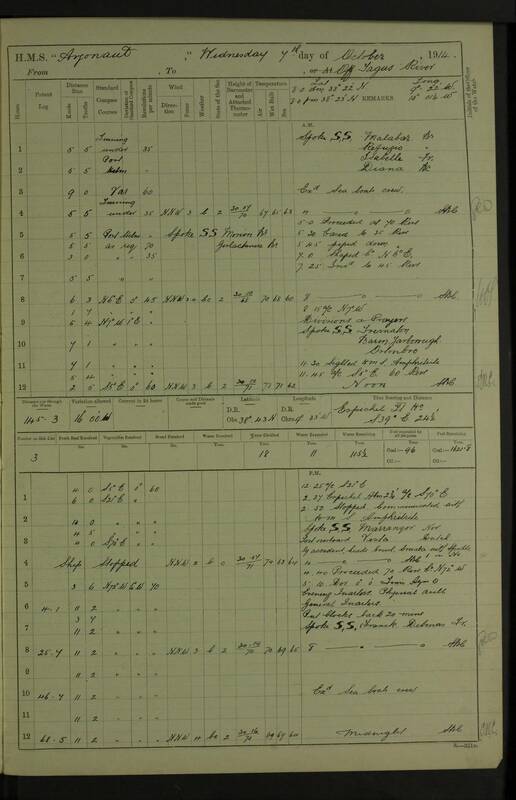 At 2.30 GMT today in Latitude 30 33 N and Longitude 17 43 W I visited the Dutch steamship Frisia, 4608 tons net, of Amsterdam, John M Kokman (master). 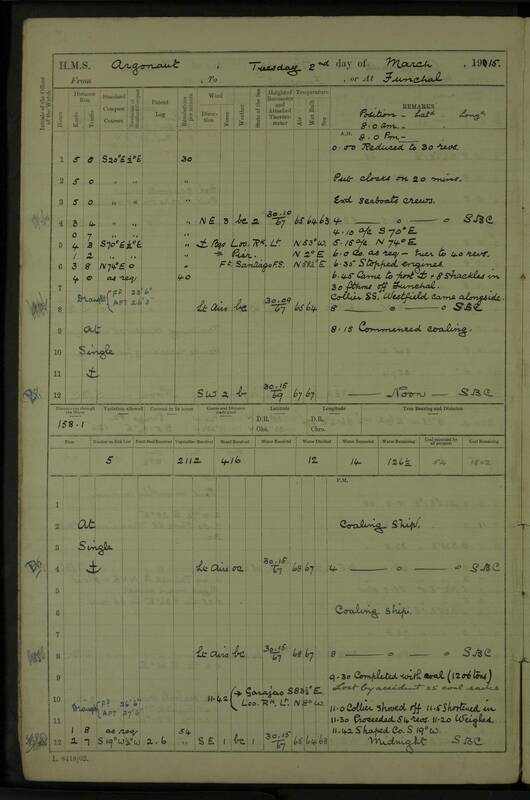 The ship is on a voyage from Buenos Aires, Montevideo and Pernambuco to Amsterdam via Lisbon, Vigo and Falmouth. She had 700 bags of English mail for Falmouth and her cargo consisted of coffee, raw hides, beef tallow consigned to G Denering and Nederland Overseas Trust Coy and Van Rees Amsterdam Liquidatekas. 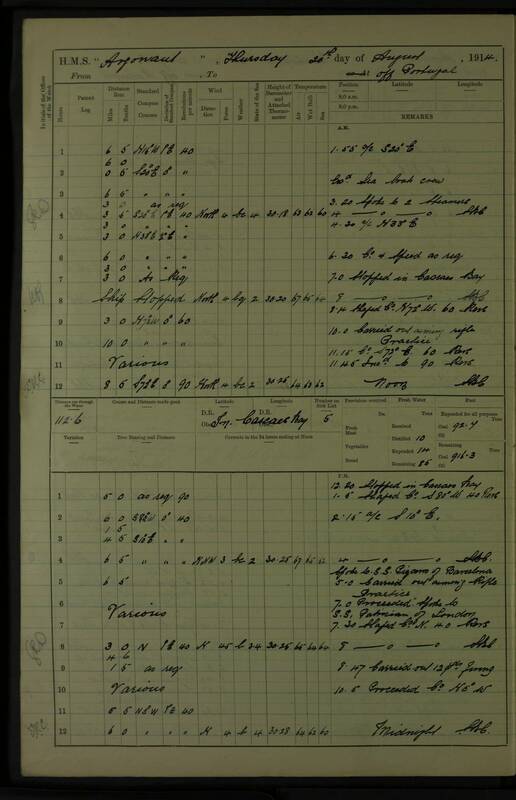 Thirty eight first class passengers, amongst whom Col Leroy Lewis on military service, fifty eight second class, and eight hundred and thirty one third class passengers. 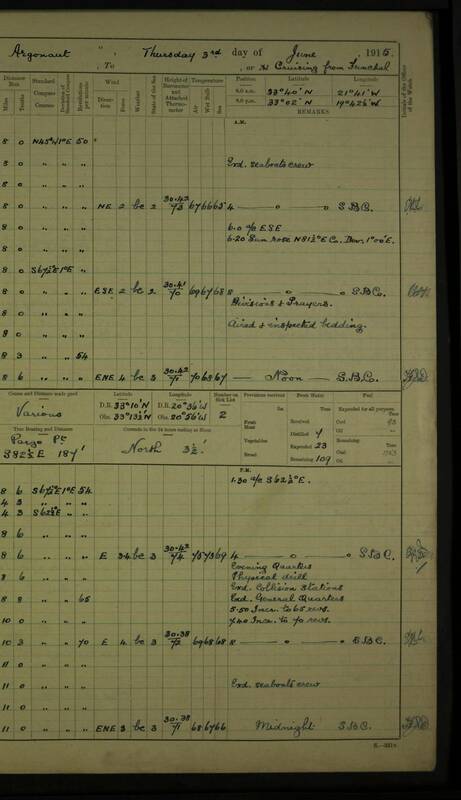 Three of the passengers were German namely - Count Von Westrop, aged 47, from Rio Janeiro who was made prisoner. 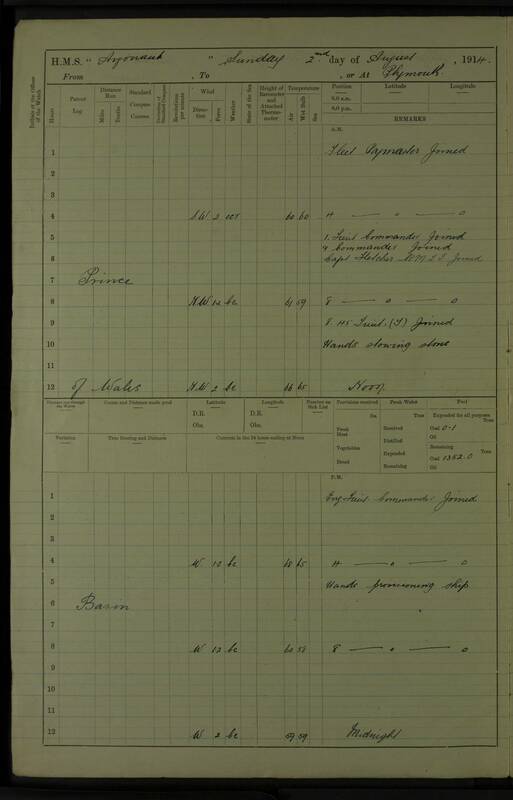 IJ Wittman, aged 77, looked like an artisan, from Buenos Aires, and a woman - Ide Schlieve aged 37 from Santos. 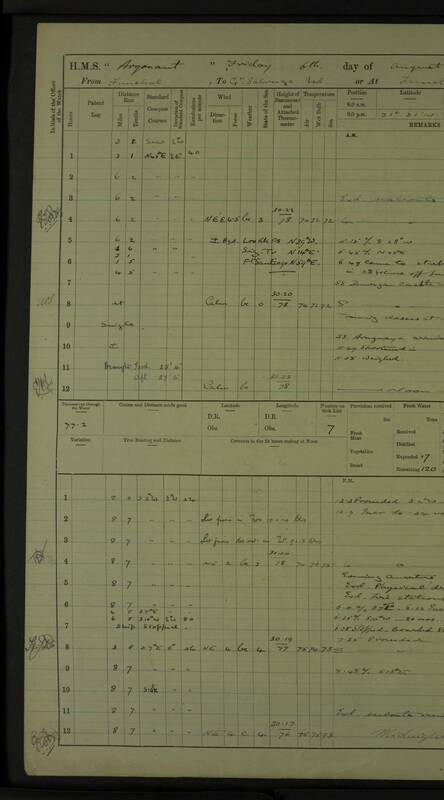 None of them could speak English. 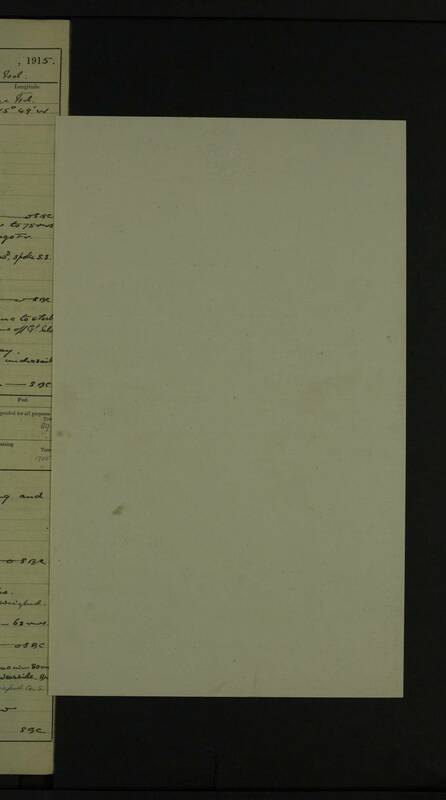 The crew which I mustered consisted of 177 including the master, all of whom were presumably Dutch both by their looks and the ship's papers which were in order. 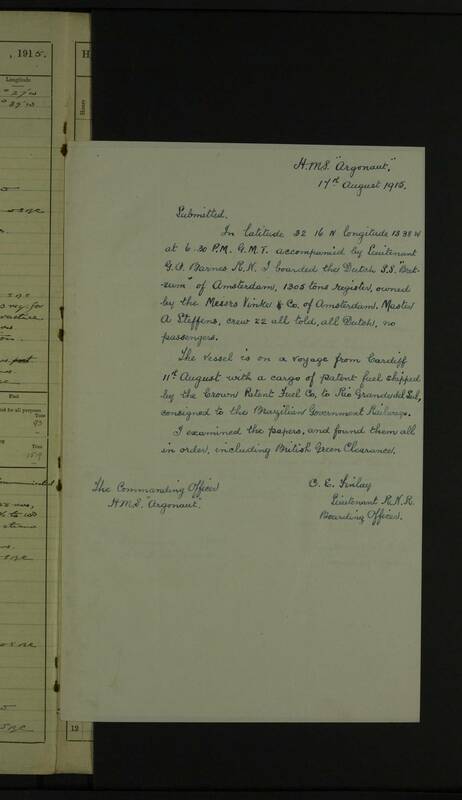 The master informed me that he saw HMS Bristol in dry dock at Rio Janeiro but that otherwise he had seen no warships and had nothing of interest to report. 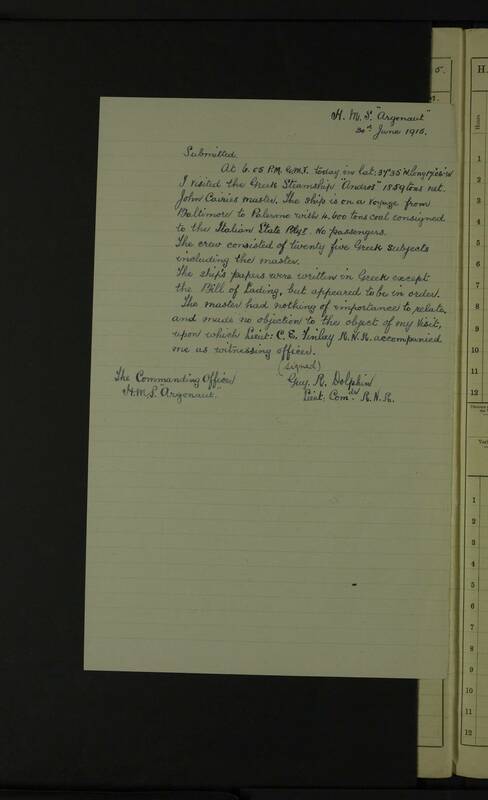 He made no objection to the object of my visit, on which Lieut CE Finlay RNR accompanied me as witnessing officer. 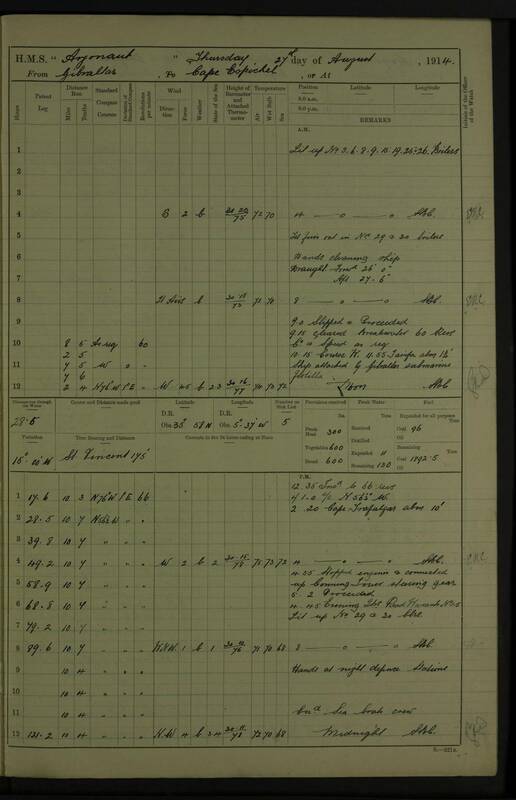 At 2.45 pm today in Latitude 31 34 N Longitude 14 37 W I visited the Chilean steamship Gorbernador Bories, 3049 tons net, of Punta Arenas, H Olsen master. 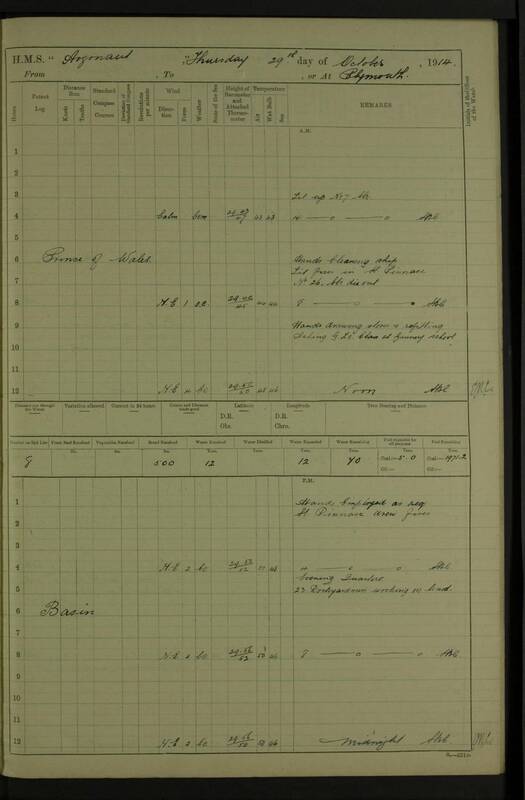 The ship is on a voyage from Bahia Blanca to Amsterdam via Teneriffe, C De Verde Islands and the English Channel with 6,300 tons of wheat consigned to the American Consul Amsterdam; she carries no passengers. 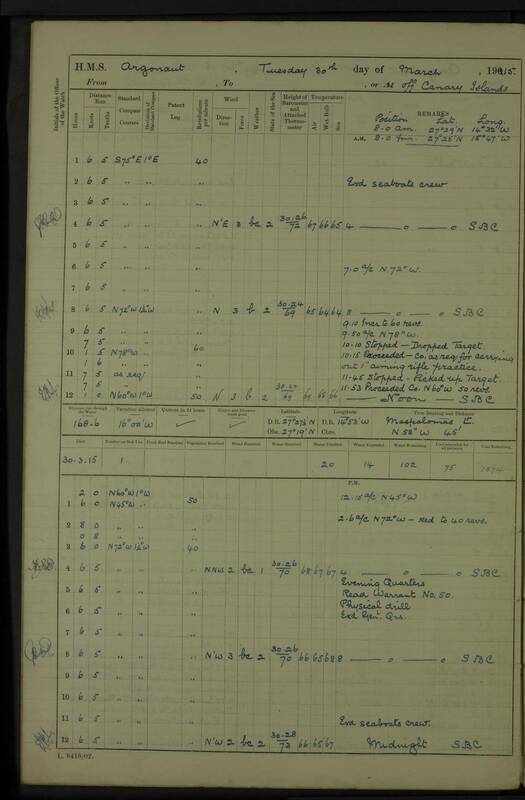 The crew numbered 44 including the master of mixed nationality, none of whom were Germans. 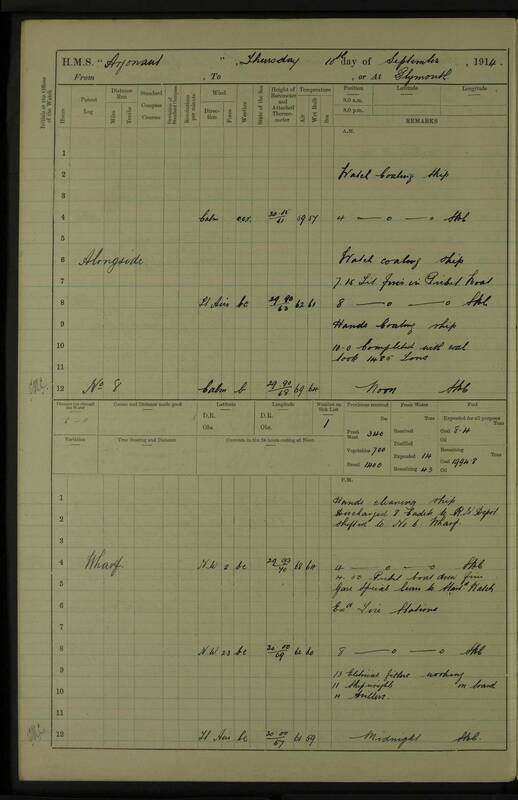 The ship's papers were correct. 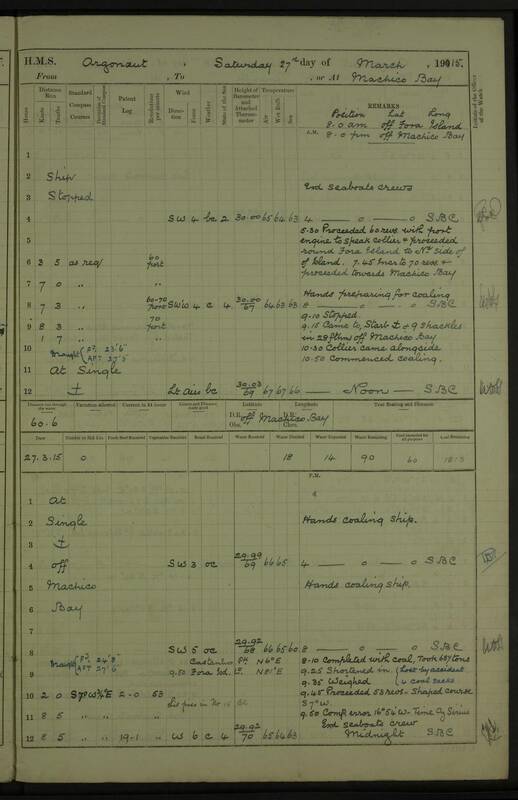 She had been boarded by Lieut Ward RNHM Armed Cruiser Ophir off Teneriffe on the 30th May last. 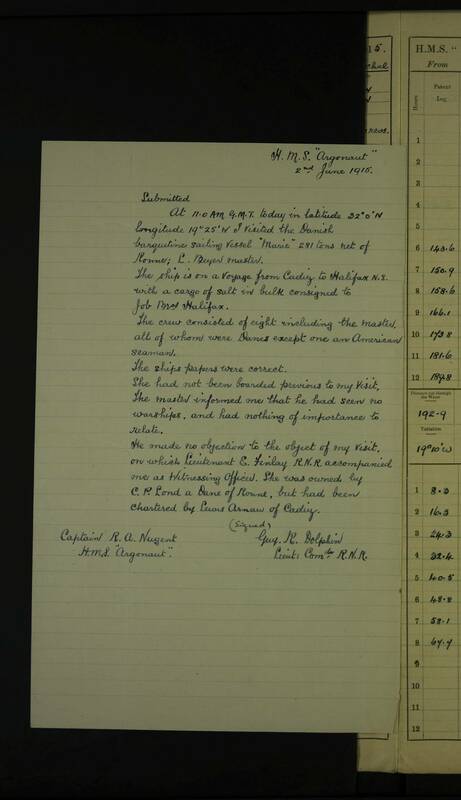 The master made no objection to the object of my visit, on which Lieut Finlay RNR accompanied me as witnessing officer. A ship of the same name was lost off the Shetlands in December 1913; this ship was bought from Messrs TJ Harrison, Liverpool, and was formerly named Senator but had been renamed Gorbernador Bories. 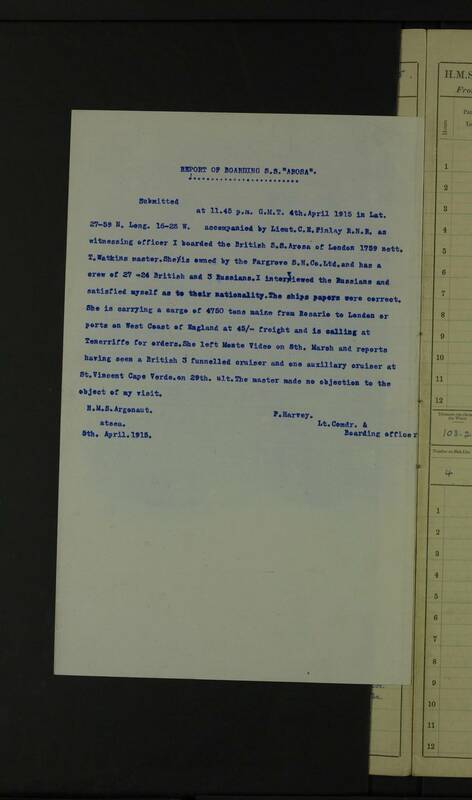 The bill of sale was dated 1914. 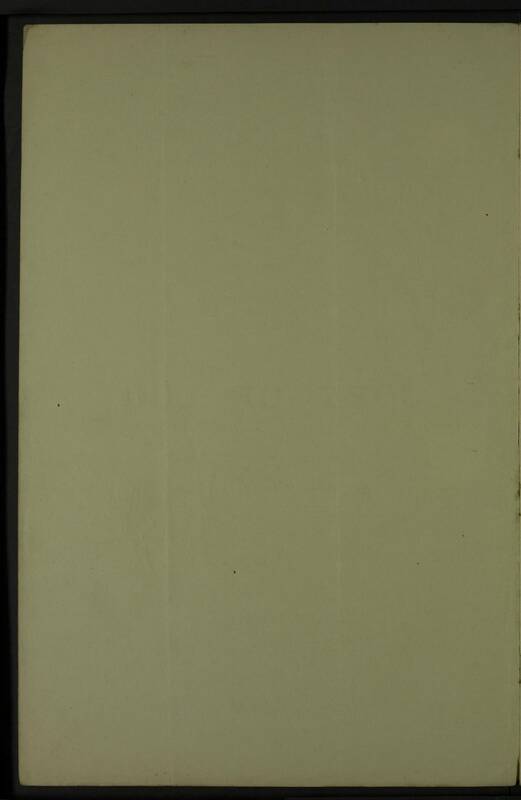 The master had nothing of importance to relate. 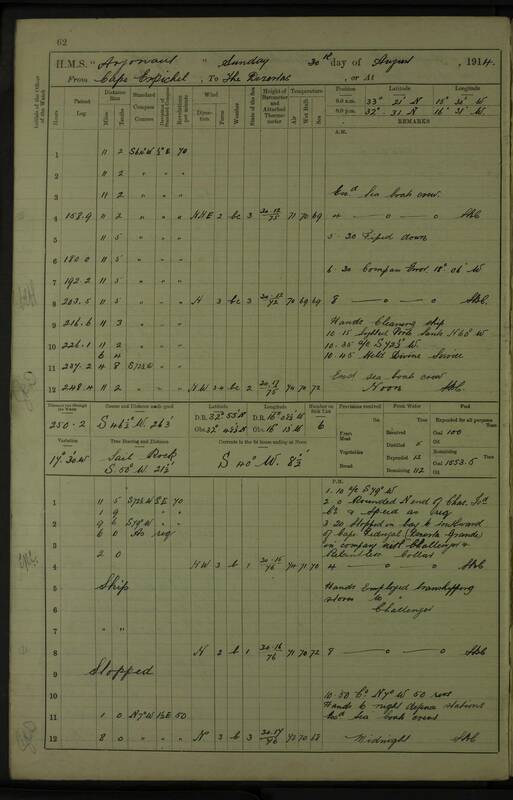 At 11.0 AM GMT today in latitude 32 0 N longitude 19 25 W I visited the Danish barquentine sailing vessel Marie, 281 tons net, of Ronne; L. Beyer master. 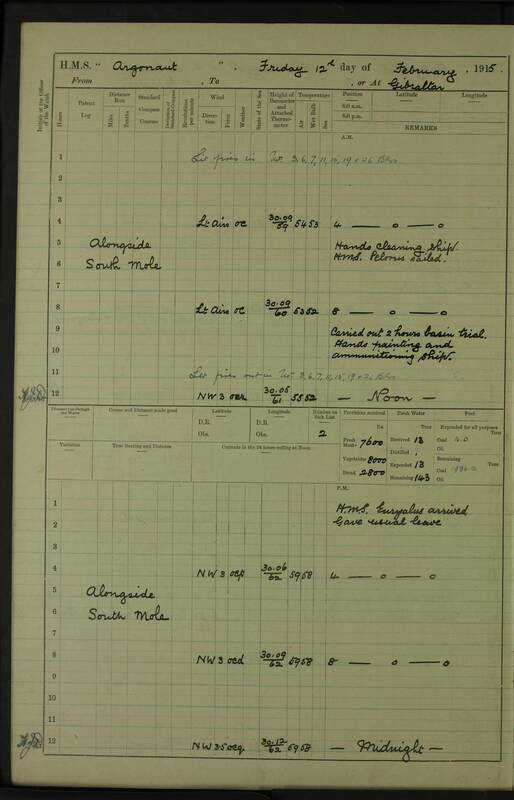 The ship is on a voyage from Cadiz to Halifax NS with a cargo of salt in bulk consigned to Job Bros Halifax. 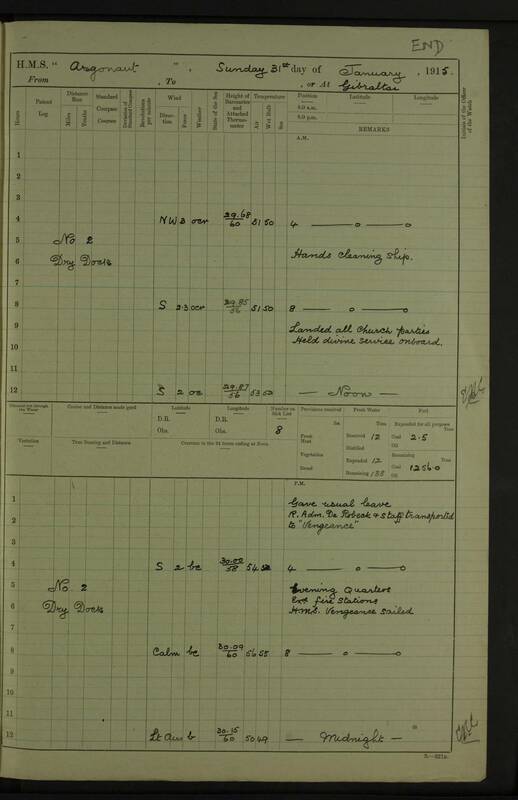 The crew consisted of eight including the master, all of whom were Danes except one, an American seaman. She had not been boarded previous to my visit. 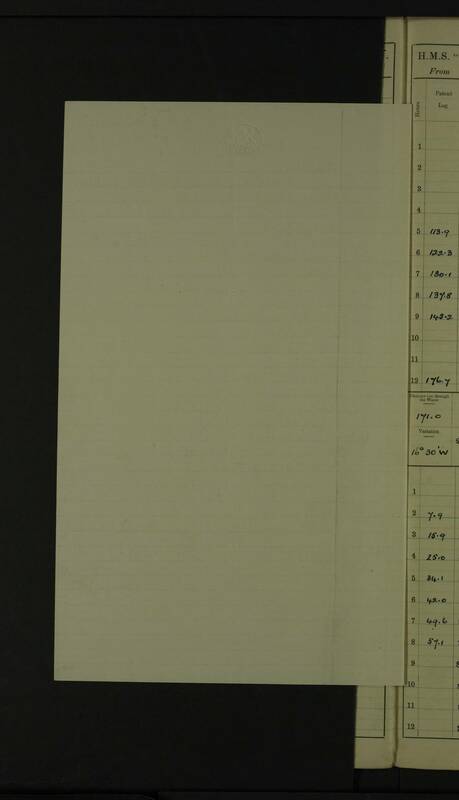 The master informed me that he had seen no warships, and had nothing of importance to relate. 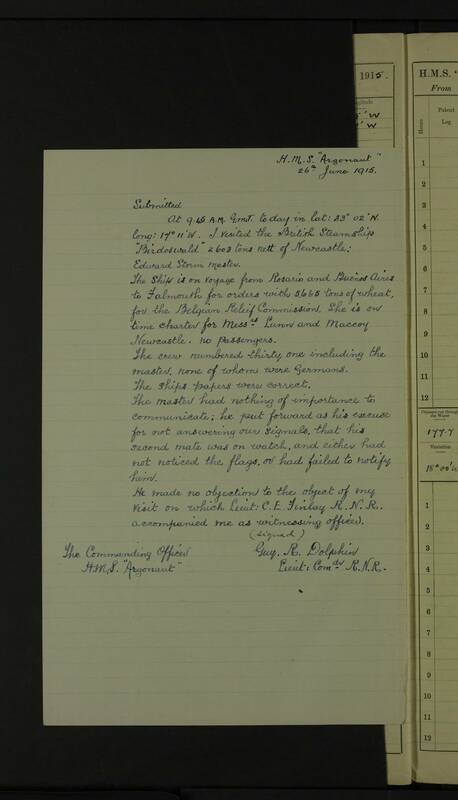 He made no objection to the object of my visit, on which Lieutenant [C]E Finlay RNR accompanied one as Witnessing Officer. 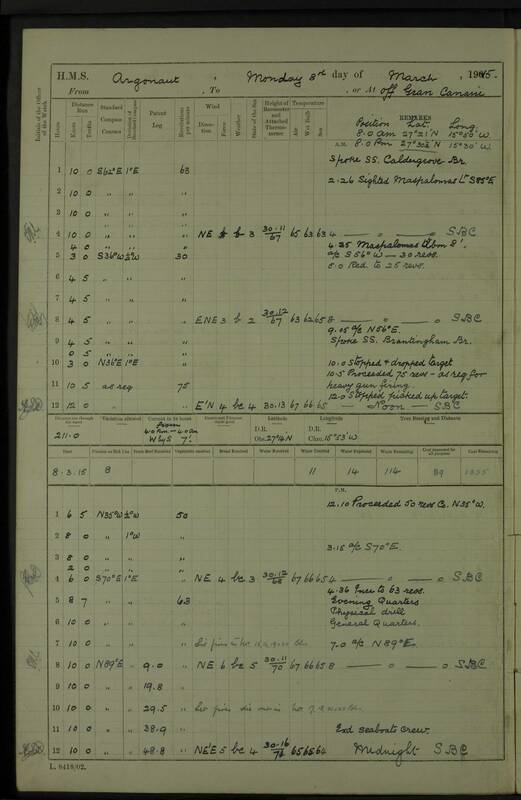 She was owned by CP Lond, a Dane of Ronne, but had been chartered by Lewis Arnau of Cadiz. 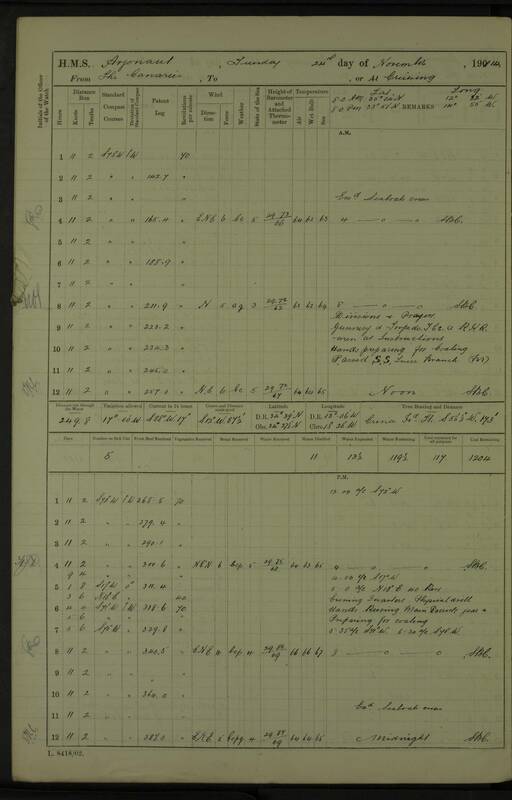 Broken by accident reflector, search light, patt no 908, one in no. At 4.40 AM GMT today in lat 30 8N long 15 25W I visited the steam ship Mizar, Dutch, 1235 tons net, of Rotterdam, EQ Smoolemaas master. 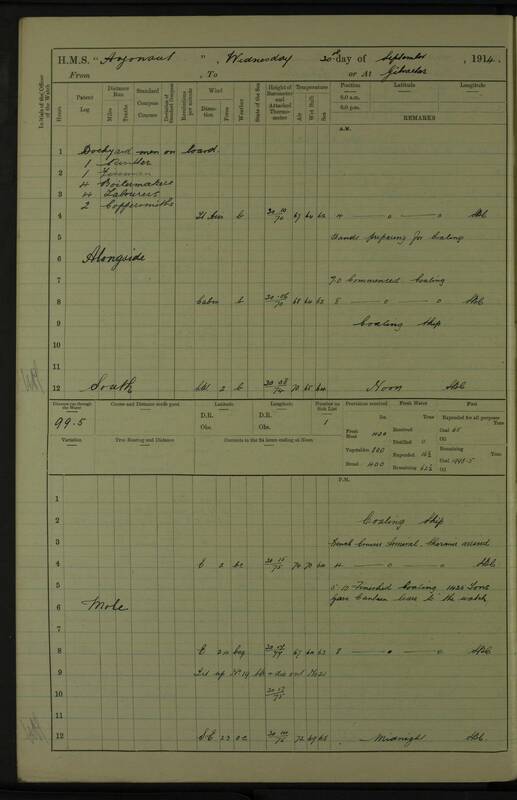 The ship is on a voyage from Santa Fe via St Vincent Island, Teneriffe, and English Channel to Amsterdam with grain cargo of 3,080 tons consigned to the American Consul at Amsterdam; no passengers. 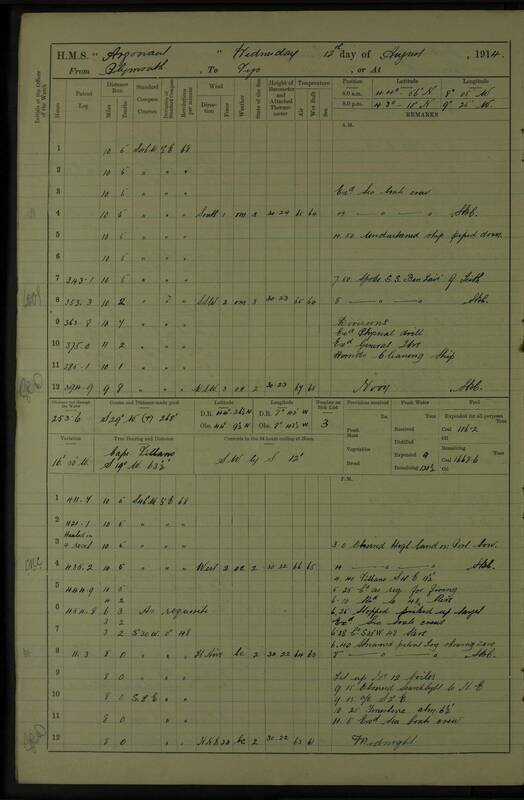 The crew consisted of 22 Dutch subjects including the master. 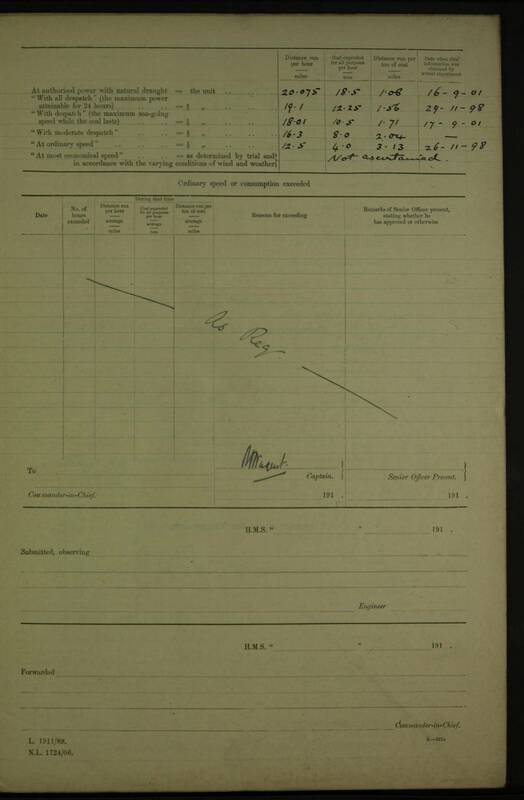 The ship's papers were correct. 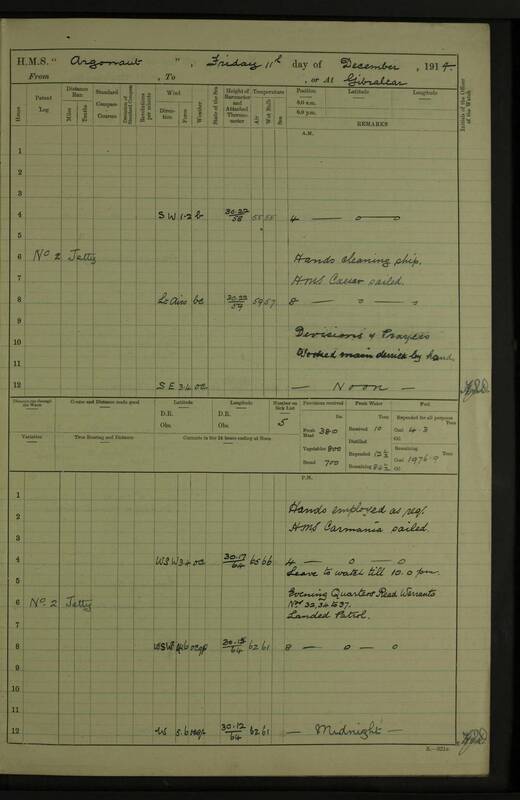 The master informed me that he had seen one British Cruiser at St Vincent and an Armed Merchant Cruiser off Teneriffe, but otherwise had nothing of importance to relate. 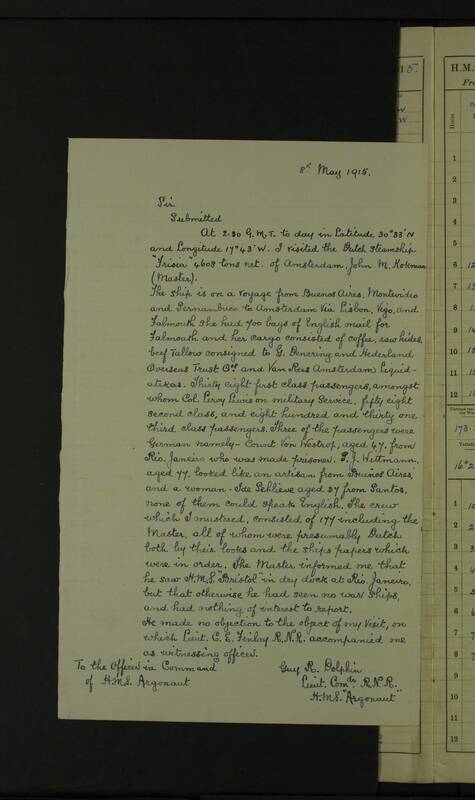 He made no objection to the object of my visit, on which Lieut Charles E Finlay RNR accompanied one as Witnessing Officer. 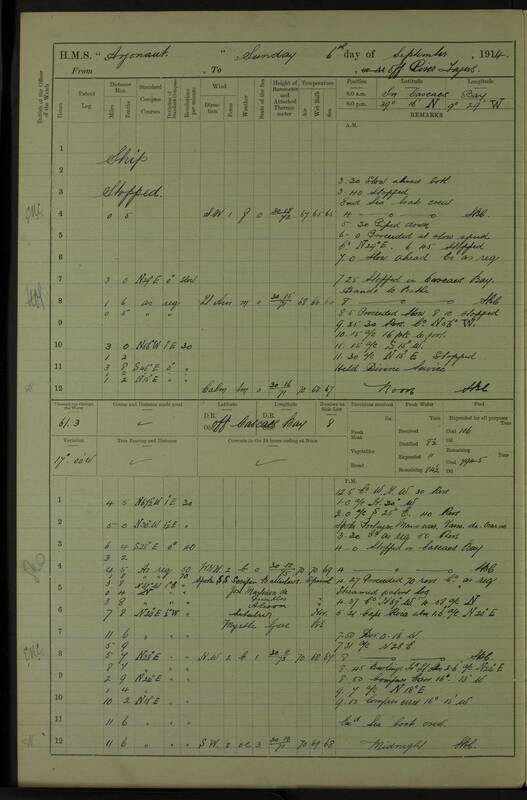 At 6.15 AM GMT today in lat 30 03 N long 15 20 W I visited the Oscar II, Swedish steamship, 2015 net tonnage, of Stockholm, Daniel Engelbrecht master. The ship is on a voyage from Buenos Aires, Santo, and Rio Janeiro to Christiana via Kirkwall with a cargo consisting of 'extract', hides, and coffee (5,500 bags) consigned to AR Olsen and Wright, Stockholm, ER Johnson, and Saras Frosts, Landskrona, at Malmo and Stockholm; no passengers but the 2nd and 3rd stewards were really passengers although their names appeared on the crew list. 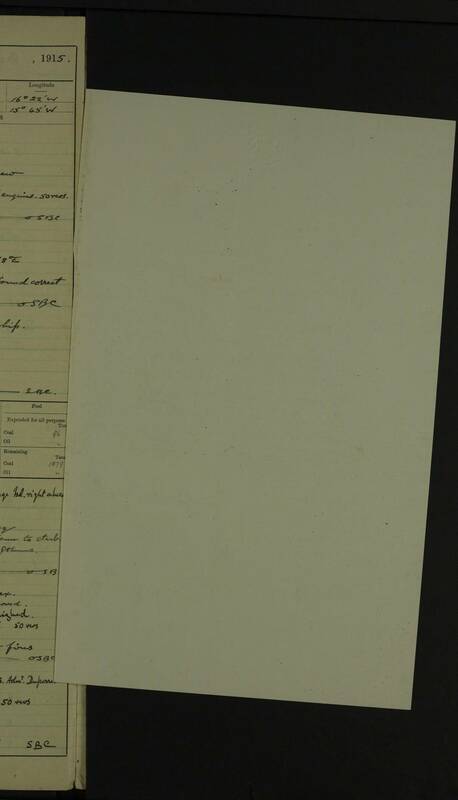 I examined their passports which contained photographs of them and were in order; both were Scandinavian. 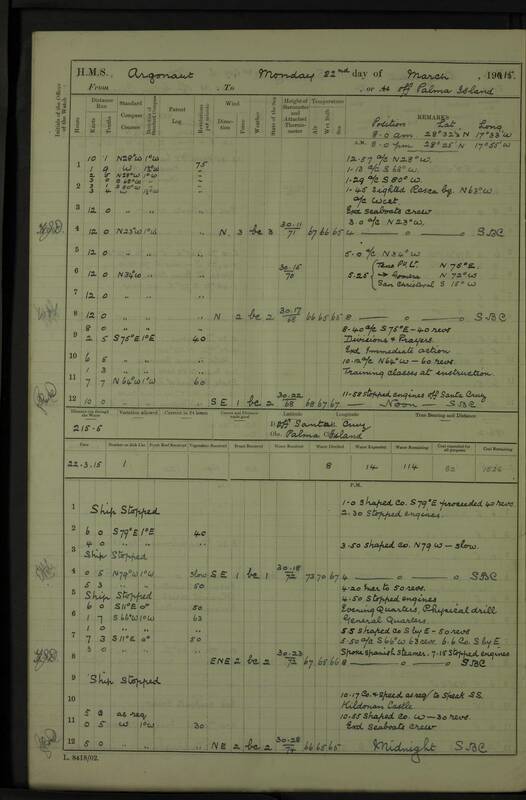 The crew consisted of thirty six including the master; there were no Germans amongst them, being Swedes, Danes or Russian Finns. 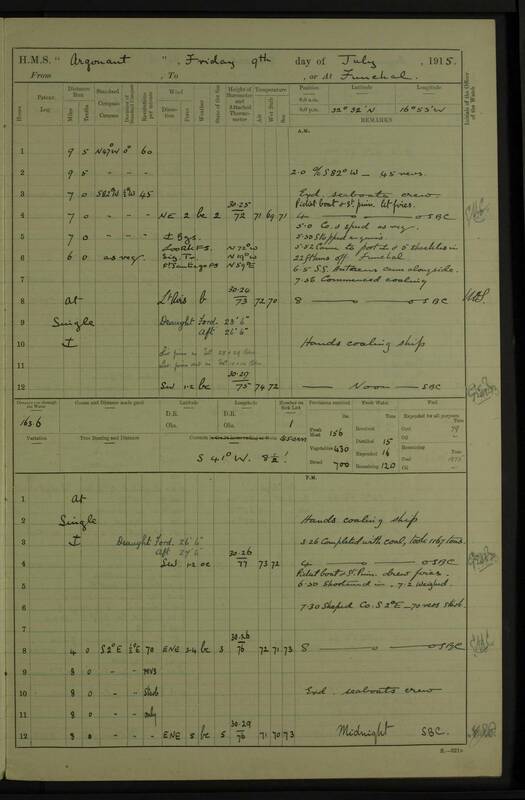 The master informed me that he had sighted a British warship outside Rio, but otherwise had nothing of importance to communicate. 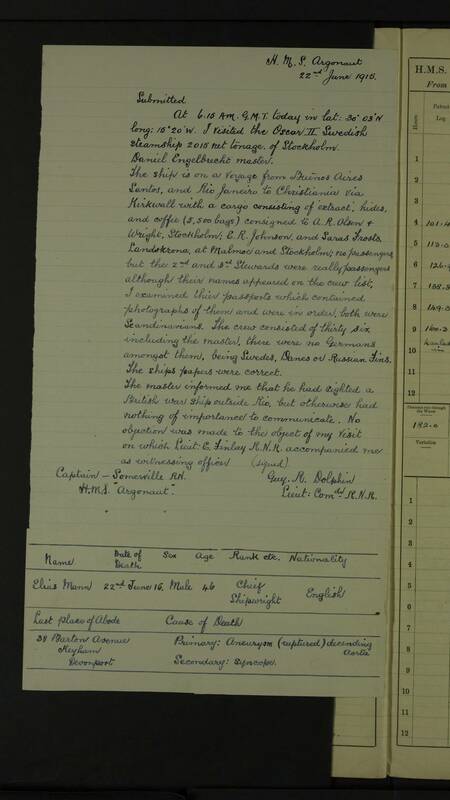 No objection was made to the object of my visit on which Lieut E. Finlay RNR accompanied one as witnessing officer. 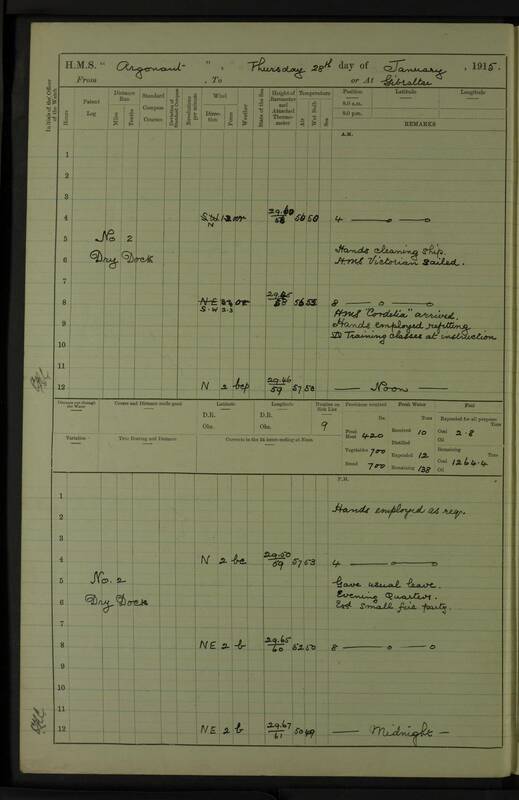 At 9.45 AM GMT today in lat 33 02 N long 17 11 W I visited the British steamship Birdoswald, 2603 tons net, of Newcastle. 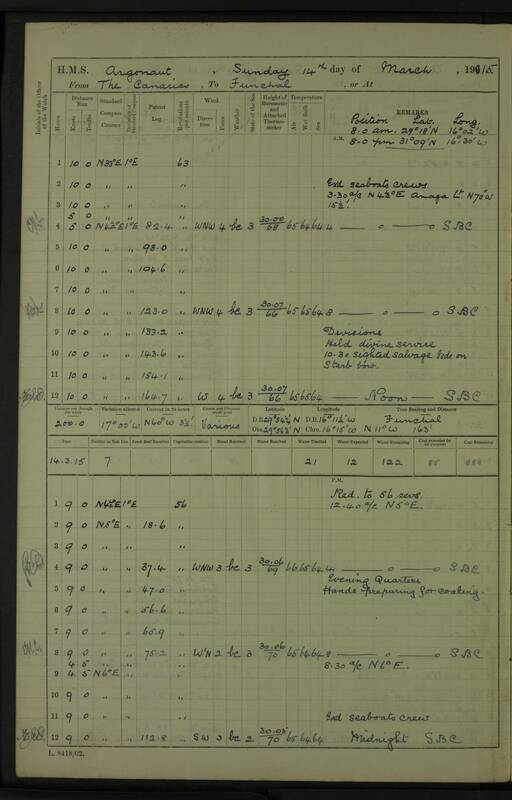 The ship is on a voyage from Rosario and Buenos Aires to Falmouth for orders with 5665 tons of wheat, for the Belgian Relief Commission. 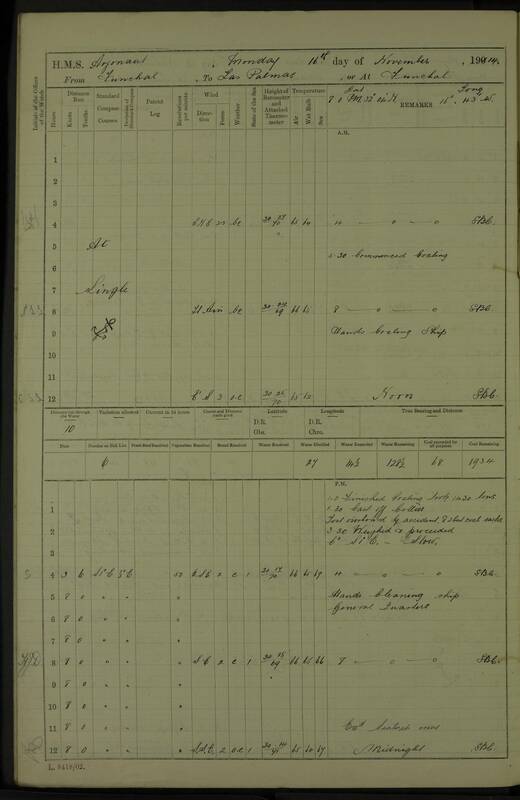 She is on time charter for Messrs Lunn and McCoy, Newcastle. 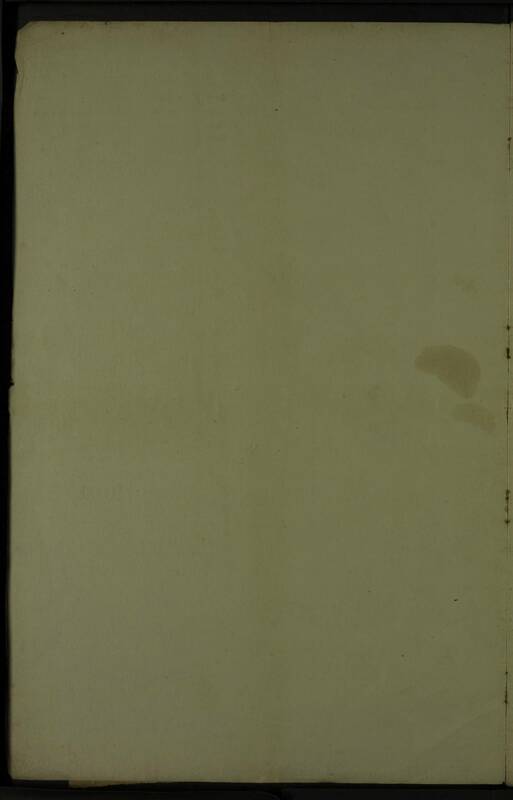 No passengers. 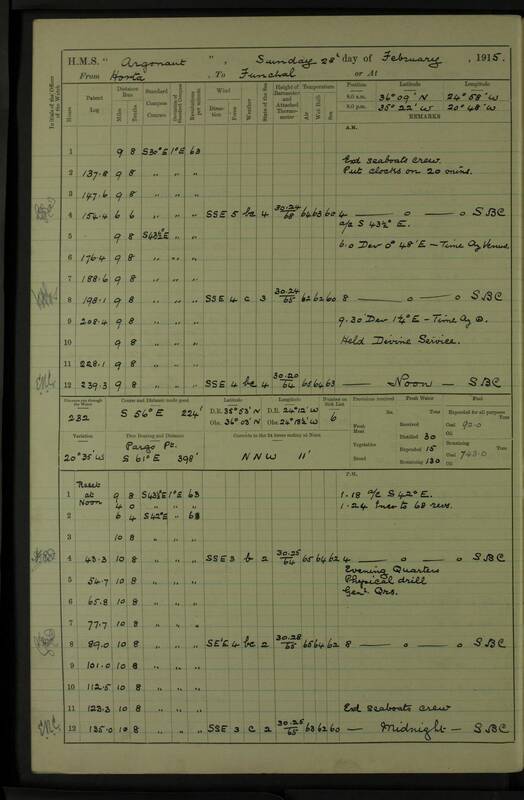 The crew numbered thirty one including the master, none of whom were Germans. 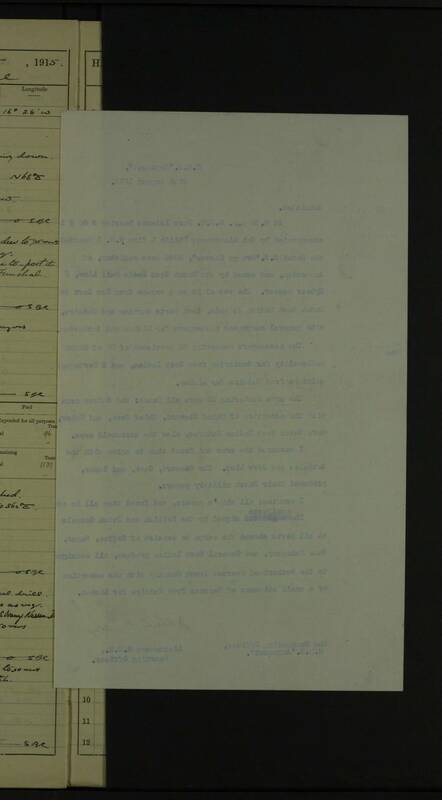 The master had nothing of importance to communicate; he put forward as his excuse for not answering our signals that his second mate was on watch, and either had not noticed the flags, or had failed to notify him. 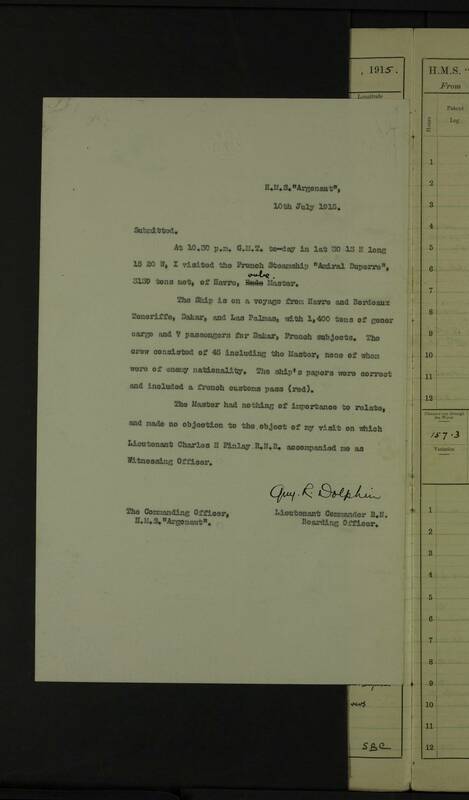 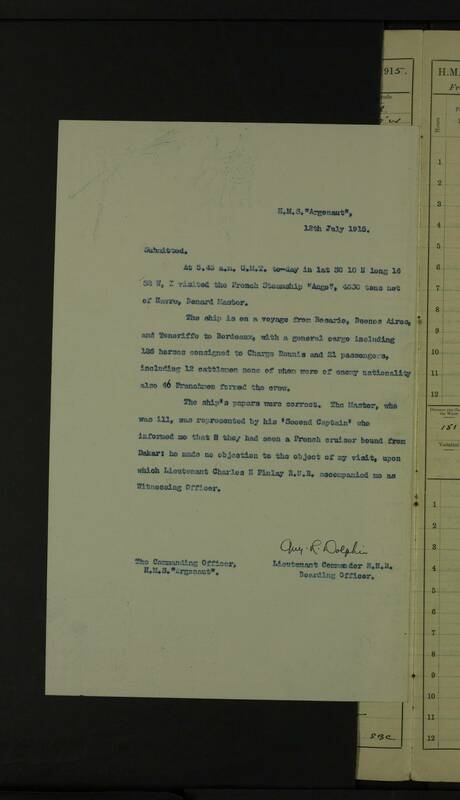 He made no objection to the object of my visit on which Lieut CE Finlay RNR accompanied me as witnessing officer. 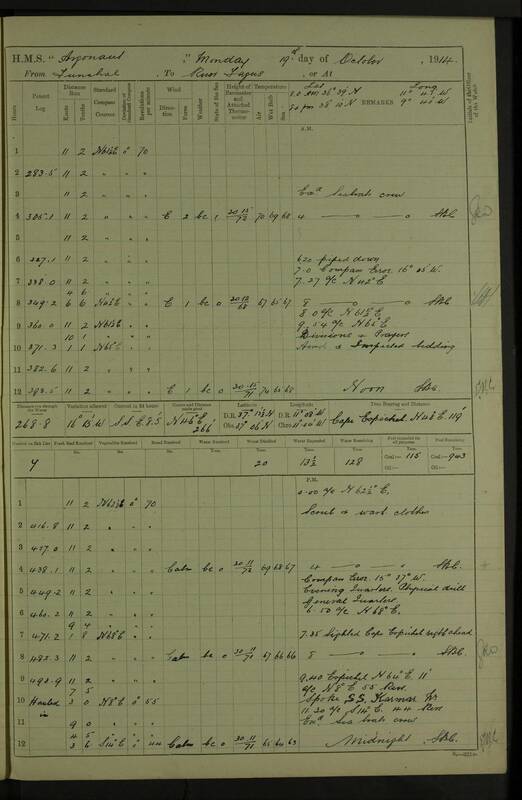 At 1.45 PM GMT today in lat 34 58 N, long 15 46 W, I visited the Dutch steamship Farmsum, 1597 tons net, of Amsterdam, G Scheltino master. 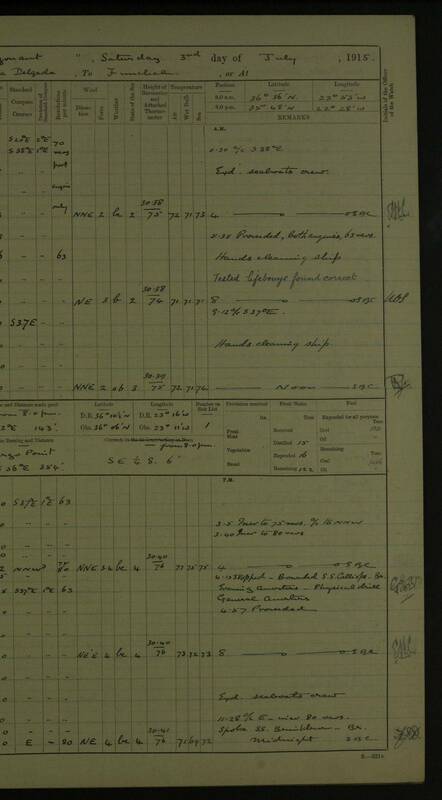 The ship is on a voyage from Port Talbot to Fray Bentos with a cargo of 2,900 tons of patent fuel consigned to Messrs Midland Uruguay Rly Coy; no passengers. 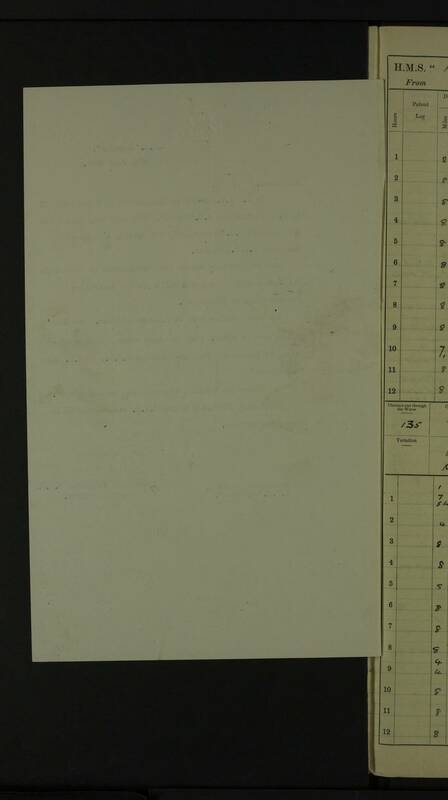 The crew consisted of twenty four including the master, none of whom were Germans. 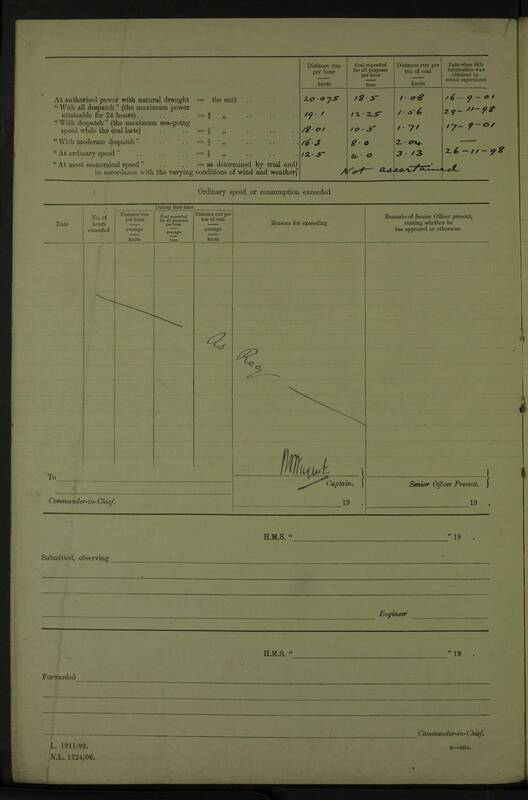 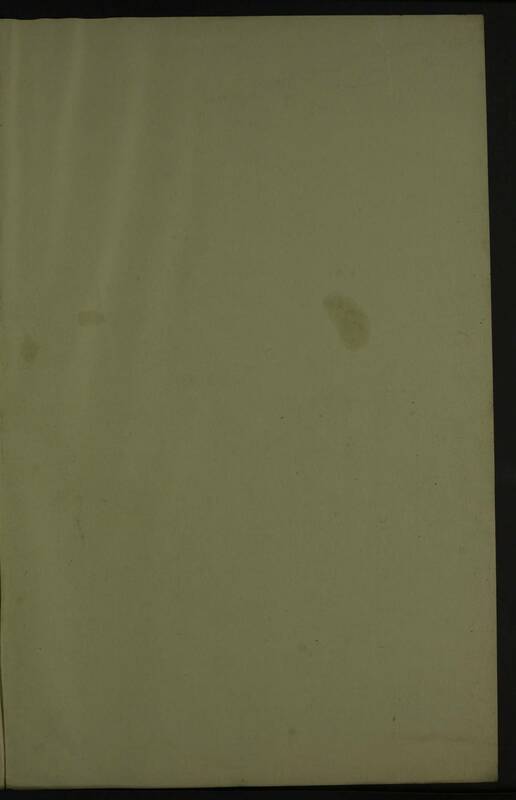 The ship's papers were correct and included a 'green clearance', the seal of which was in order. 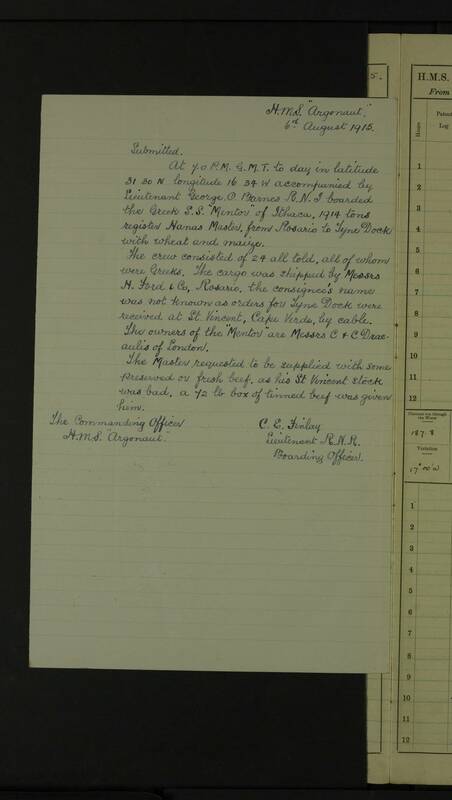 The master was unable to give me any information of importance; he made no objection to the object of my visit on which Lieut CE Finlay RNR accompanied me as witnessing officer. 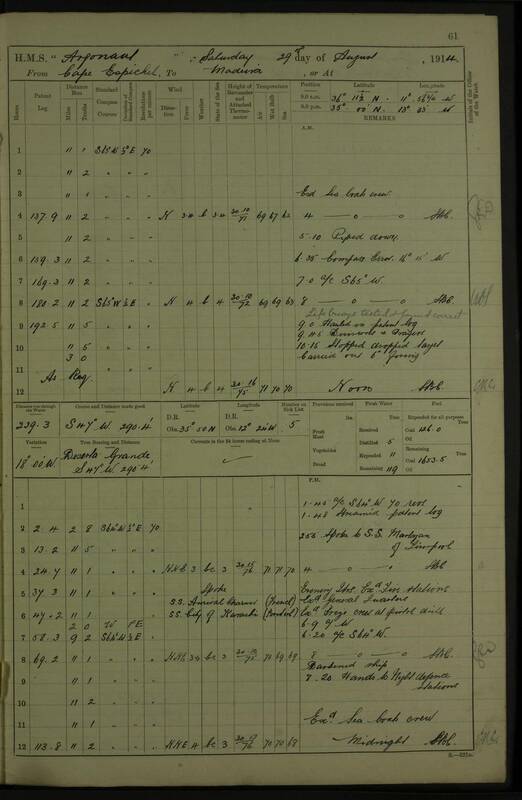 At 6.05 PM GMT today in lat 37 35 N, long 17 04 W, I visited the Greek steamship Andros, 1859 tons net; John Cairies master. 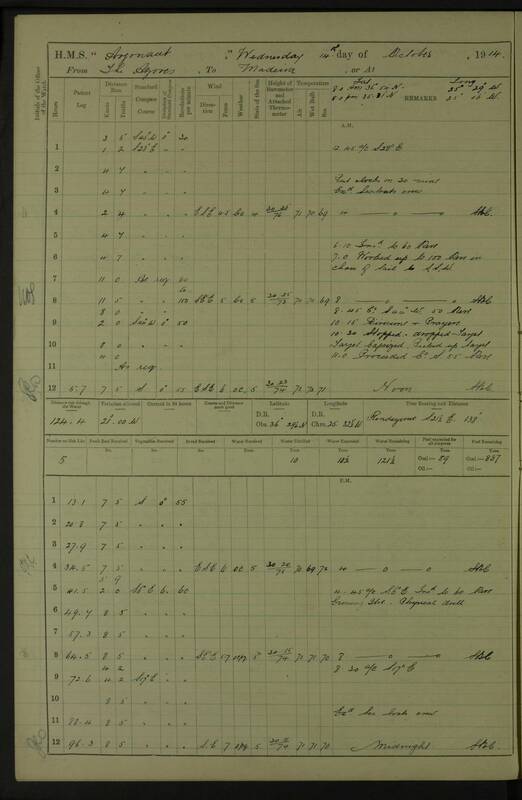 The ship is on a voyage from Baltimore to Palermo with 4,600 tons coal consigned to the Italian State Rlys. 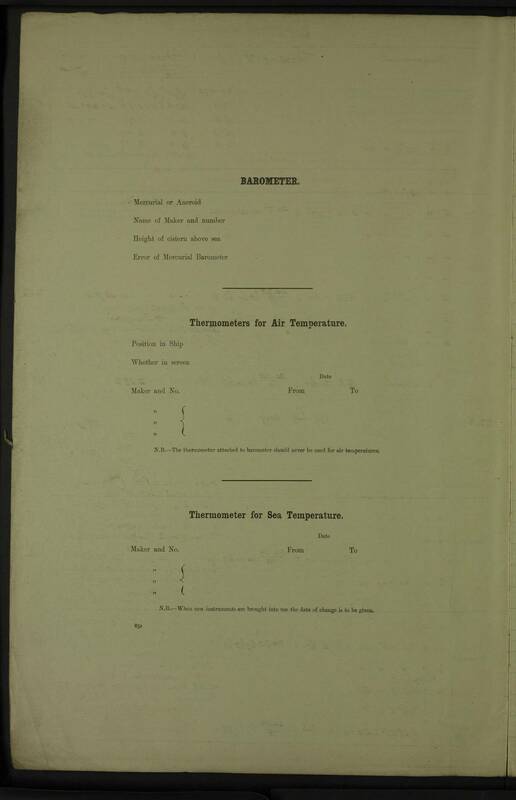 No passengers. 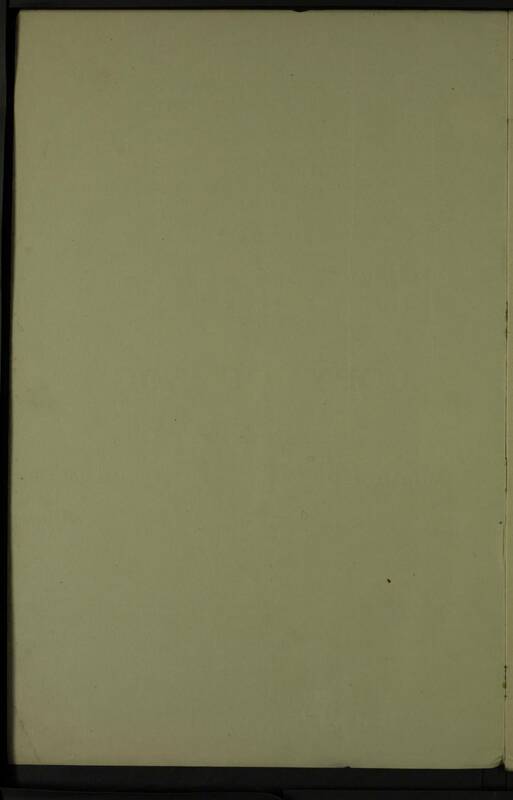 The crew consisted of twenty five Greek subjects including the master. 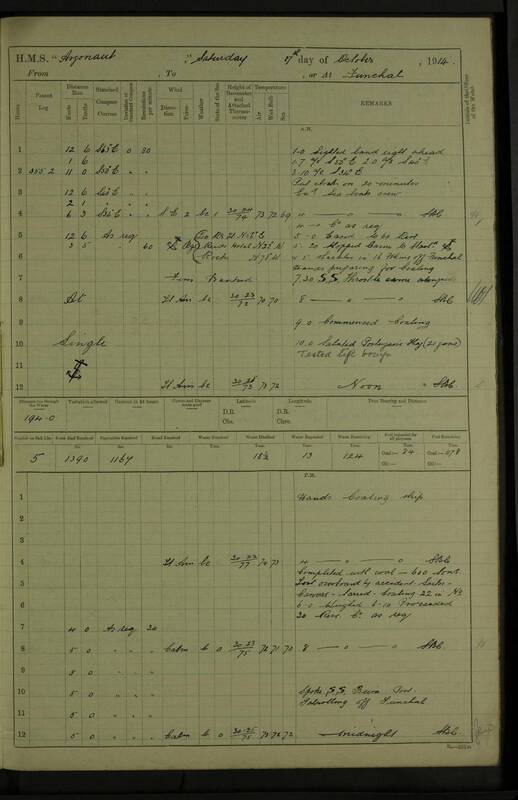 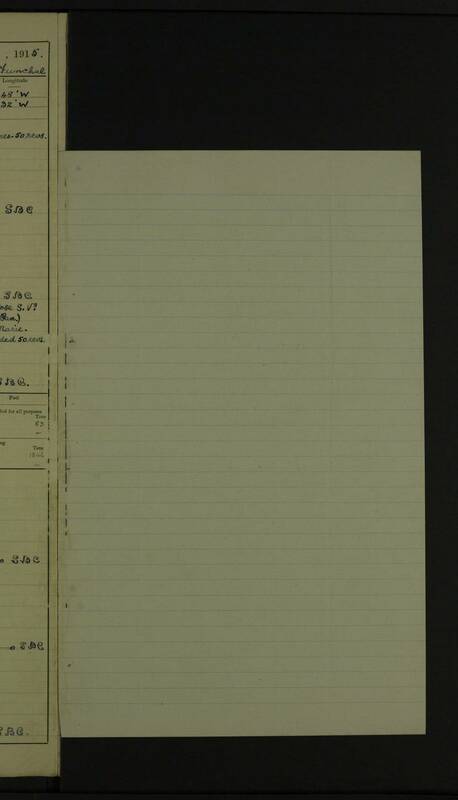 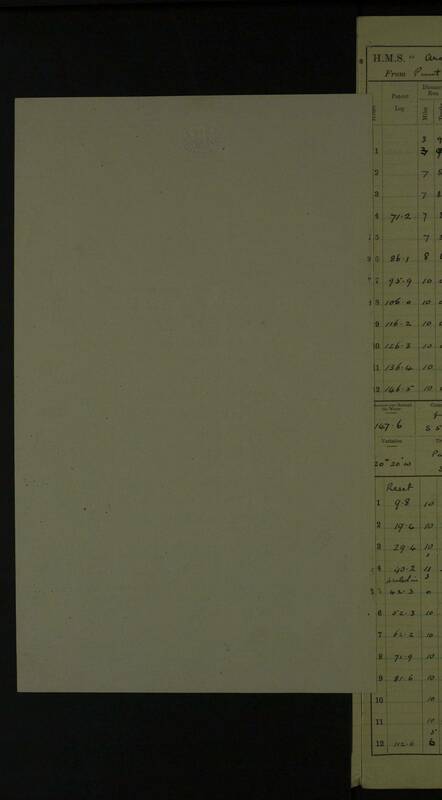 The ship's papers were written in Greek except the Bill of Lading but appeared to be in order. 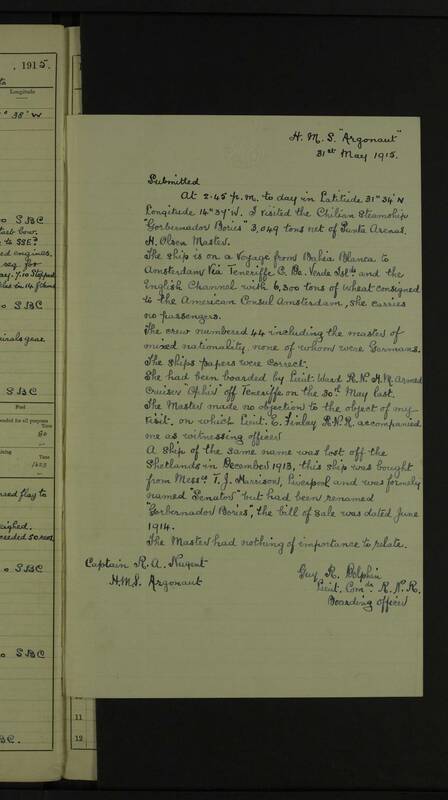 The master had nothing of importance to relate, and made no objection to the object of my visit upon which Lieut CE Finlay accompanied me as witnessing officer. 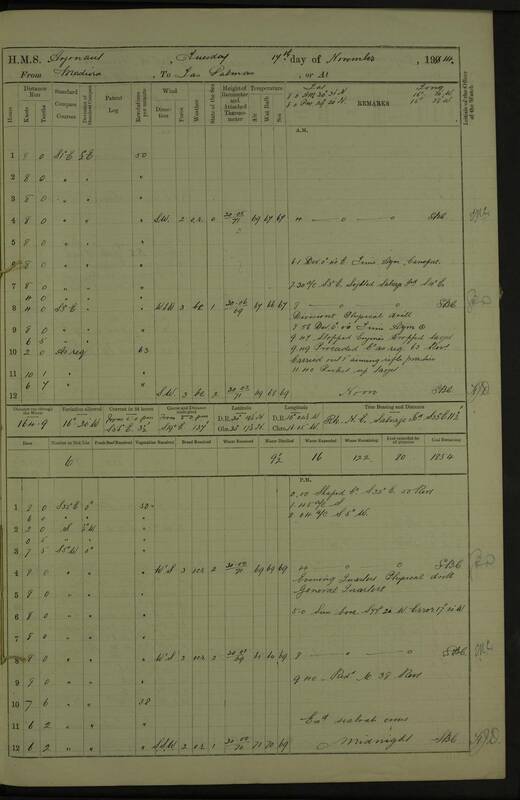 At 4.10 pm GMT today in latitude 36 0 N longitude 22 30 W I visited the steamship Calliope (British) 1834 tons net, of London, B Tupman master. 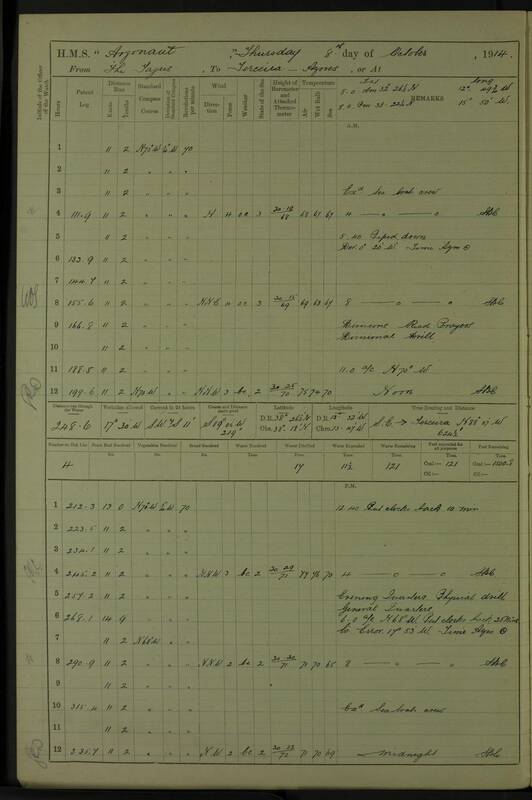 The ship is on a voyage from Marseilles and Huelva to Baltimore with a cargo of copper ore consigned the Newport Pyrites Company; no passengers. 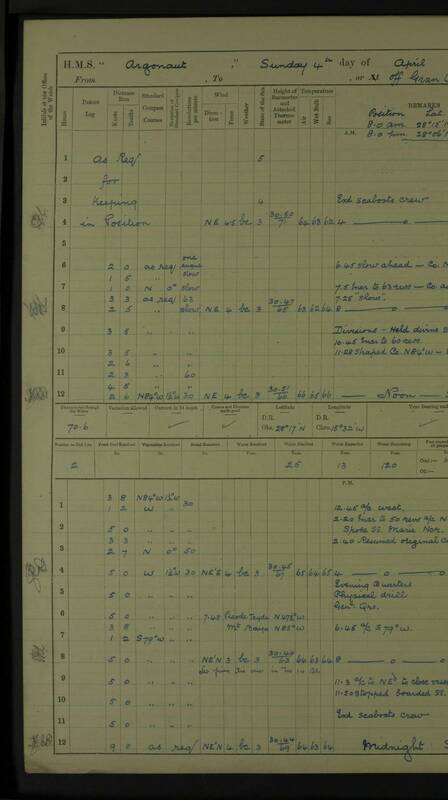 The crew consisted of 26, including the master, none of whom were Germans. 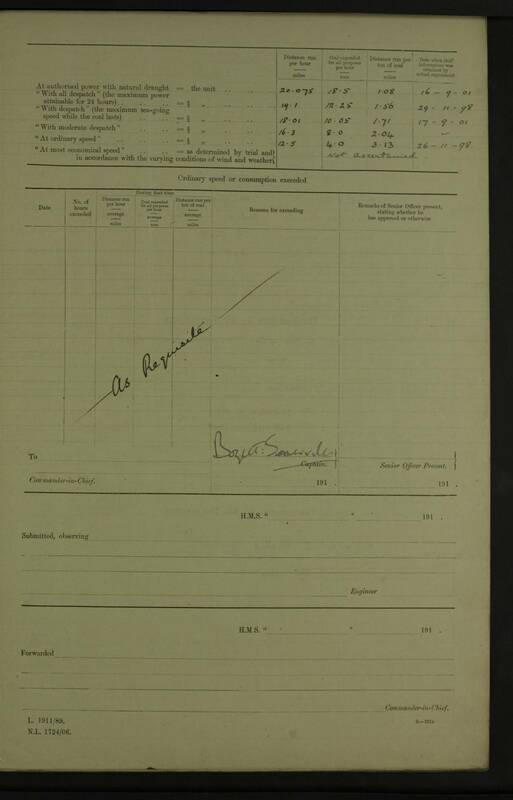 The ship's papers were in order. 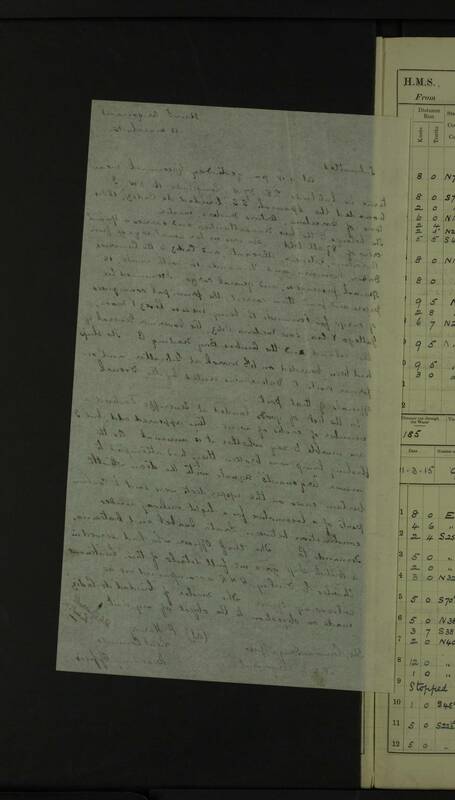 The master informed me that he could not distinguish the signal ordering him to "stop instantly", owing to our smoke hiding the signal, and that he had not heard or seen the report or flash of the guns. 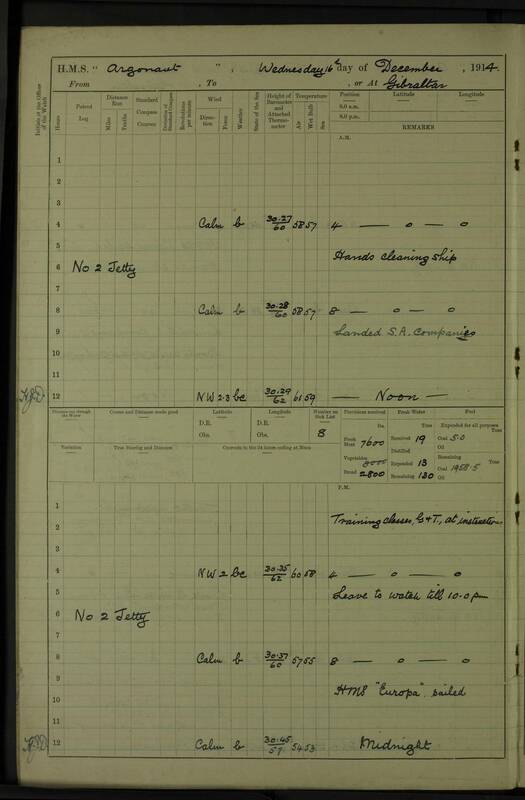 I made the following entry in his official log book - "Failed to stop when called on to do so" - master's excuse "Signal hidden by our smoke". 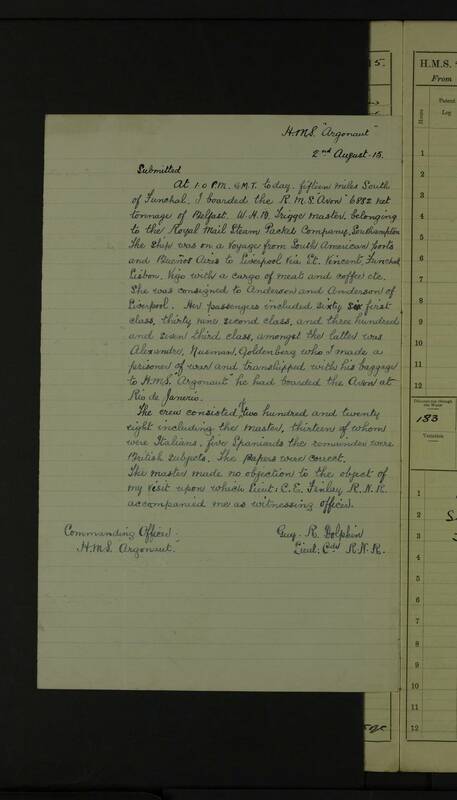 The master made no objection to the object of my visit upon which Lieutenant Charles E Finlay RNR accompanied me as [Witnessing] Officer. 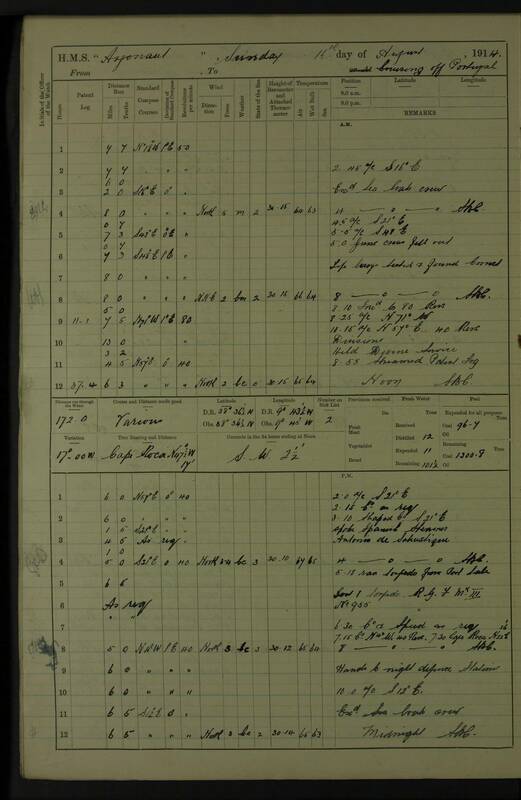 At 10.30 pm GMT today in lat 30 13 N long 15 20 W, I visited the French steamship Amiral Duperre, 3139 tons net, of Havre, Oube[?] 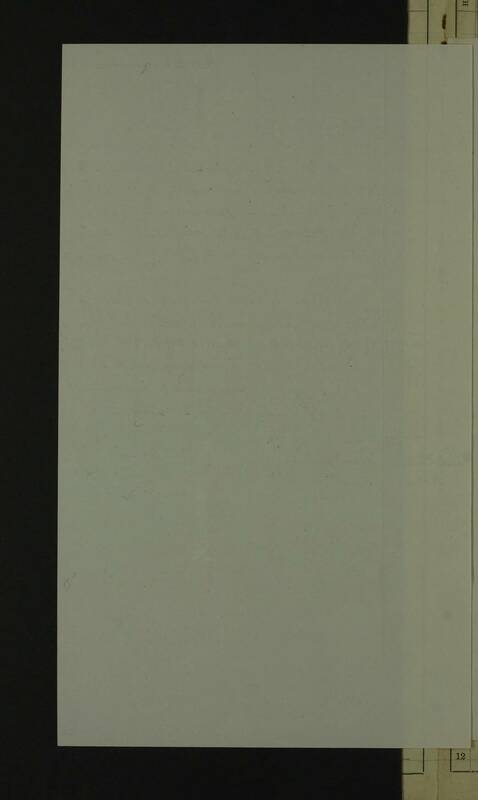 master. 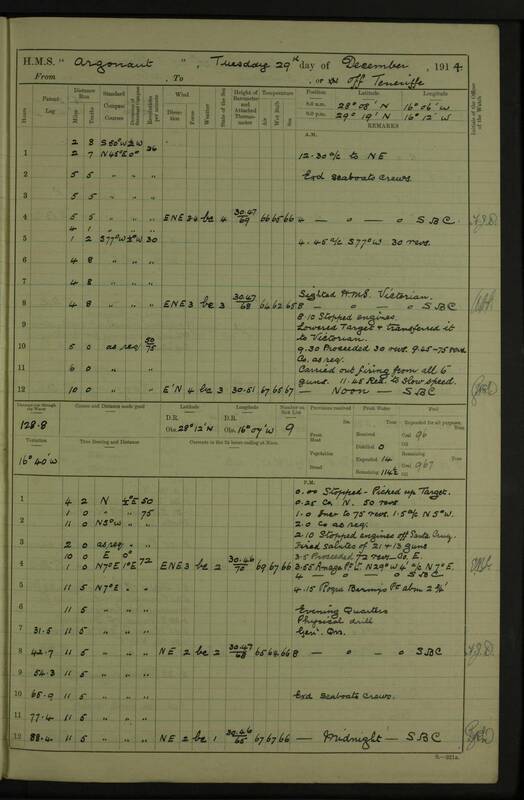 The ship is on a voyage from Havre and Bordeaux [to] Teneriffe, Dakar, and Las Palmas, with 1,400 tons of gener[al] cargo and 7 passengers for Dakar, French subjects. 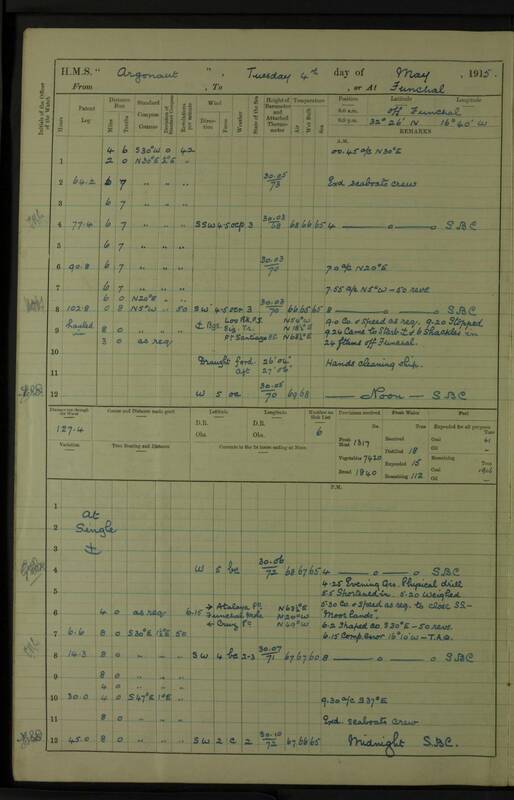 The crew consisted of 45 including the master, none of whom were of enemy nationality. 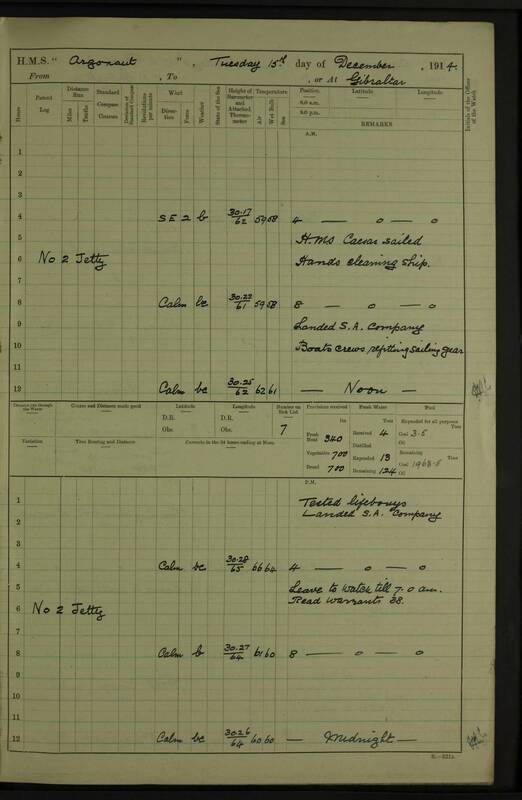 The ship's papers were correct and included a French customs pass (red). 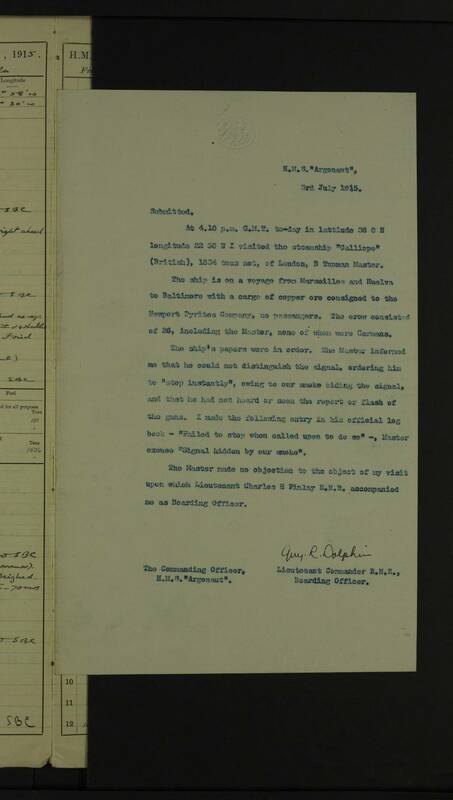 The master had nothing of importance to relate and made no objection to the object of my visit on which Lieutenant Charles E Finlay RNR accompanied me as Witnessing Officer. 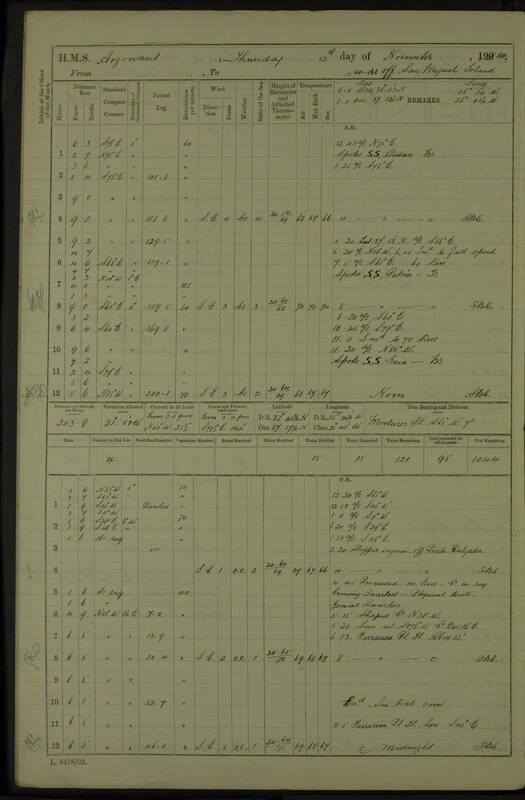 At 5.45 am GMT today in lat 30 10 N long 16 32 W, I visited the French steamship Ango, 4630 tons net, of Havre, Benard master. 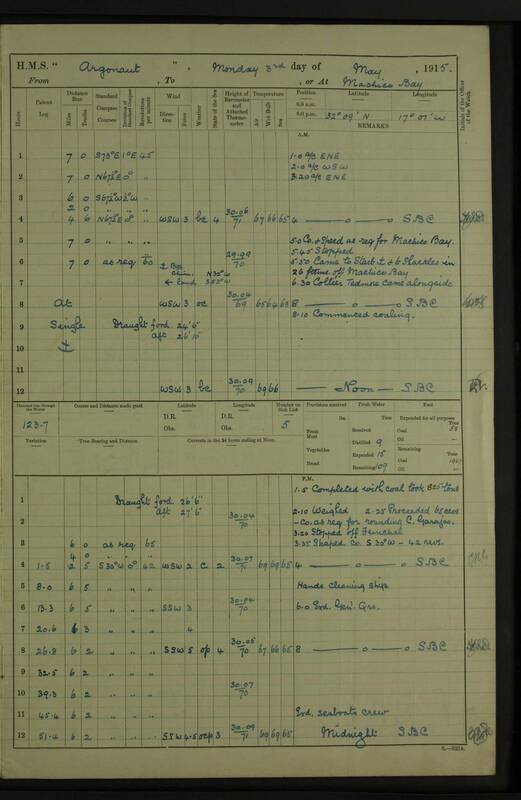 The ship is on a voyage from Rosario, Buenos Aires, and Teneriffe to Bordeaux, with a general cargo including 126 horses consigned to Charge Reunis, and 21 passengers, including 12 cattlemen none of whom were of enemy nationality; also 46 Frenchmen formed the crew. 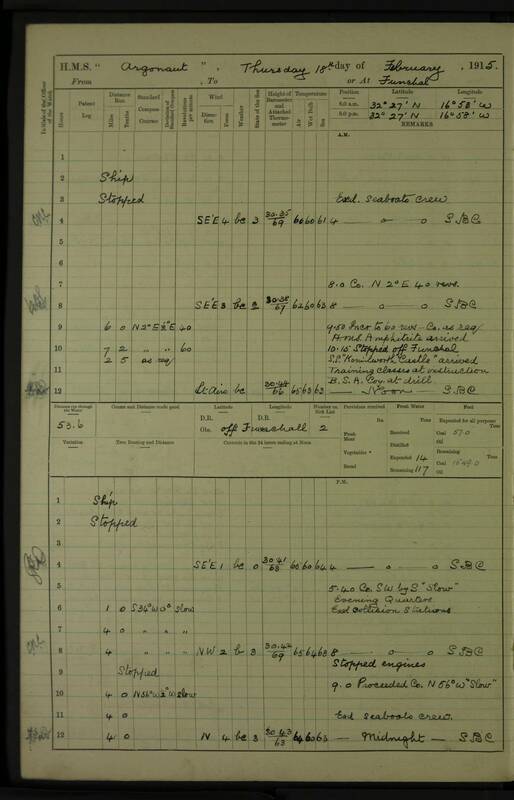 The ship's papers were correct. 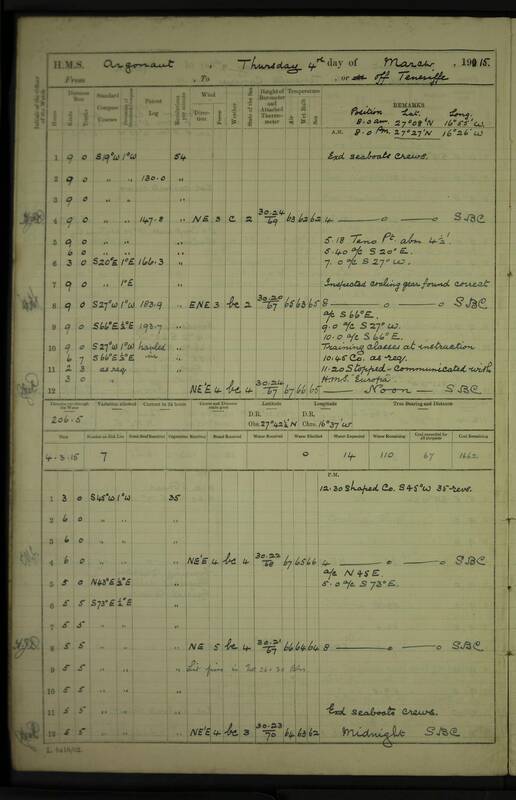 The master, who was ill, was represented by his 'Second Captain' who informed me that they had seen a French cruiser bound from Dakar: he made no objection to the object of my visit, upon which Lieutenant Charles E Finlay RNR accompanied me as Witnessing Officer. 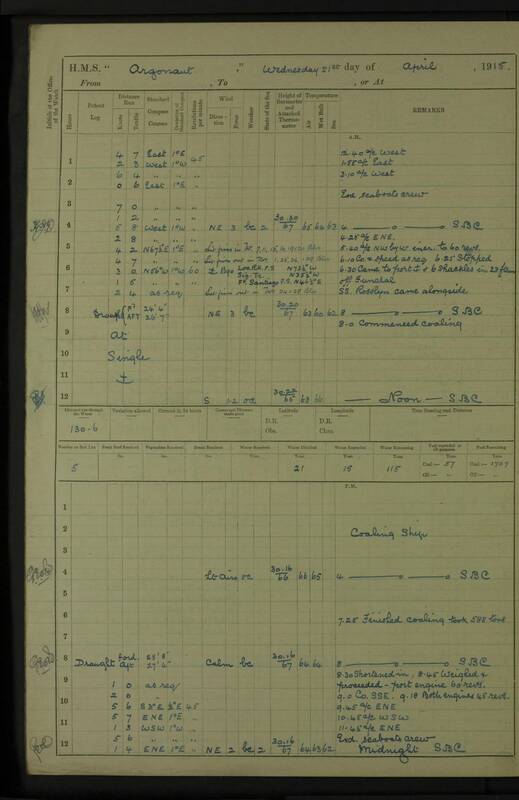 At 1.0 pm today in latitude 31 30 N longitude 17 25 W, I visited the SS Carina, 3437 tons net, late North German Lloyd SS Griefswald, WH Steele, Lieutenant Commander RNR, master. 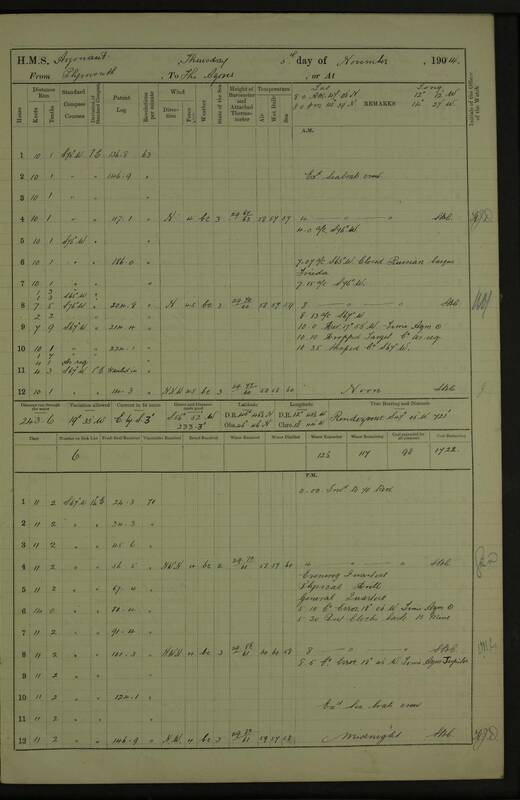 The ship is on a voyage from Middlesbrough to Freemantle via Durban with cargo of rails for the Australian Commonwealth; no passengers. 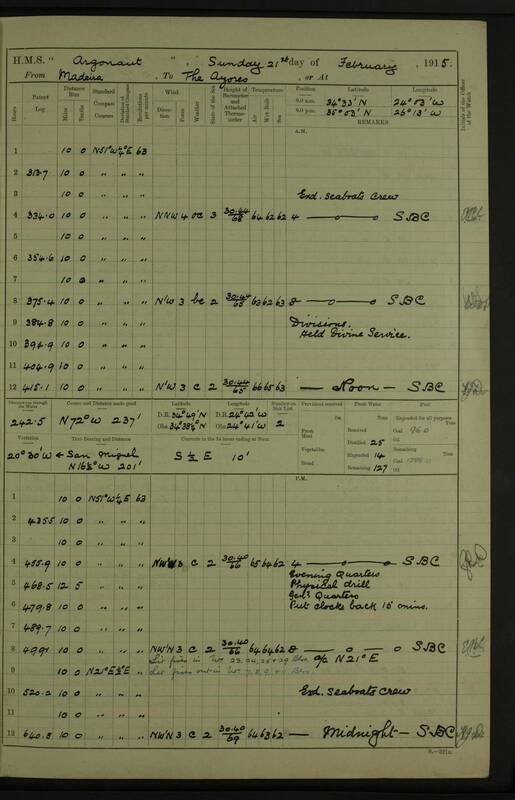 The crew consisted of 51 British subjects. 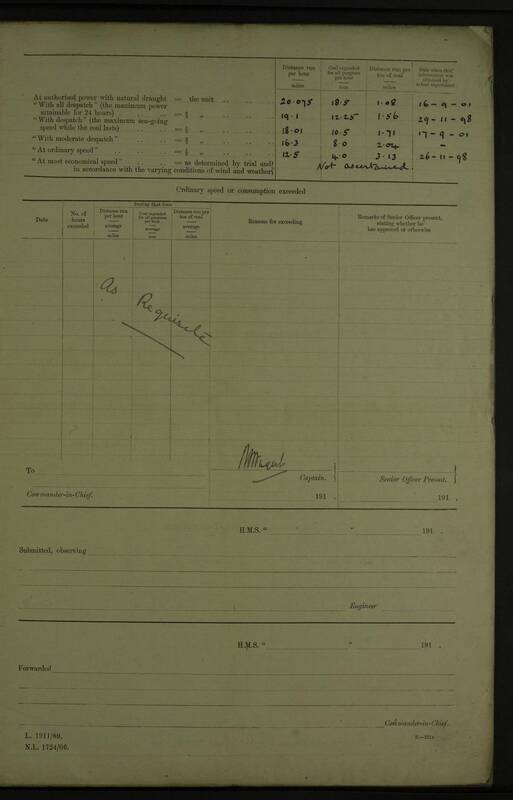 The ship's papers were in order. 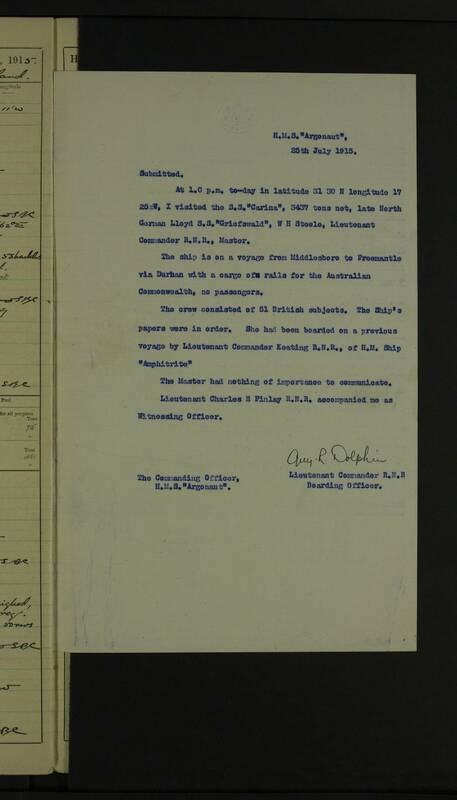 She had been boarded on a previous voyage by Lieutenant Commander Keating RNR, of HM Ship Amphitrite. 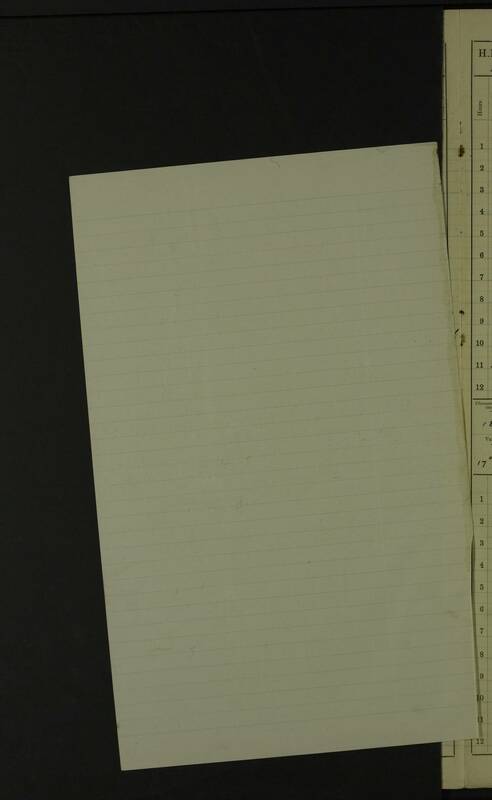 The master had nothing of importance to communicate. 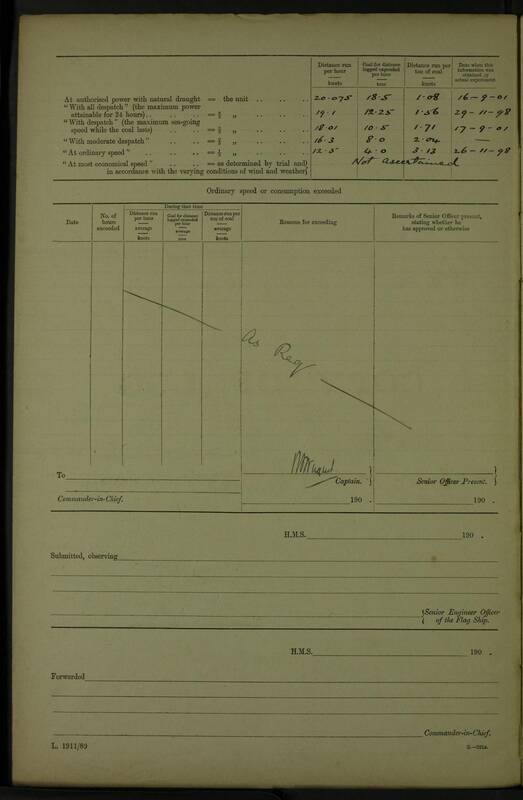 Lieutenant Charles E Finlay RNR accompanied me as Witnessing Officer. 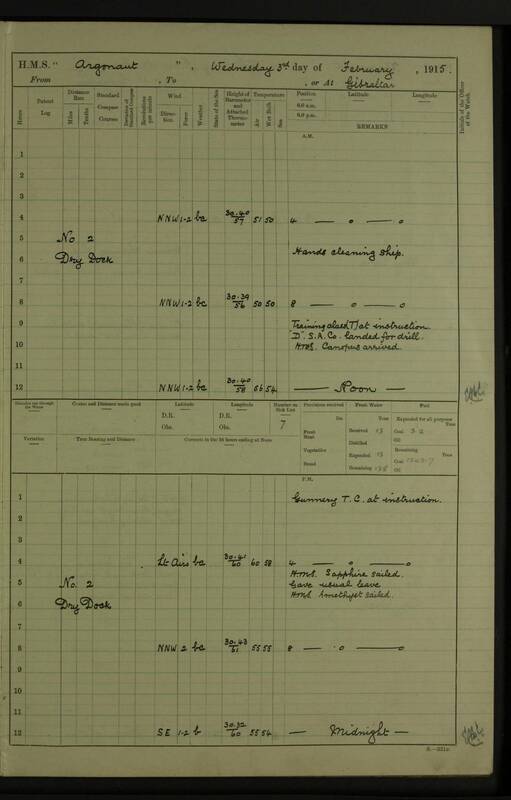 At 1.0 PM GMT today, fifteen miles South of Funchal, I boarded the RMS Avon, 6882 net tonnage, of Belfast, WHB Trigge master, belonging to the Royal Mail Steam Packet Company, Southampton. 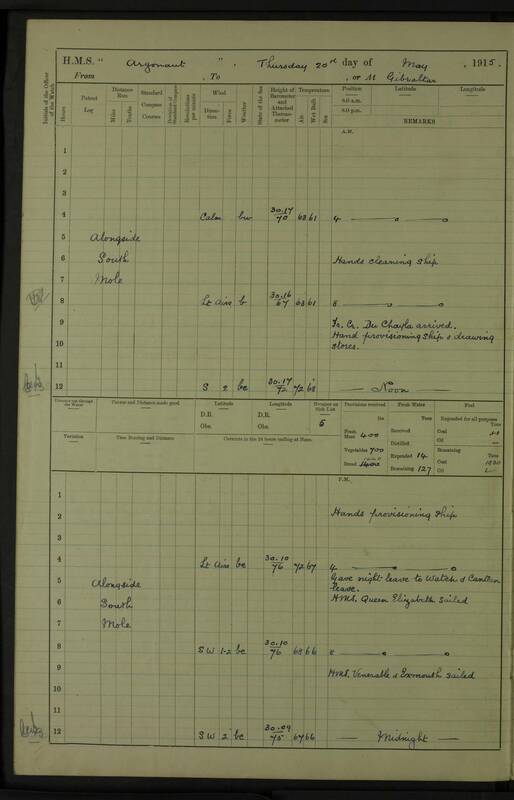 The ship was on a voyage from South American ports and Buenos Aires to Liverpool via St Vincent, Funchal, Lisbon, Vigo, with a cargo of meat and coffee etc. 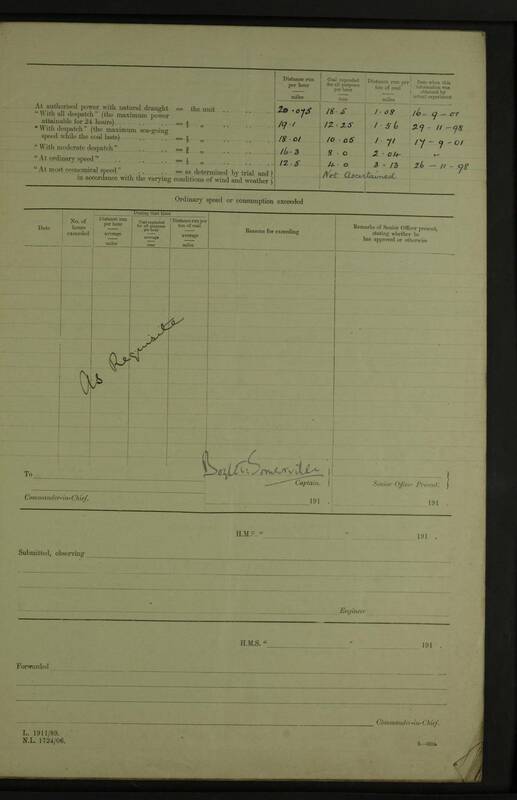 She was consigned to Anderson and Anderson of Liverpool. 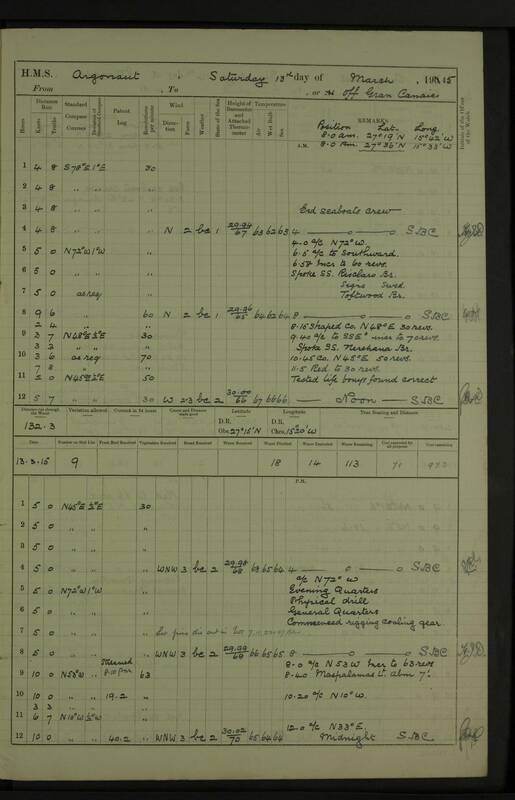 Her passengers included sixty six first class, thirty nine second class, and three hundred and seven third class; amongst the latter was Alexander Nusman Goldenberg who I made a prisoner of war and transshipped with his baggage to HMS Argonaut. 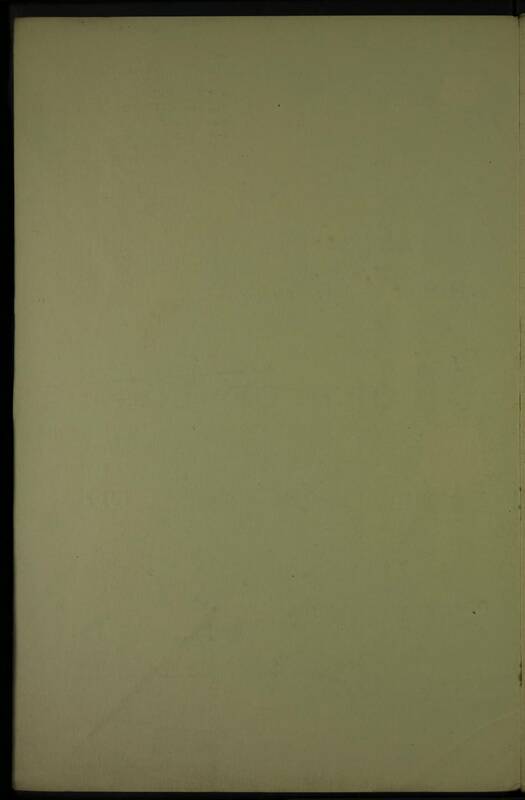 He had boarded the Avon at Rio de Janeiro. 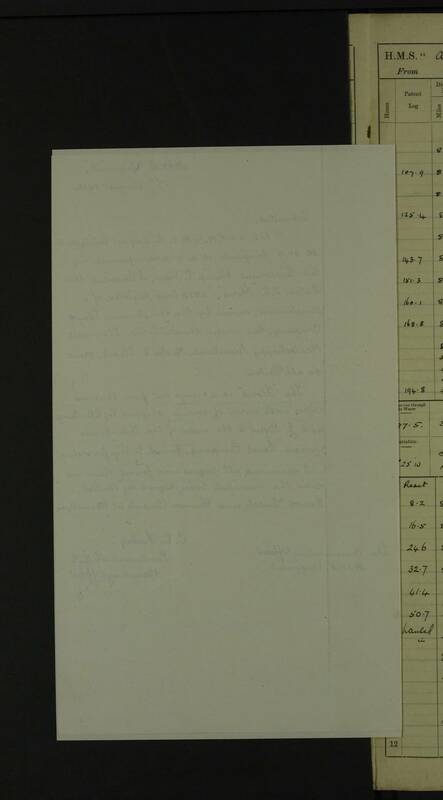 The crew consisted of two hundred and twenty eight including the master, thirteen of whom were Italian, five Spaniards; the remainder were British subjects. The papers were correct. 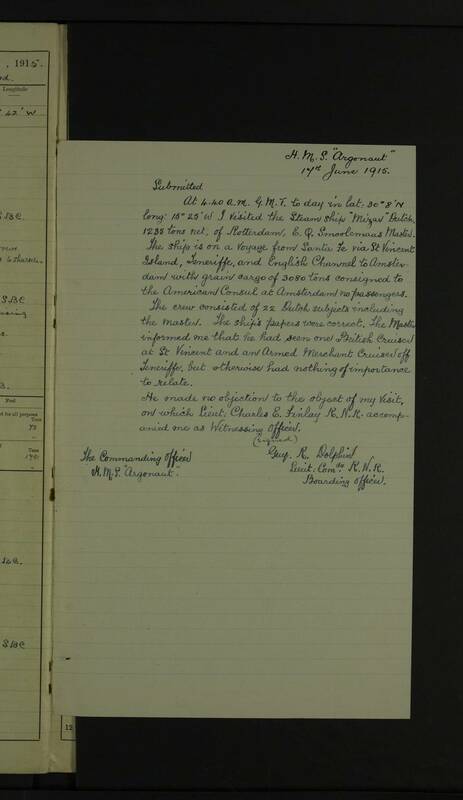 The master made no objection to the object of my visit upon which Lieut CE Finlay RNR accompanied my as Witnessing Officer. 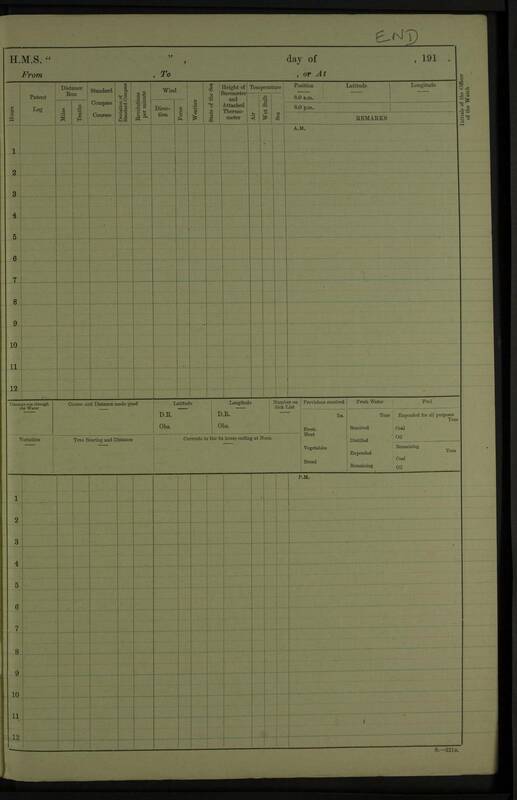 At 5.30 PM GMT in latitude 32 26 N longitude 17 4 W, accompanied by Sub Lieutenant Philip L Vian RN (of World War 2 fame), I boarded the Dutch sand dredger Uljsses of Rotterdam, bound from Rotterdam via Panama Canal to Vladivostok, or Nikolaievisk if ice permits. 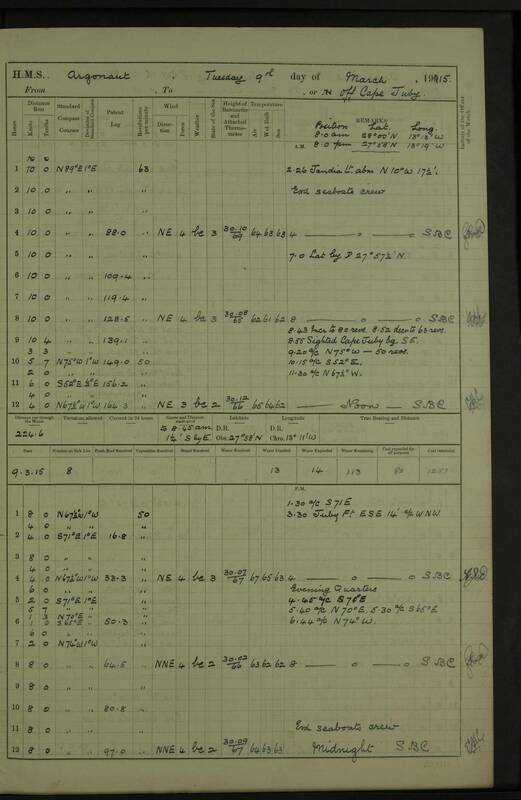 The vessel was built to order of the Russian government and is under the Dutch flag for passage, having been built by Carl Wern of Rotterdam. 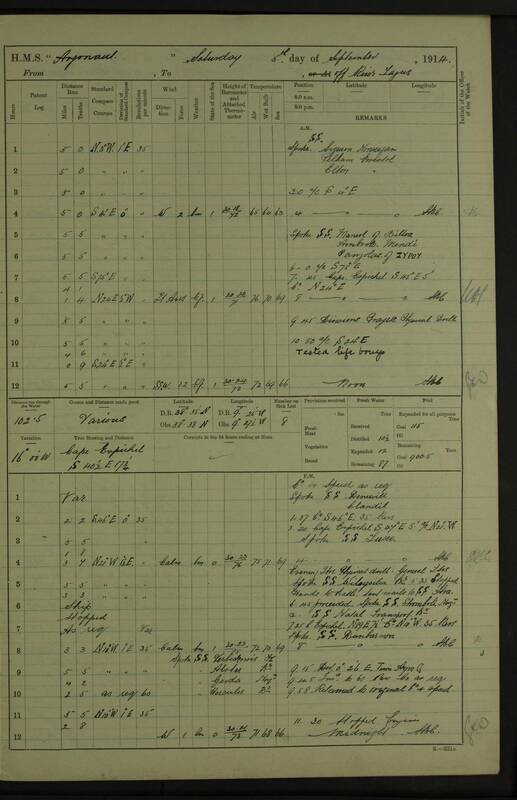 She carries a crew of 14 all told. 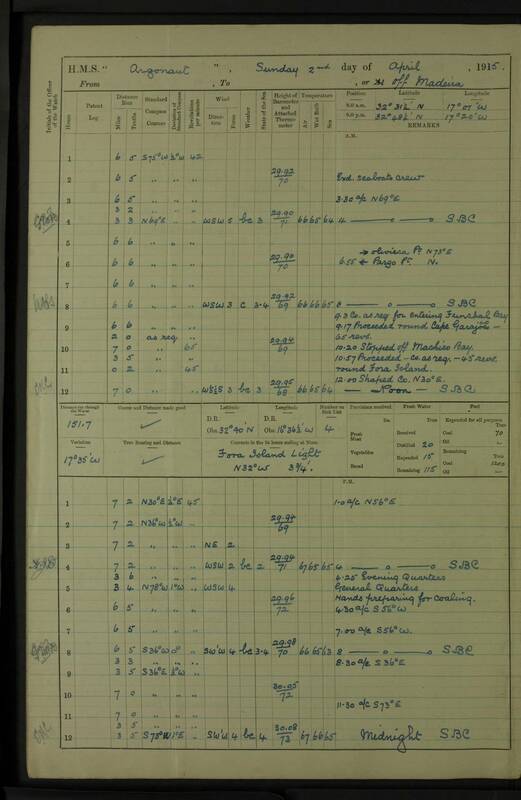 The master, J Hadar, reported having been boarded in Downs by Lieutenant Woodward RNR of HMS Cerberus from whom he obtained an Admiralty White Pass. 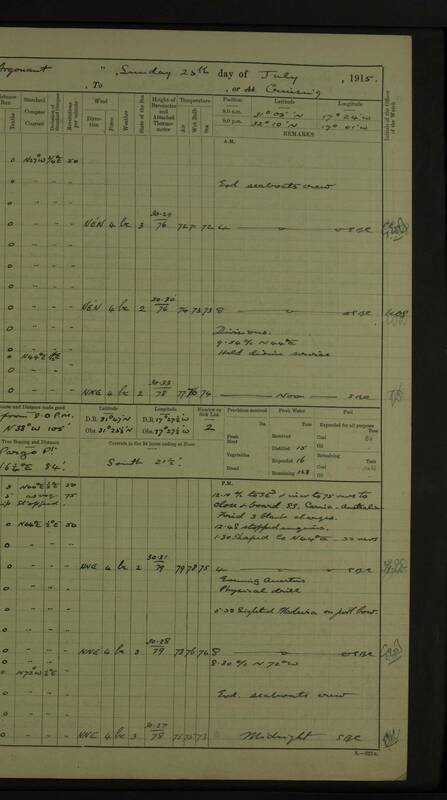 He left Rotterdam 16th July and was detained for 5 days at Deal through stress of weather. 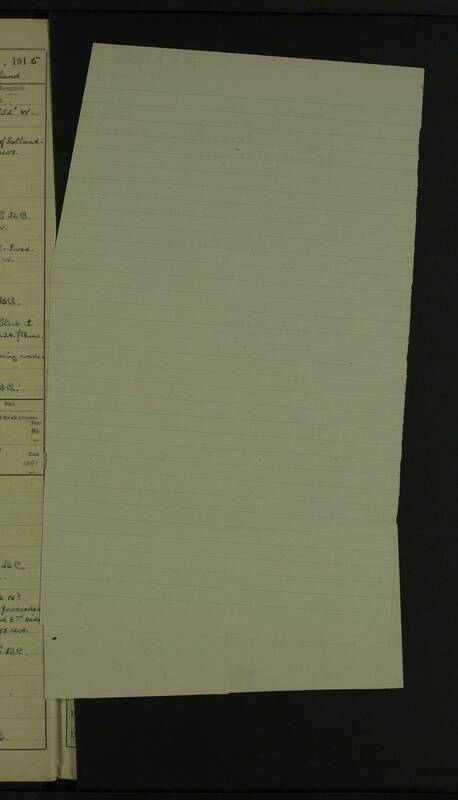 I examined the papers and found [them] correct. 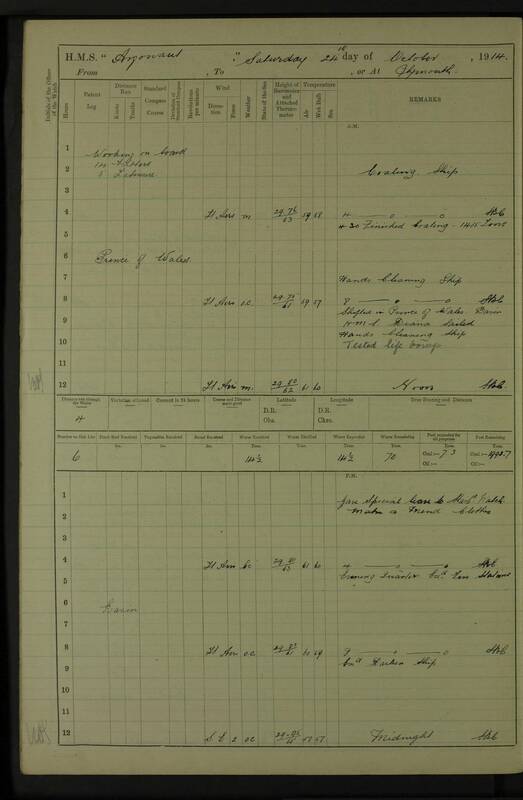 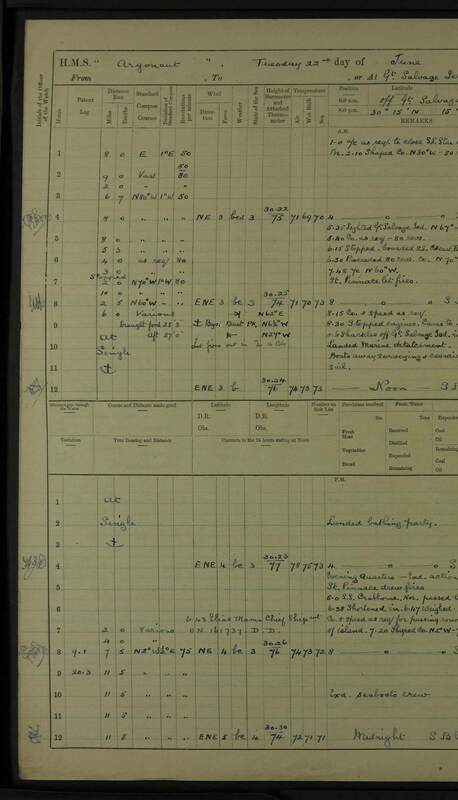 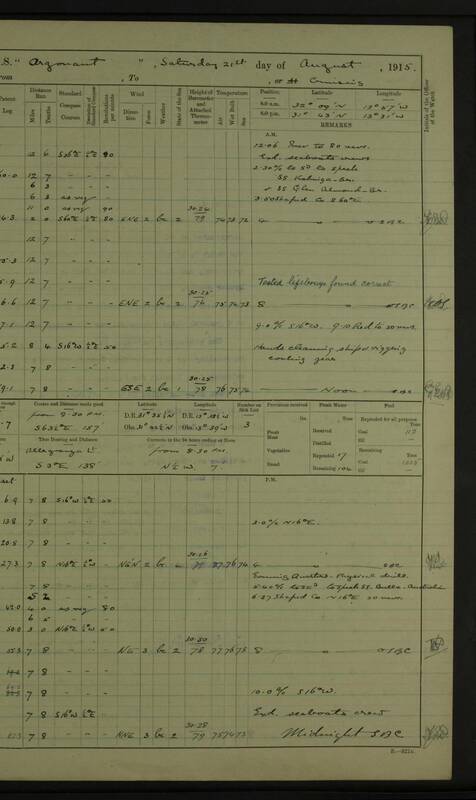 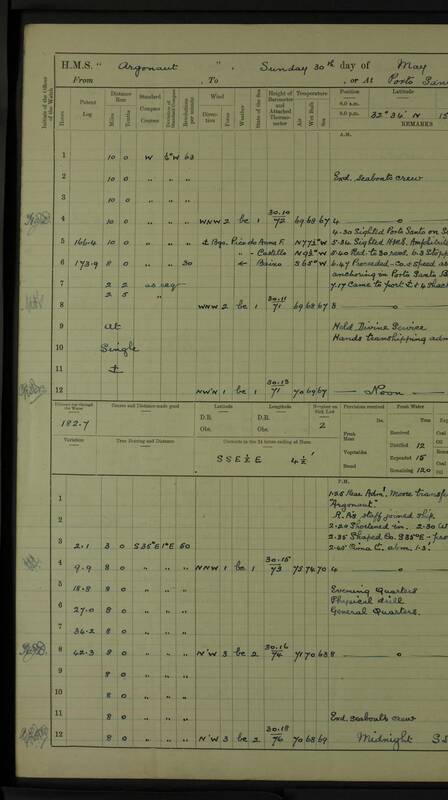 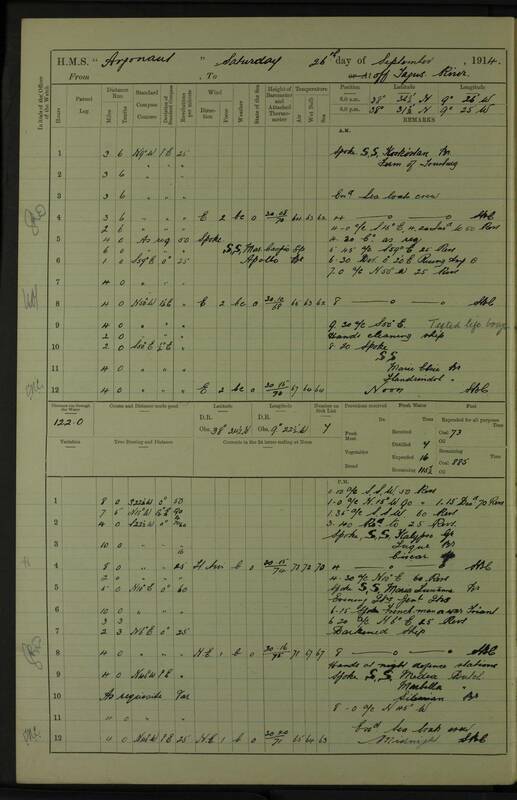 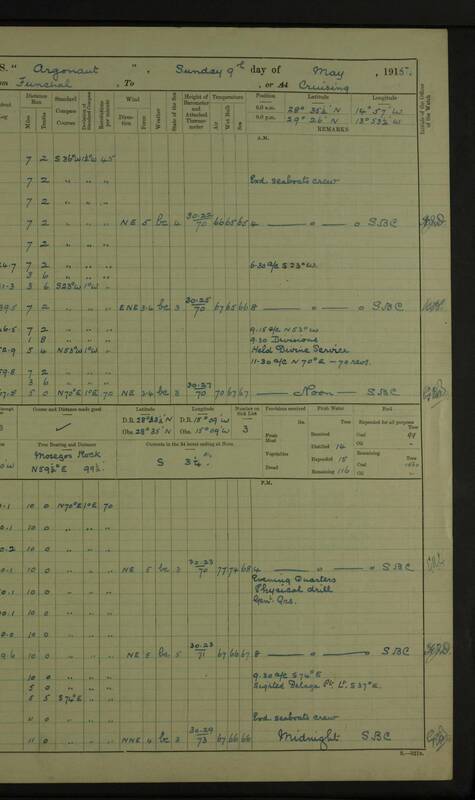 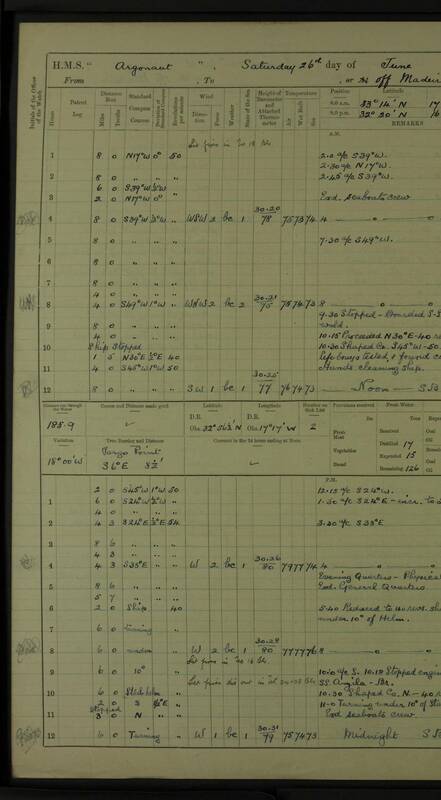 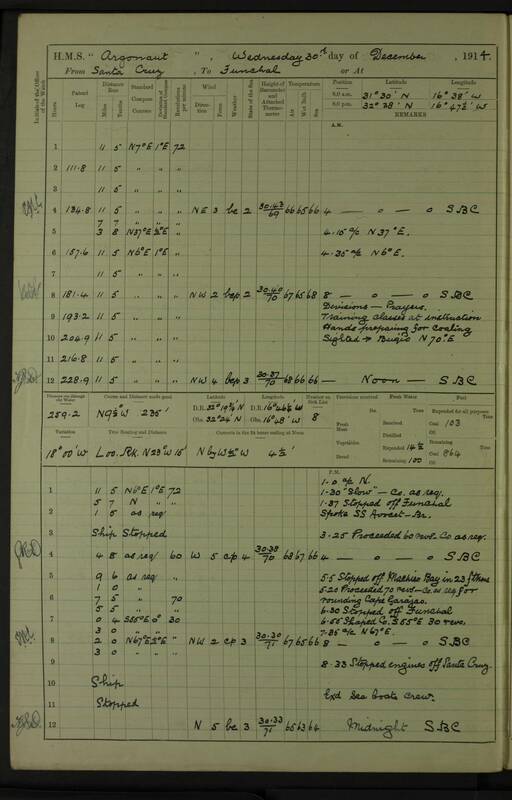 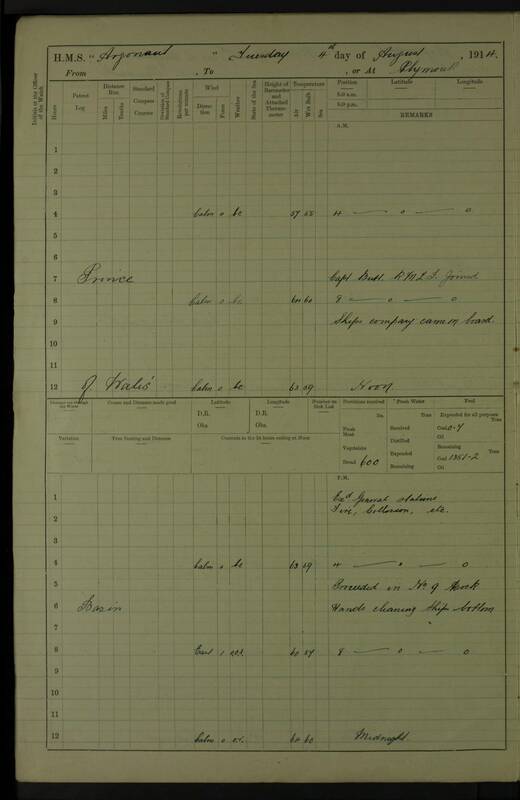 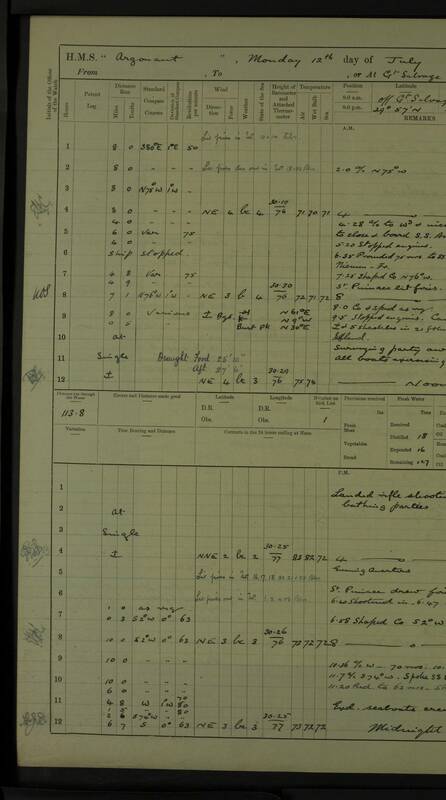 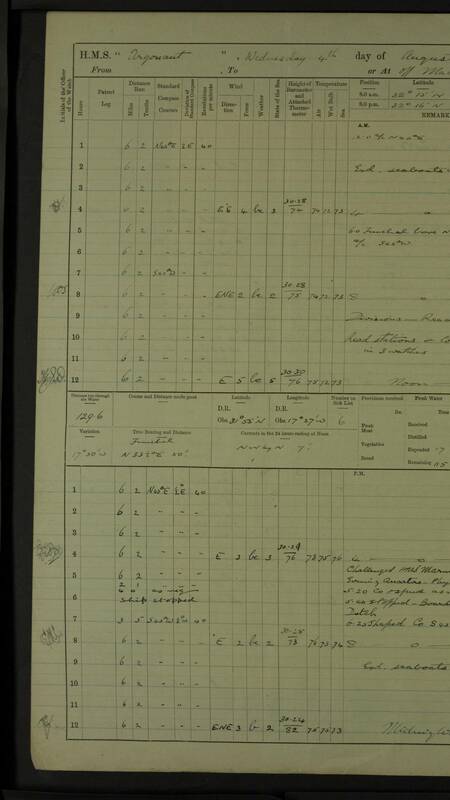 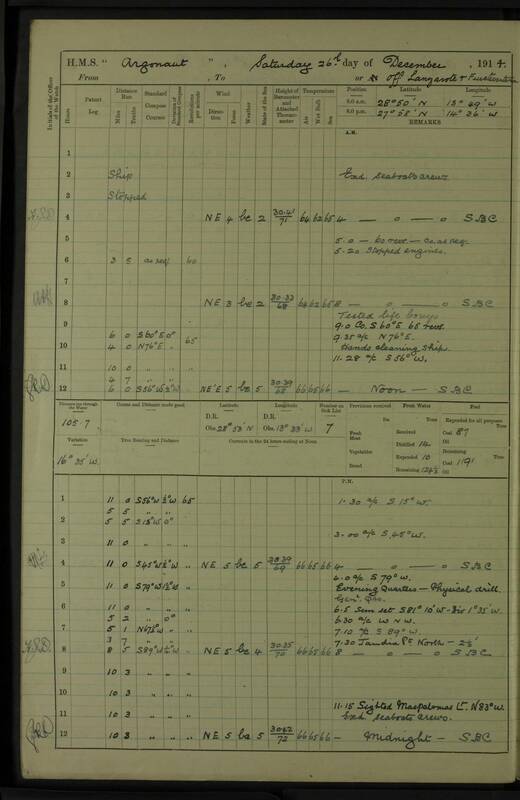 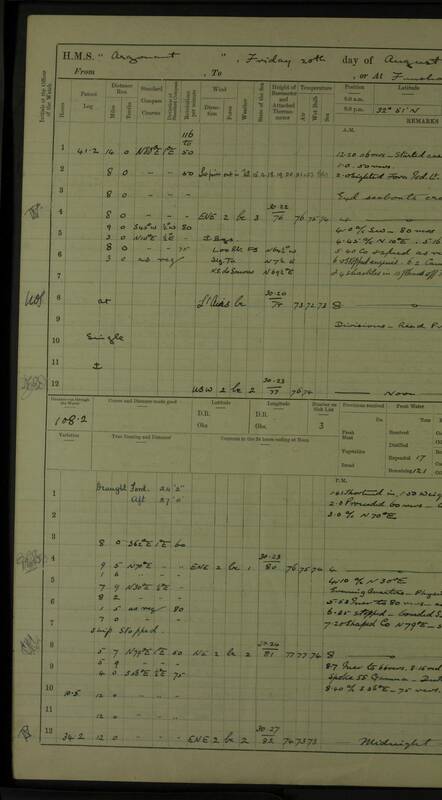 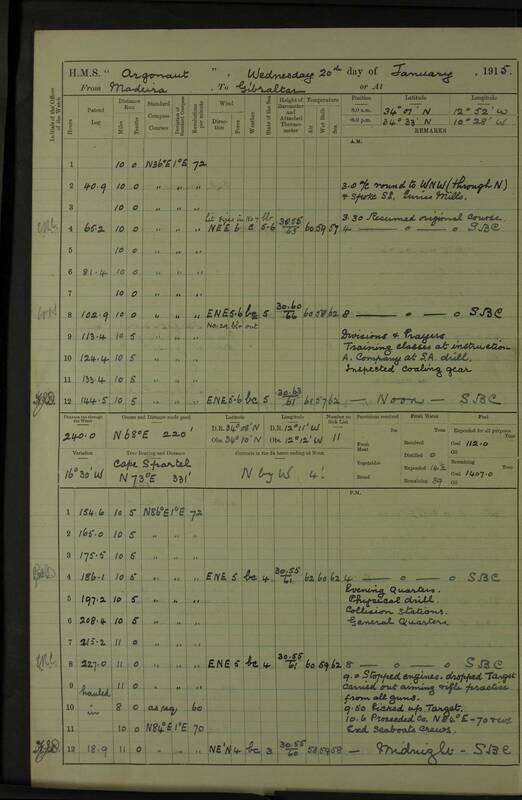 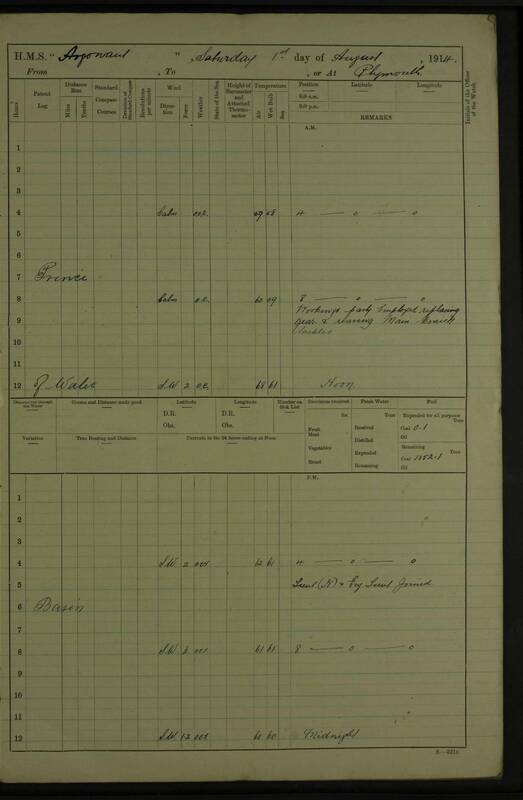 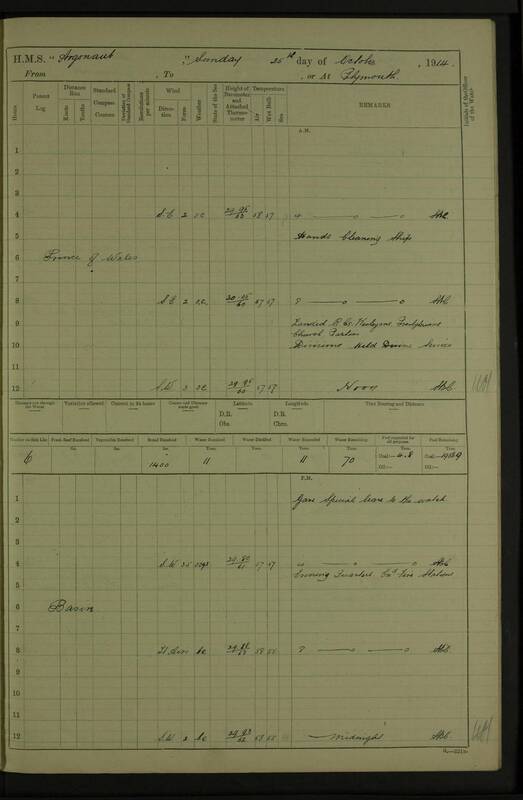 At 7.0 PM GMT today in latitude 31 30 N longitude 16 34 W, accompanied by Lieutenant George O Barnes RN, I board the Greek SS Mentor of Ithaca, 1914 tons register, Hanas master, from Rosario to Tyne Dock with wheat and maize. 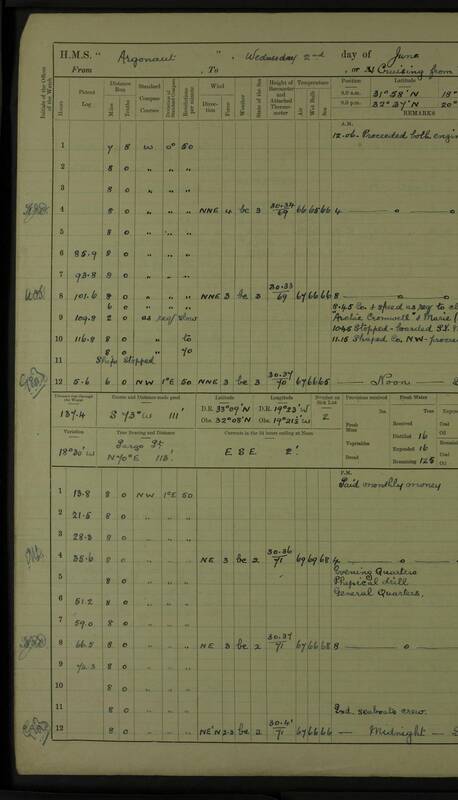 The crew consisted of 24 all told, all of whom were Greeks. 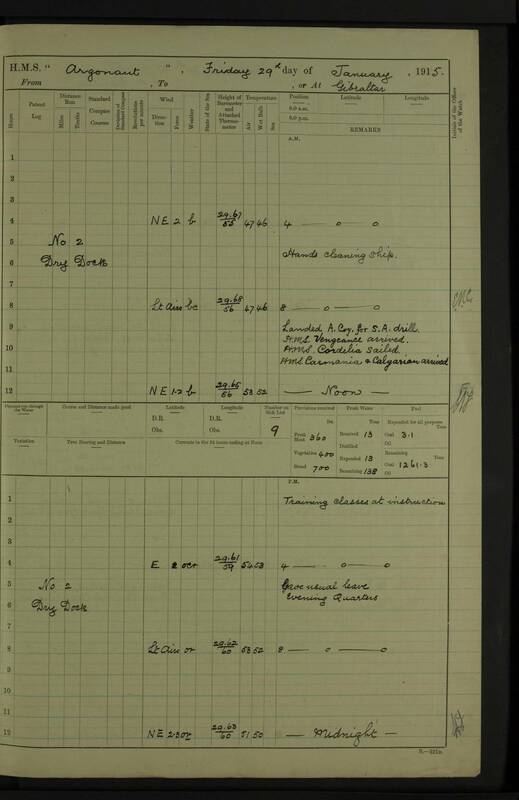 The cargo was shipped by Messrs H Ford & Co, Rosario; the consignee's name was not known as orders for Tyne Dock were received at St Vincent, Cape Verde, by cable. 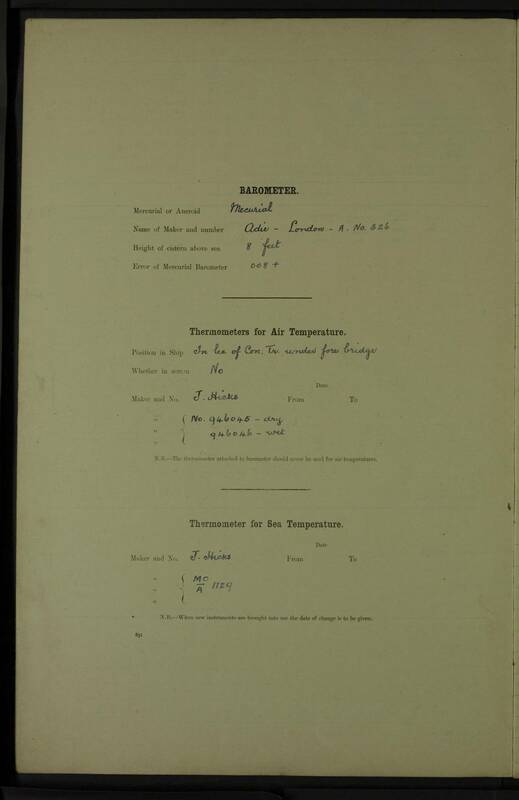 The owners of the Mentor are Messrs C & C Dracoulis of London. 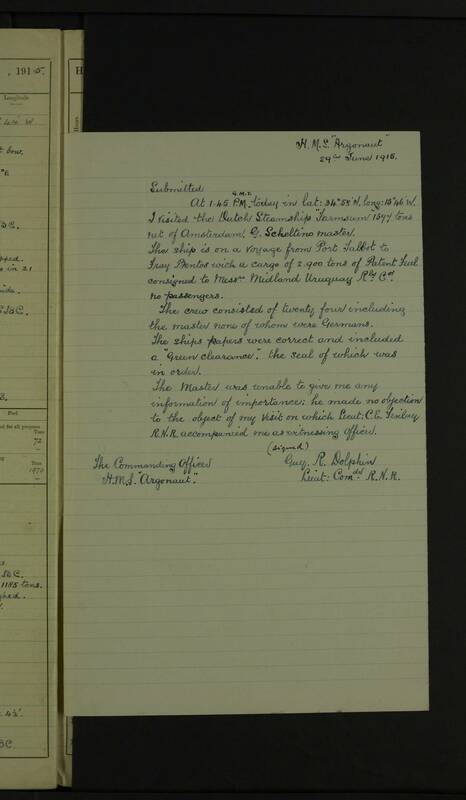 The master requested to be supplied with some preserved or fresh beef, as his St Vincent stock was bad; a 72 lb box of tinned beef was given to him. 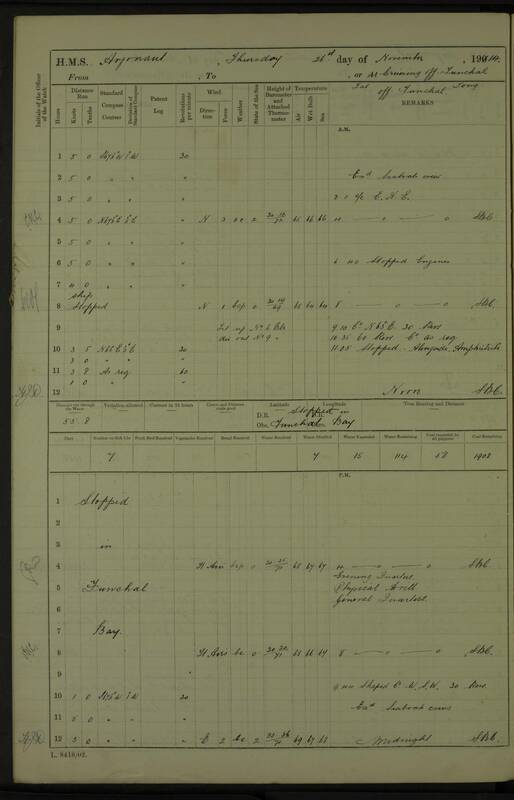 In latitude 33 10 N longitude 16 10 W at 1.0 pm GMT accompanied by Lieutenant GO Barnes RN I boarded the Greek SS Odysseus of Ithaca, 1831 tons register, master Shiotis, on a voyage from St Nicolas Rosario to Birkenhead with a cargo of maize in bulk and bags shipped by Messrs L Dreyfus & Co, freight 43/- per ton. 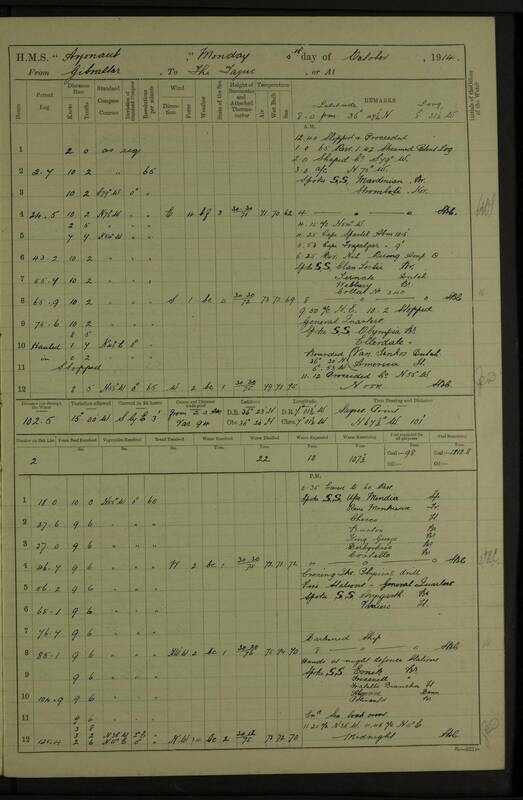 The Odysseus is owned by Messrs Dracoulis of London, and has a crew of 25 all told, 22 Greeks, 2 Russian and 1 Spaniard. 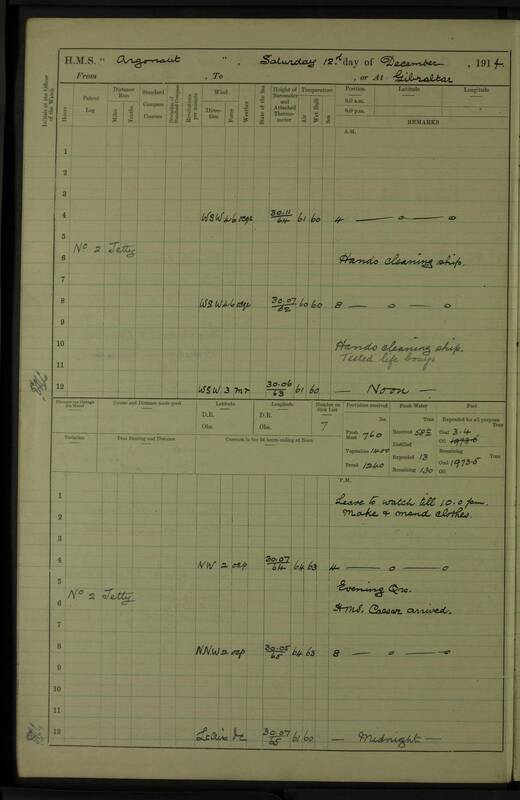 The master reported that he left Rosario 10th July, Monte Video 17th July, his ship was held on bar for 6 days, he called at St Vincent Cape Verde 6th August for orders. 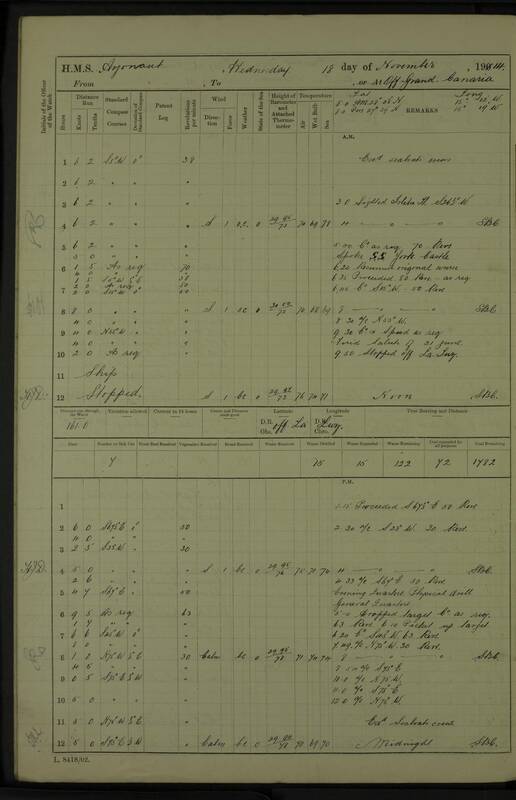 There were between 250 and 300 vessels in Rio de la Plata waiting to load and loading. 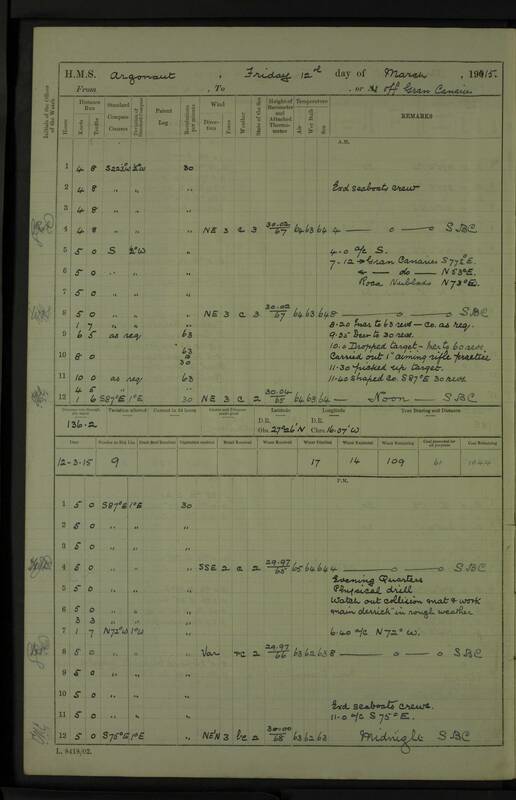 In latitude 32 16 N longitude 13 38 W at 6.30 PM GMT, accompanied by Lieutenant GO Barnes RN, I boarded the Dutch SS Bretsum of Amsterdam, 1305 tons register, owned by Messrs Vinker & Co of Amsterdam, master A Steffens, crew 22 all told, all Dutch, no passengers. 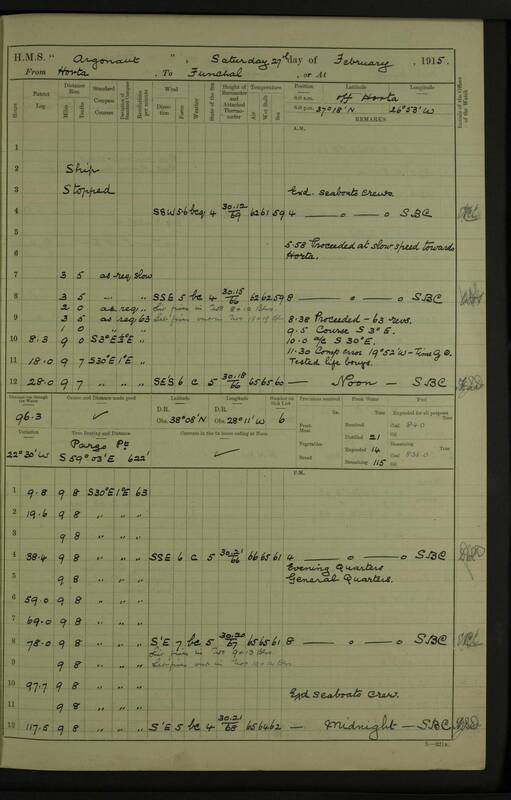 The vessel is on a voyage from Cardiff 11th August with a cargo of patent fuel shipped by the Crown Patent Fuel Co to Rio Grande do Sul, consigned to the Brazilian Government Railways. I examined the papers and found them all in order, including British Green Clearance. 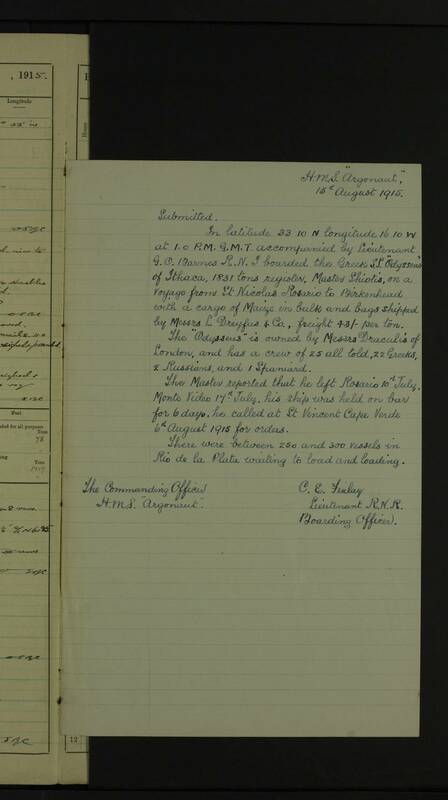 At 11.0 PM GMT today in latitude 32 40 N longitude 14 30 W, accompanied by Sub Lieutenant Philip L Vian, I boarded the Dutch SS Flores, 2813 tons register, of Amsterdam, owned by the Amsterdam Lloyd Company but under charter to the Stoomvaart Maatschappij Nederland, master S Slapel, crew 40, all Dutch. 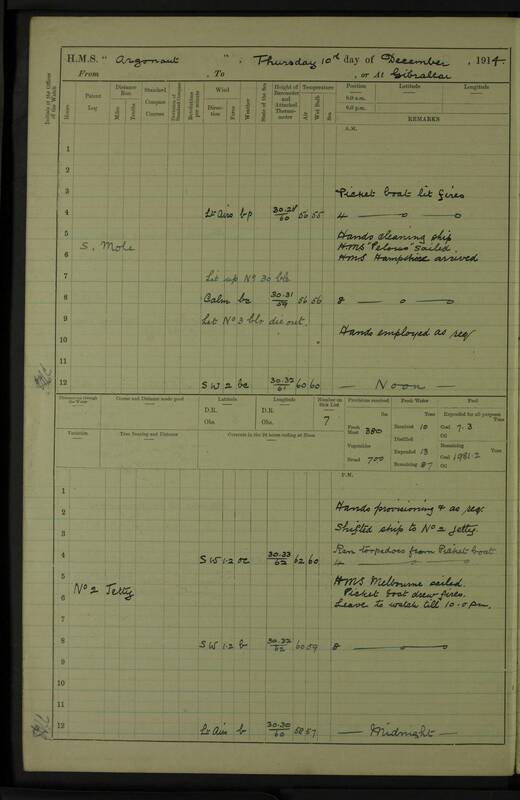 The Flores is 24 days out from Buenos Aires with a cargo of maize, shipped by EA Bunge and J Born to the order of the Nederland Oversea Trust Company, bound to Vigo for orders. 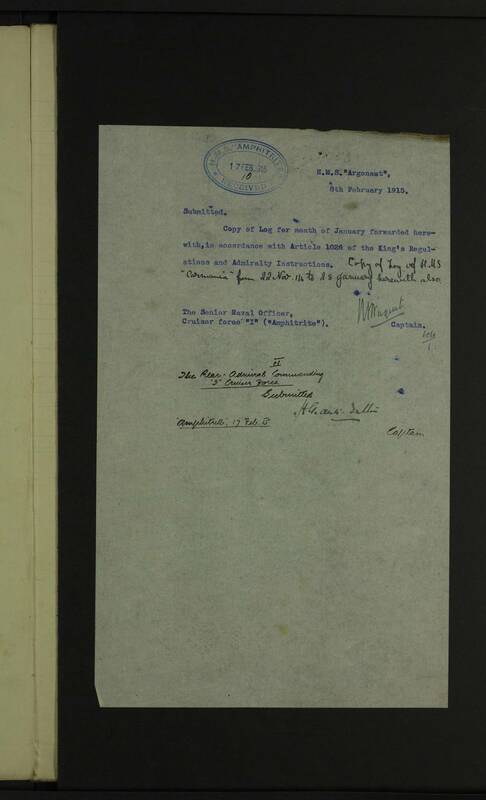 I examined all the papers and found them in order, the manifests being signed by British, French, Dutch and German Consuls at Buenos Aires. 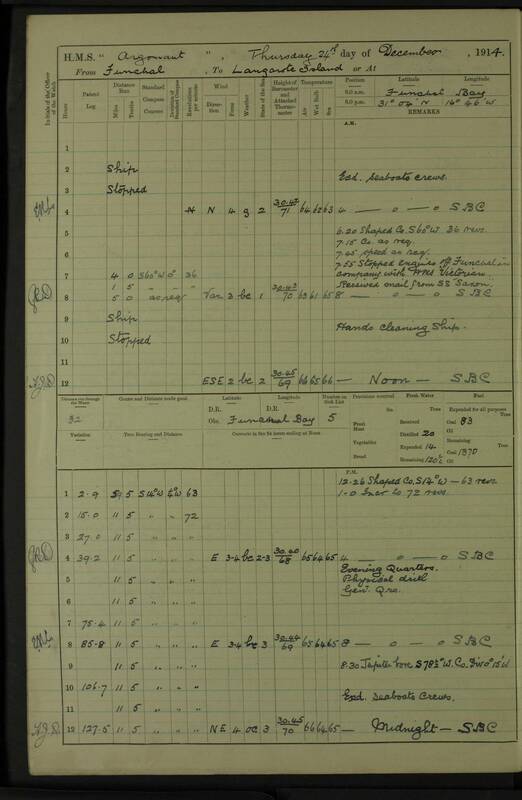 At 6.30 PM GMT, Fora Island bearing S 60 W 10, accompanied by Sub Lieutenant Philip L Vian RN, I boarded the Dutch SS Orange Nassau, 2345 tons register, of Amsterdam, and owned by the Dutch West India Mail Line, J Myboer master. 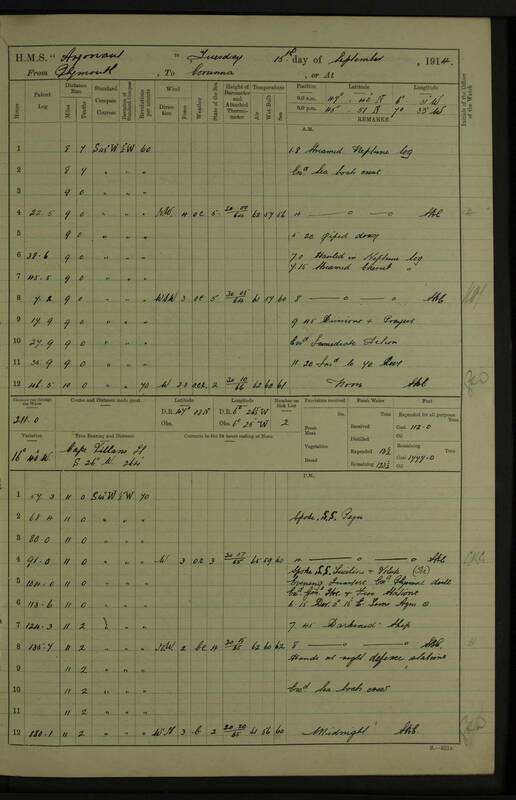 The vessel is on a voyage from New York to Dutch West Indian Islands, last ports Surinam and Madeira, with general cargo and passengers for Lisbon and Amsterdam. 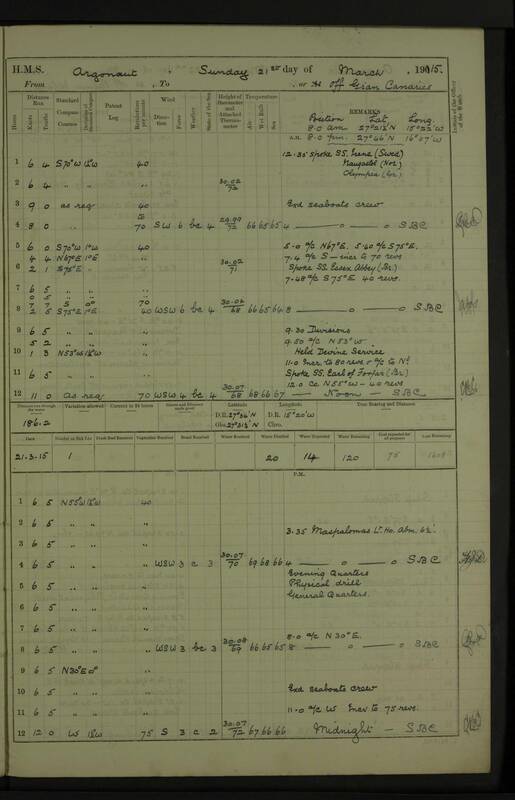 The passengers numbering 32 consisted of 30 of Dutch nationality for Amsterdam from West Indies, and 2 Portuguese soldiers from Madeira for Lisbon. 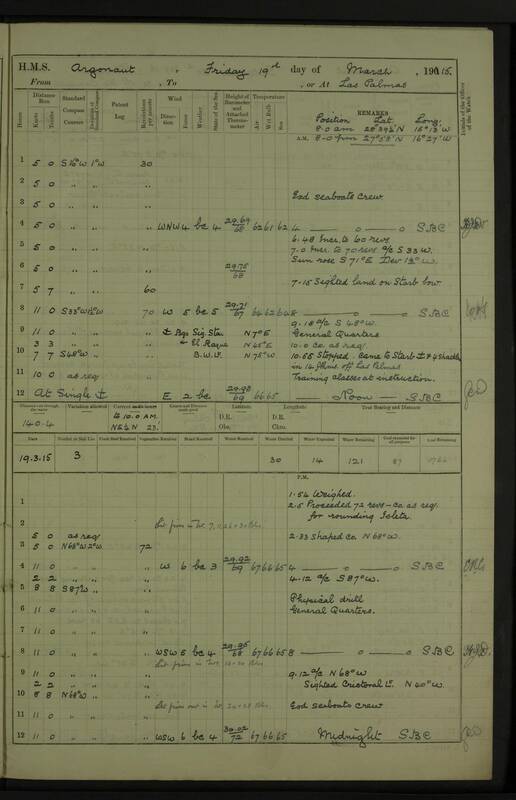 The crew numbering 53 were all Dutch; the saloon crew with the exception of Chief Steward, Chief Cook and Baker were Dutch West Indian Natives, also the stokehold crew. 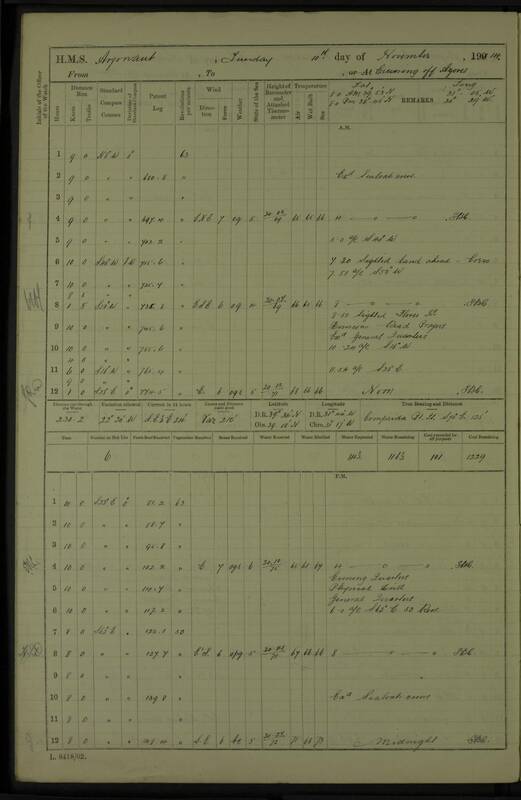 I mustered the crew and found them to agree with the Articles and Crew List. 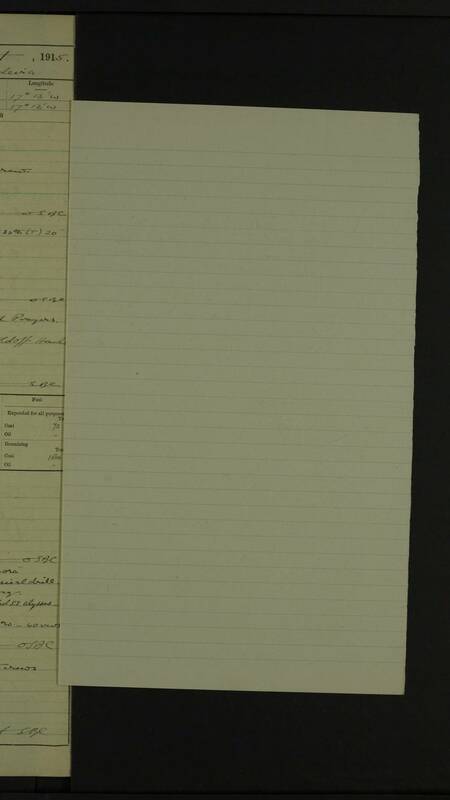 The Steward, Cook and Baker produced their Dutch military papers. 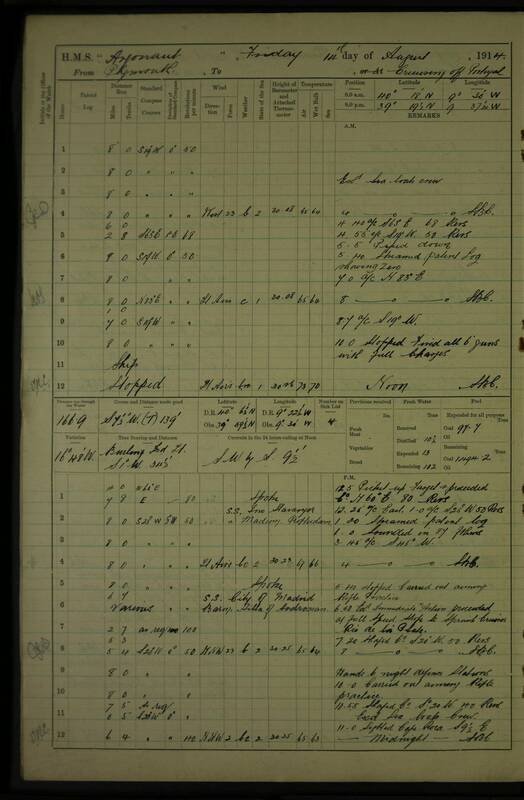 I examined all the ship's papers and found them all in order. 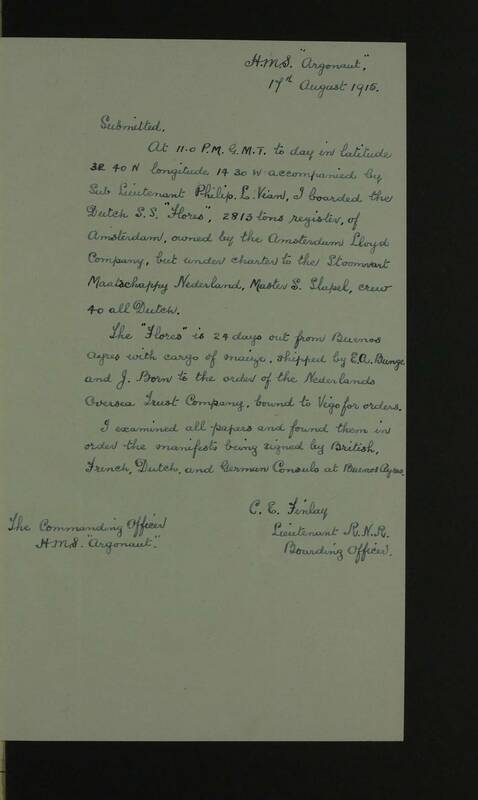 The manifests signed by the British and Dutch Consuls at all ports showed the cargo to consist of coffee, sugar, rum, mahogany and general West Indian produce, all consigned to the Netherlands Oversea Trust Company with the exception of a small shipment of bananas from Madeira for Lisbon.